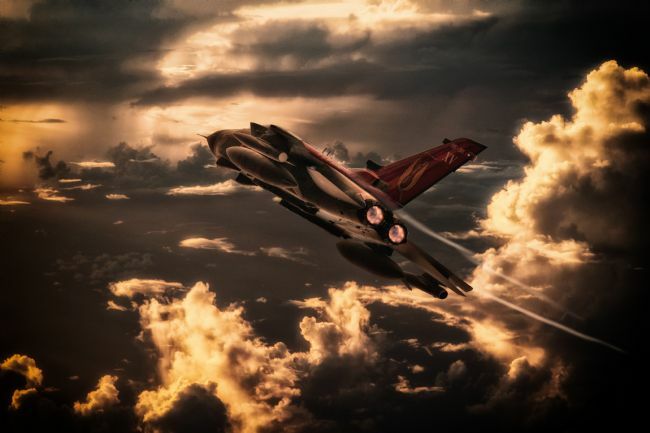 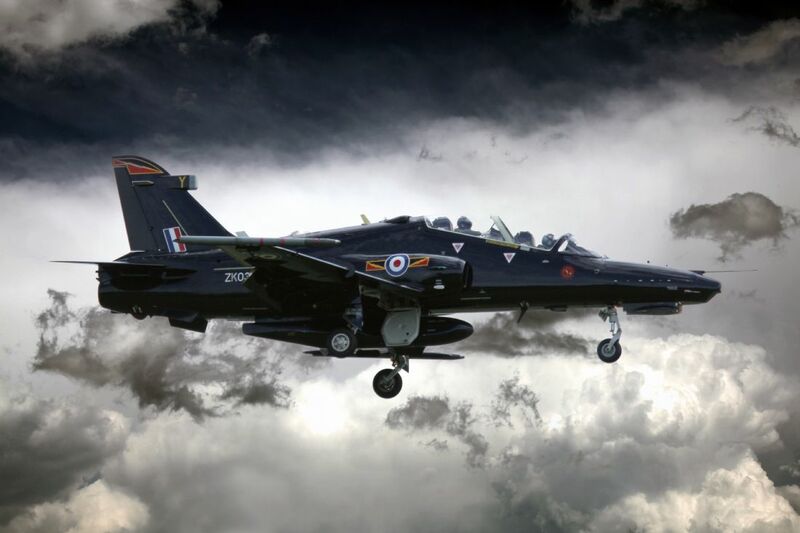 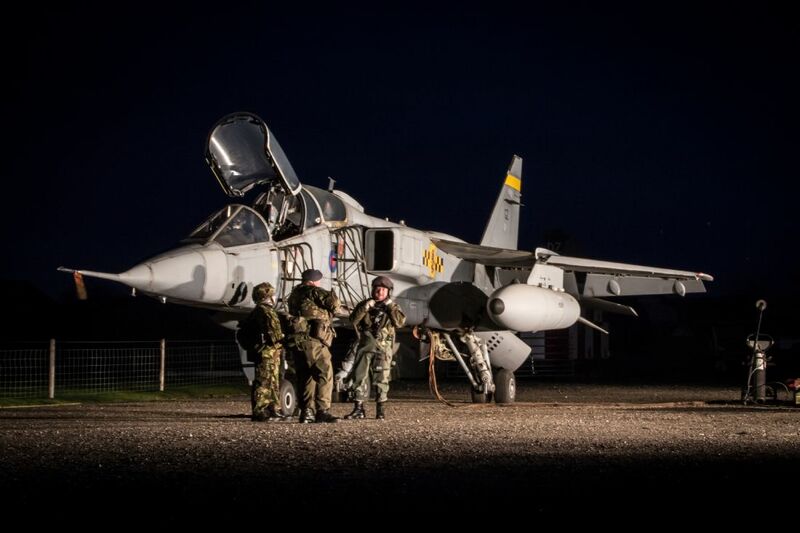 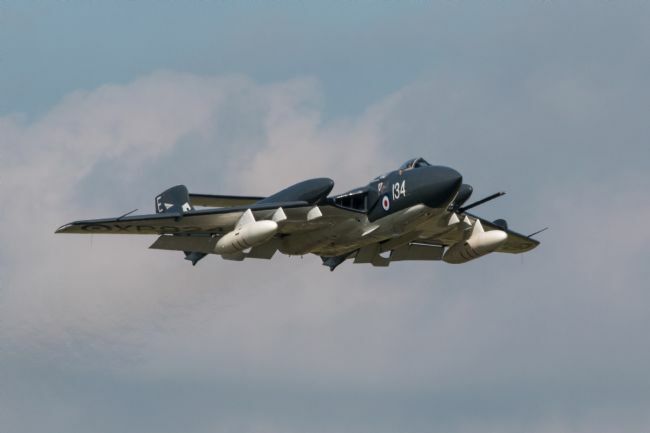 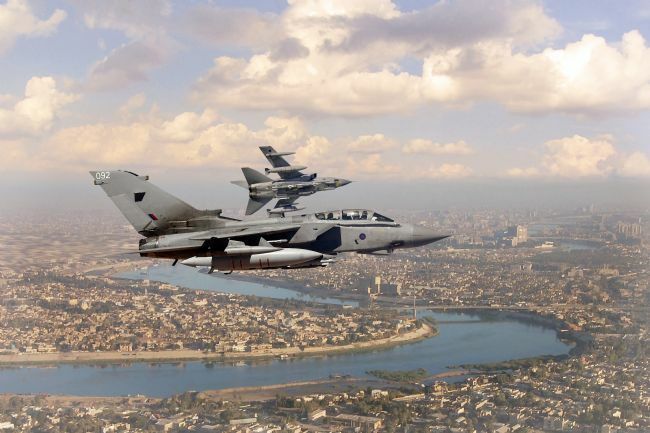 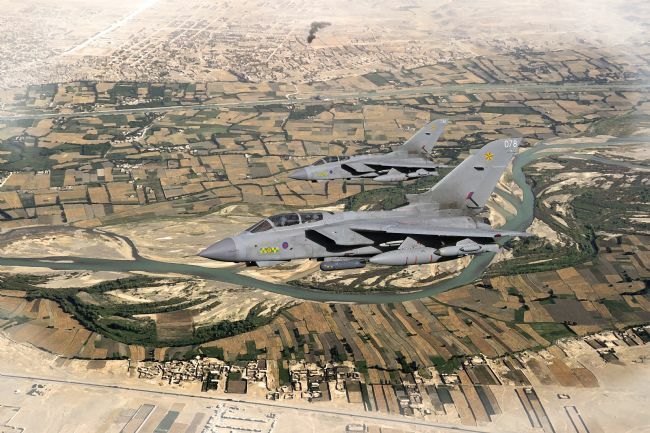 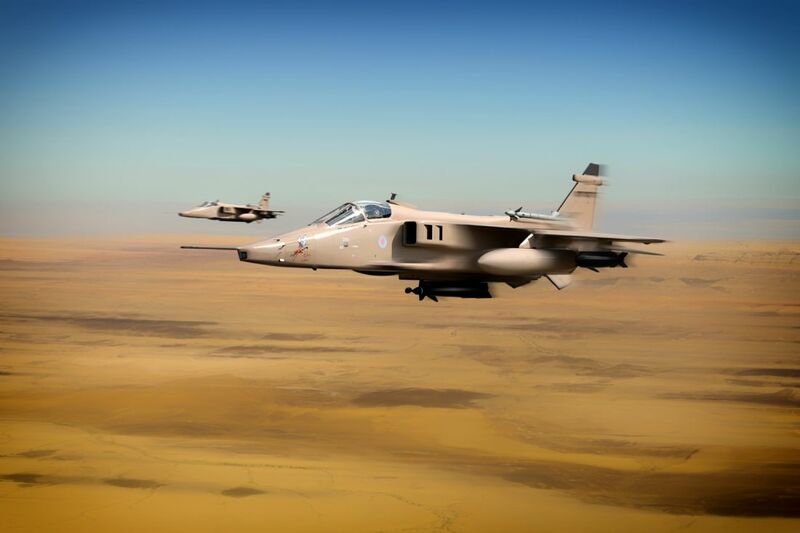 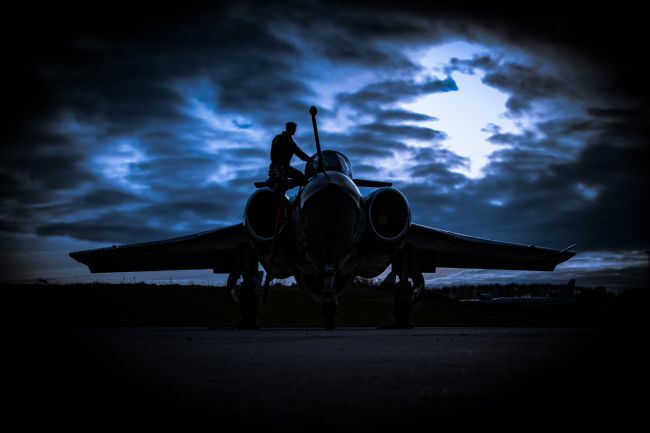 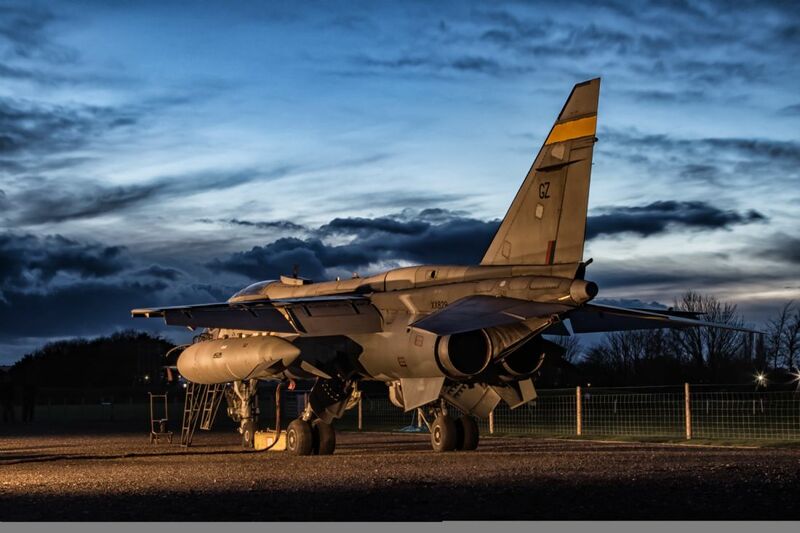 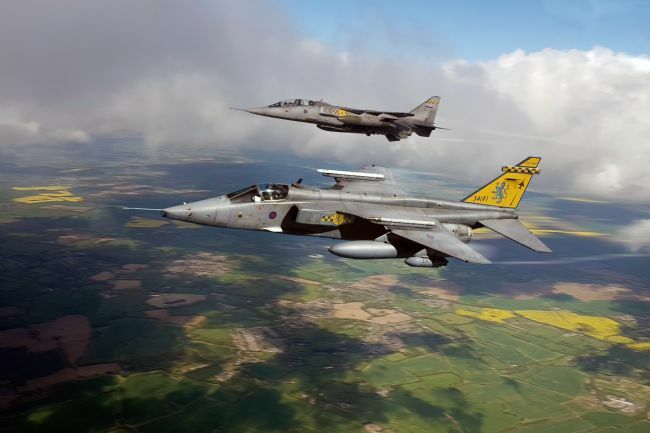 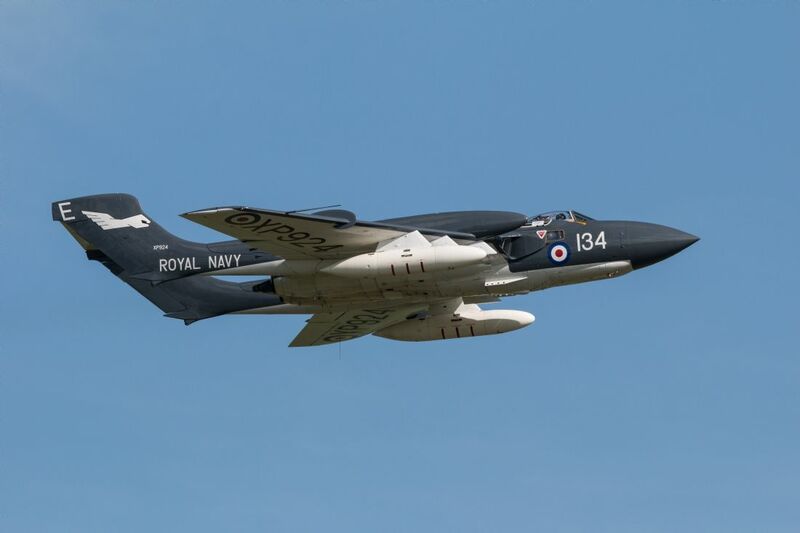 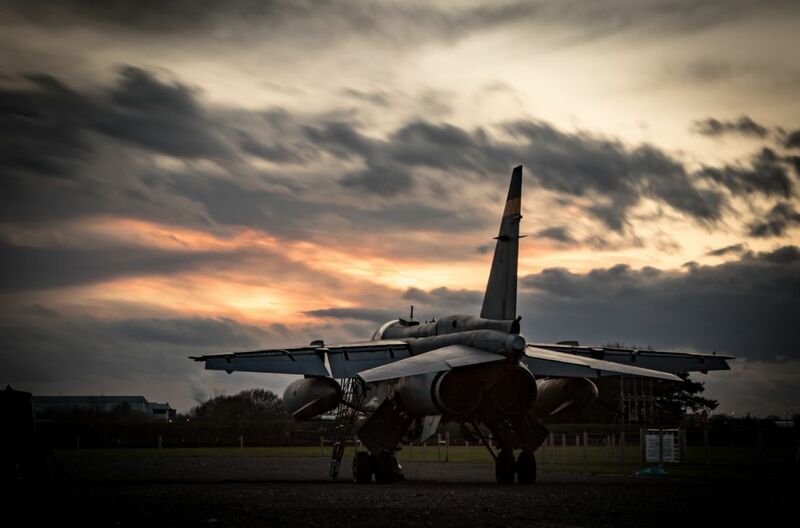 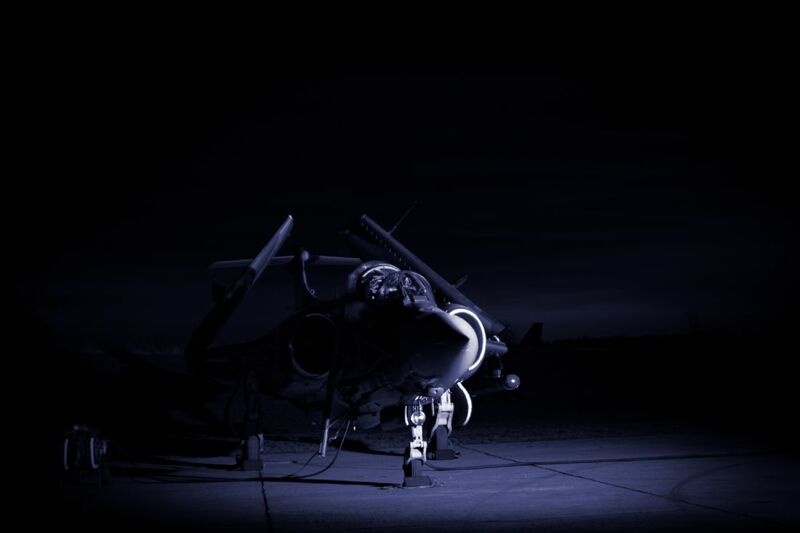 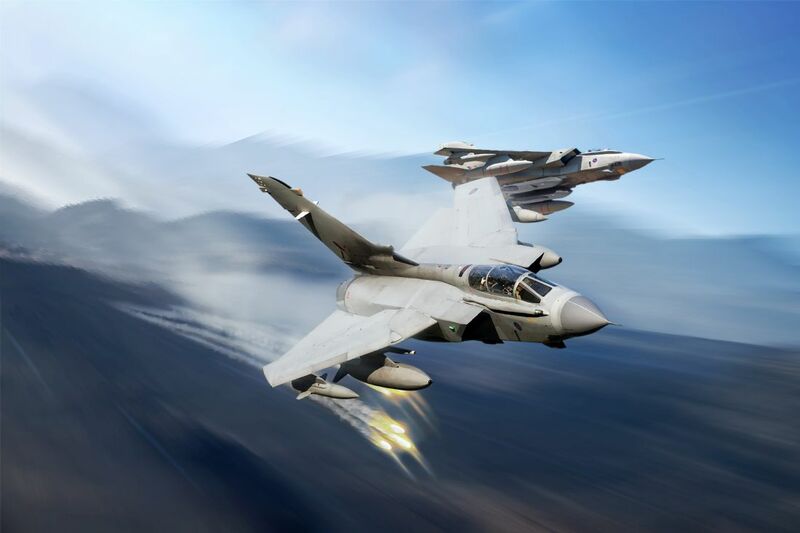 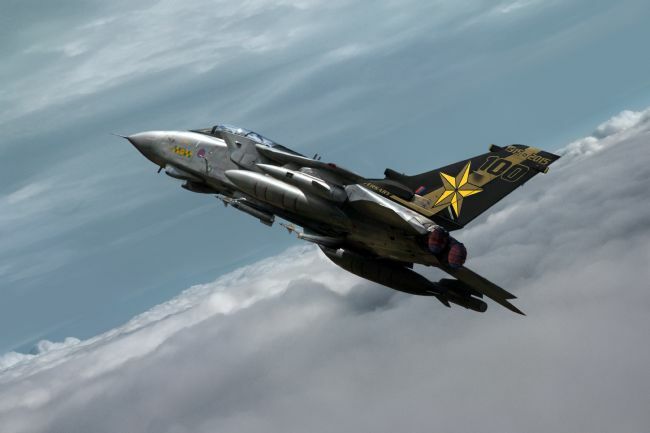 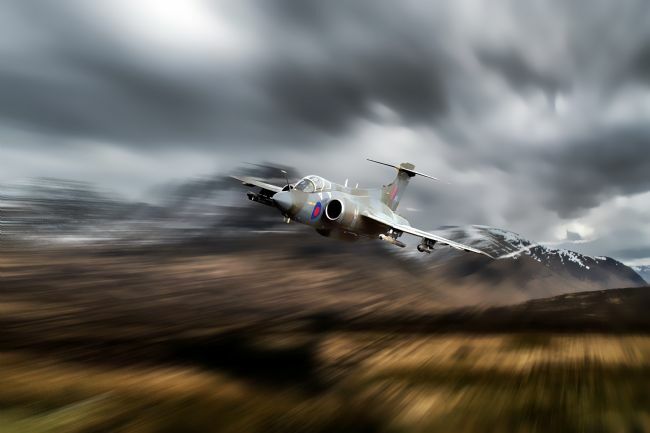 In 1974 54 Squadron took delivery of the SEPCAT Jaguar in the ground attack role, which it performed for the next 36 years until 2005. 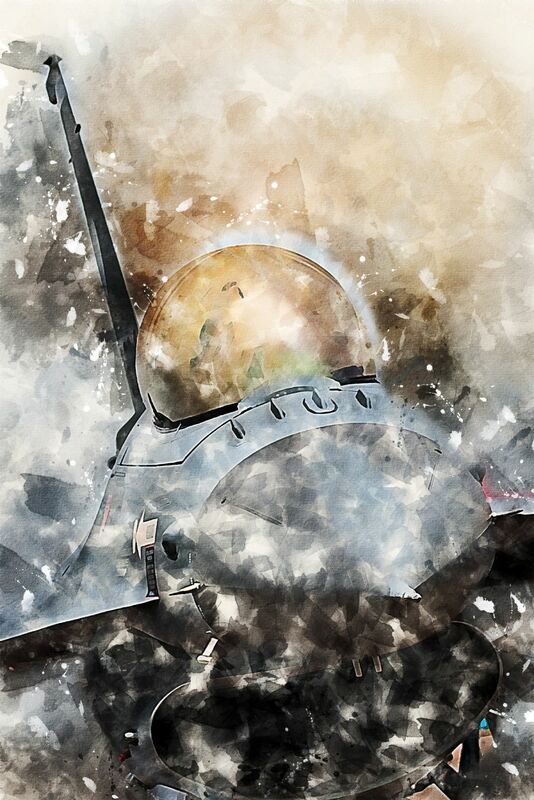 Digital paining. 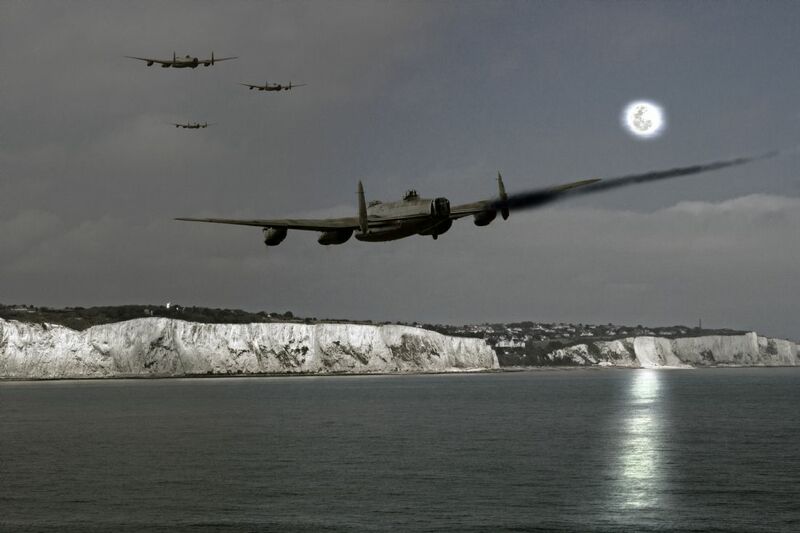 Background modified from a Public Domain image. 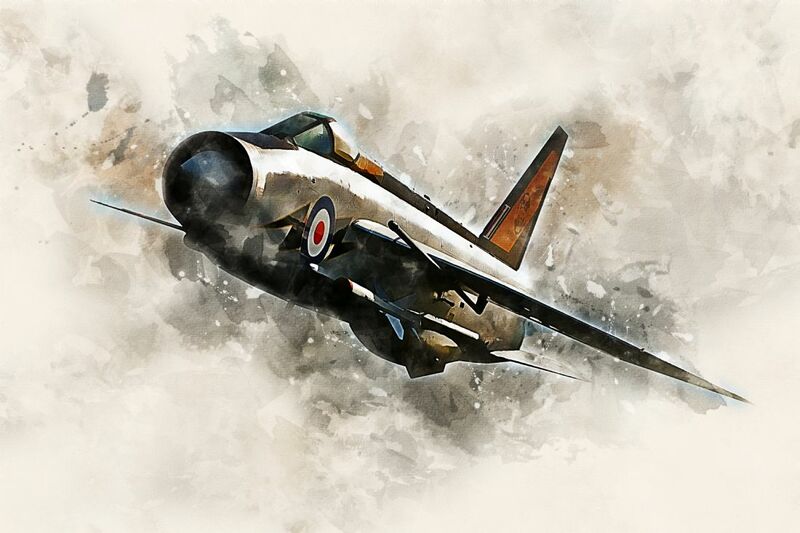 Takes from Wikimedia. 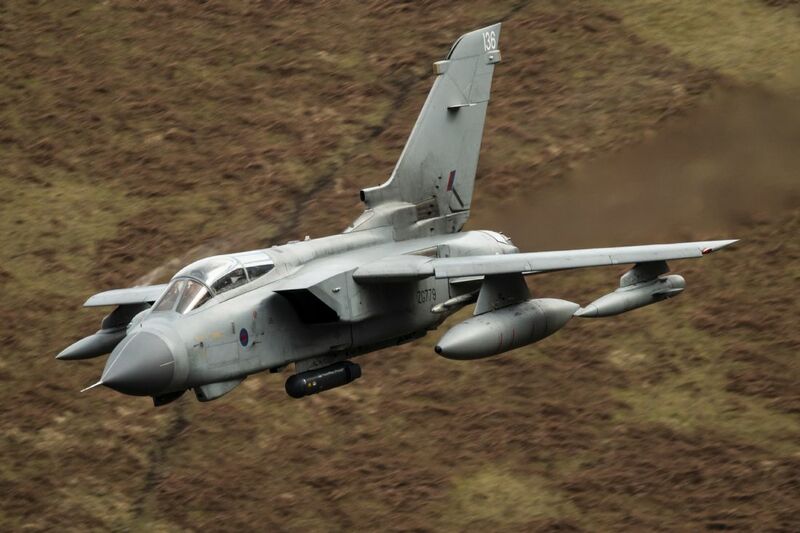 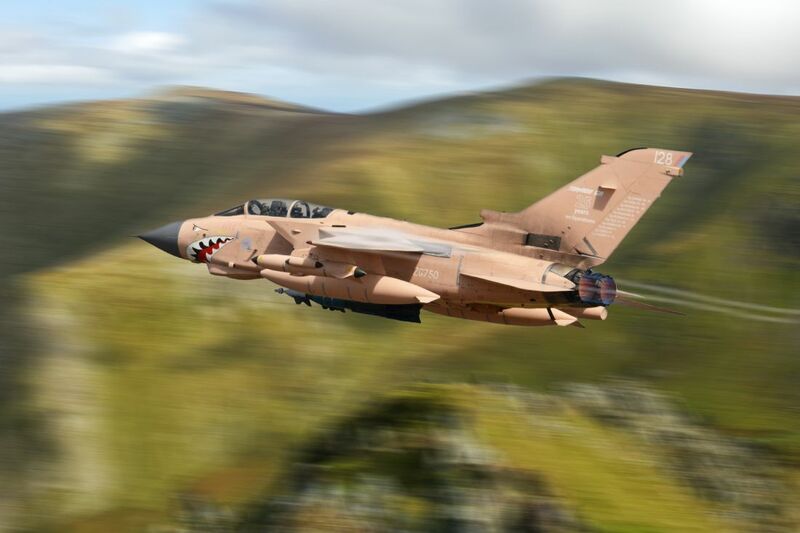 Royal Air Force Panavia Tornado ZG750 dubbed ‘Pinky’ thunders through the hills low level. After 40 years of Service the legendary Panavia Tornado GR4 is set to retire form active service with the RAF. 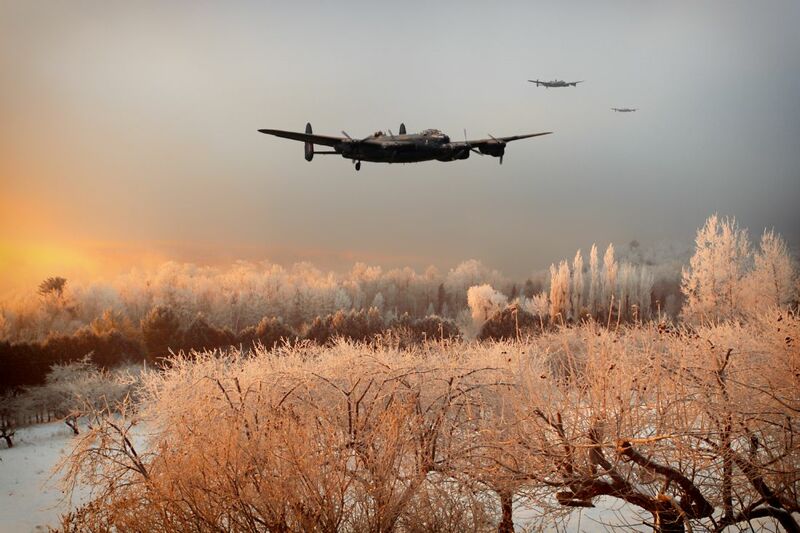 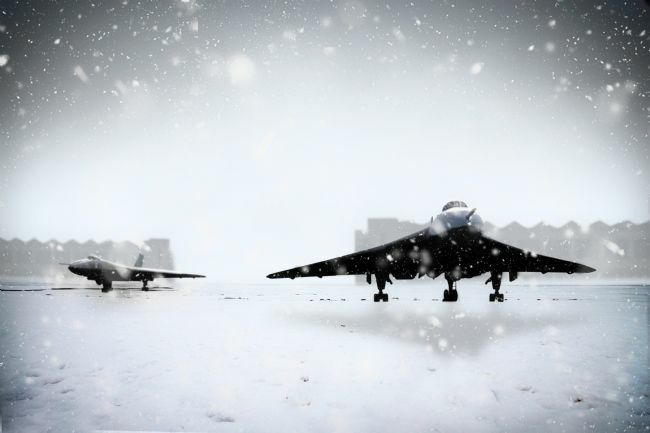 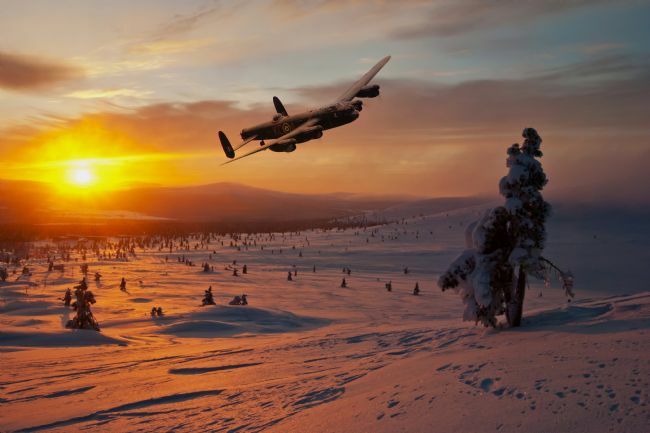 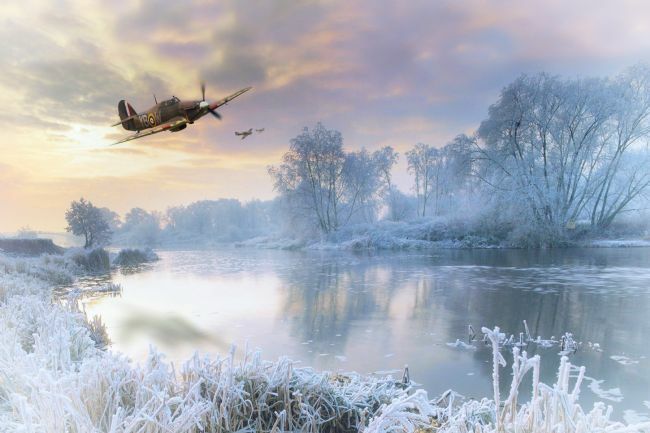 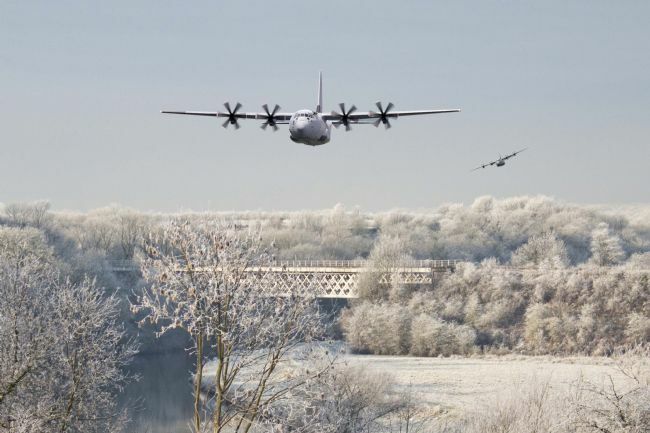 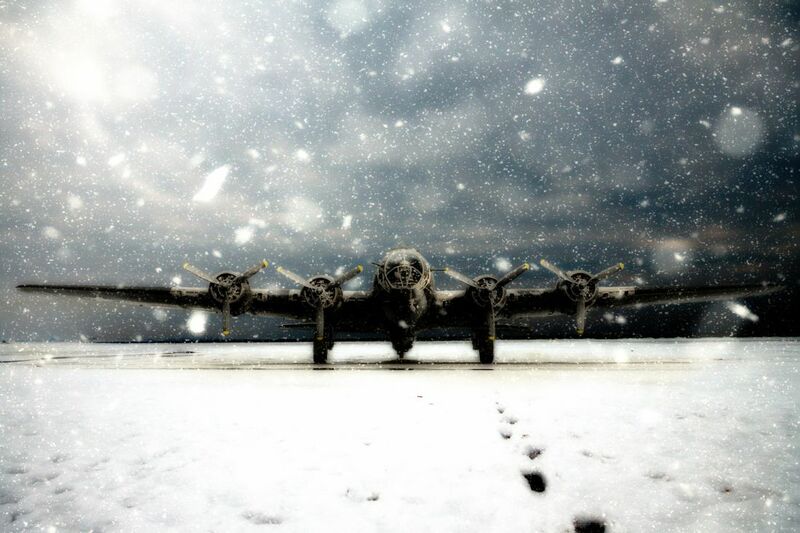 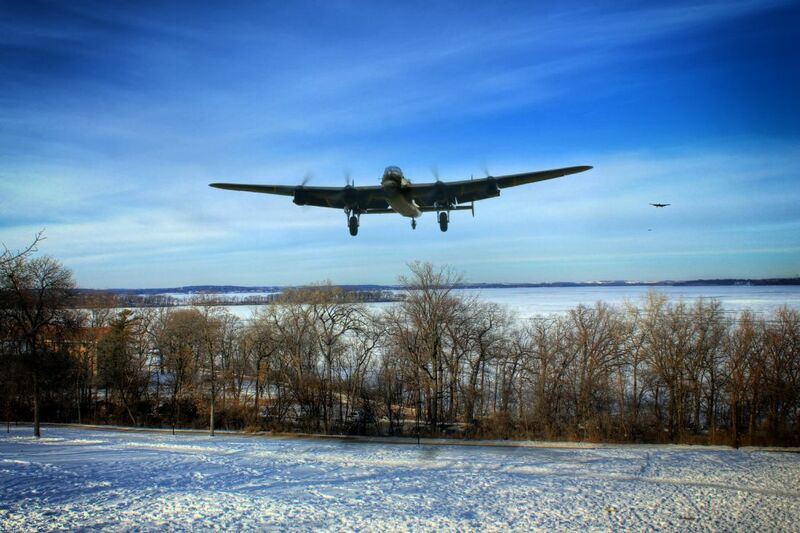 Avro Lancaster Bombers return home in the winters morning light to their snow covered airfield. Reginald Joseph Mitchell credited with the creation of the Supermarine Spitfire which first flew in 1936. The RAF ordered 310 production Spitfires. 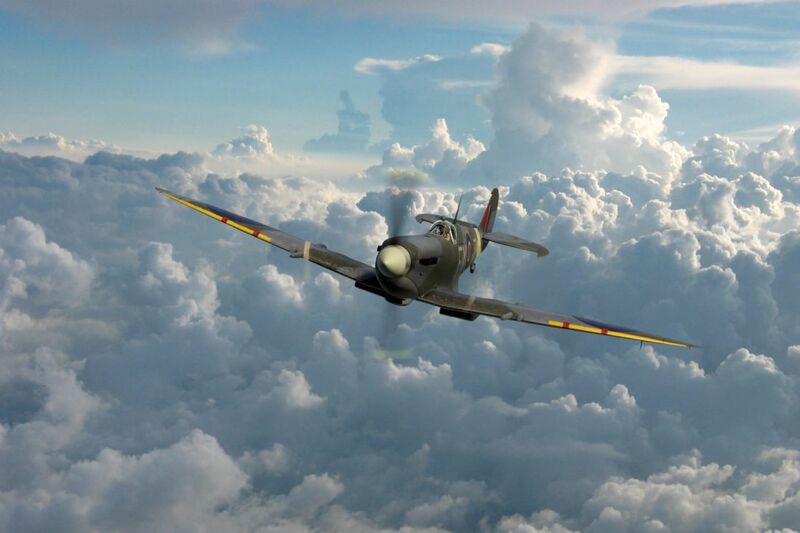 Mitchell is reported to have said that Spitfire was just the sort of bloody silly name they would choose. 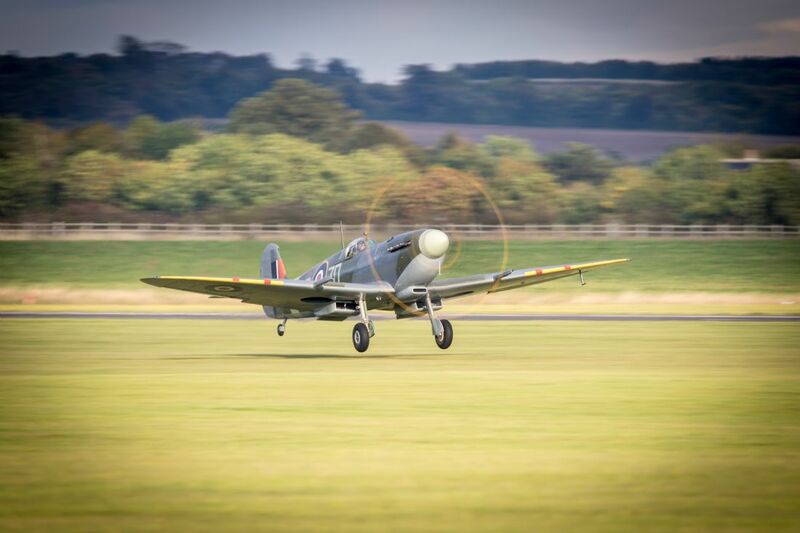 The Duxford Spitfire. N3200. 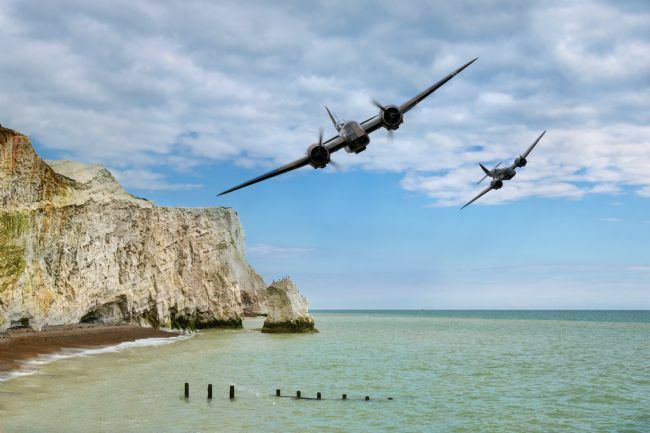 On 26th May 1940 during Operation Dynamo Spitfire N3200 crash-landed on a beach at Sangatte, near Calais it was lost until 1986 when it was revealed by the tide and the Spitfire was recovered from the French sands. 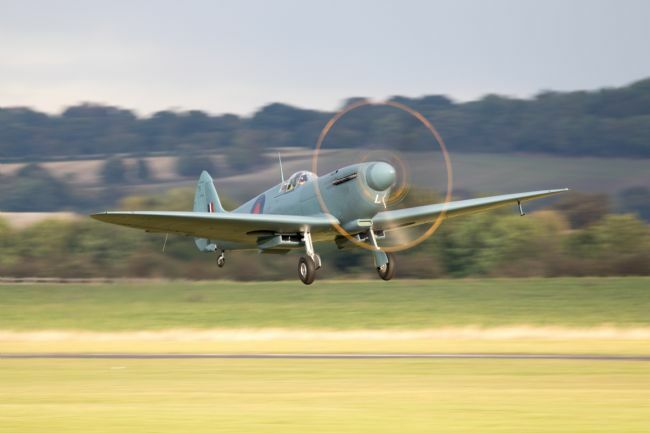 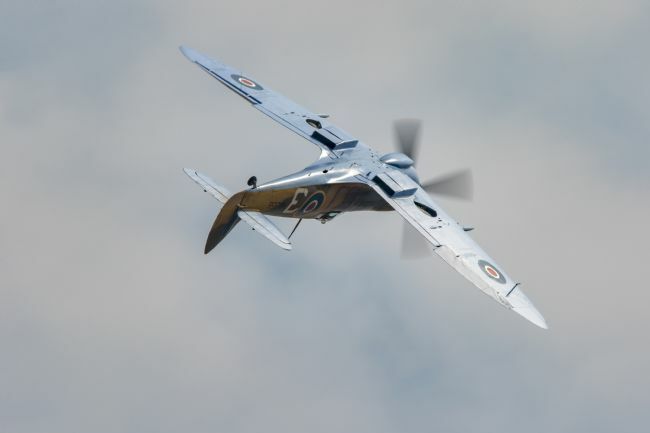 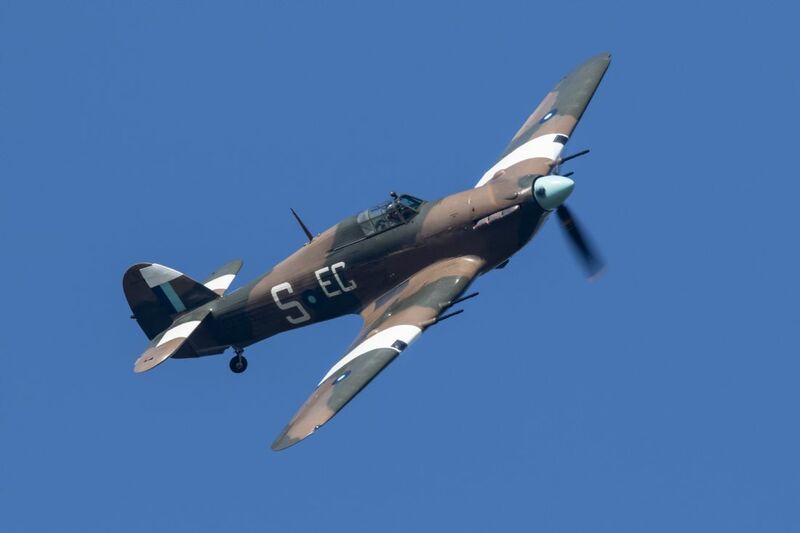 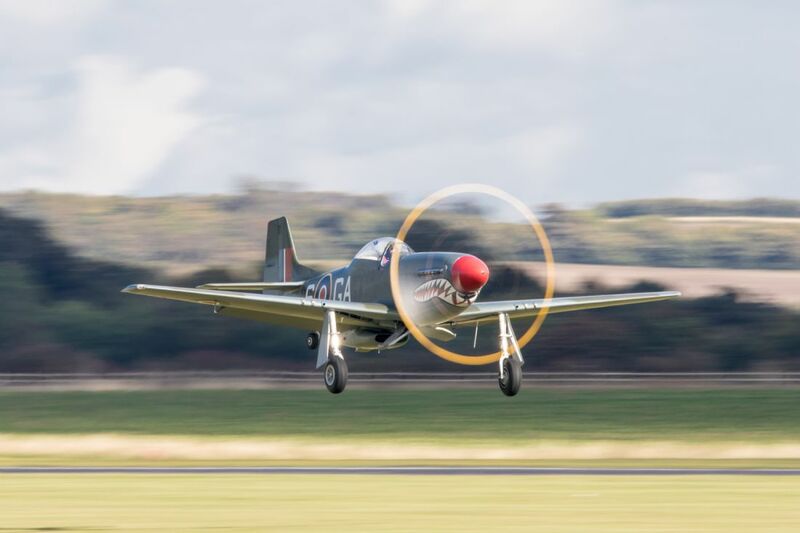 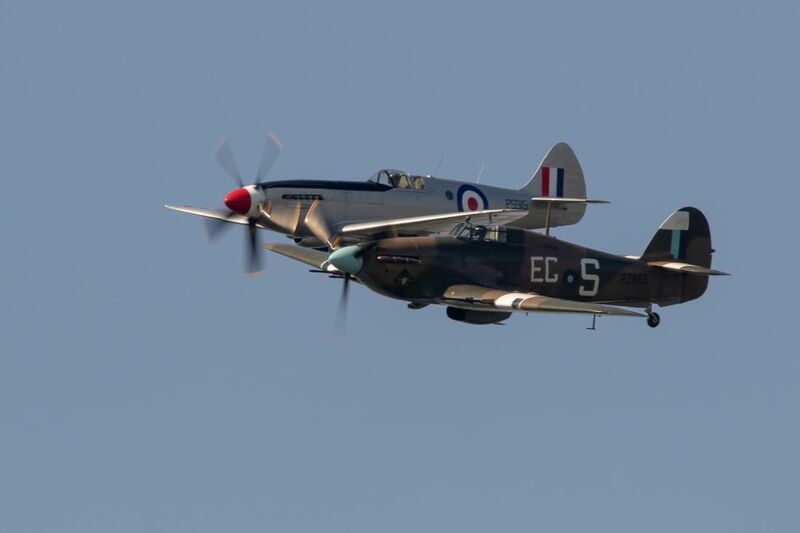 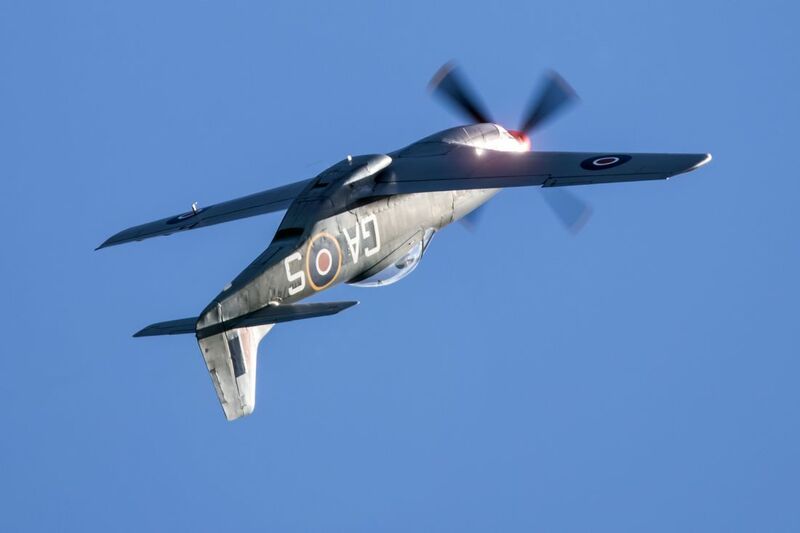 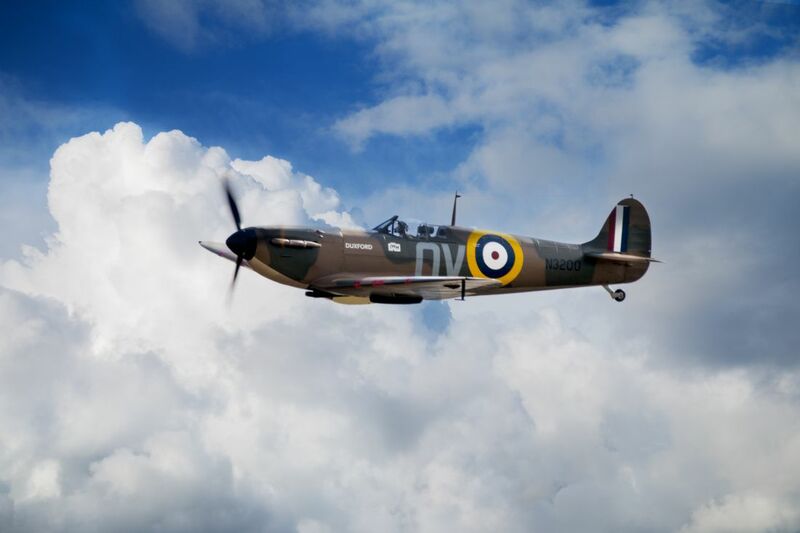 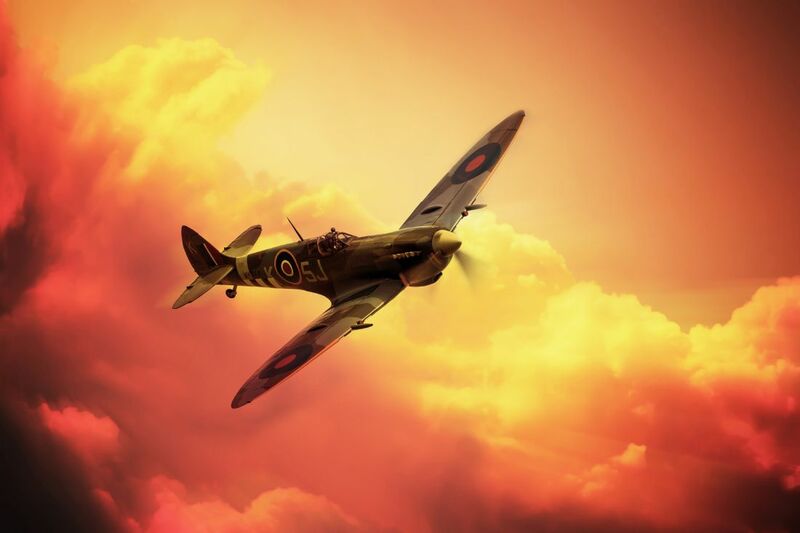 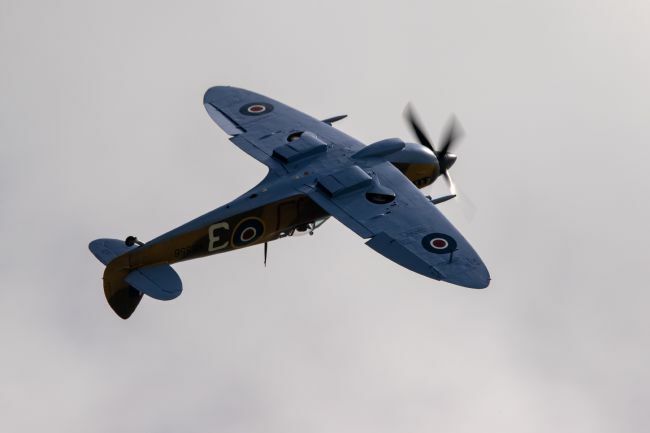 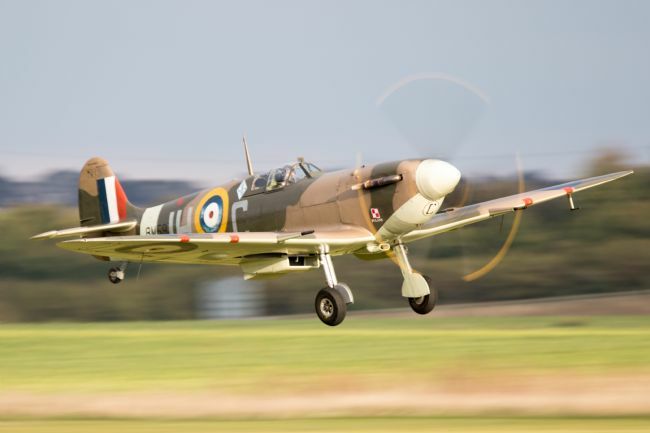 The Spitfire was restored to flying condition and returned to the air in 2014. 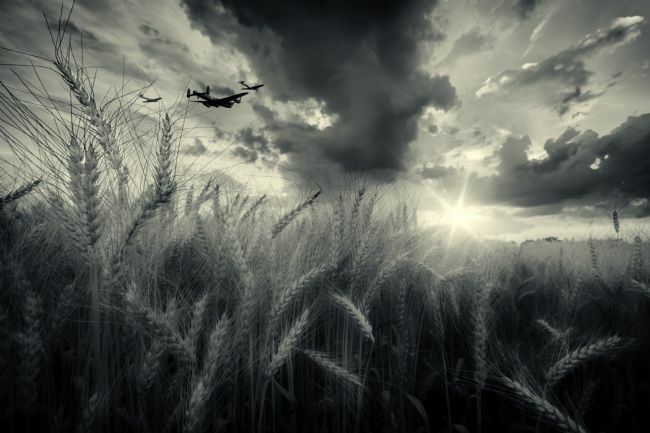 Airspeed Horsa gliders land in the fields of Normandy after being towed and released by Halifax Bombers. Digital painting. 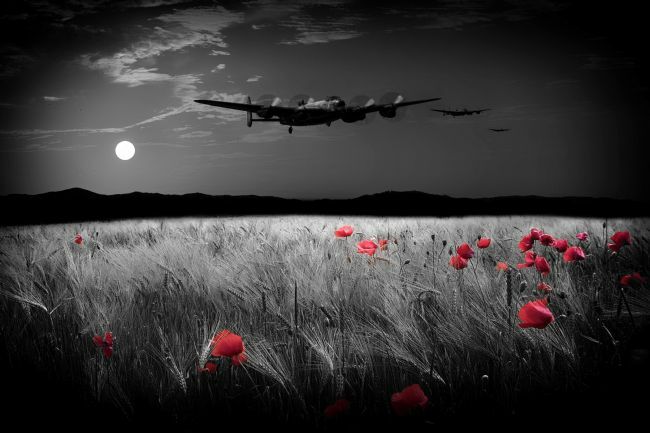 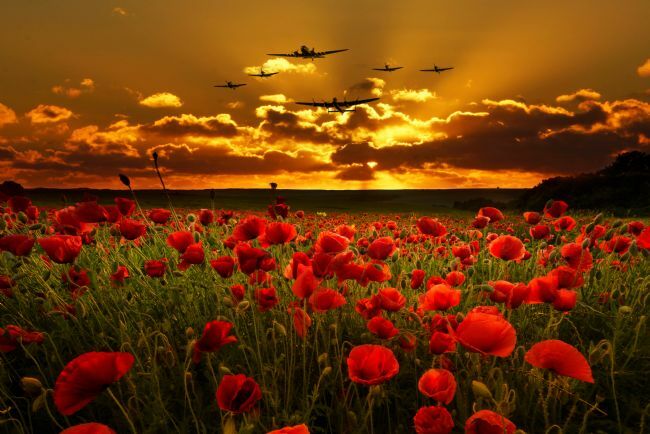 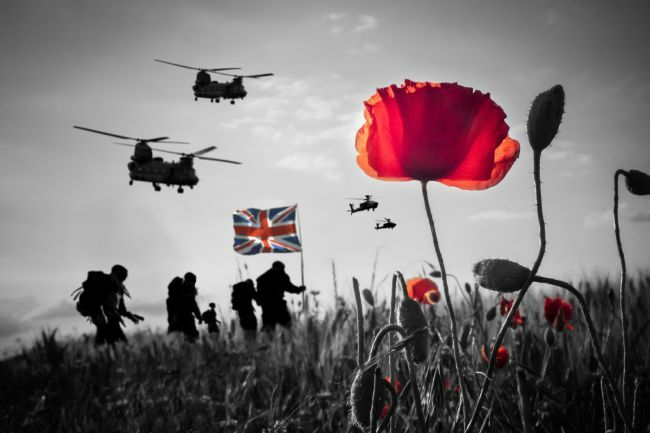 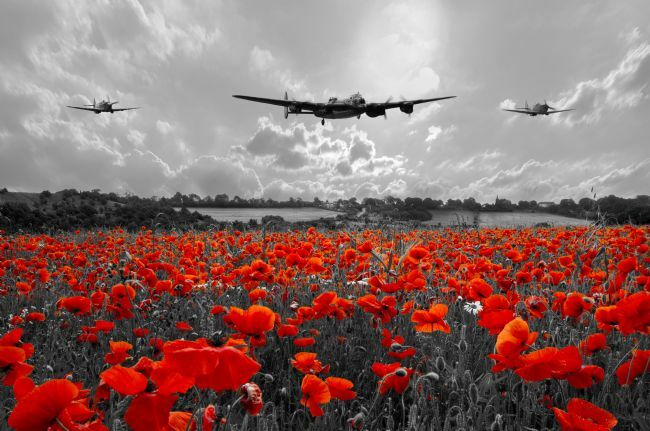 All artist profits from the sale of this image will be donated to the Royal British Legion 2018 Poppy Appeal. A British Airways Concorde arriving in to a rainy Heathrow Airport. 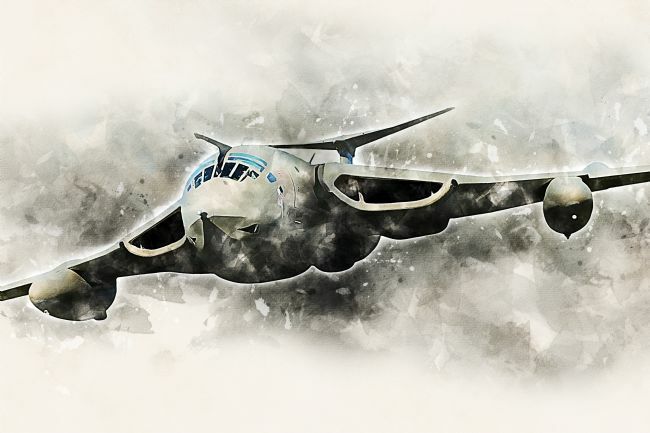 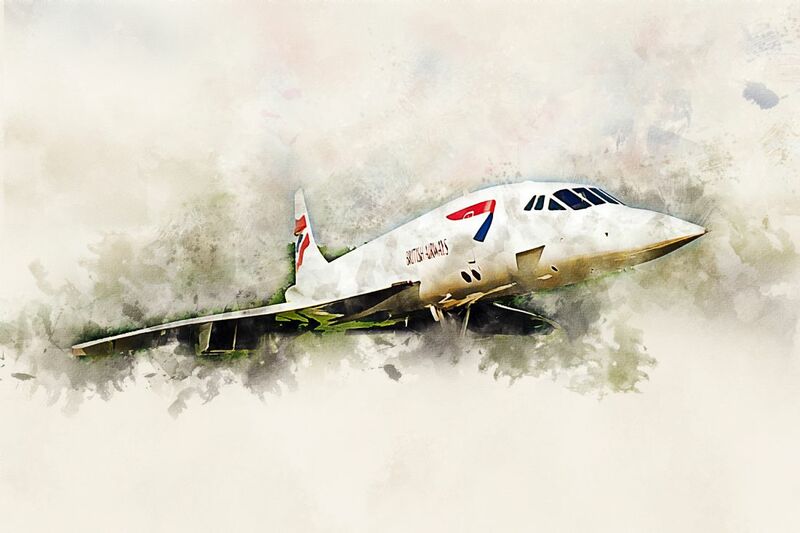 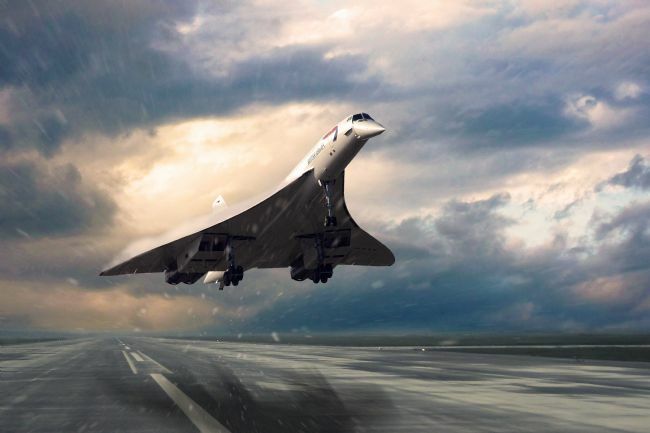 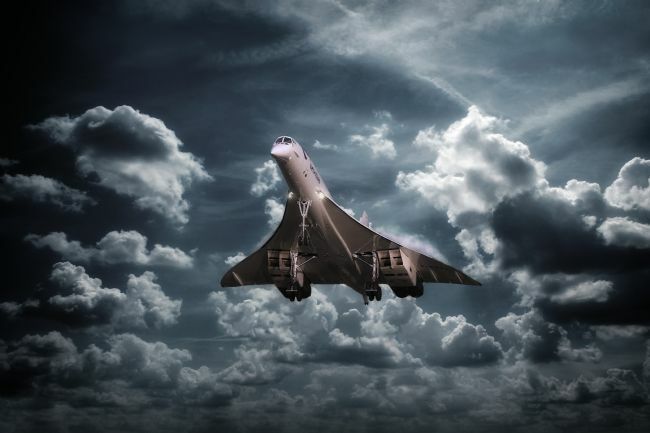 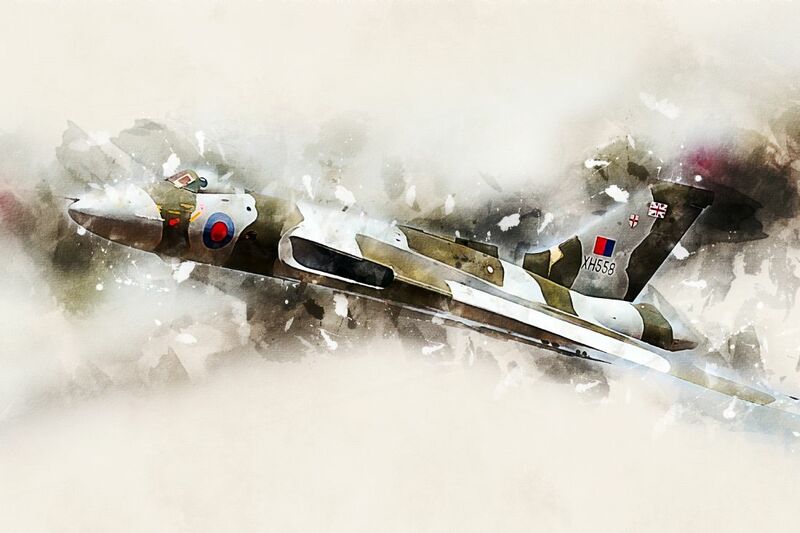 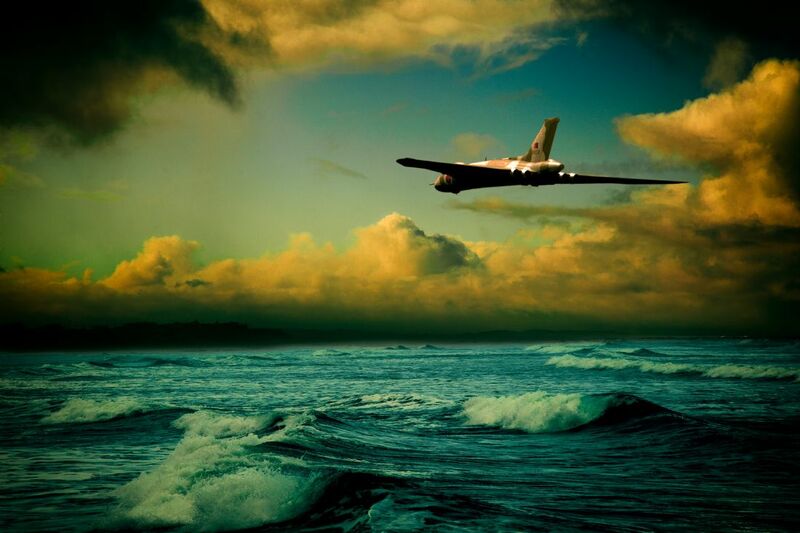 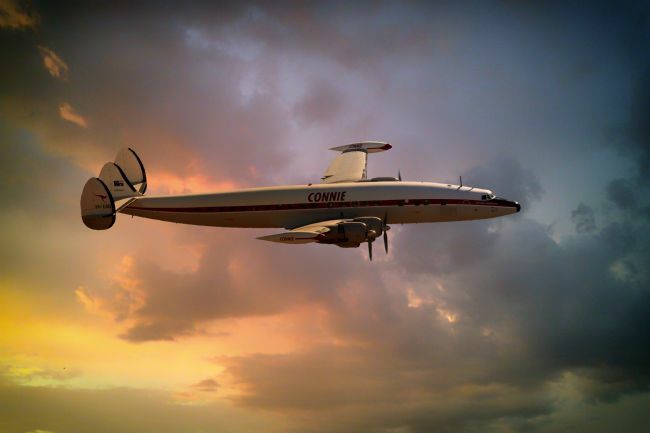 Concorde art by Airpower Art. 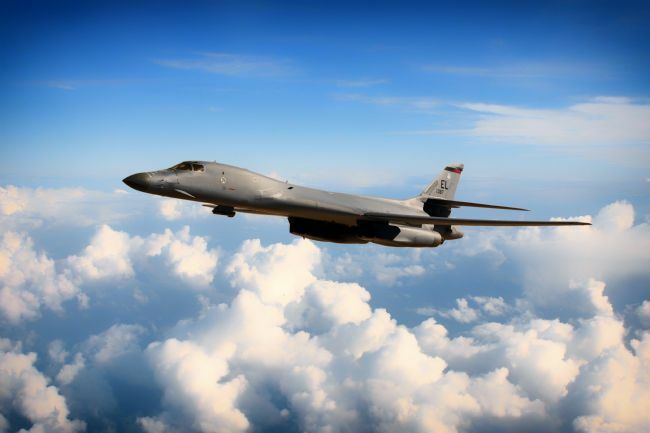 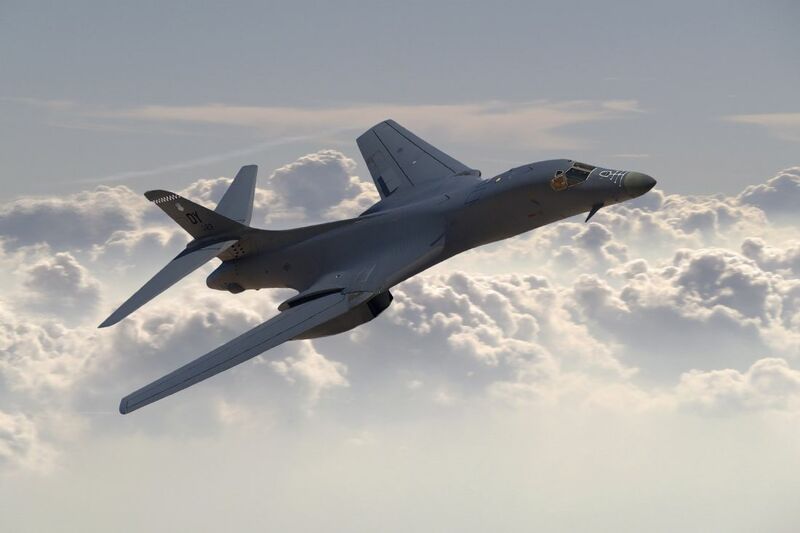 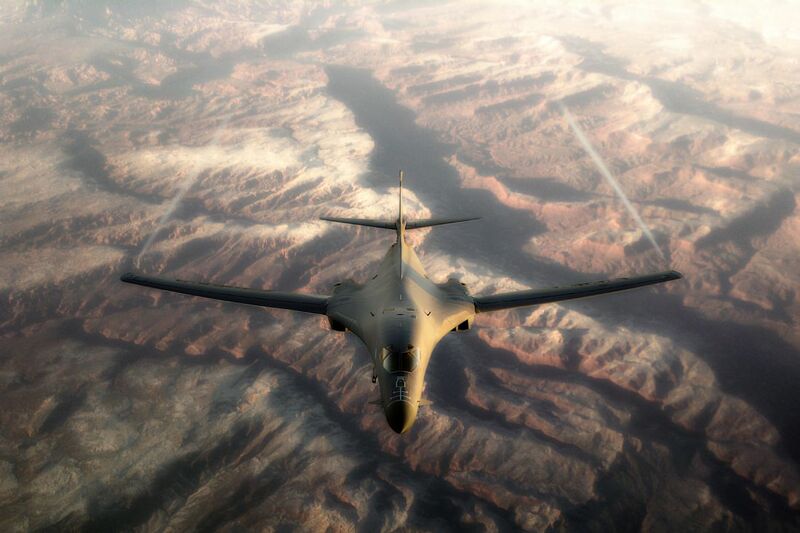 Rockwell B-1 Lancers from the 419th Flight Test Squadron out of Edwards AFB, California. 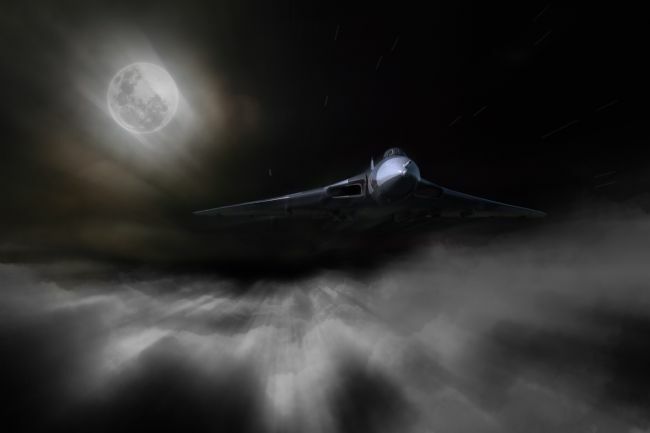 AV-5 82-1070 The Spitit of Ohio. 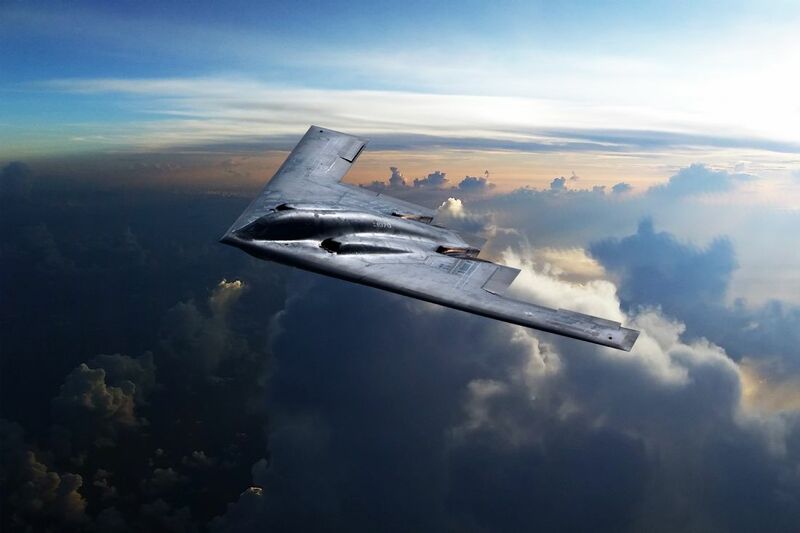 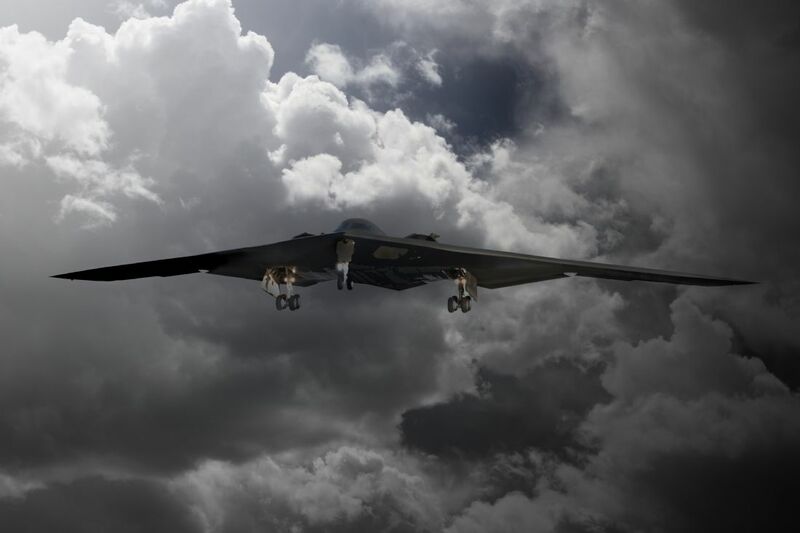 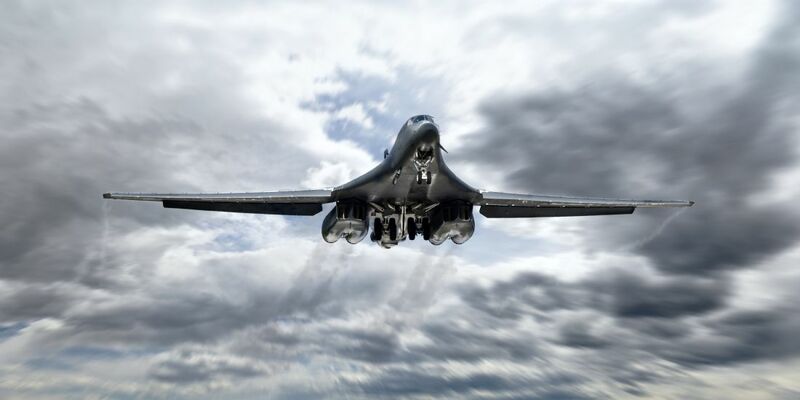 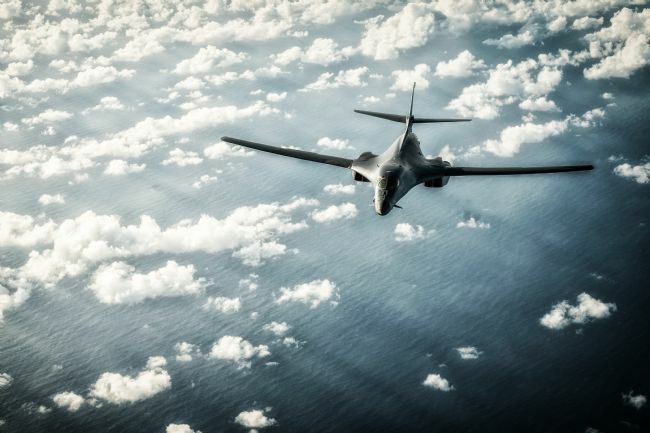 The Northrop Grumman B-2 Spirit, also known as the Stealth Bomber cruising above the clouds. 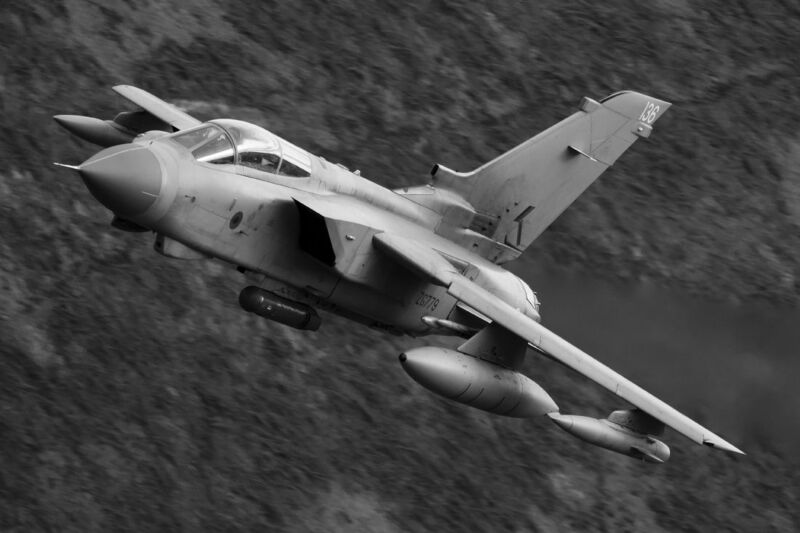 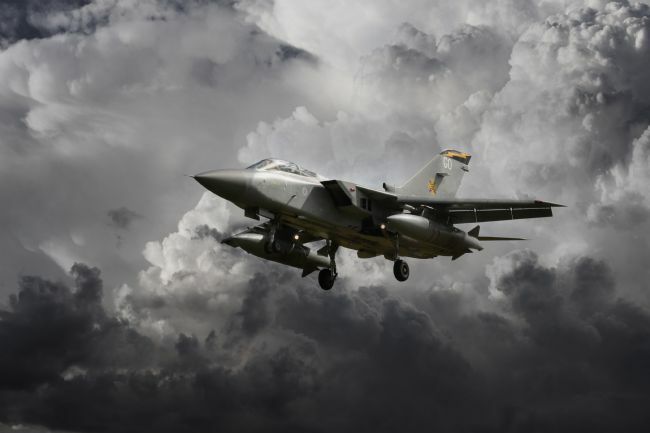 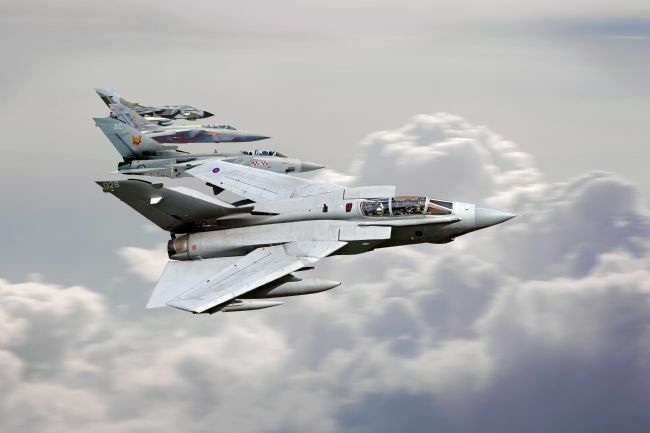 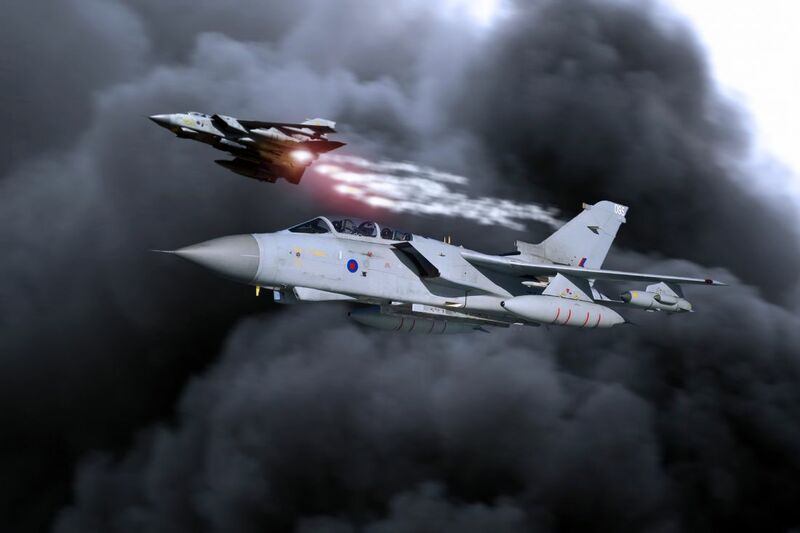 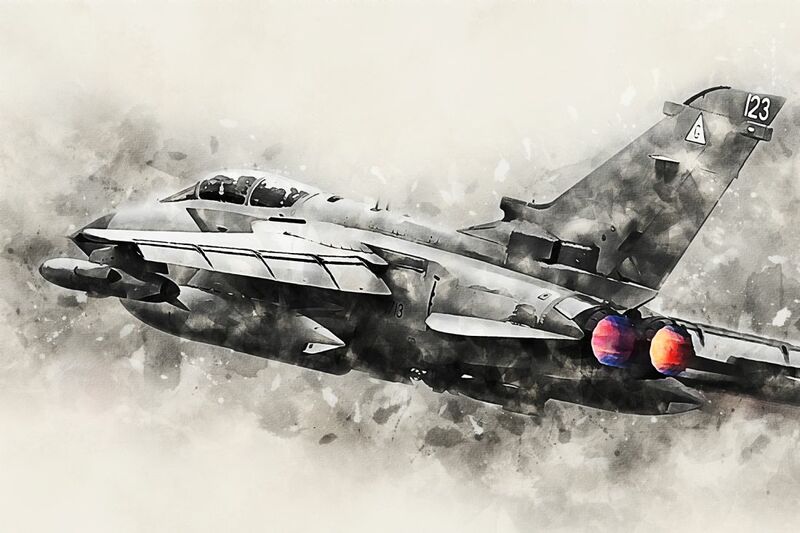 The RAF Tornado Role Demo. 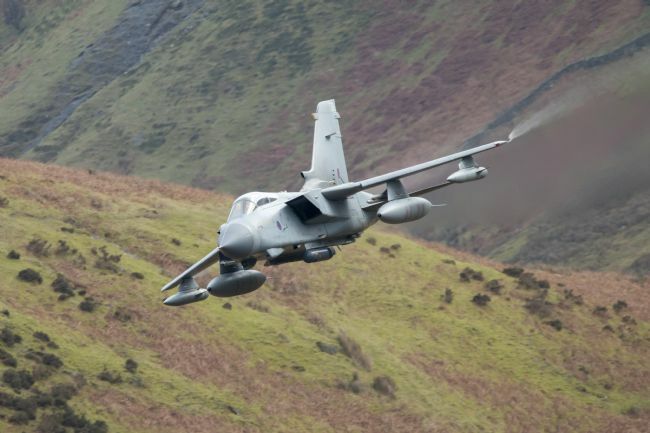 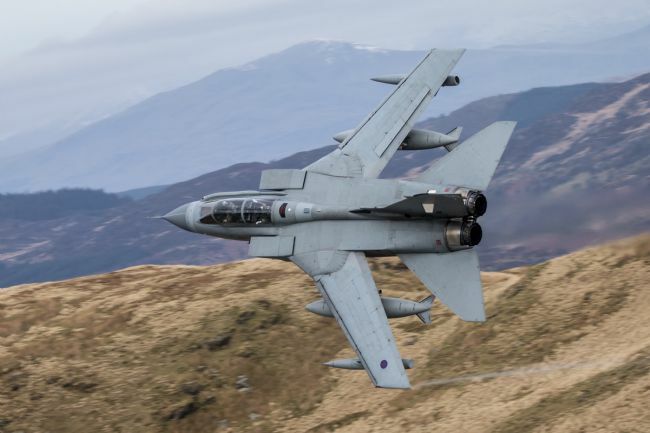 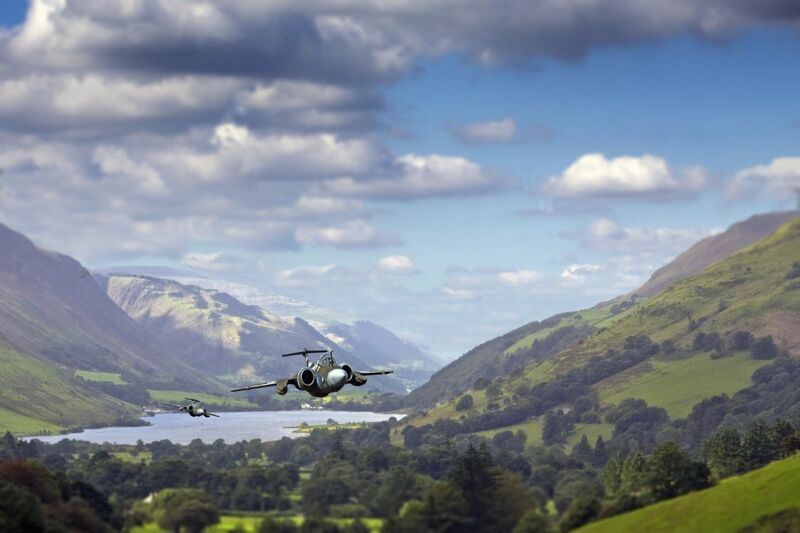 RAF Tornado GR4 from XV Squadron thunders through the valleys. Composite Image. 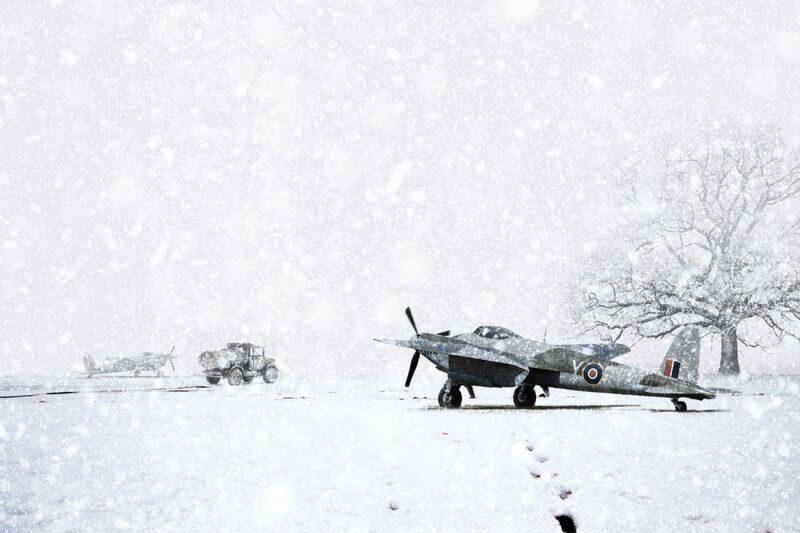 de Havilland Mosquitos caught out in the winter snowfall. 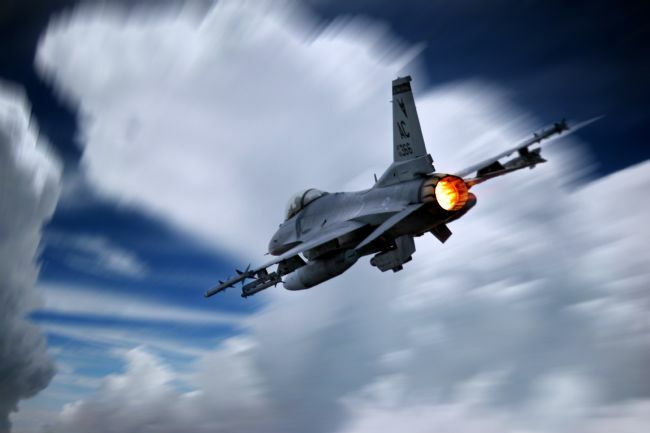 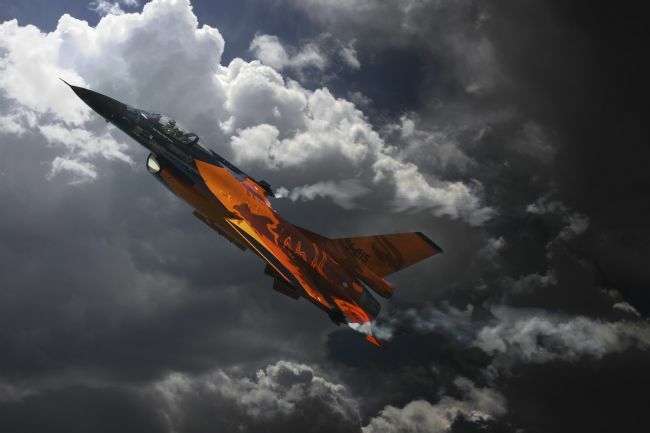 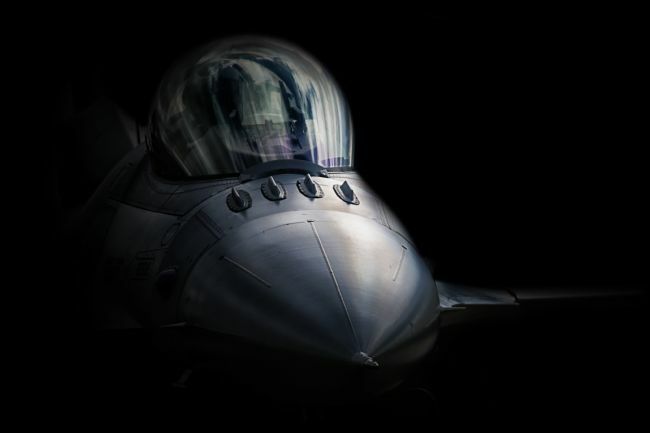 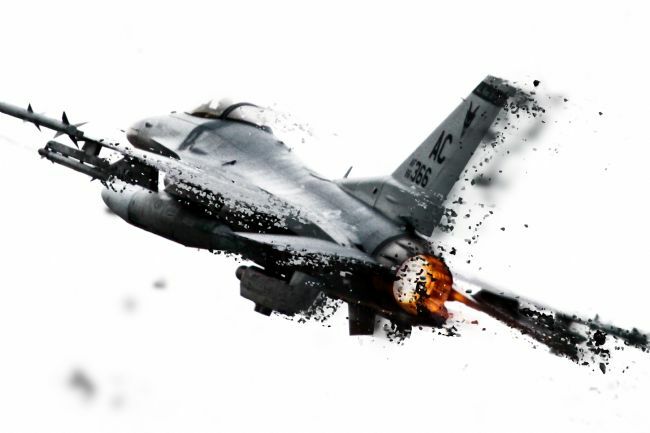 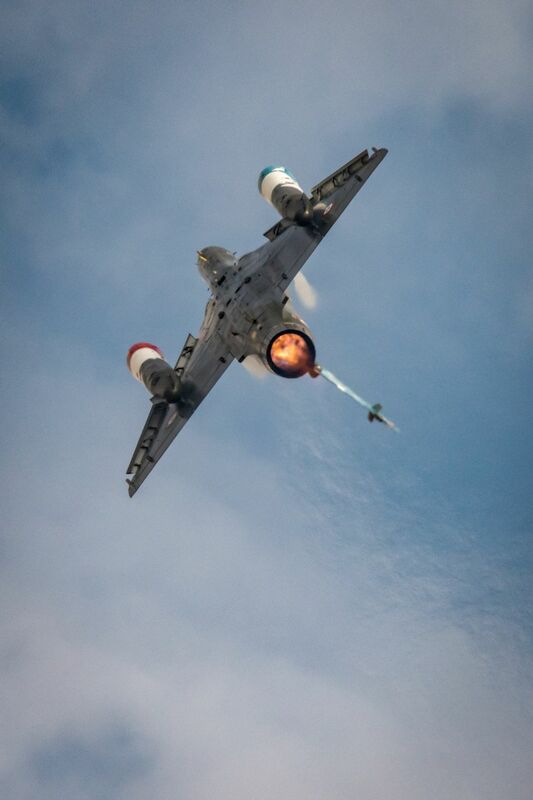 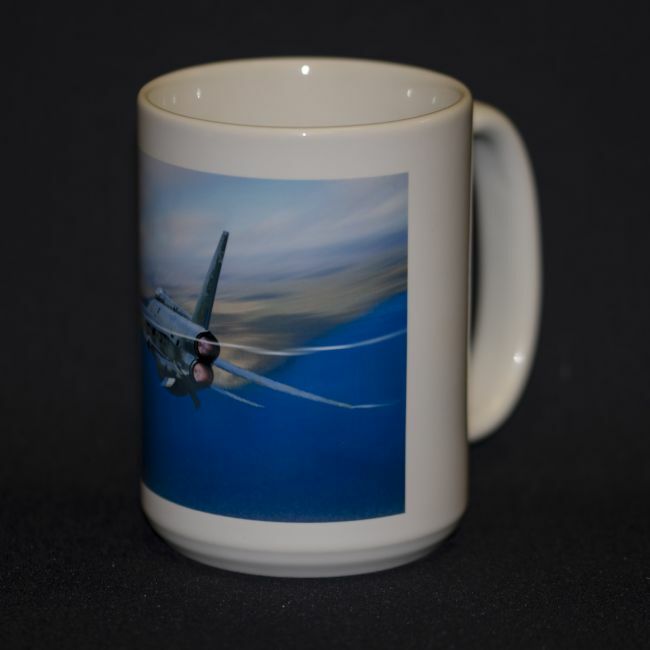 USAF F-16 Fighting Falcon with full afterburner Composite image. 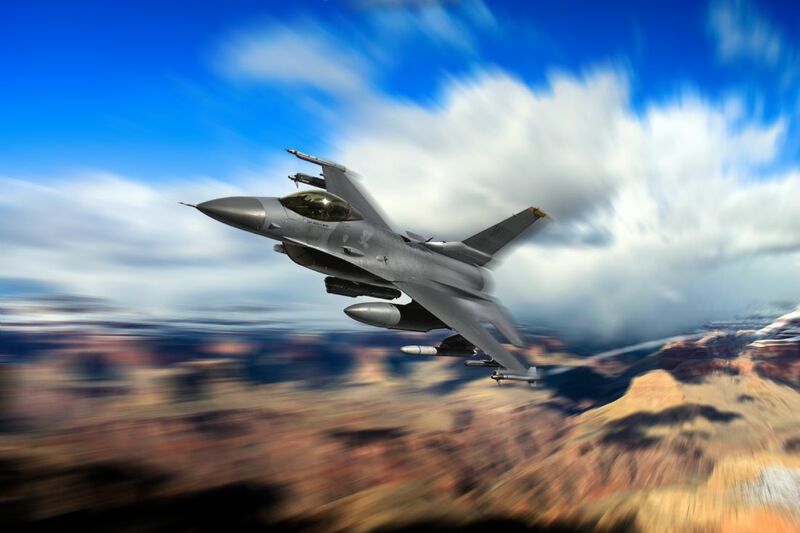 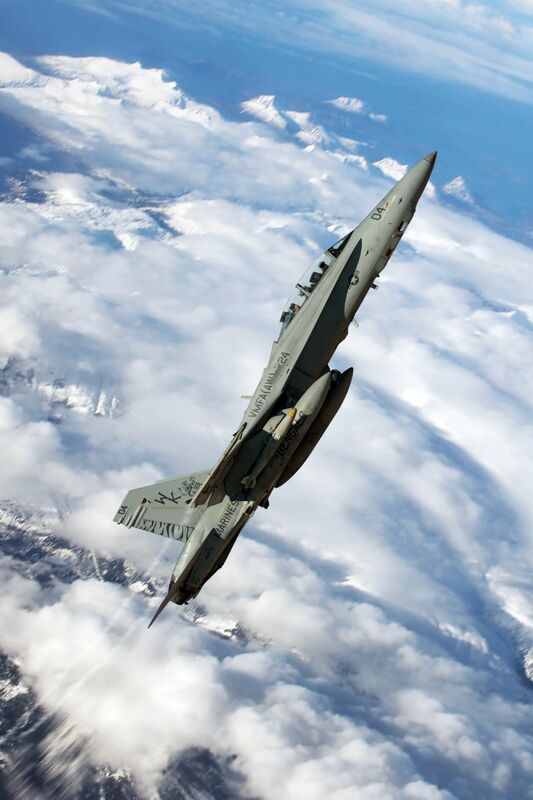 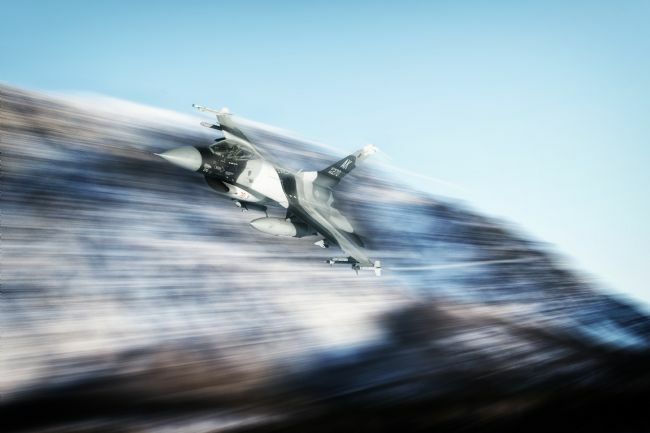 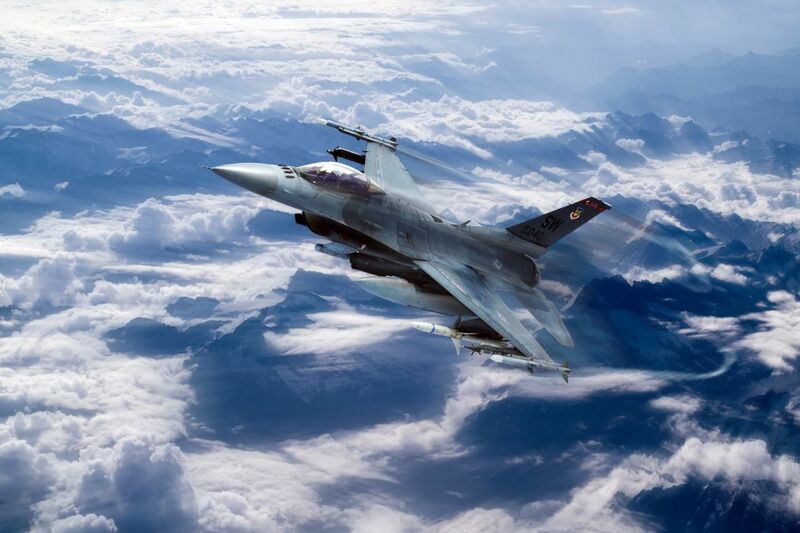 A USAF F-16 Fightning Falcon on the Nevada ranges. General Dynamics F-16 form the 13th Fighter Squadron, Misawa AB Japan. 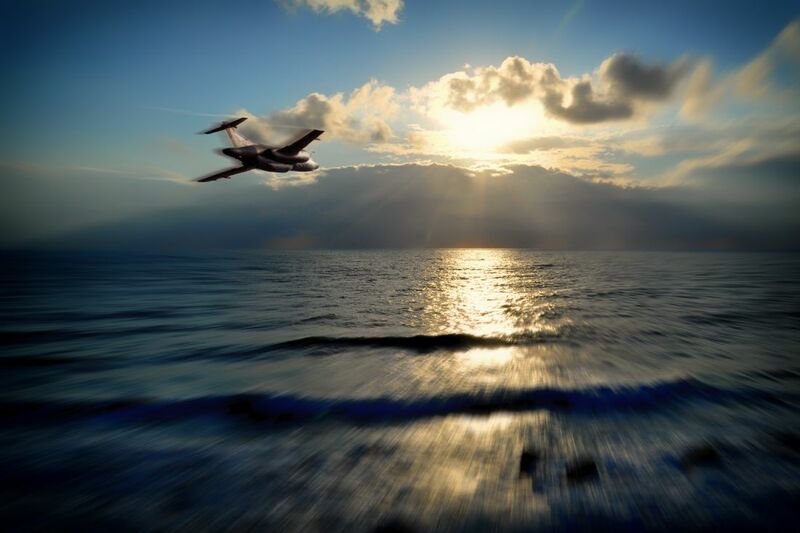 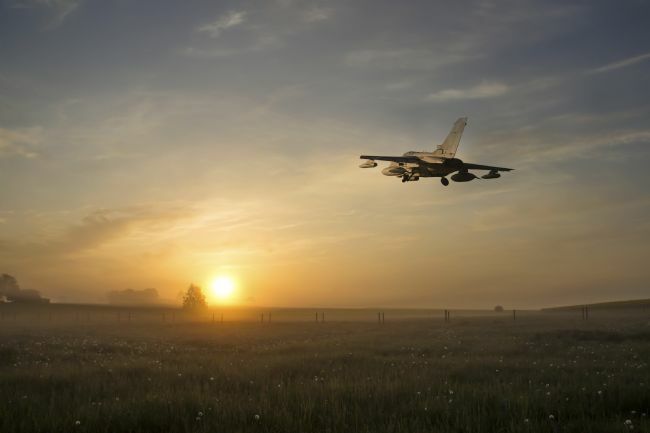 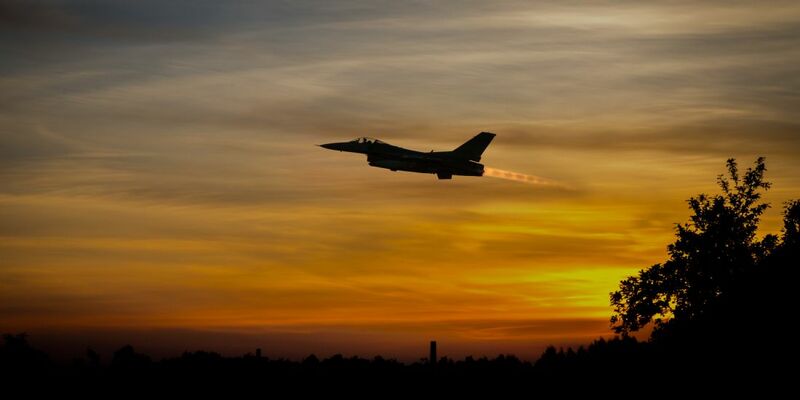 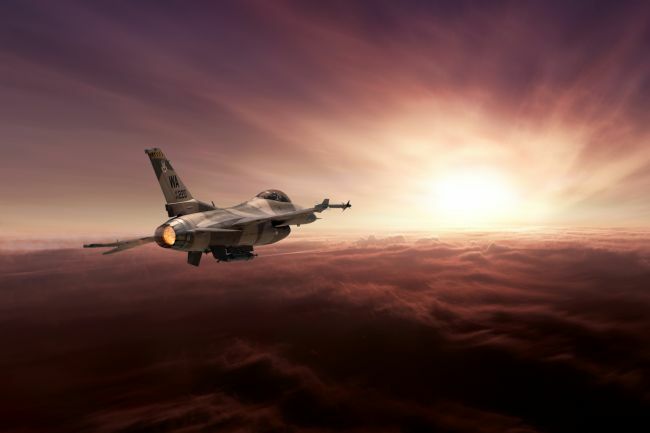 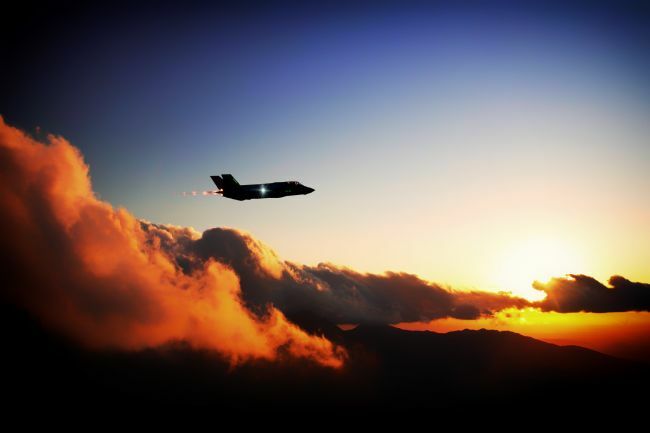 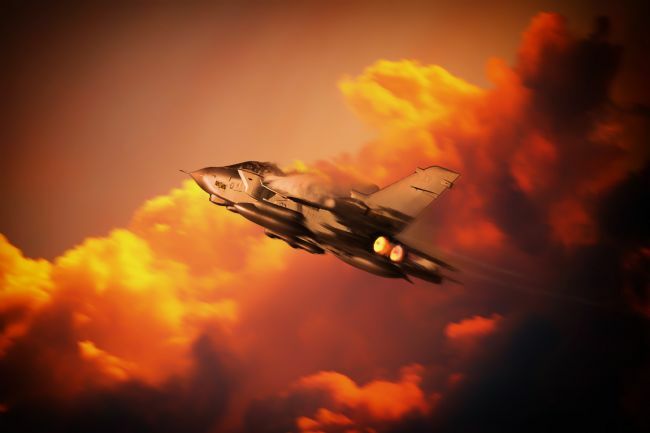 F-16 Fighting Falcon getting airborne silhouetted against the setting sun Composite image. 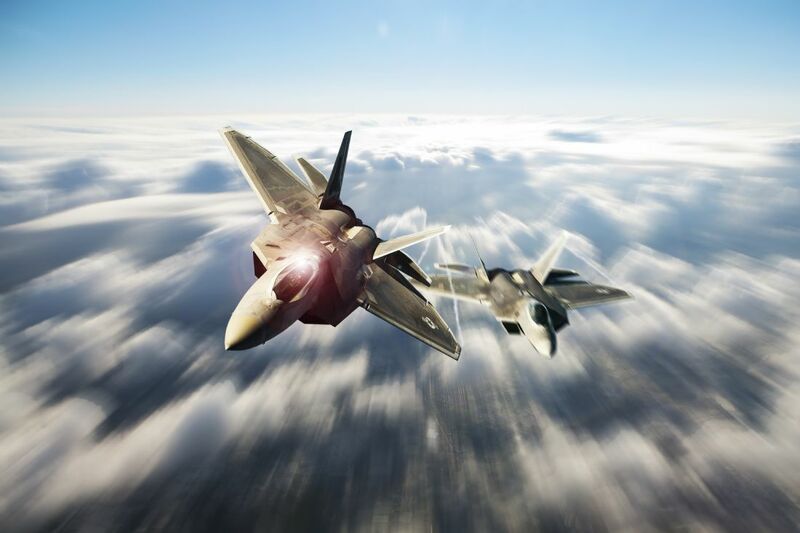 Two F-22 Raptors and a strike mission. 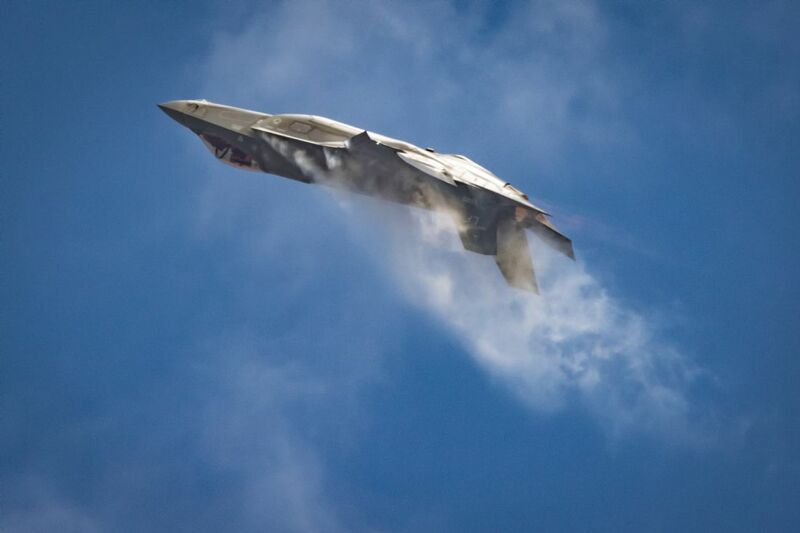 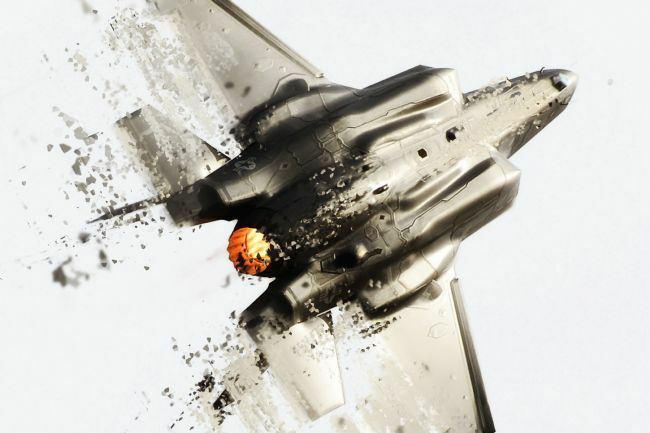 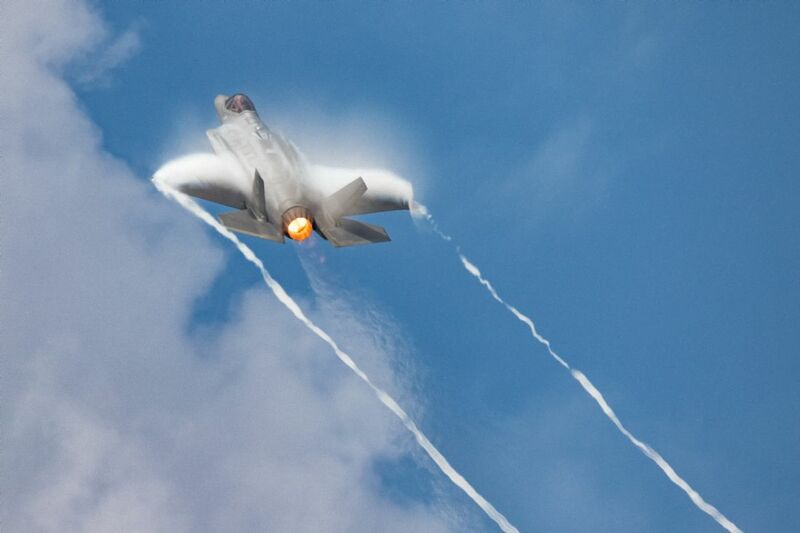 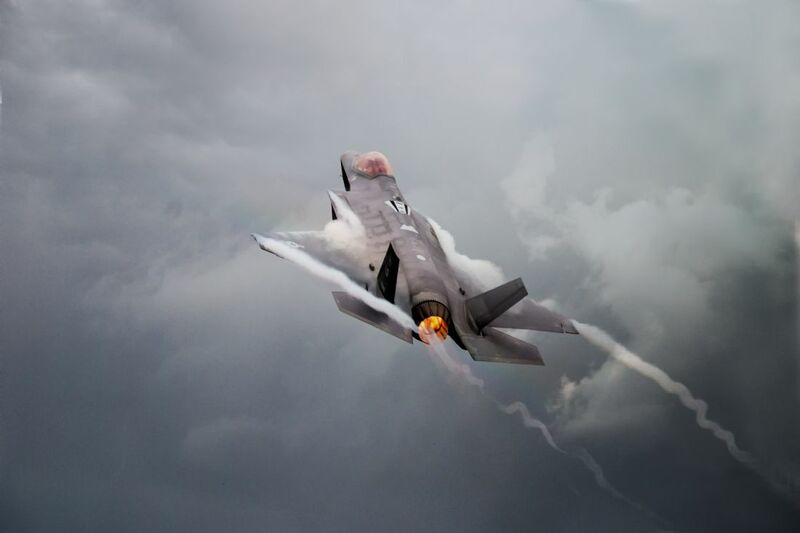 The F-22 Raptor is a 5th Generation aircraft developed by Lockheed Martin for the US Air Force. 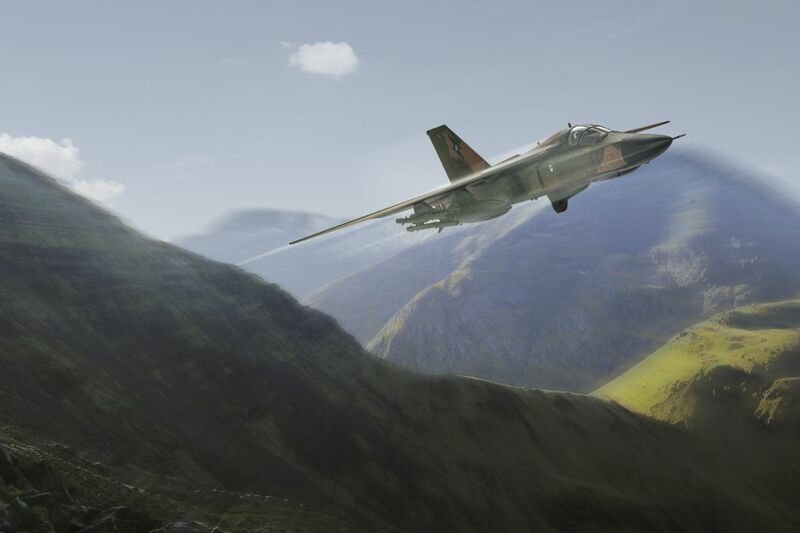 The General Dynamics F-111 Aardvark was a medium-range interdictor and tactical strike aircraft that also filled the roles of strategic bomber, reconnaissance, and electronic warfare in its various versions. 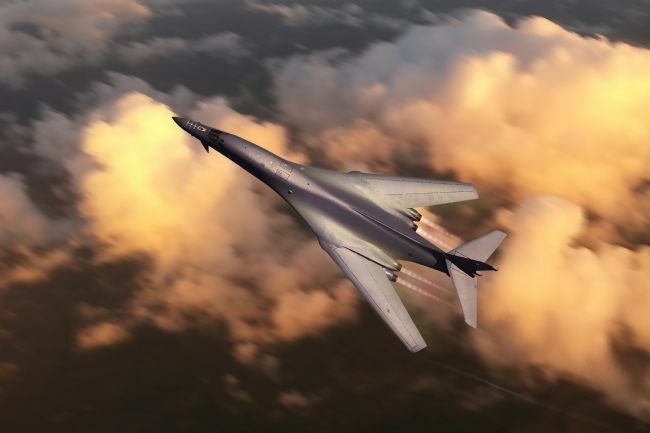 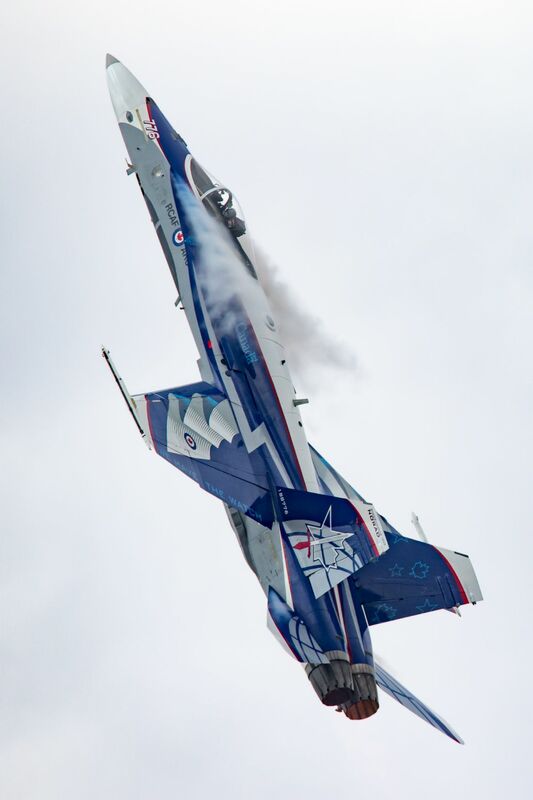 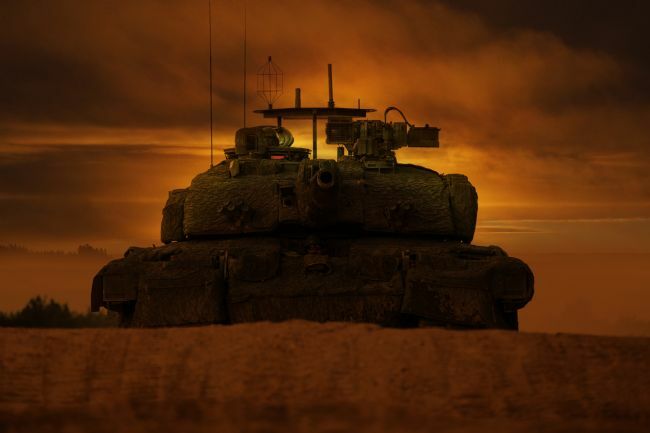 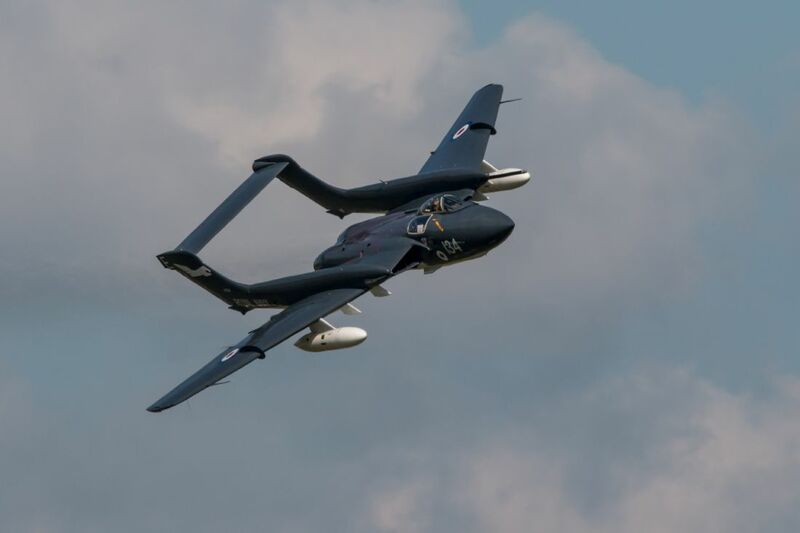 Developed in the 1960s by General Dynamics, it first entered service in 1967 with the United States Air Force. The Royal Australian Air Force (RAAF) also ordered the type and began operating F-111Cs in 1973. 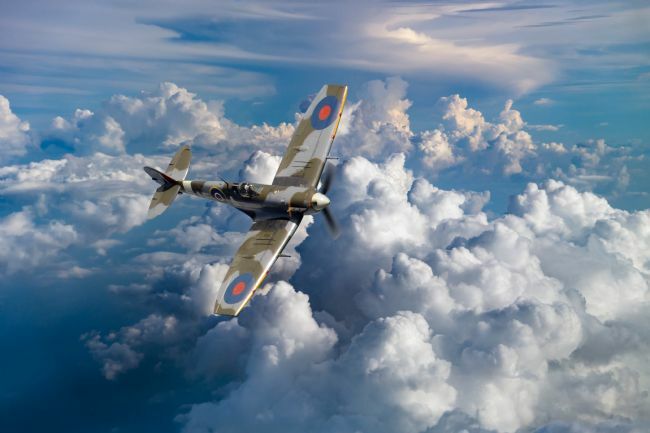 With seven 'kills' to its name, The Fighter Collection's Spitfire LF Mk.Vb EP120 is a genuine Second World War combat veteran. 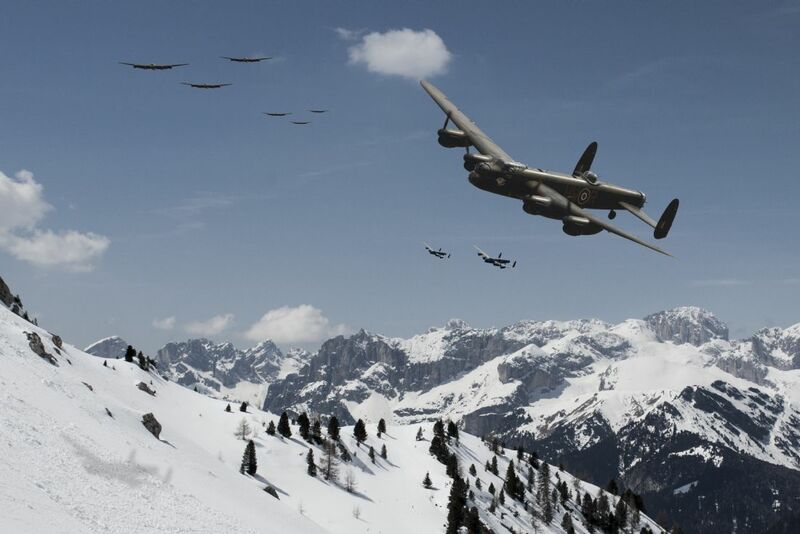 The aircraft passed through several Royal Air Force units, downing six Luftwaffe aircraft during its time with No. 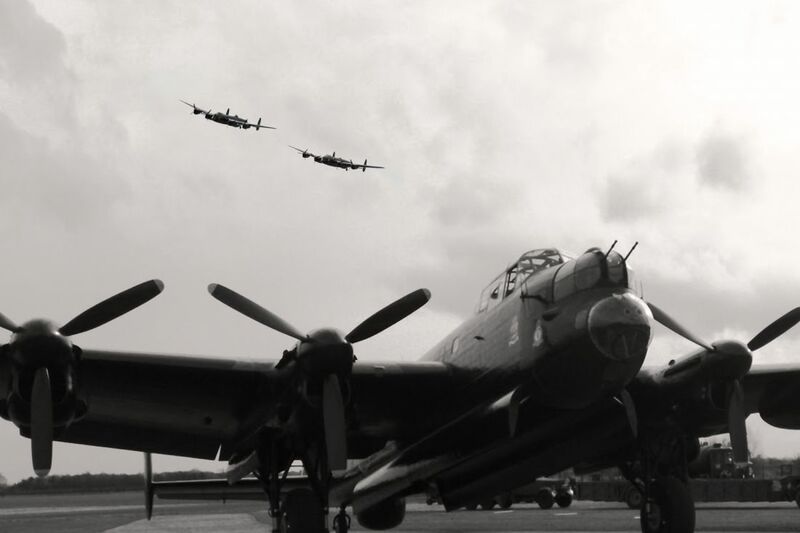 501 Squadron. Spitfire X4650 was built by Vickers Armstrong's (Supermarine) Ltd. at Woolston in October 1940. 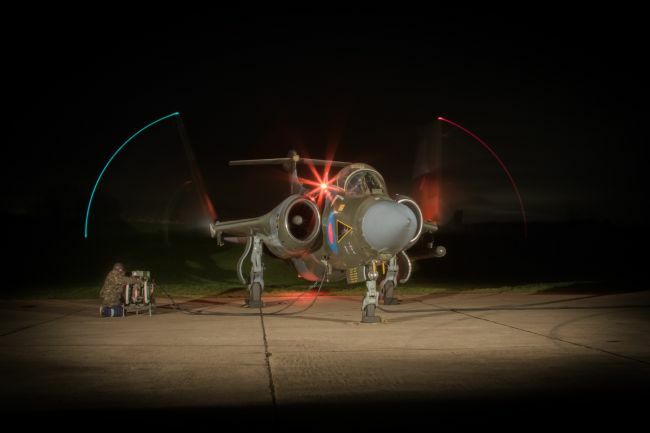 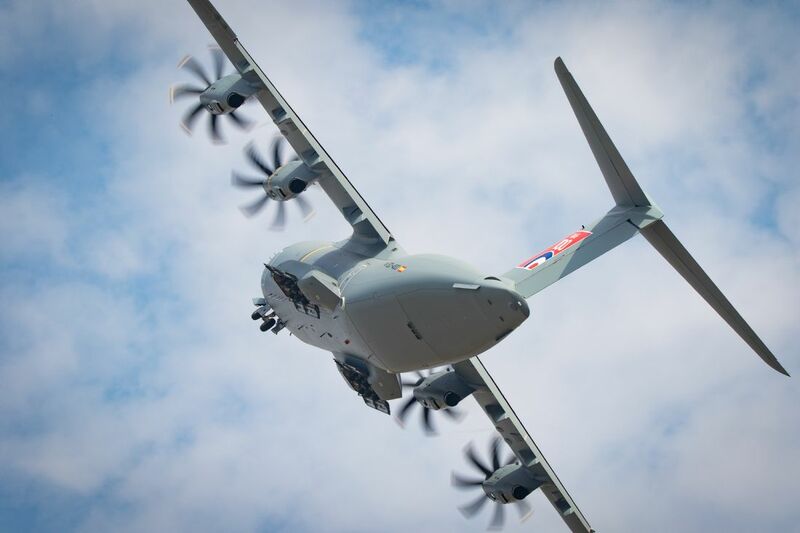 It was delivered to the RAF 24 MU at Ternhill. 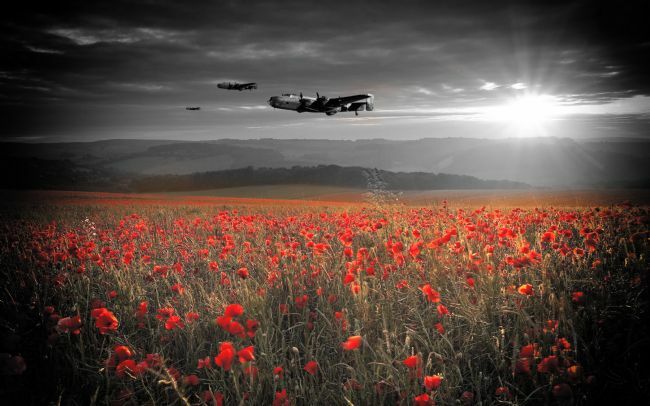 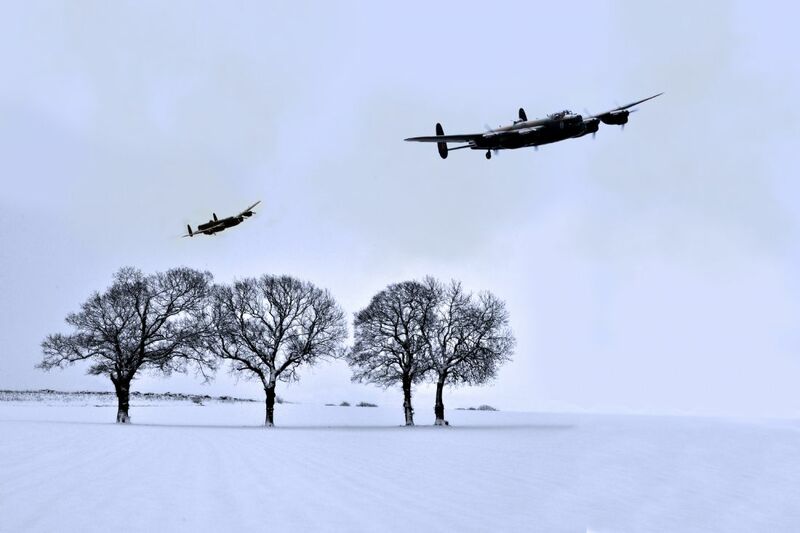 On 14th November 1940 it was taken on charge by 54 Squadron at Catterick. 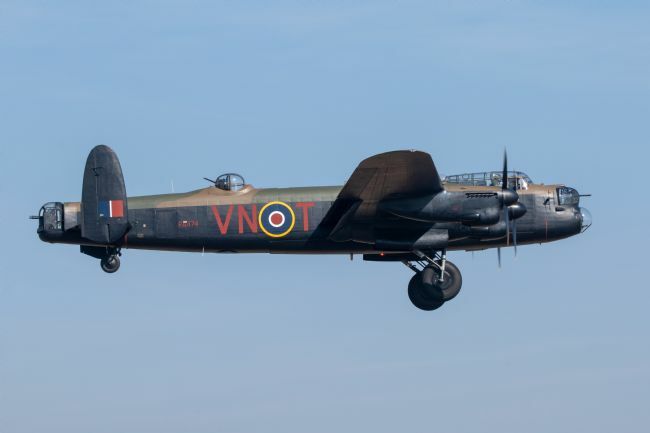 On 28th December 1940 this aircraft and another of the same squadron were undertaking a training exercise when they collided at 12,000 feet it was struck off charge on 4th January 1941. Supermarine Spitfire Mark IX BS435 with 611 RAF West Lancashire Squadron markings of Squadron leader Hugo T. Armstrong D.F.C. 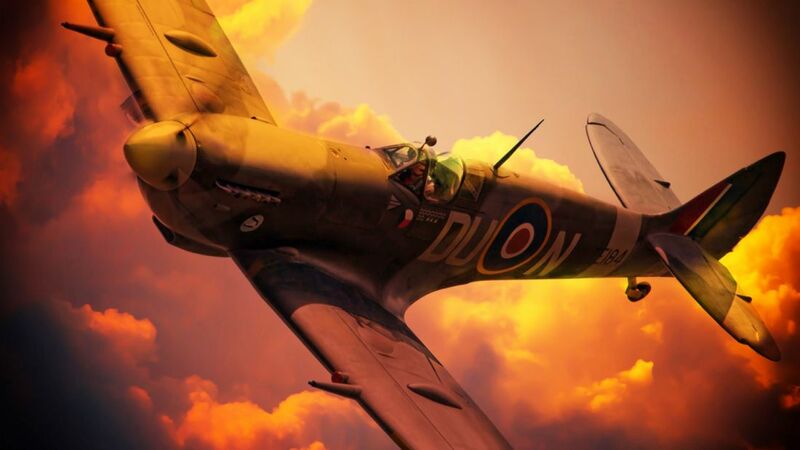 Hugo Armstrong was the first Australian wartime-trained fighter pilot to command a RAF fighter squadron in WW2, and led 611 Squadron successfully until his death in action. 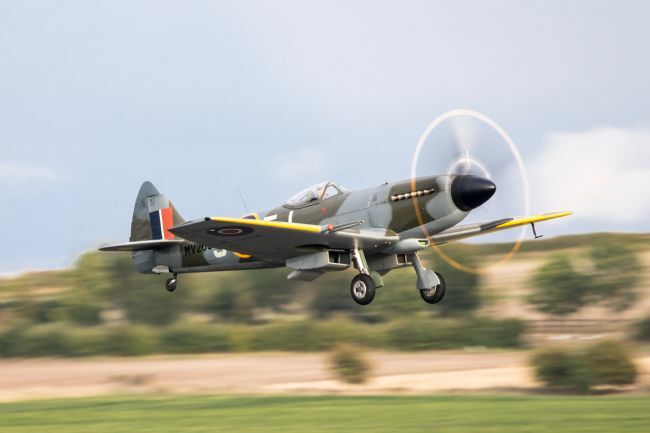 Supermarine SPitfire P7350 of the Battle of Britain Memorial Flight. The only airworthy Spitfire from the Battle of Britain, a much admired survivor and precious piece of British aviation history. 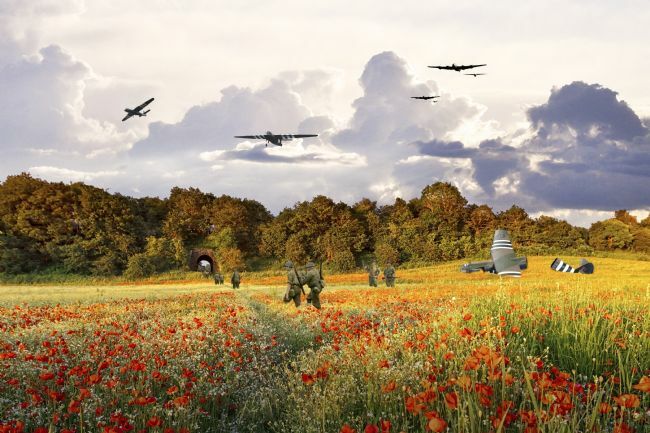 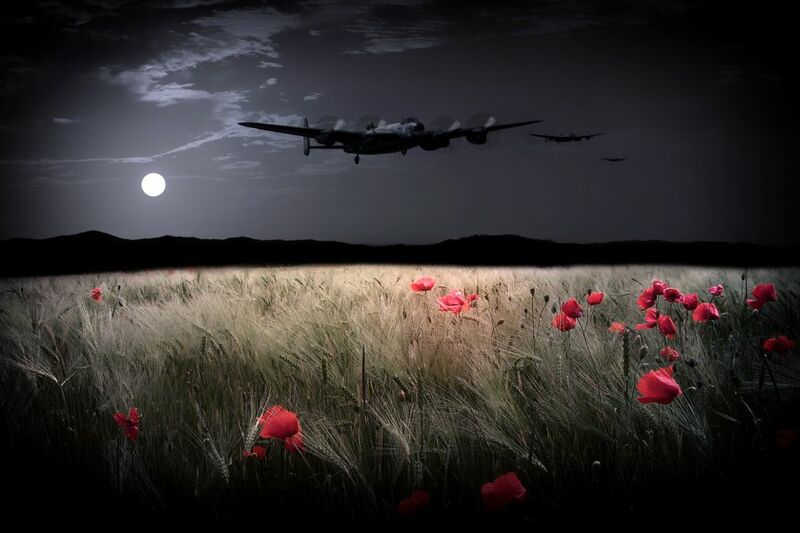 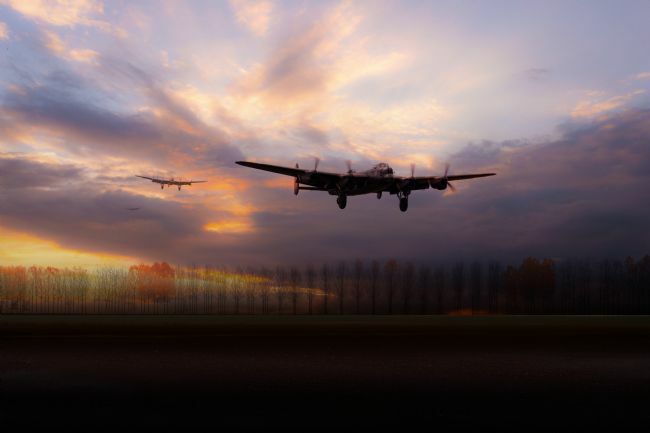 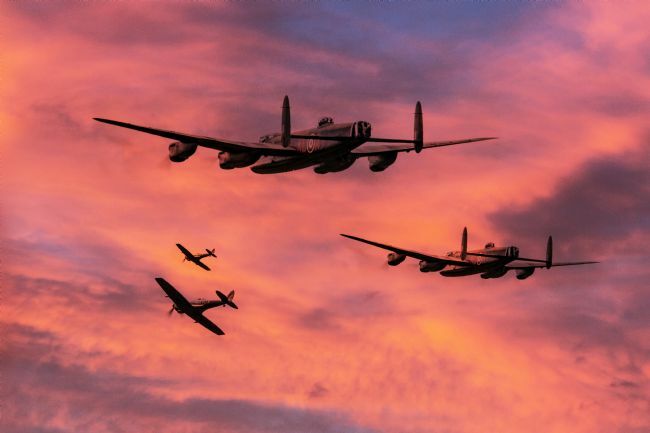 Artistic Interpretation of Guy Gibson and his faithful dog watching a flight of Lancaster Bombers get airbrne from their base at RAF Scampton in Lincolnshire as the sun sets. 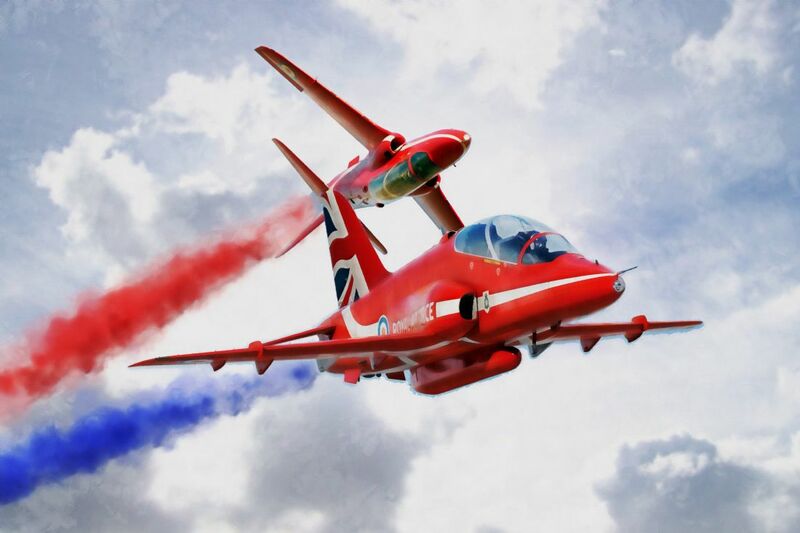 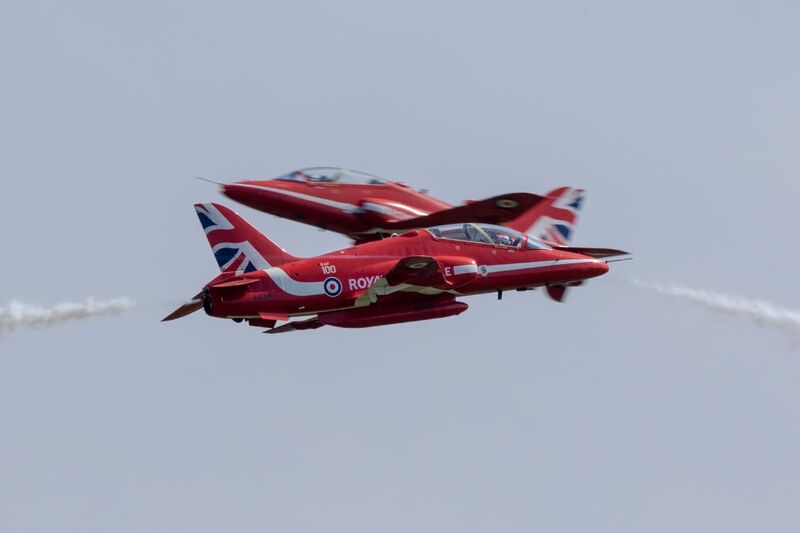 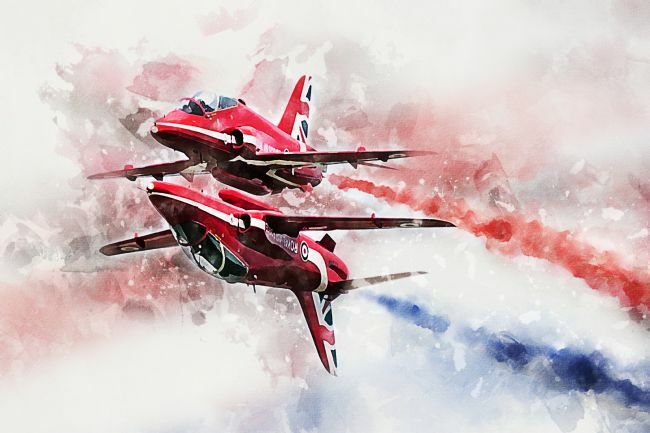 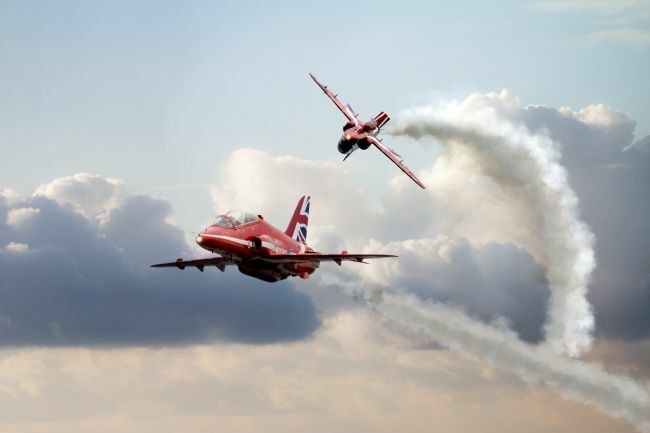 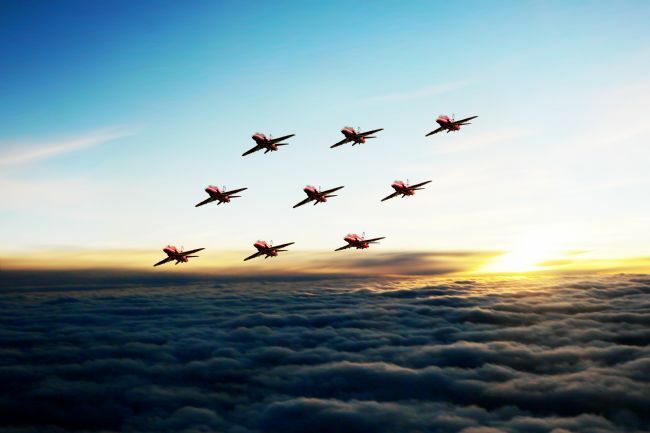 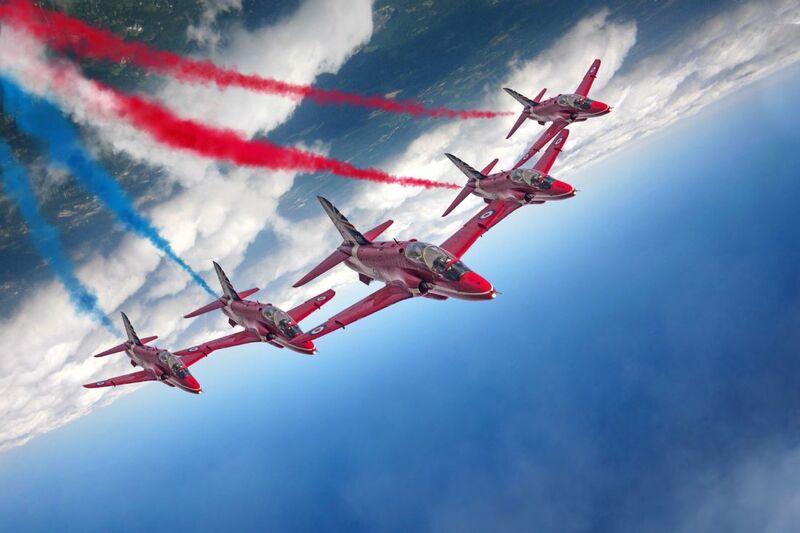 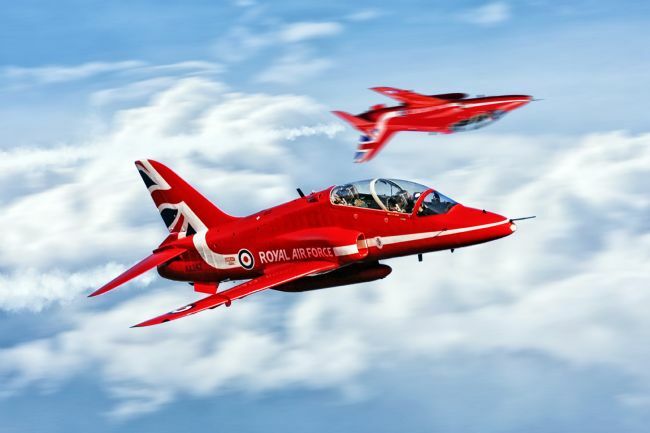 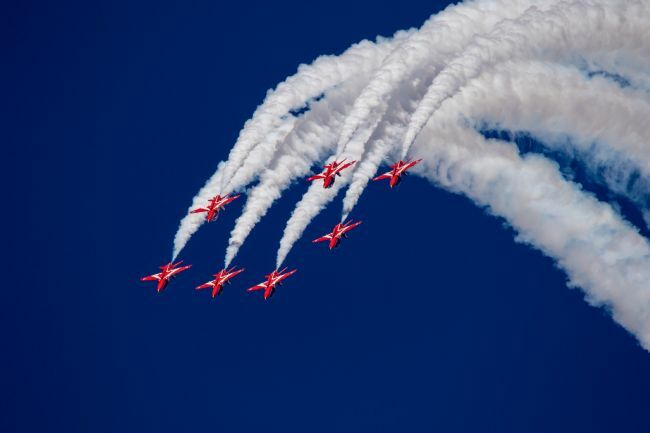 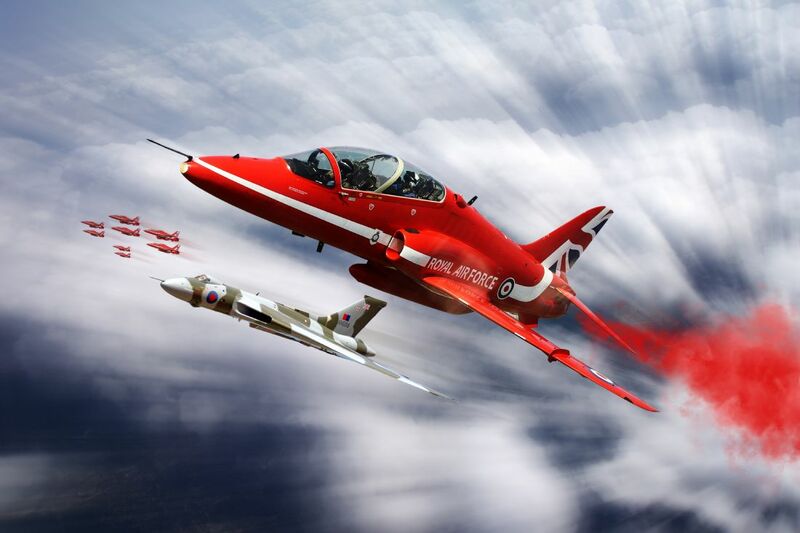 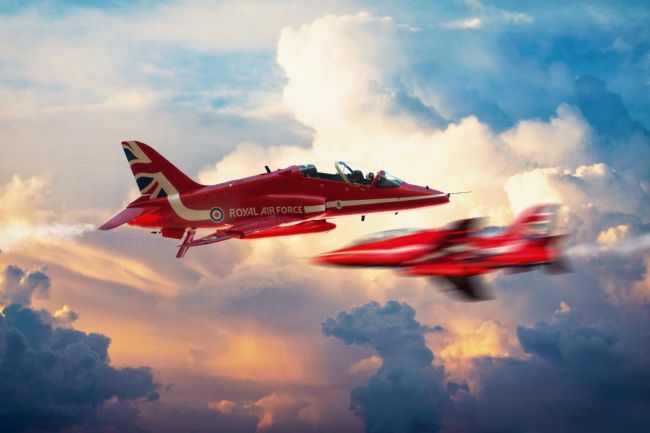 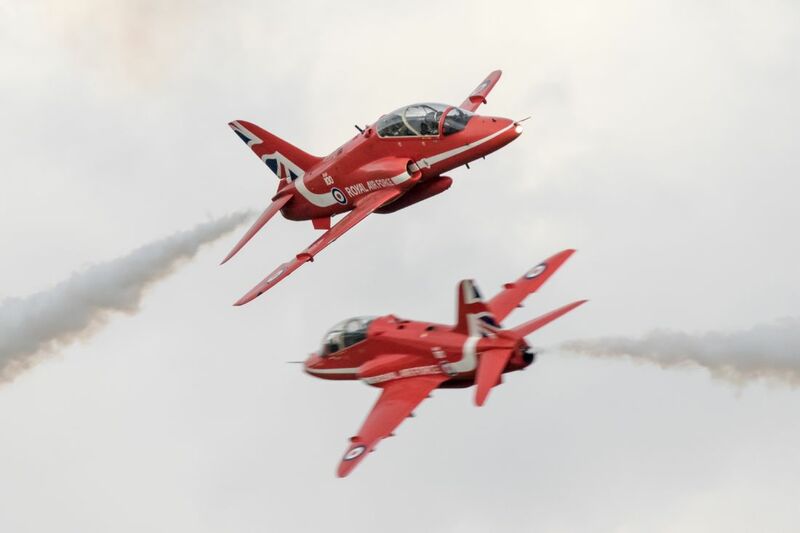 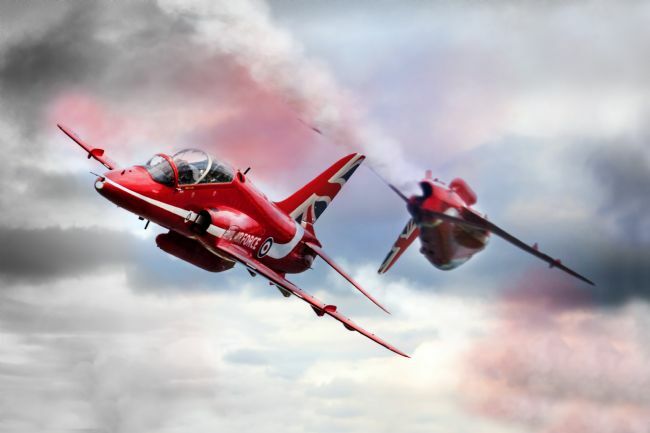 Digital painting of the The Royal Air Force Display Team 'The Red Arrows' Synchro Pair. 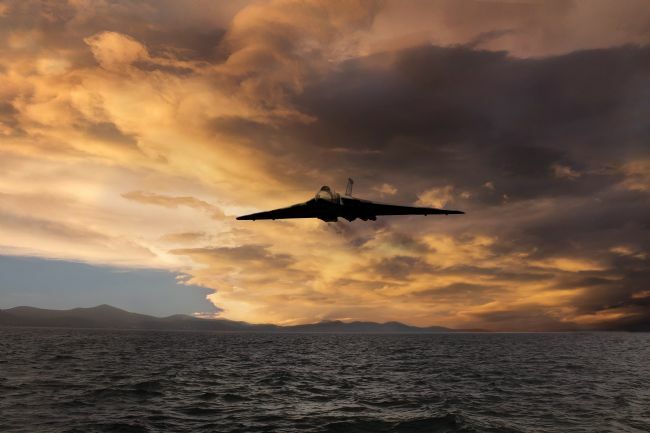 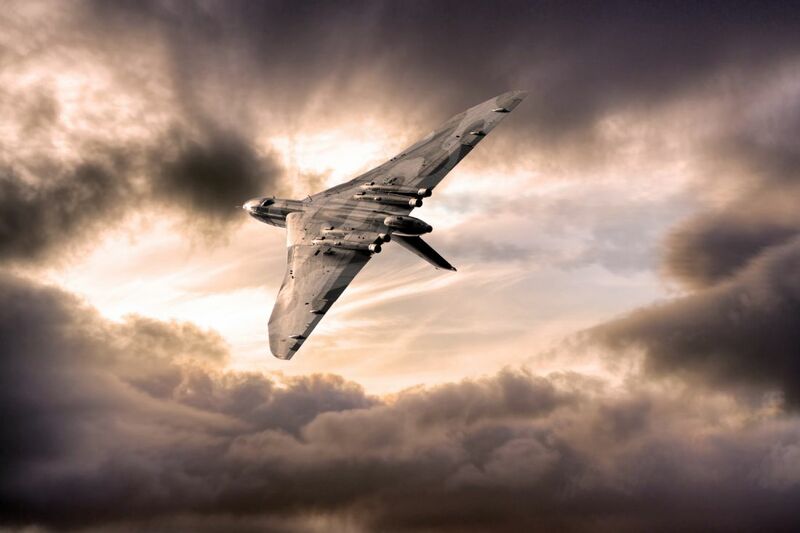 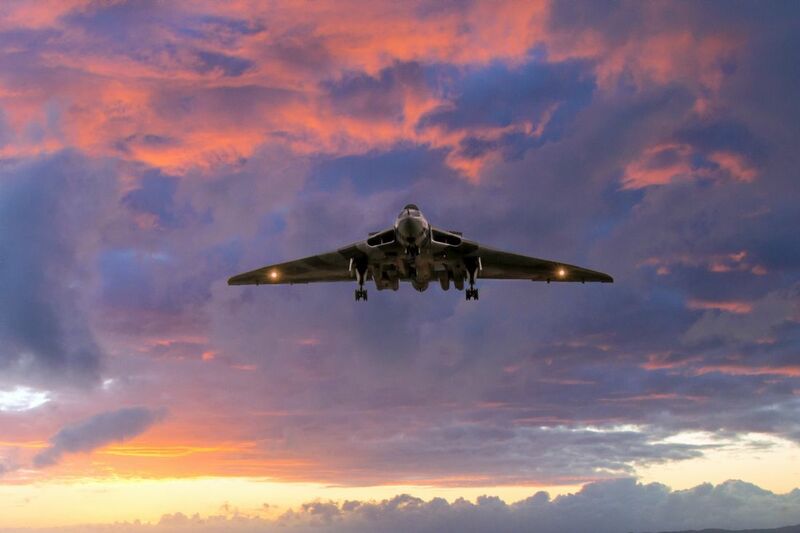 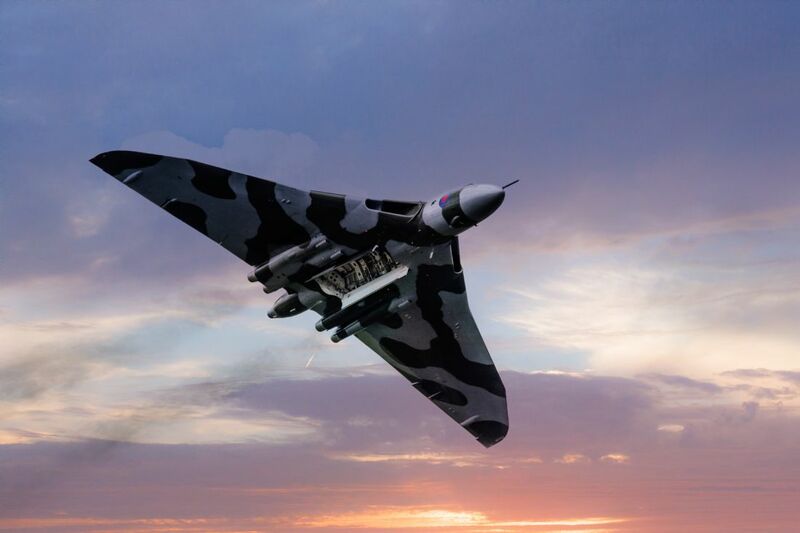 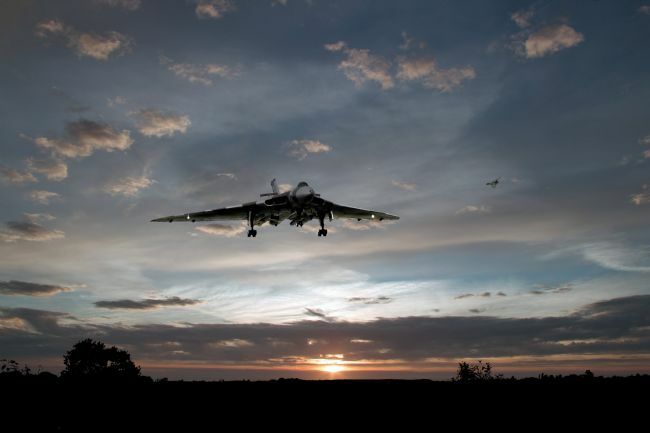 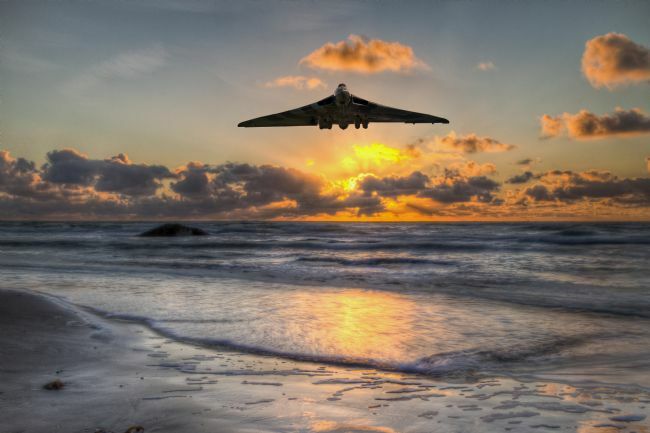 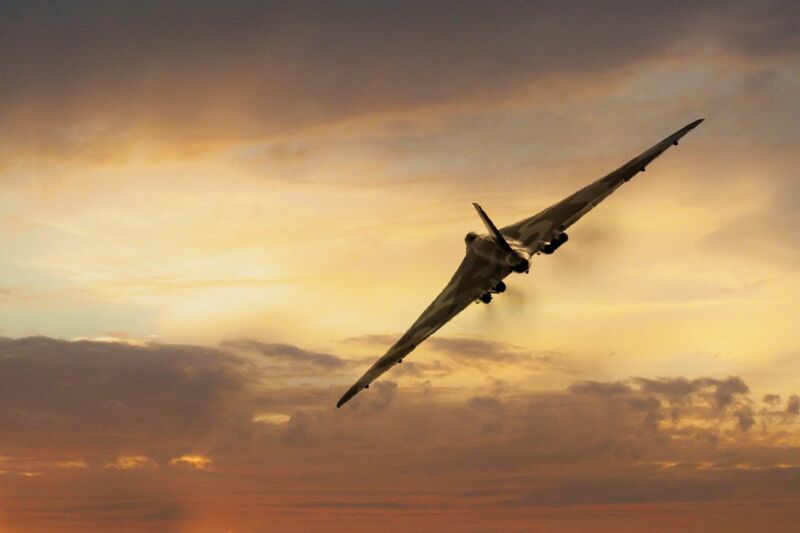 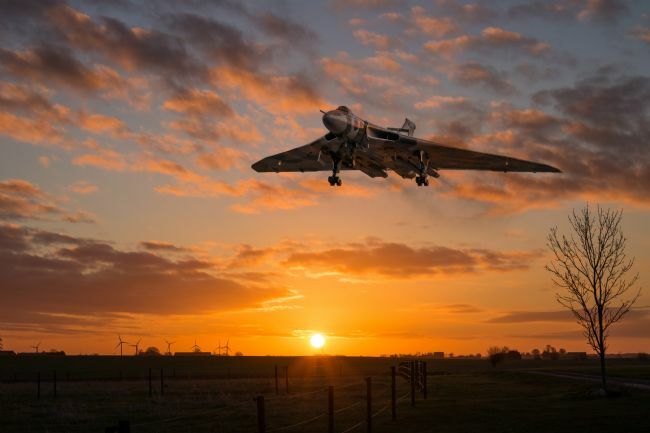 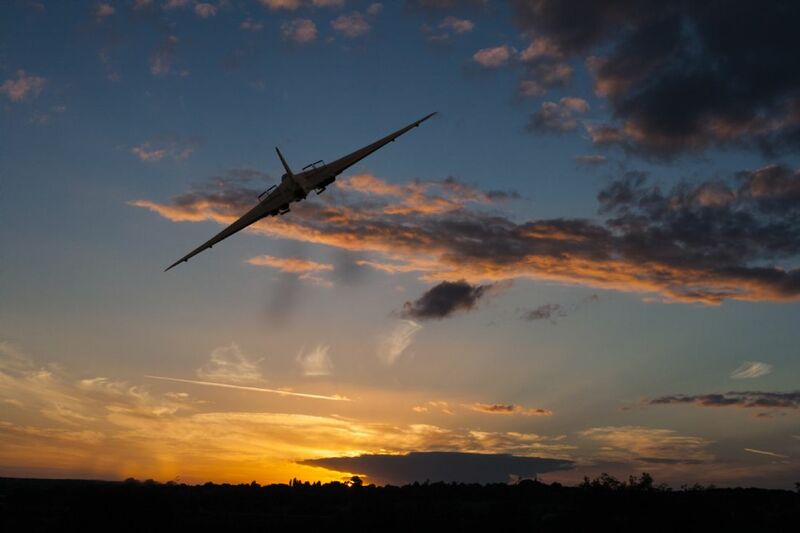 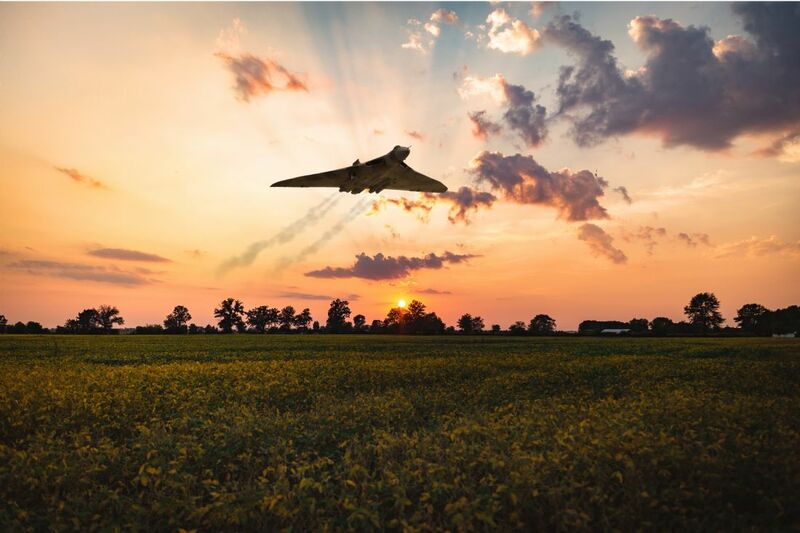 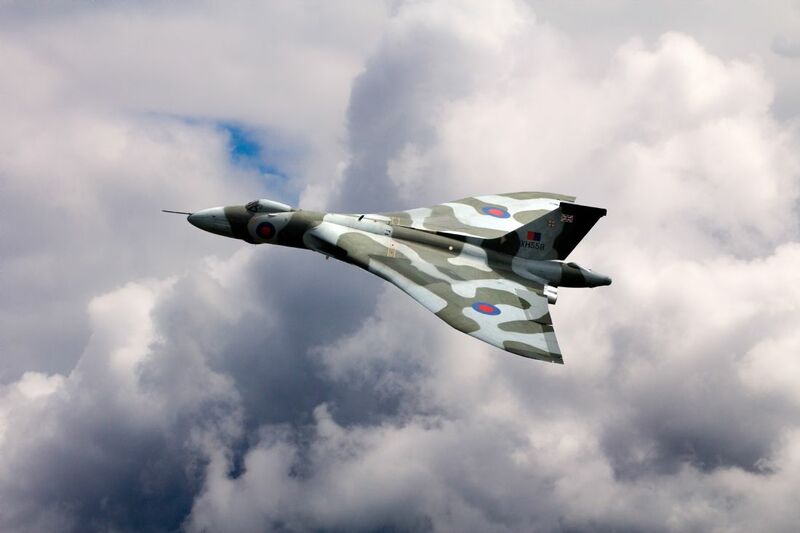 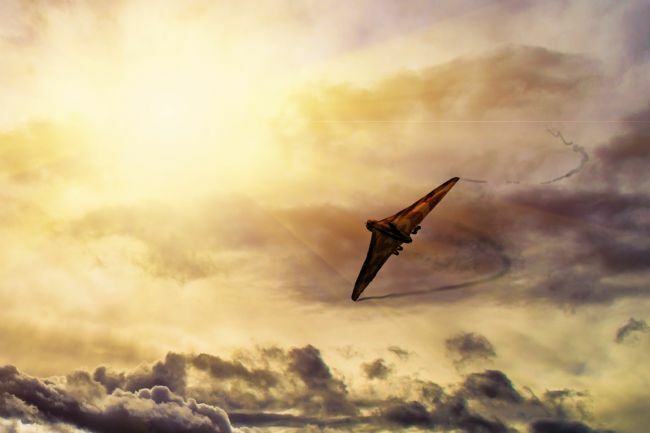 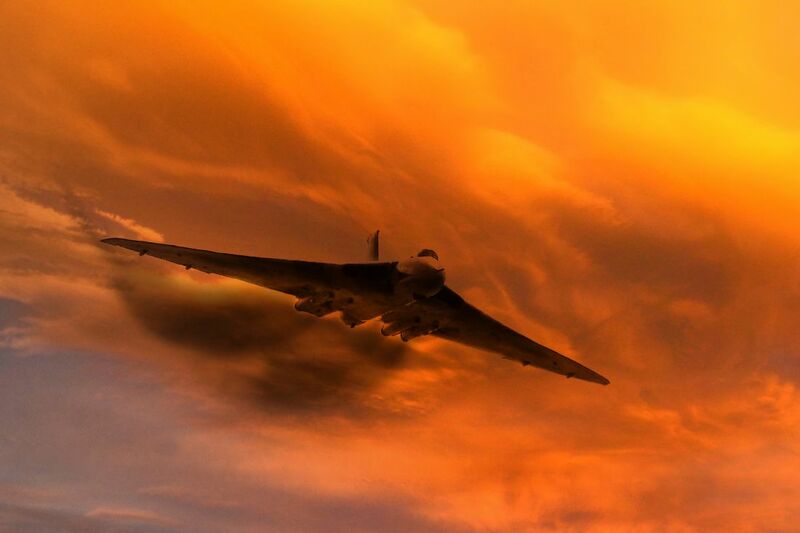 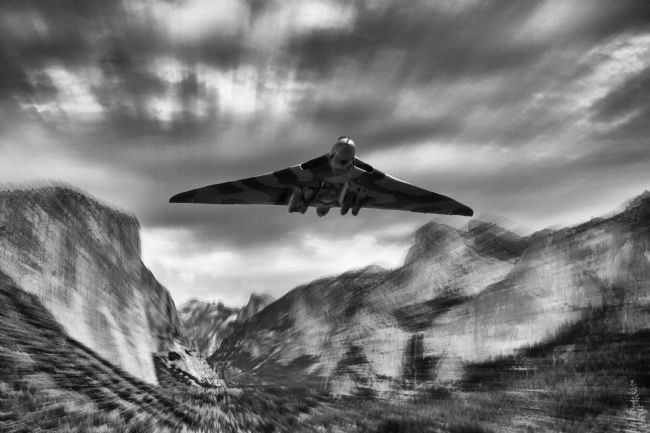 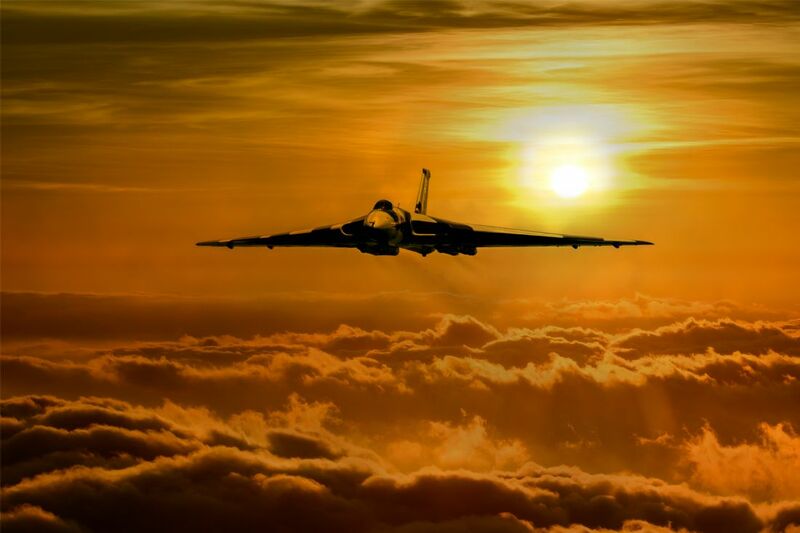 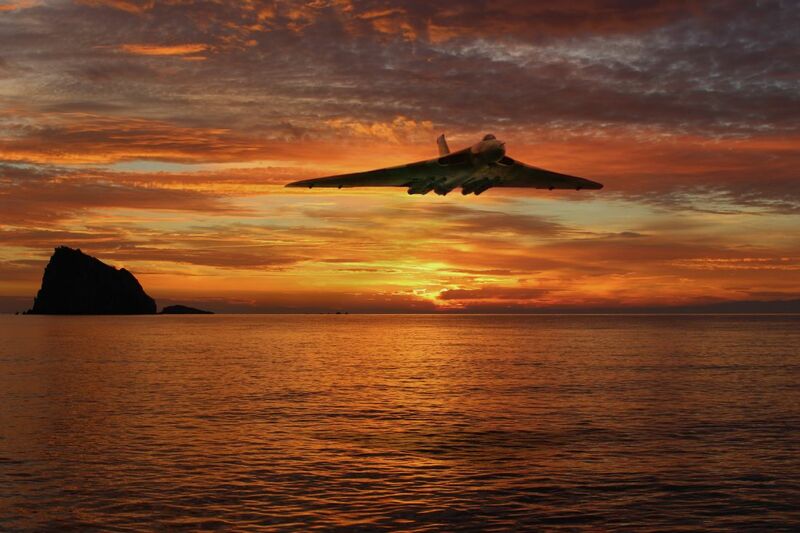 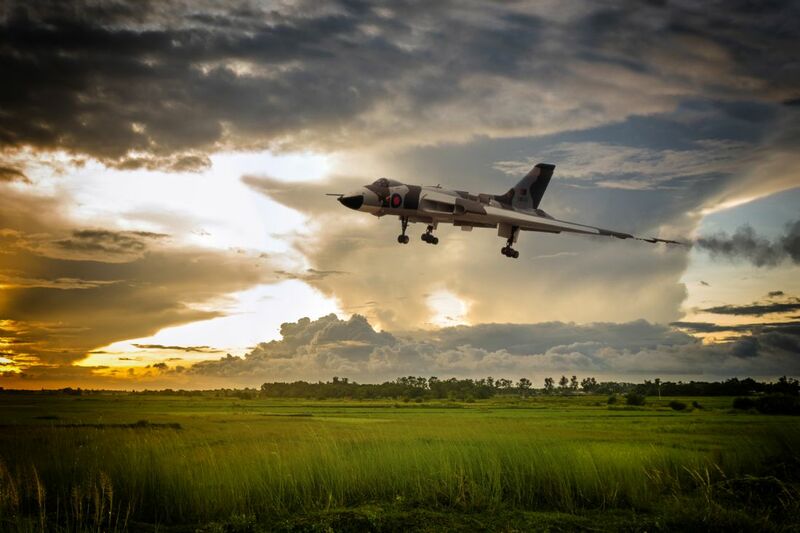 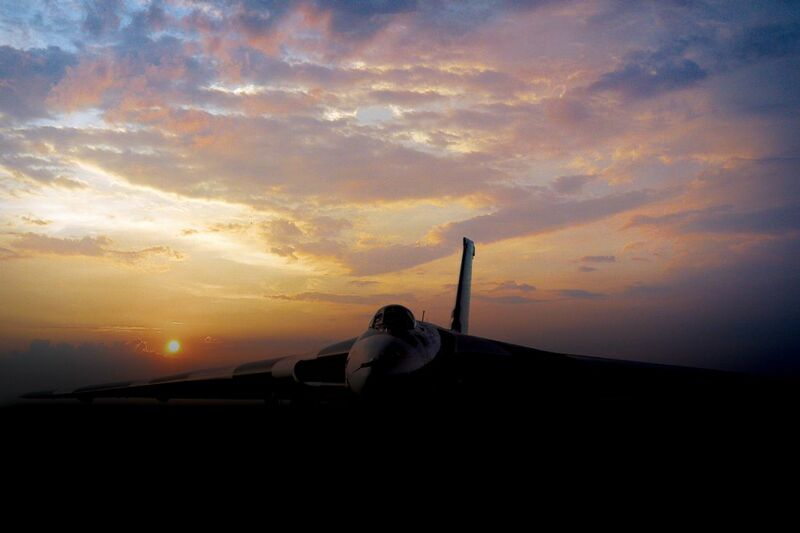 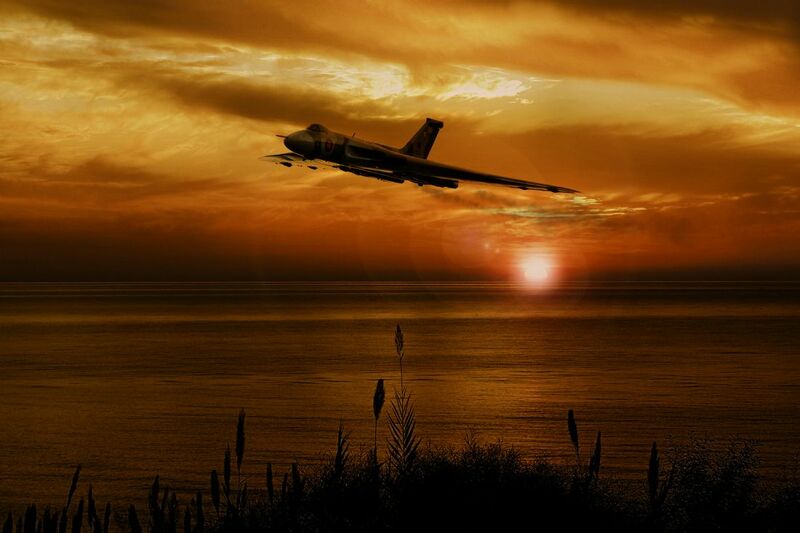 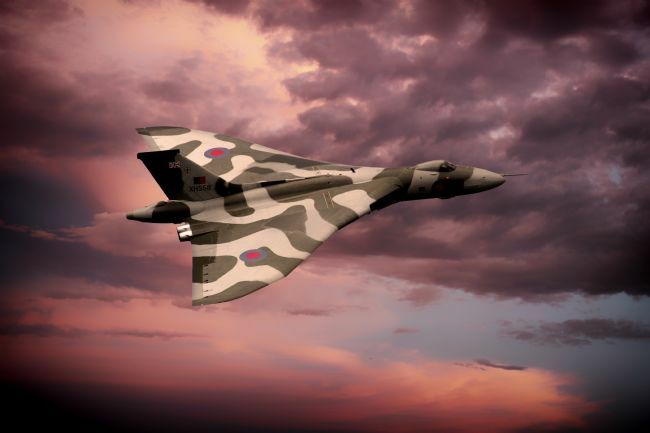 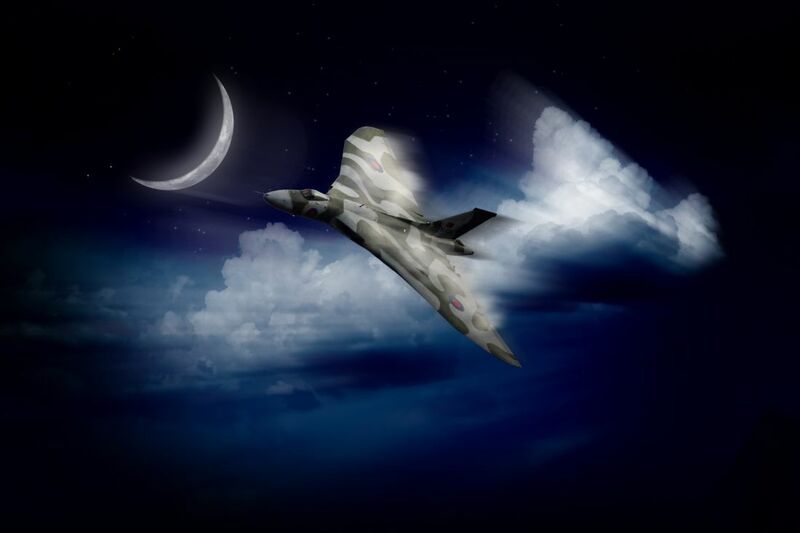 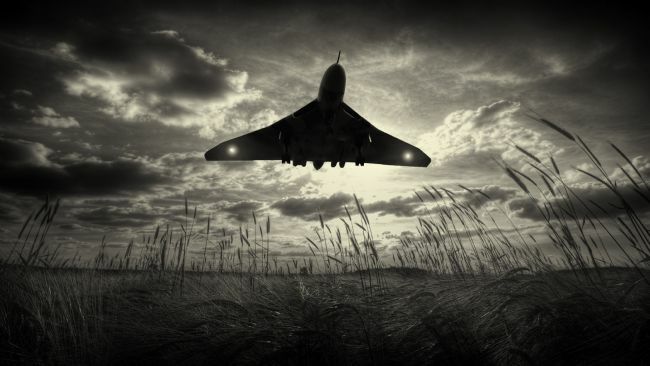 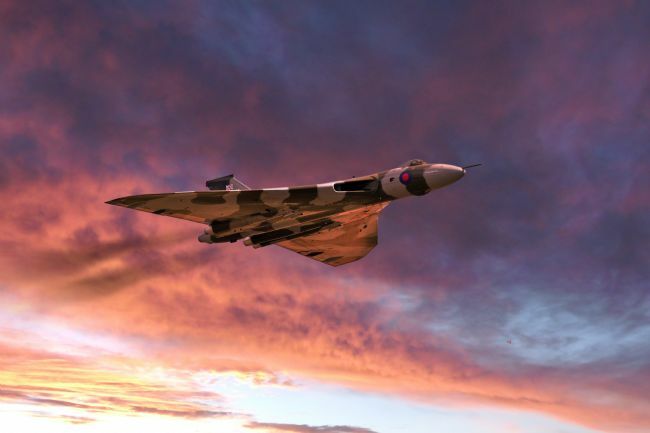 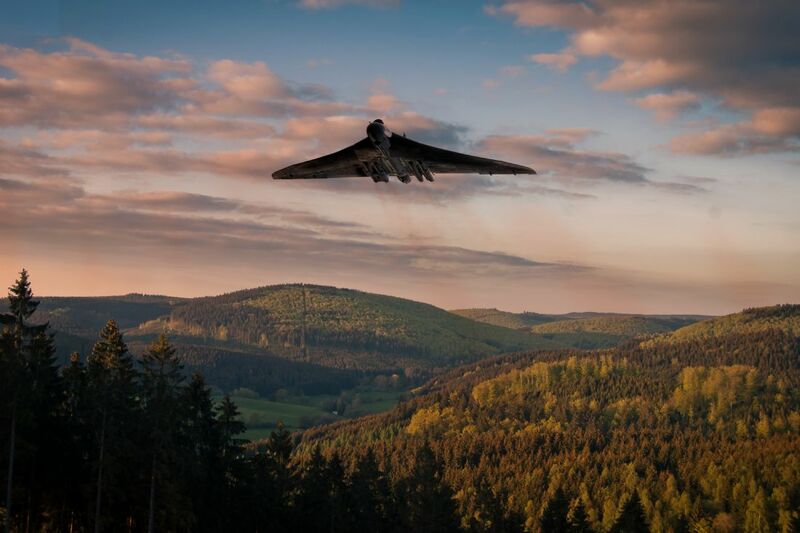 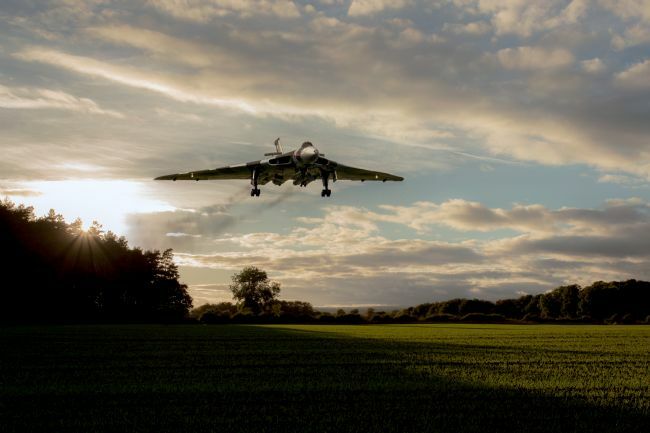 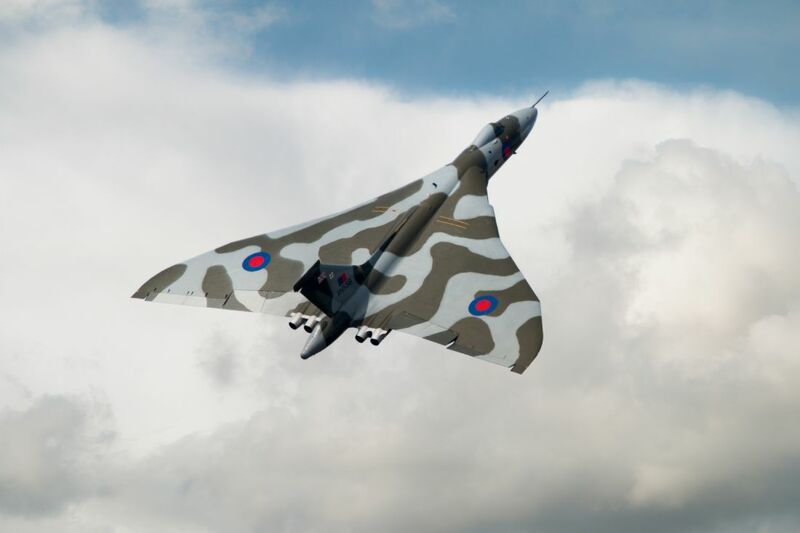 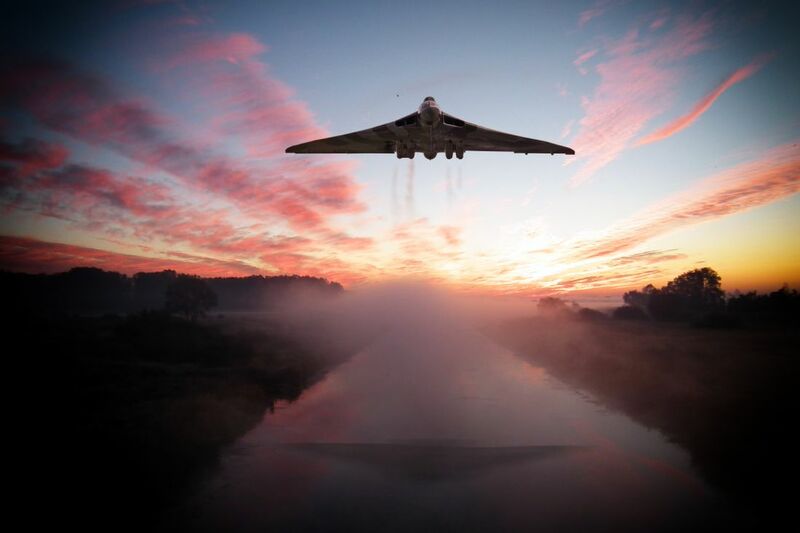 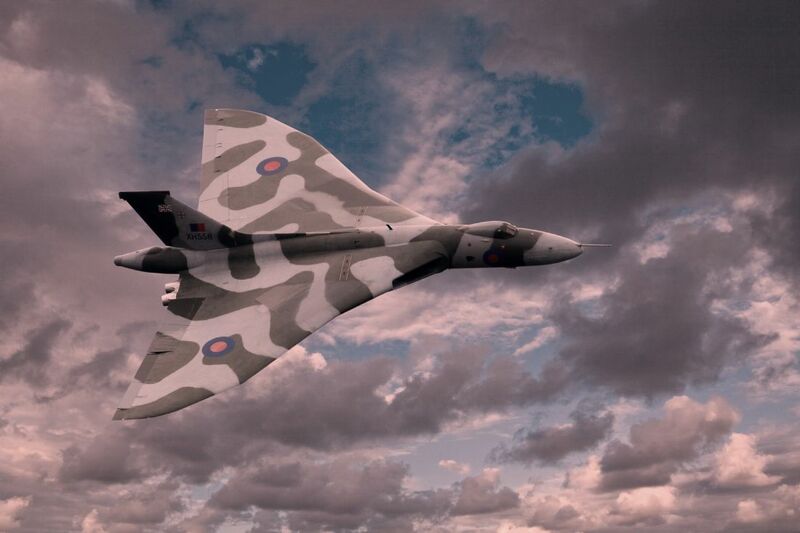 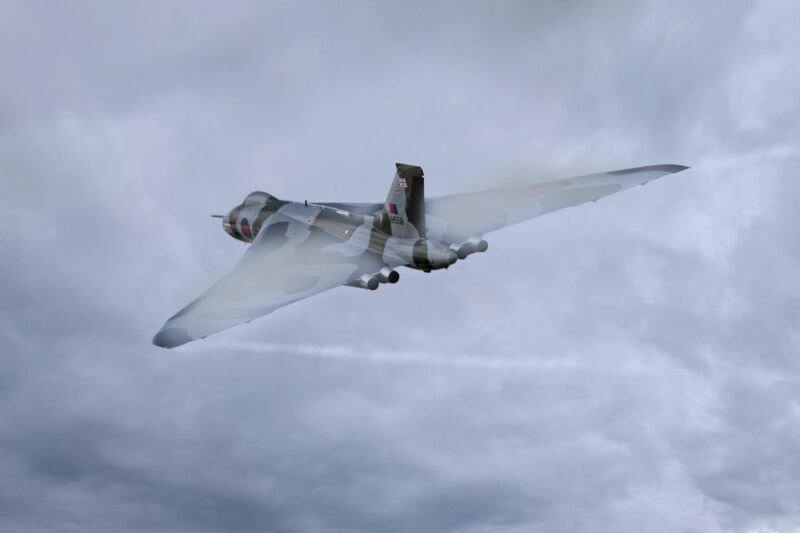 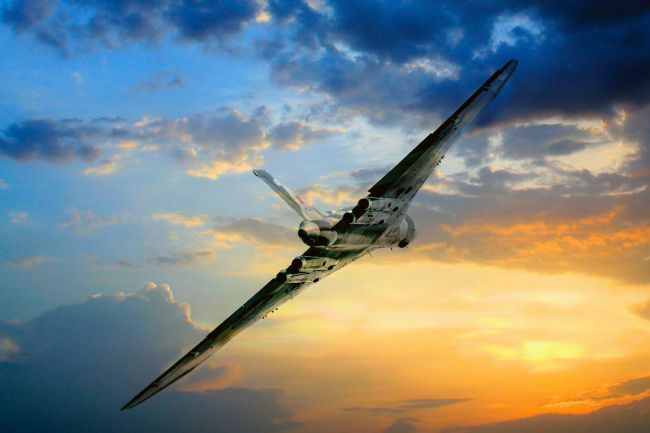 Avro Vulcan Bomber XH558 heads home as the sun starts to dip in the sky. 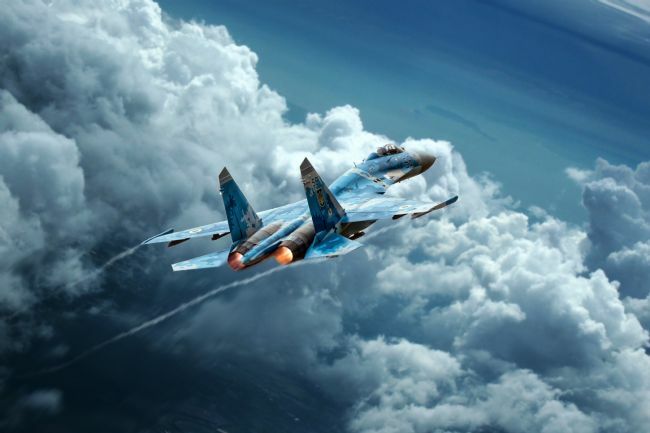 The Sukhoi Su-27 is a twin-engine supermaneuverable fighter aircraft designed by Sukhoi. 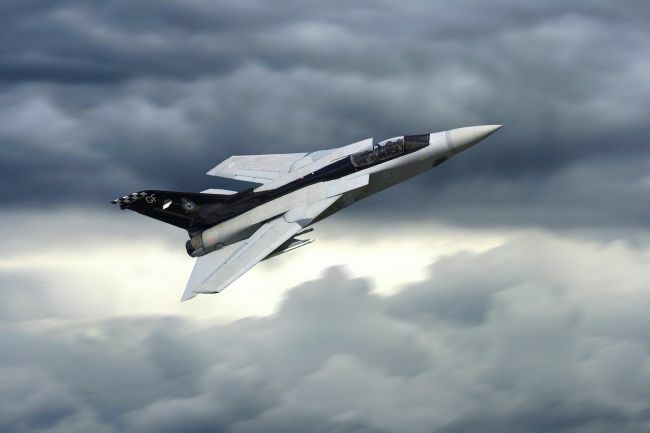 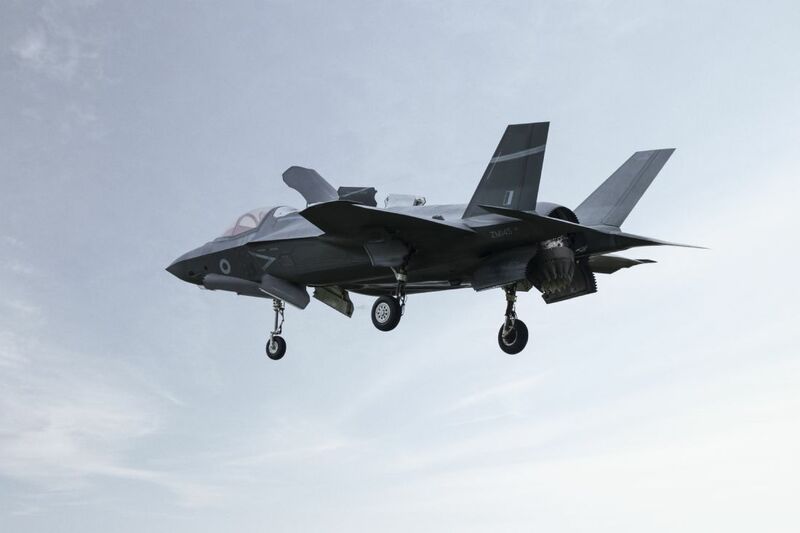 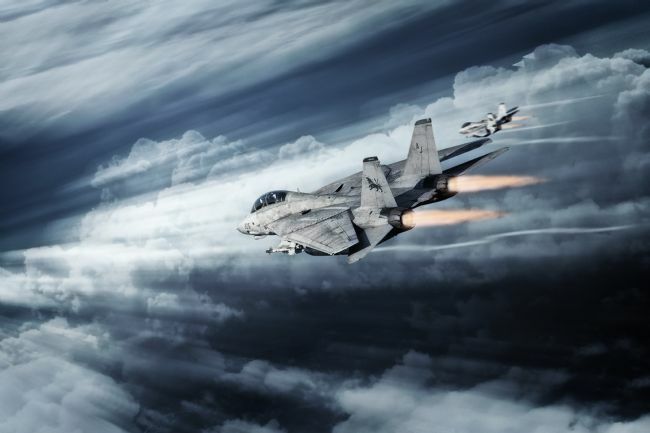 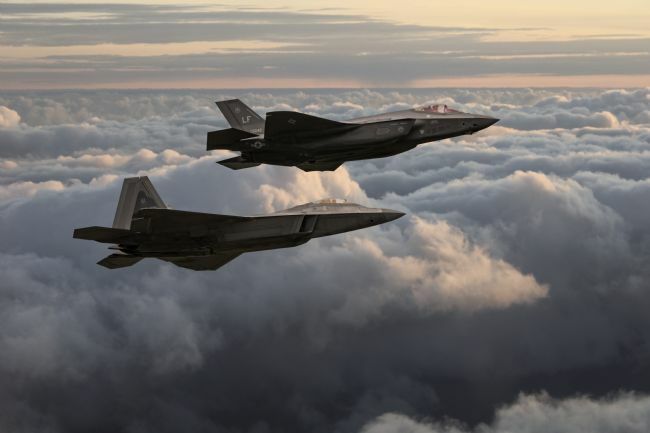 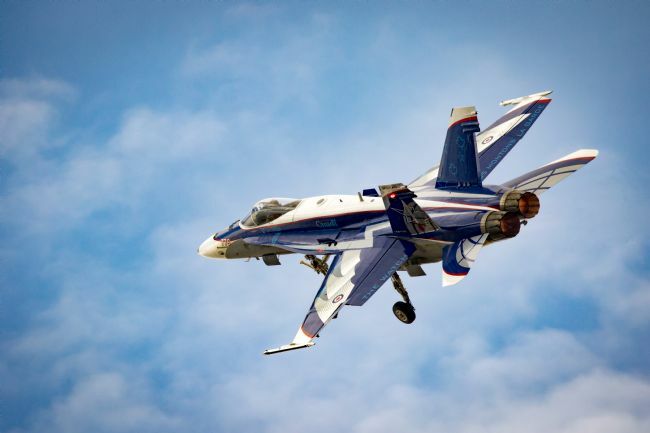 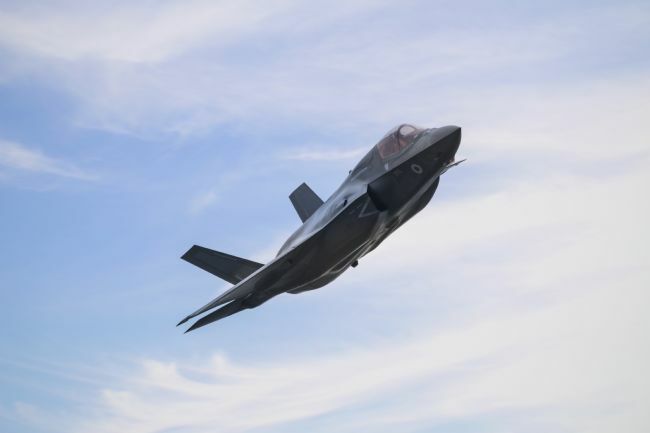 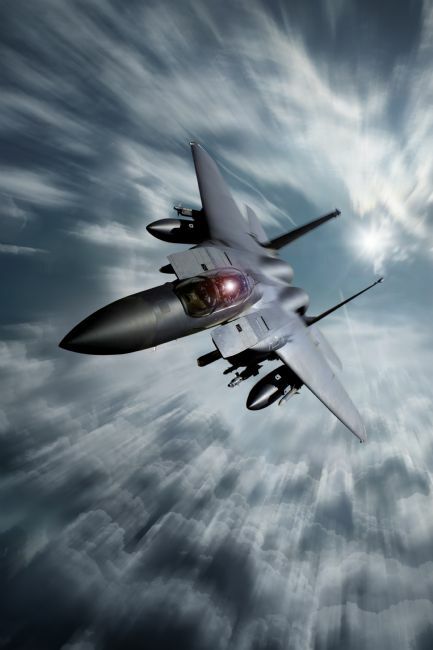 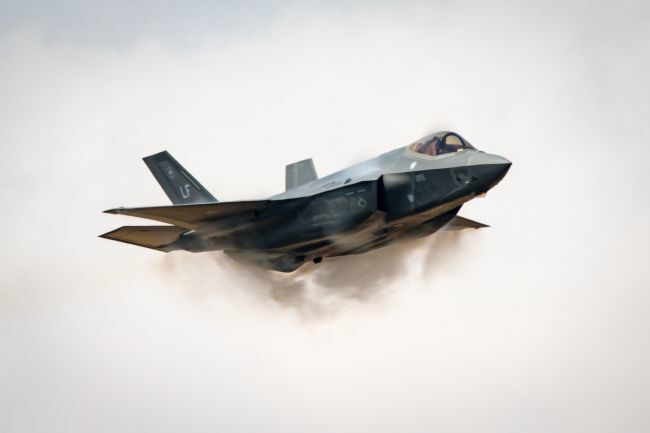 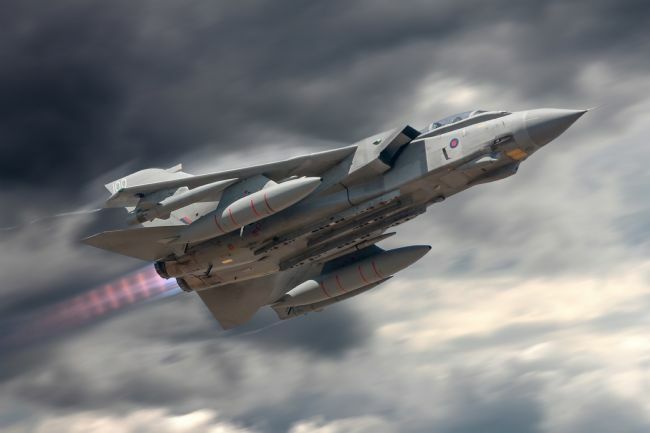 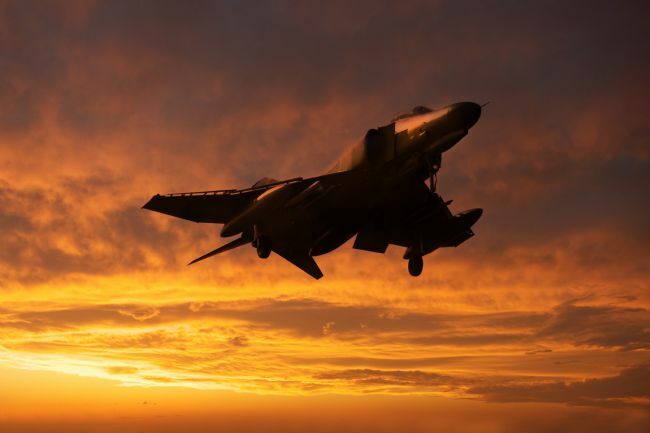 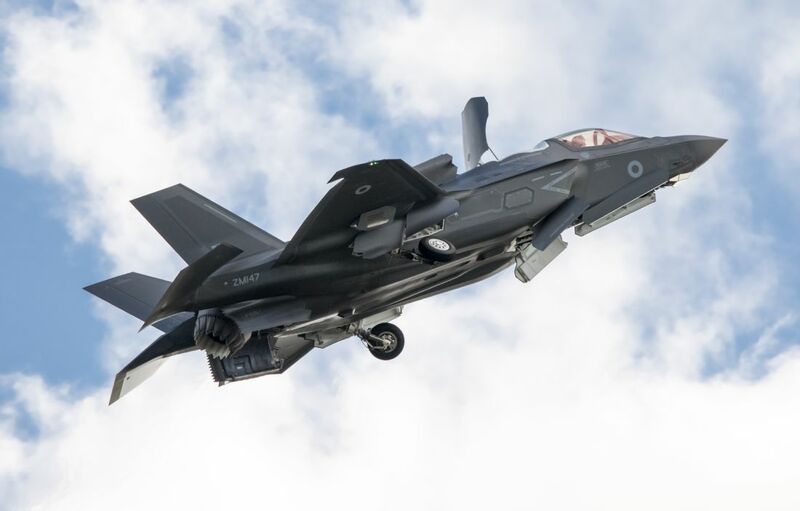 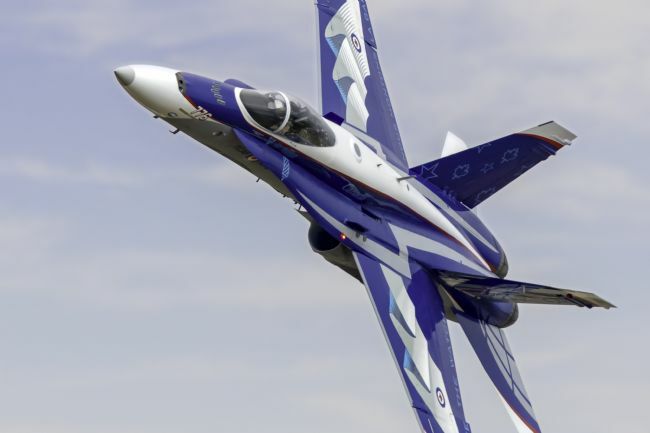 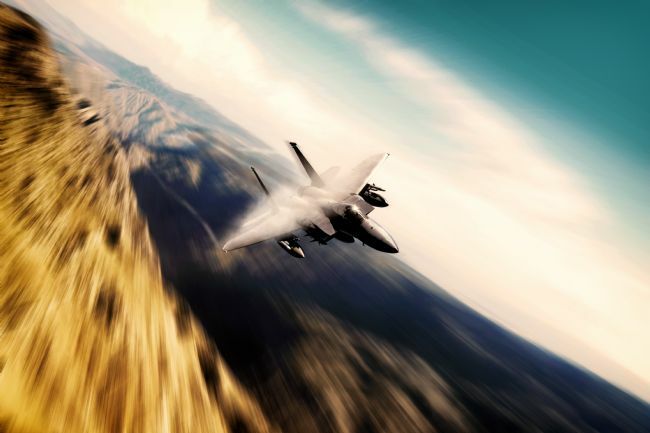 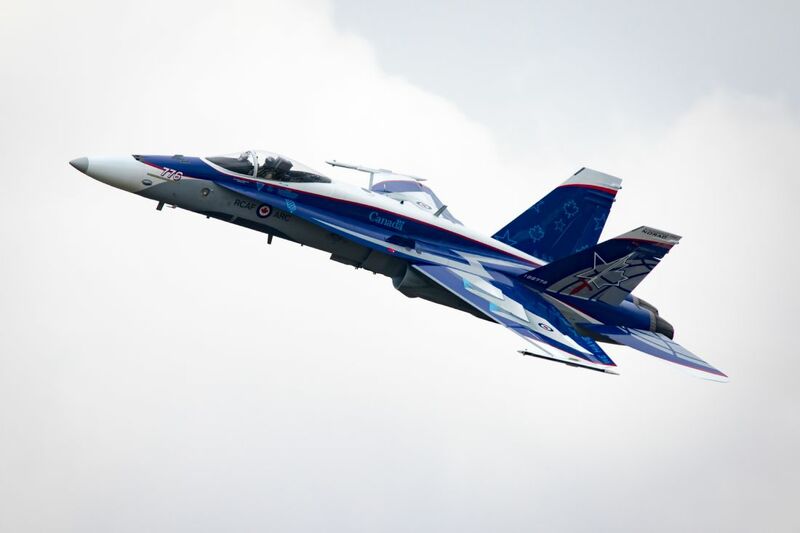 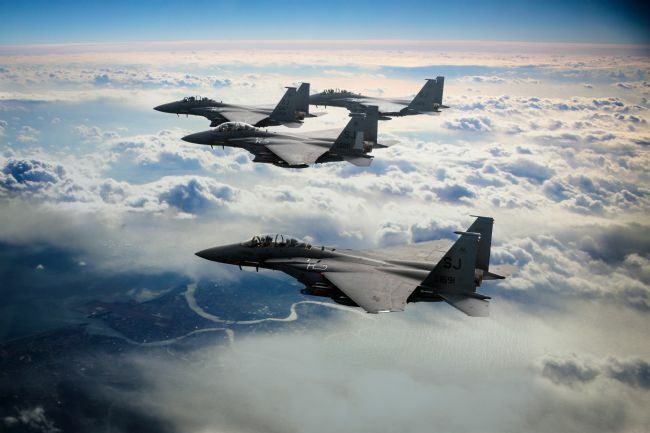 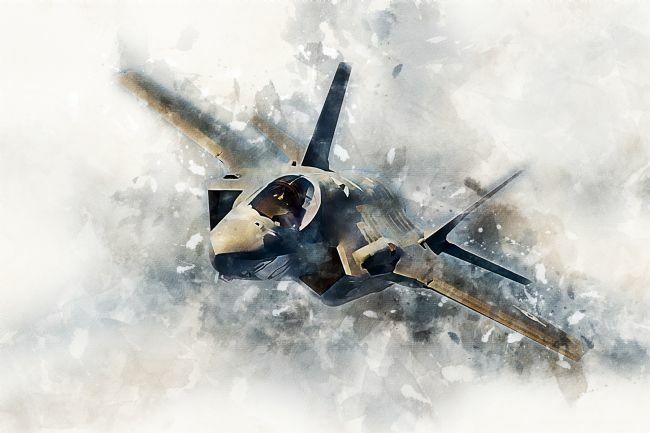 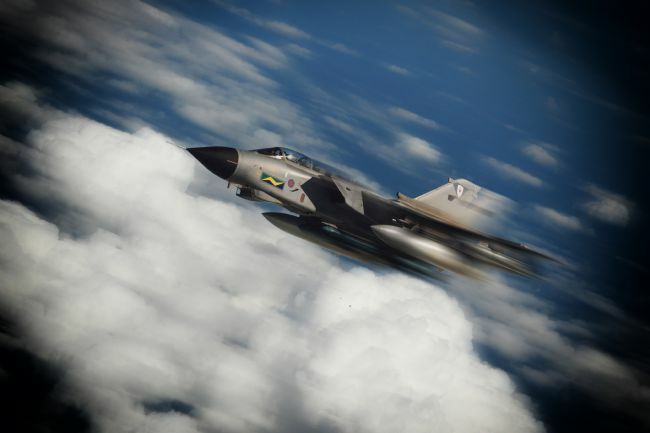 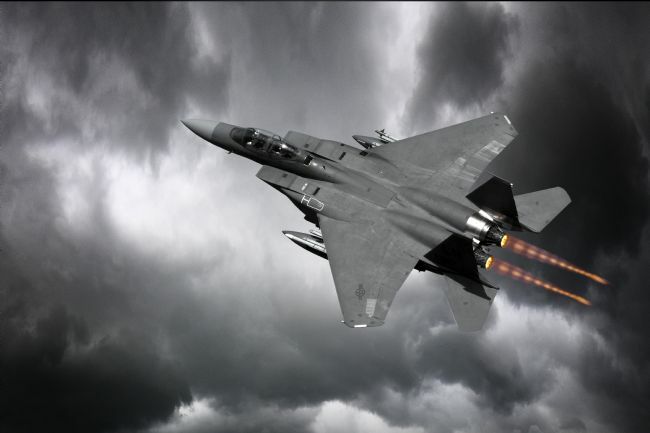 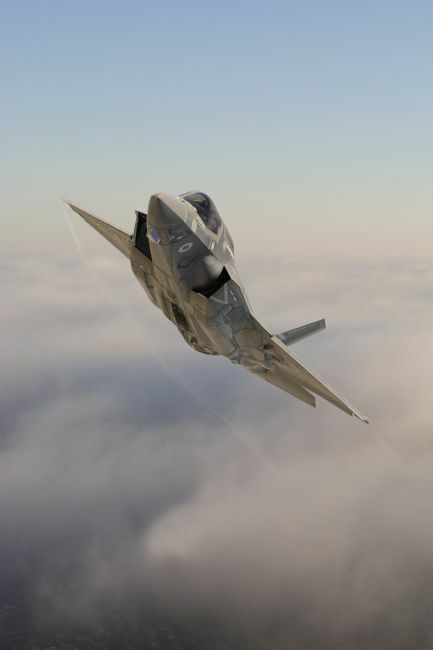 It was intended as a direct competitor for the large United States fourth-generation fighters such as the Grumman F-14 Tomcat and F-15 Eagle, with 3,530-kilometre range, heavy aircraft ordnance, sophisticated avionics and high maneuverability. 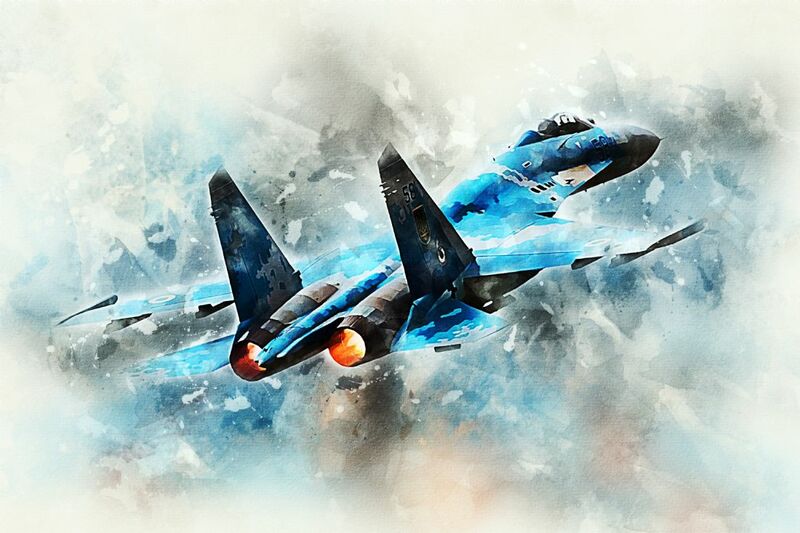 The Su-27 was designed for air superiority missions, and subsequent variants are able to perform almost all aerial warfare operations. 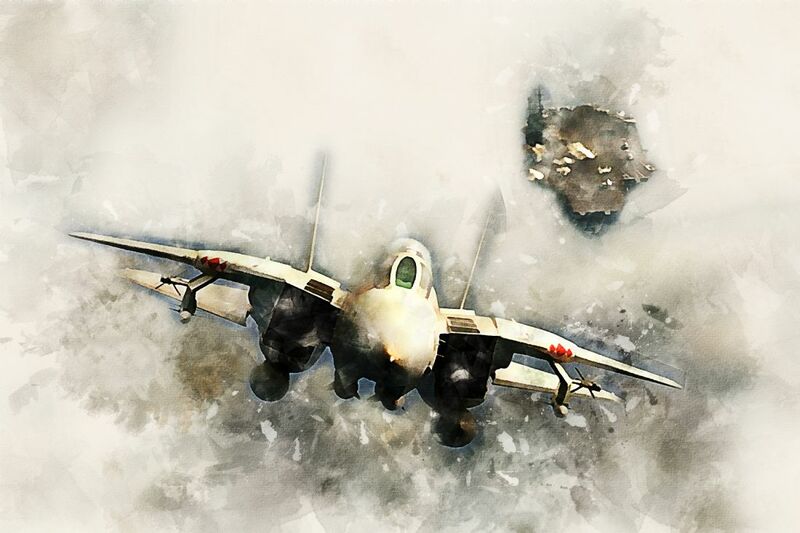 It was designed with the Mikoyan MiG-29 as its complement. 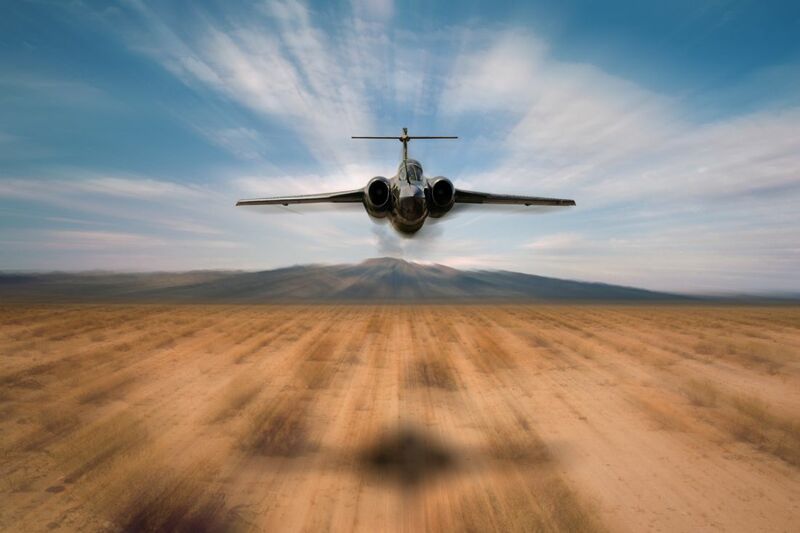 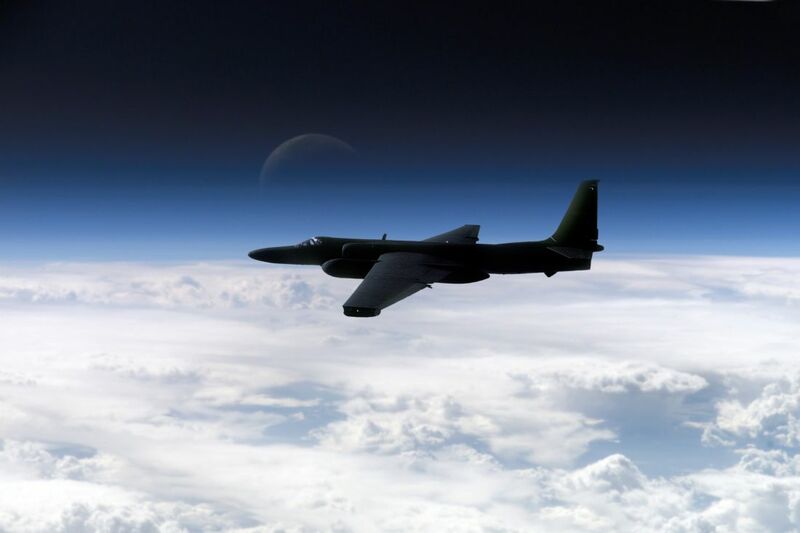 The Lockheed U-2, nicknamed Dragon Lady, is an American single-jet engine, ultra-high altitude reconnaissance aircraft operated by the United States Air Force and previously flown by the Central Intelligence Agency. 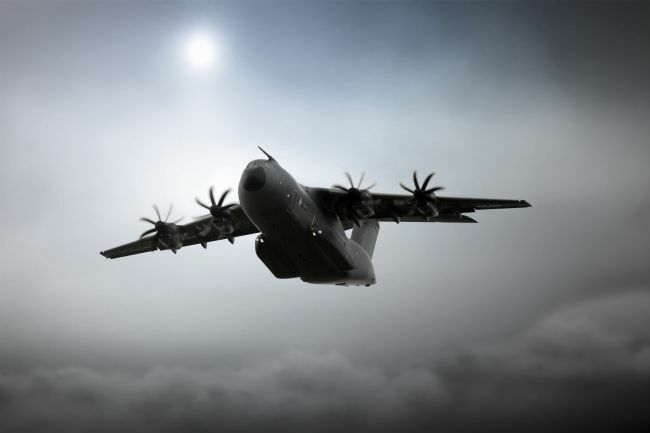 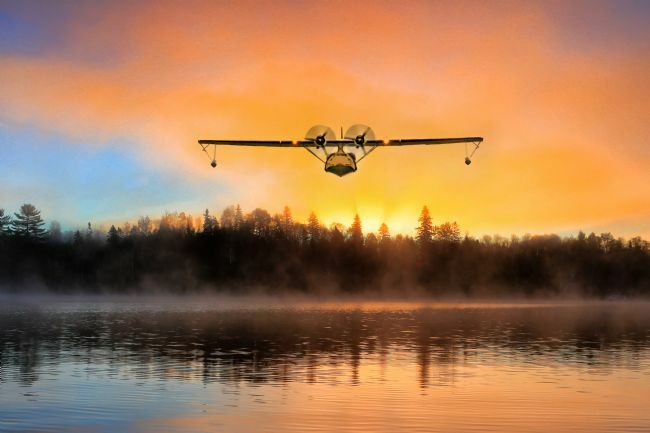 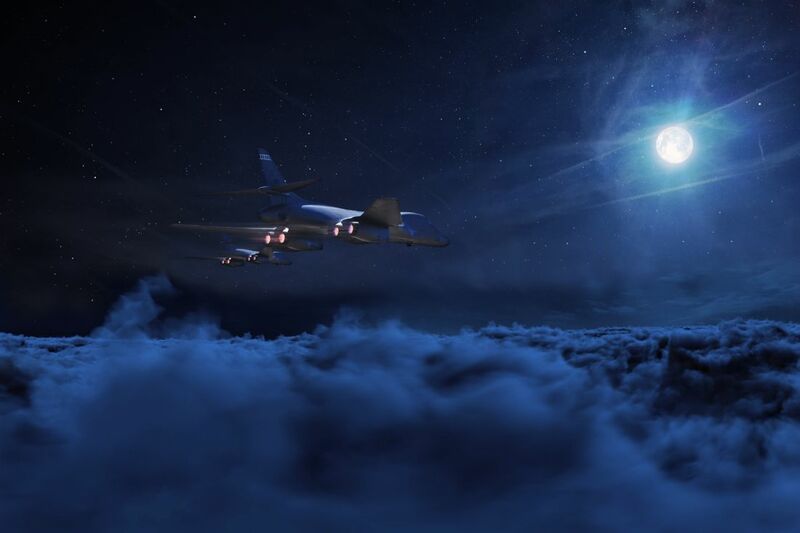 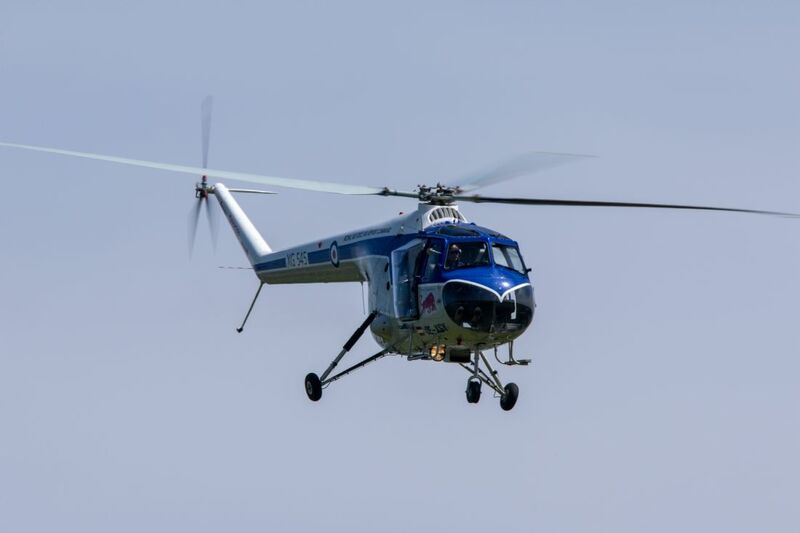 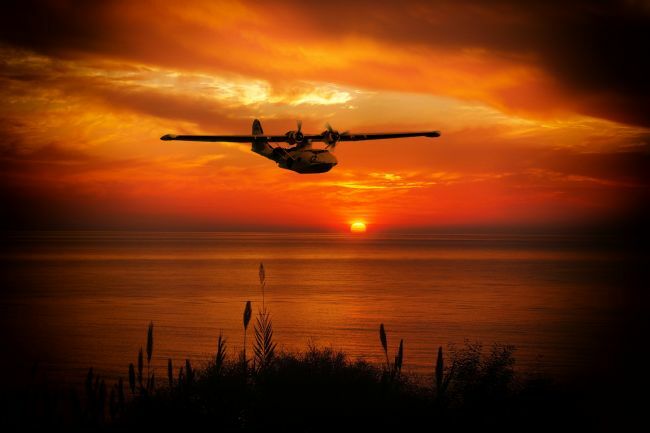 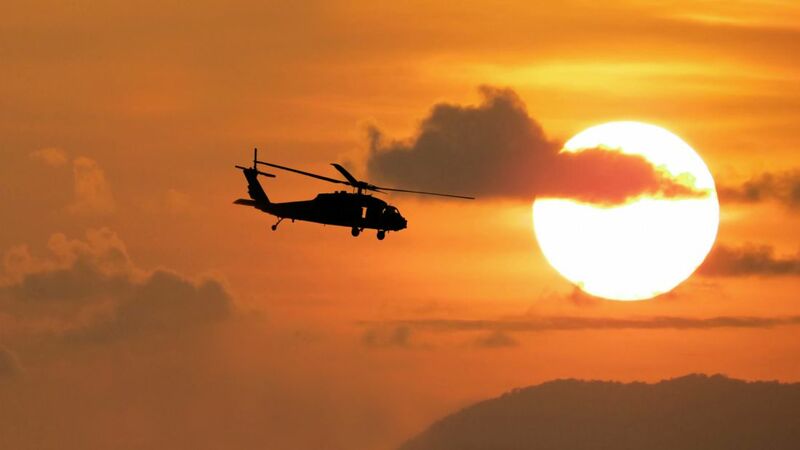 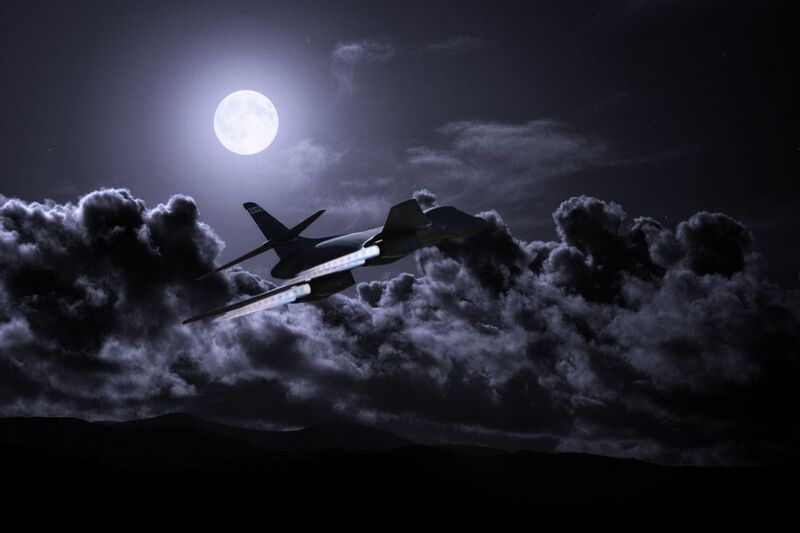 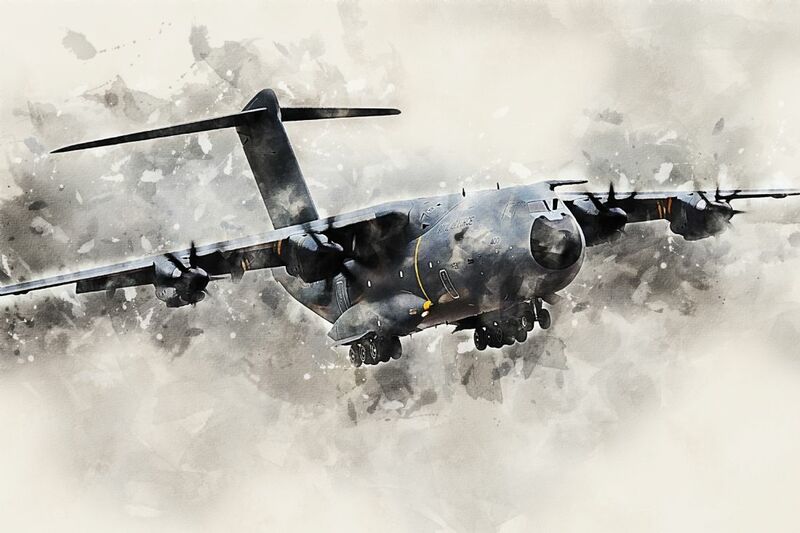 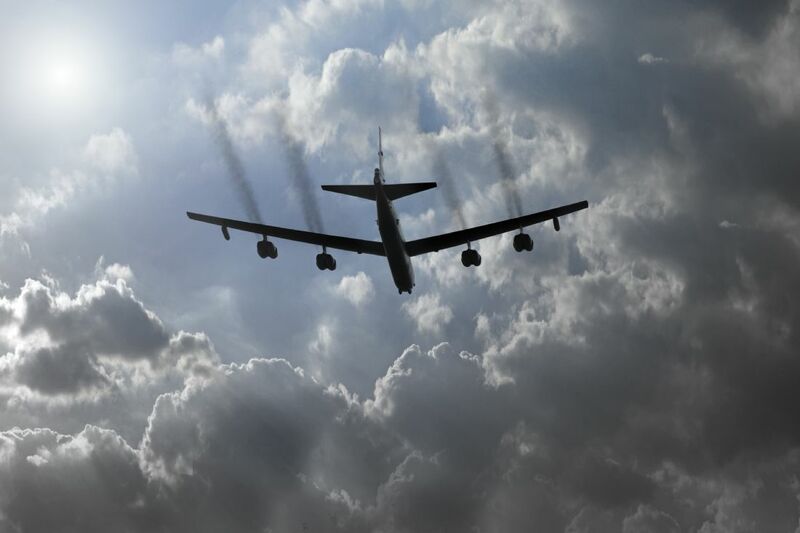 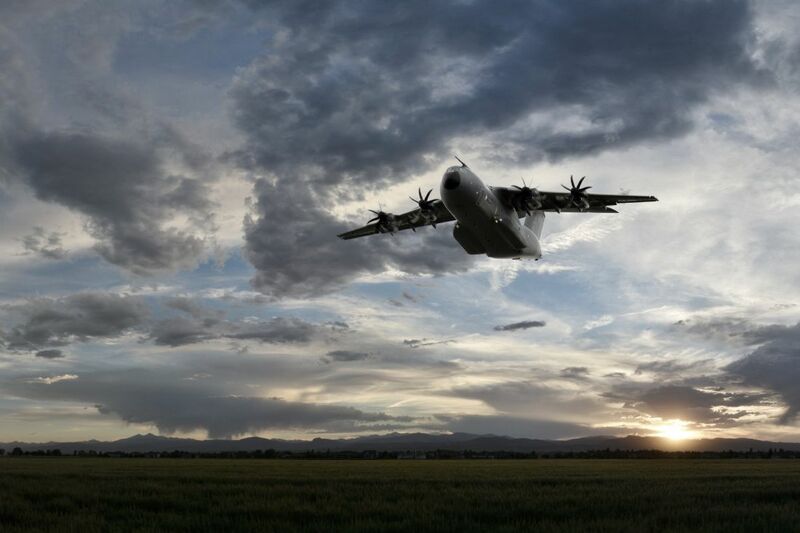 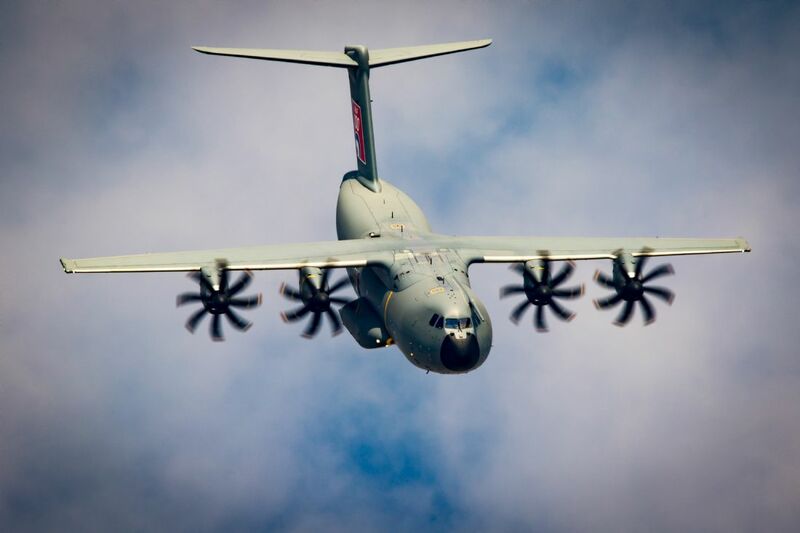 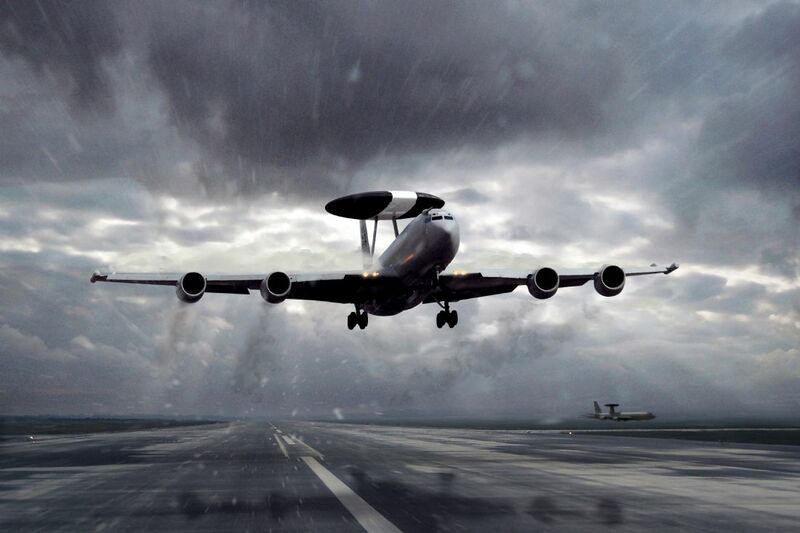 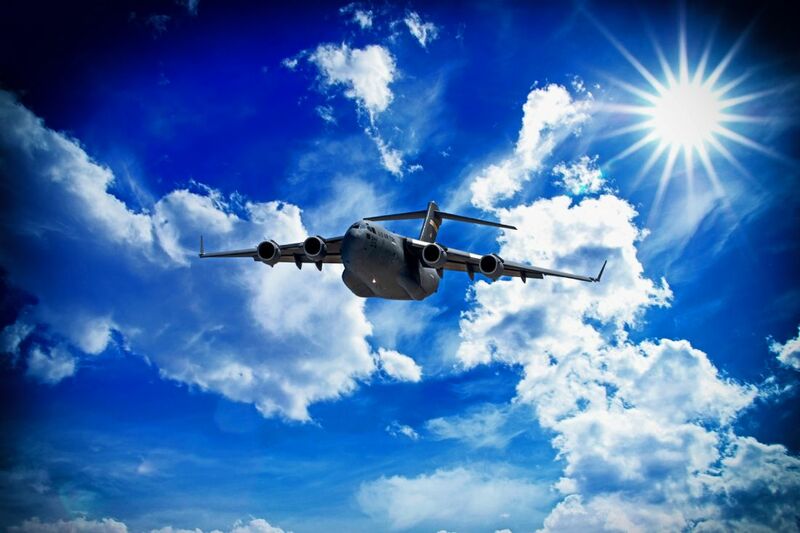 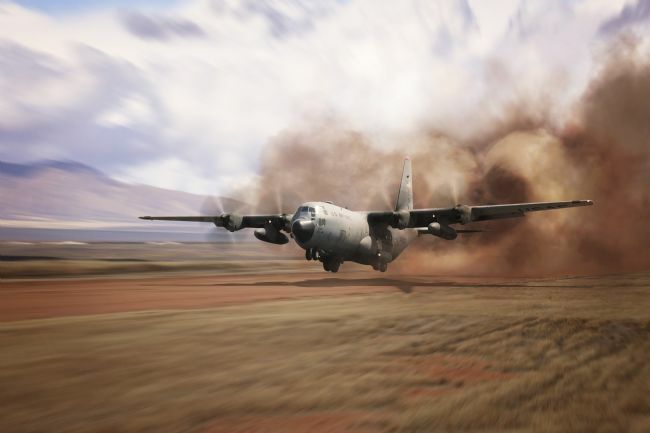 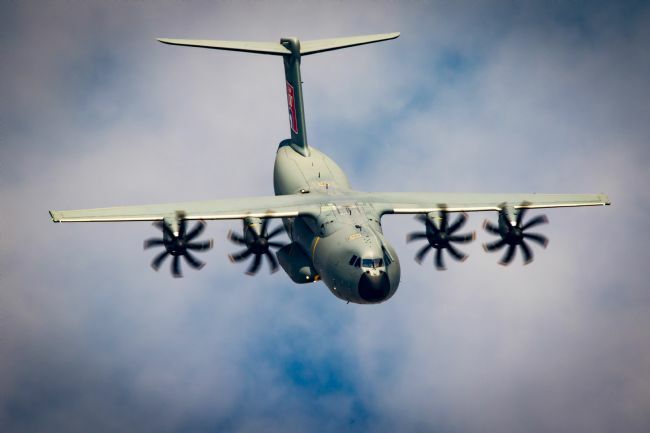 It provides day and night, high-altitude, all-weather intelligence gathering. 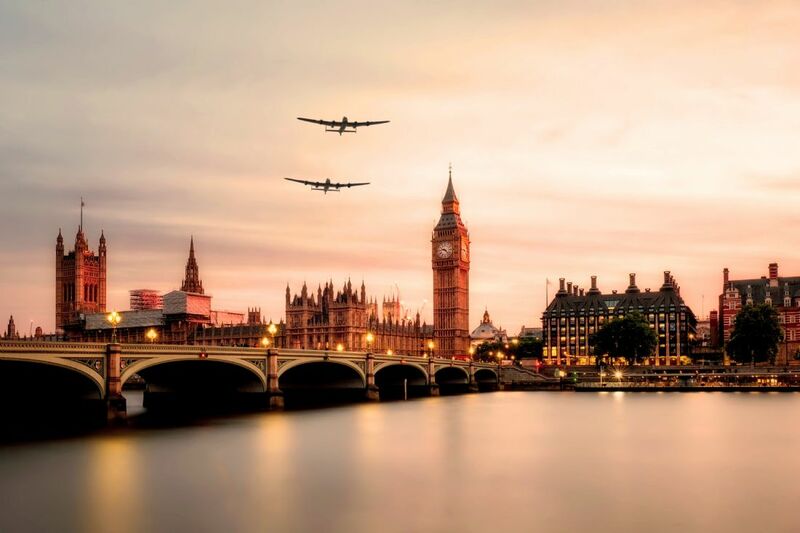 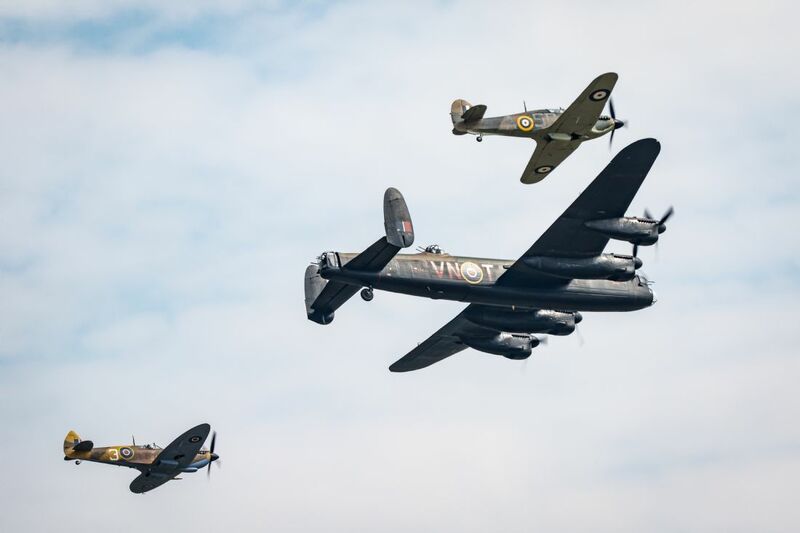 The Royal Air Force and Canadian Warplane Heritage Museum Lancaster Bombers over London. 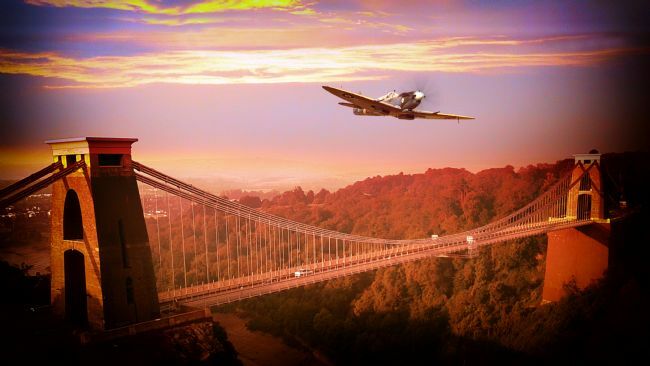 A Supermarine Spitfire passes over the famous Clifton Suspension Bridge which spans the Avon Gorge. 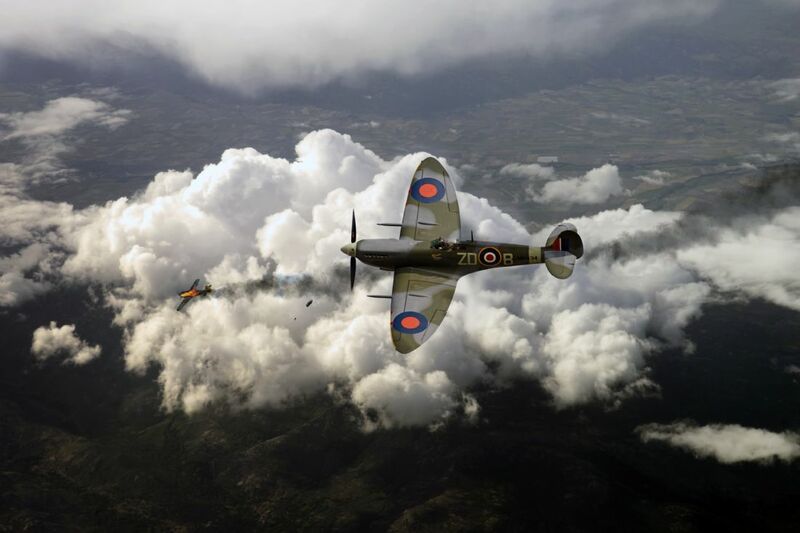 Spitfires from No. 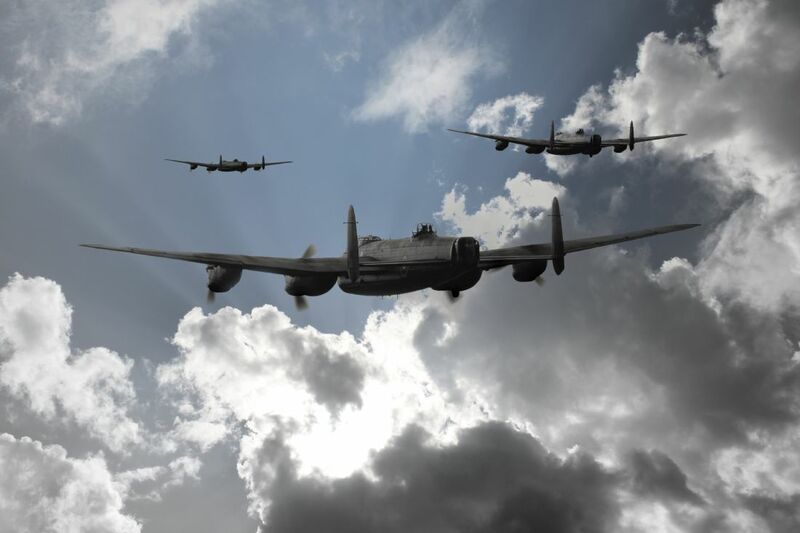 41 Squadron RAF. 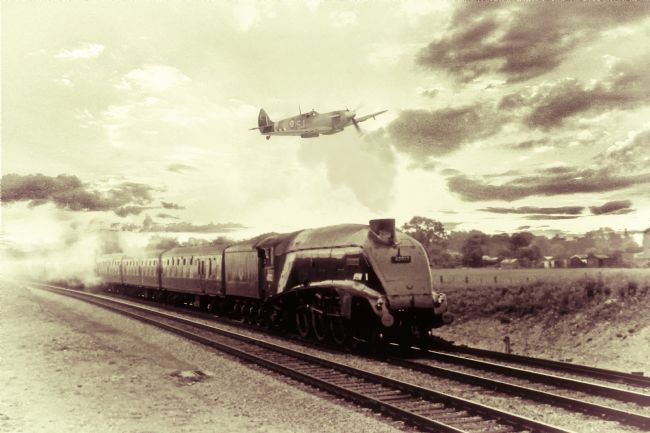 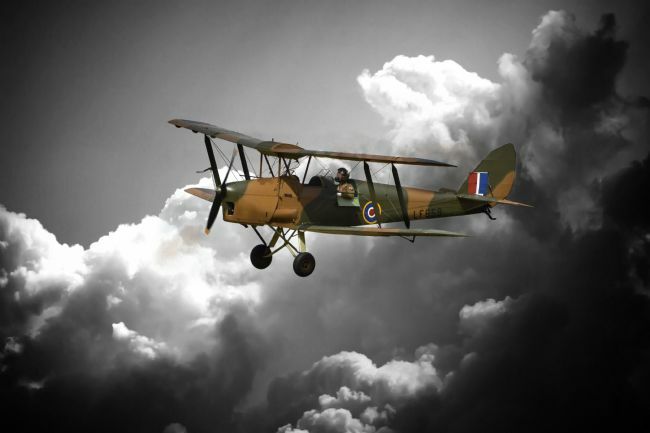 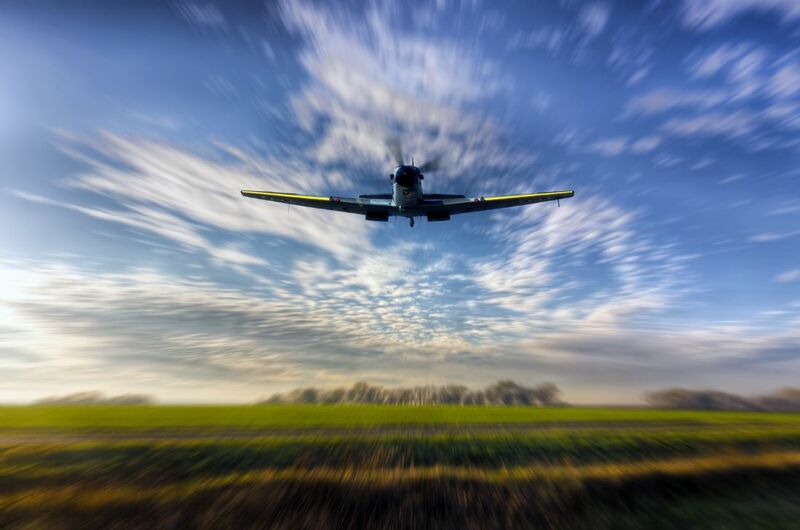 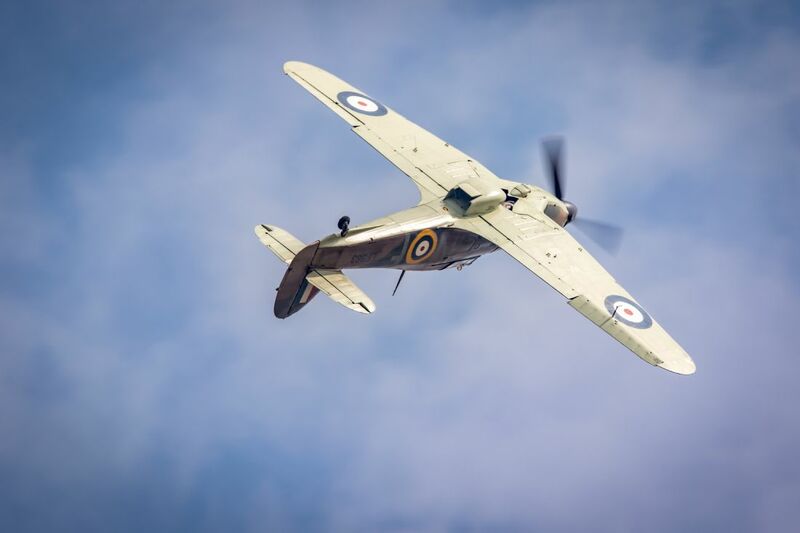 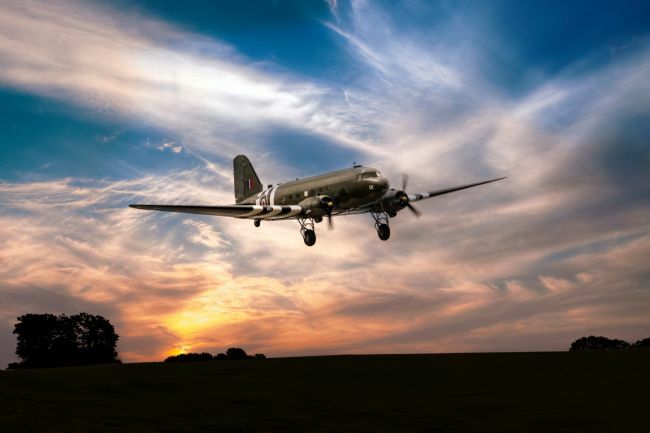 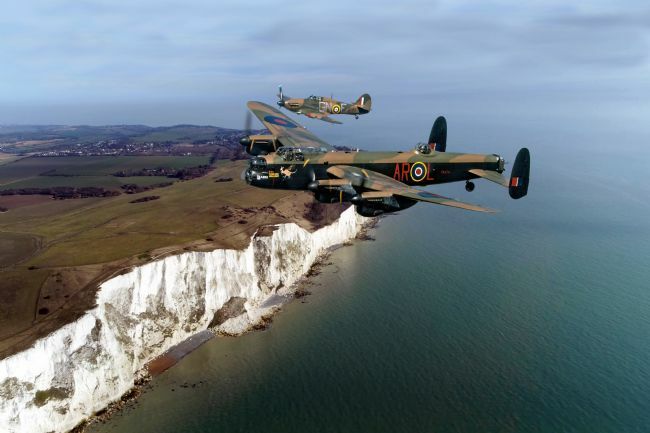 After flying defensive patrols during the first months of World War Two, No 41 moved south at the end of May 1940 to fly covering operations over the Dunkirk beaches, alternating between Yorkshire and south-east England during the Battle of Britain. 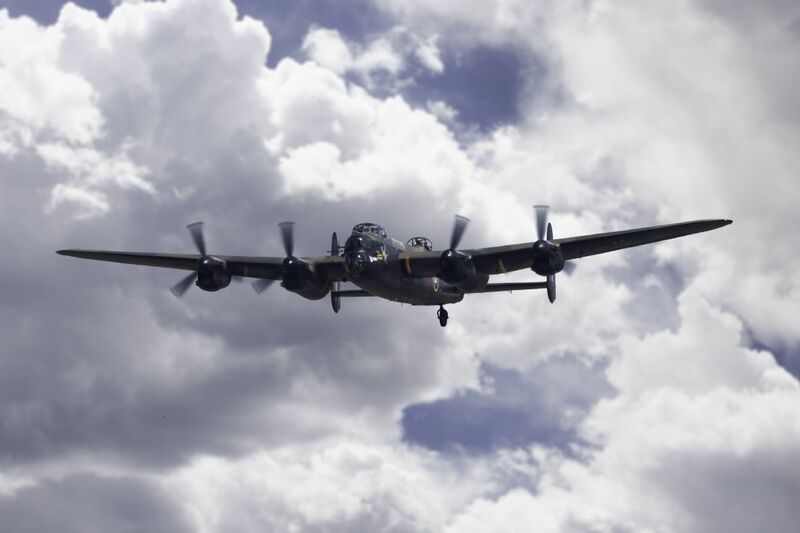 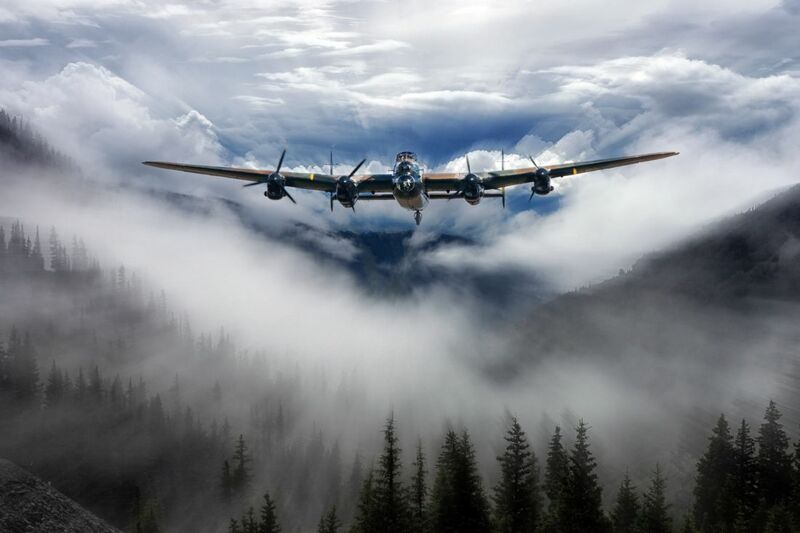 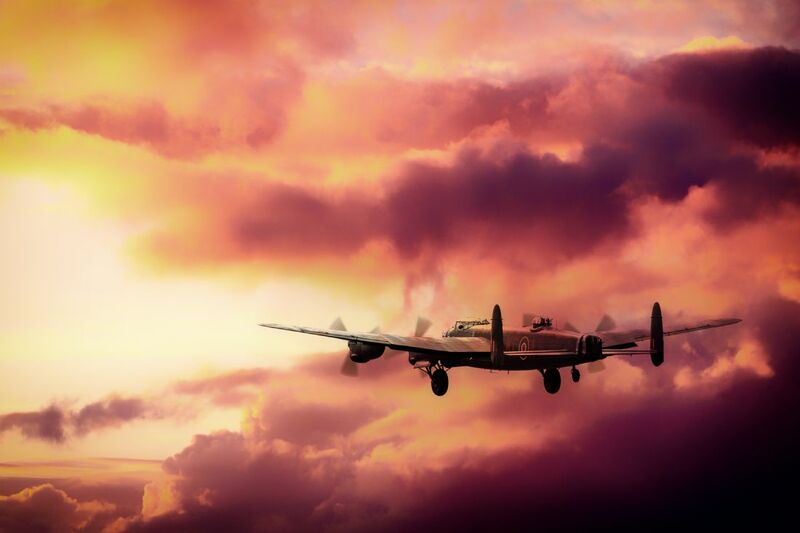 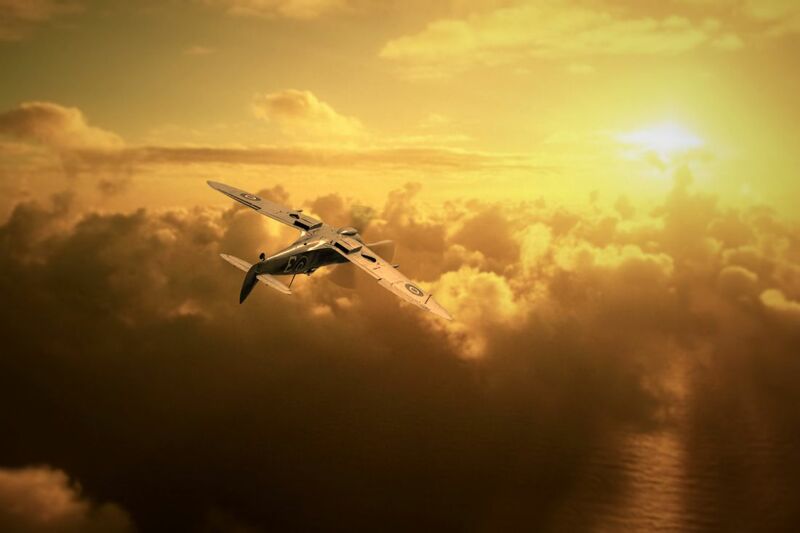 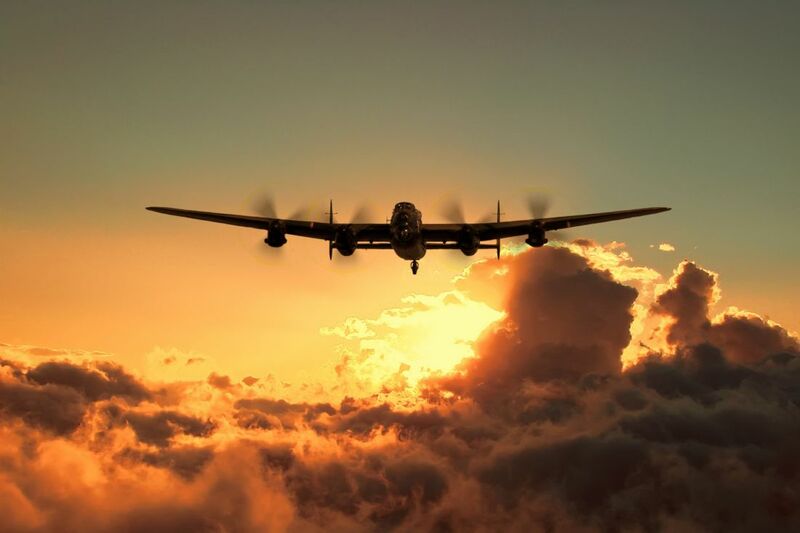 An Avro Lancaster Bomber of the Royal Air Force climbs through the clouds. 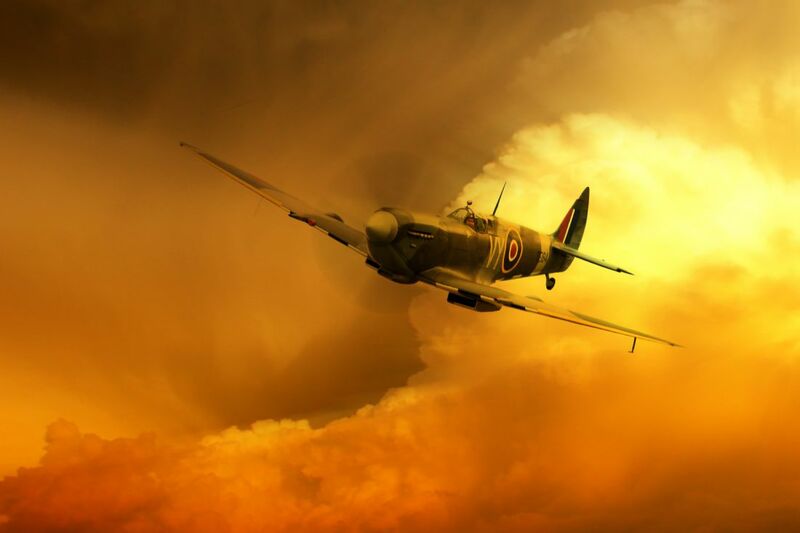 Hawker Hurricane clims in to the heavens. 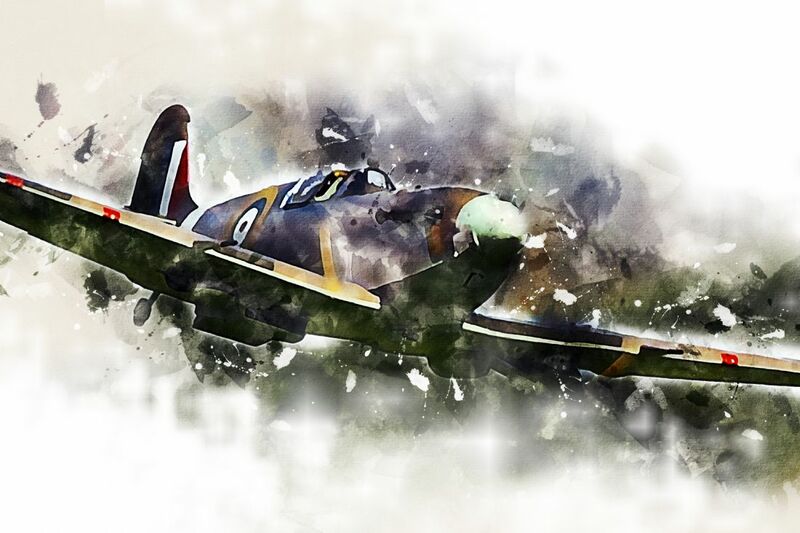 RAF Battle of Britain Hurricane. 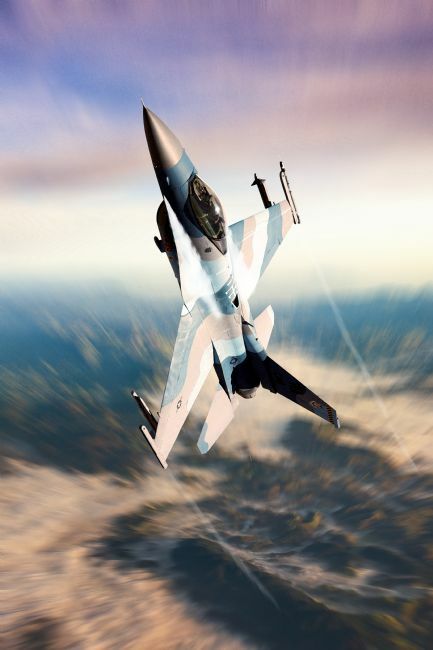 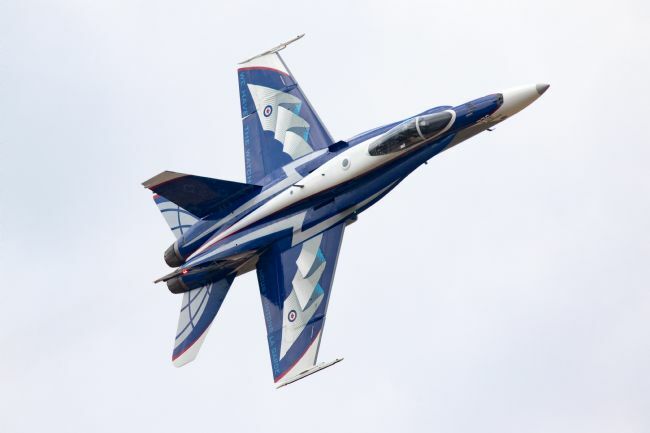 A USAF F-16C aggressor aircraft - the camouflage scheme emulates Soviet markings with multiple shades of blue and gray. 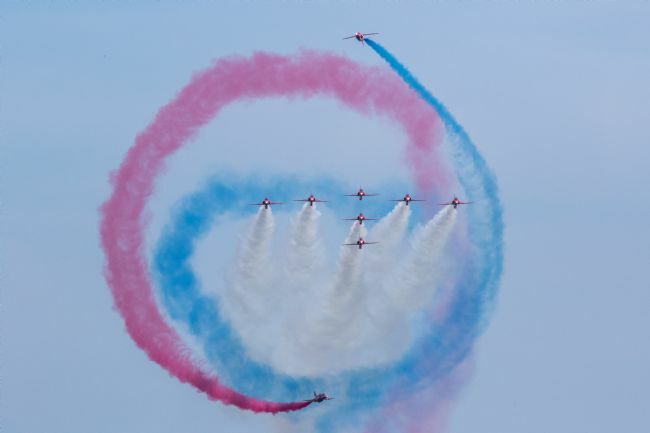 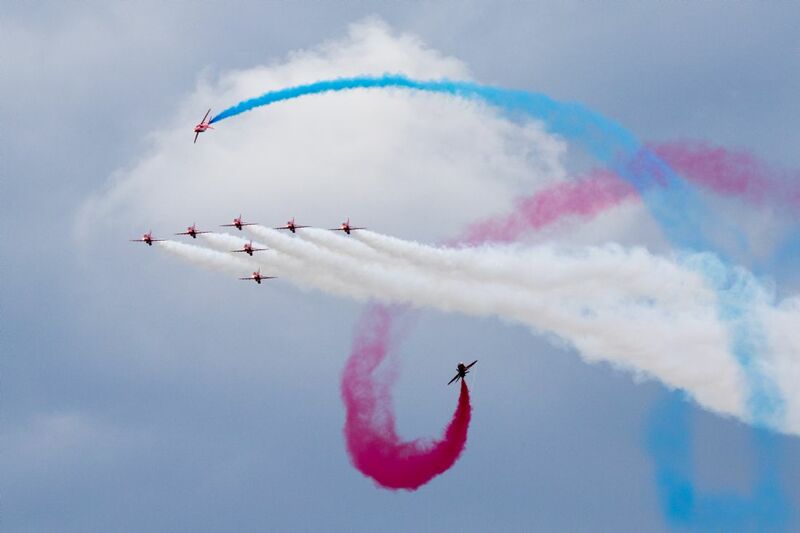 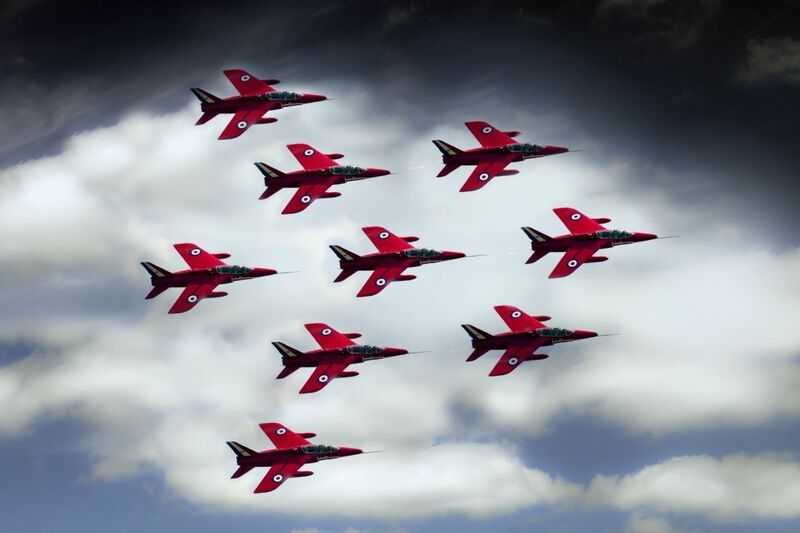 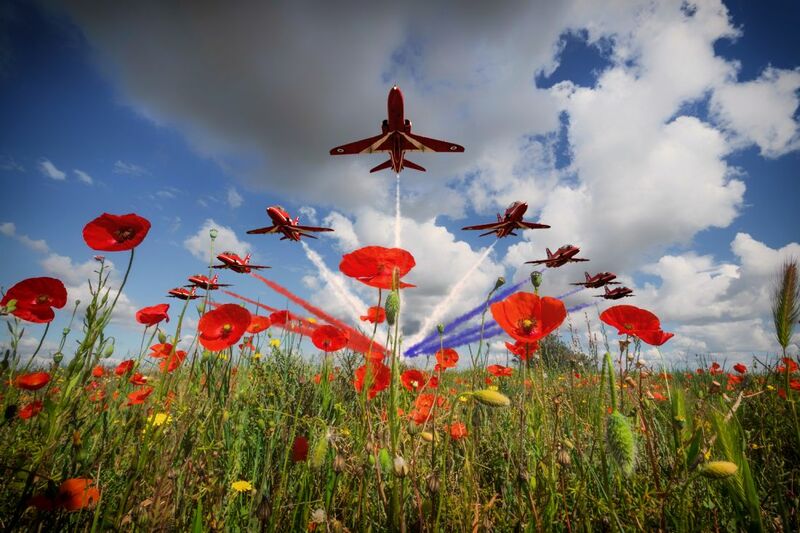 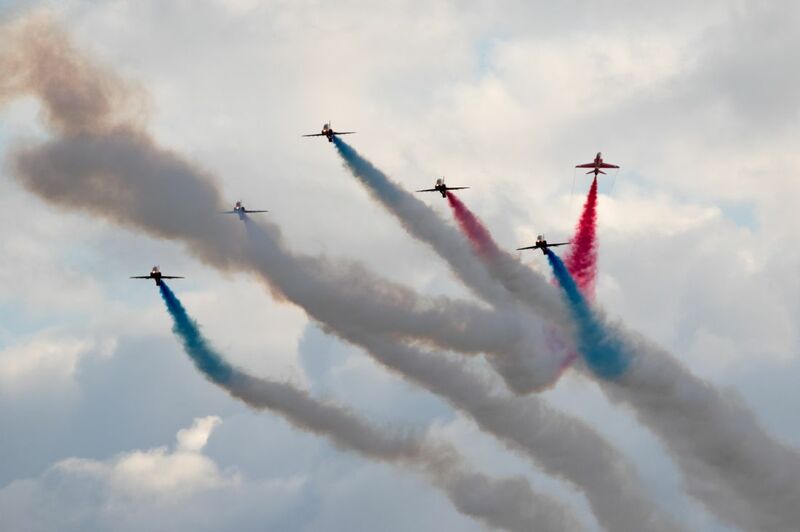 The Royal Air Force Display Team, The Red Arrows over a field of poppies. 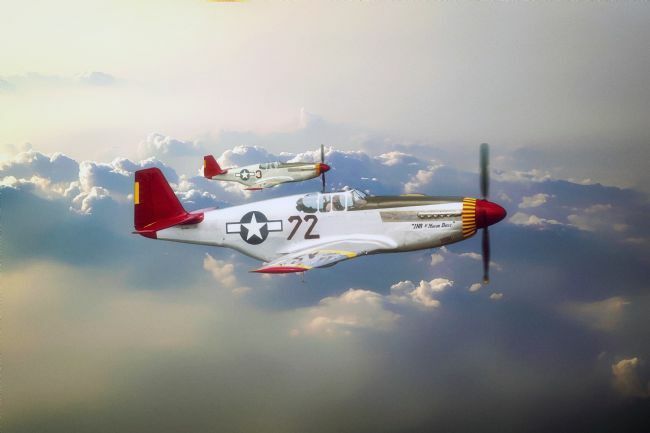 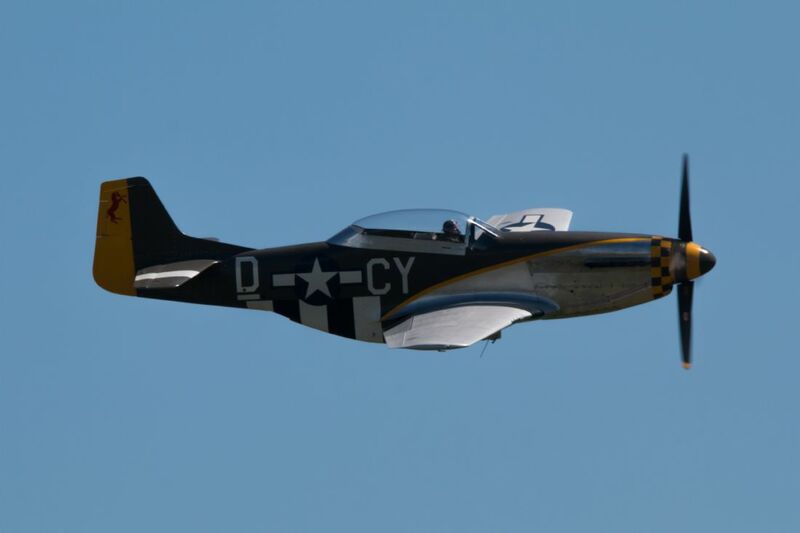 “Ina the Macon Belle” was the personal P-51C Mustang of Lt. Lee A. Archer. 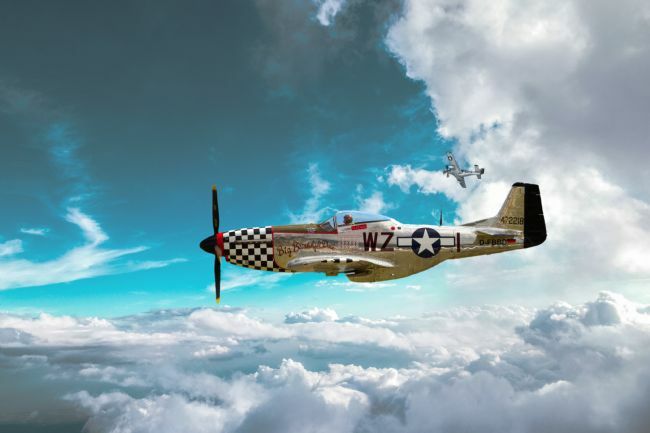 He was a member of the famous Tuskegee Airmen of the 302nd Fighter Squadron, 332nd Fighter Group and would become the group’s leading ace. 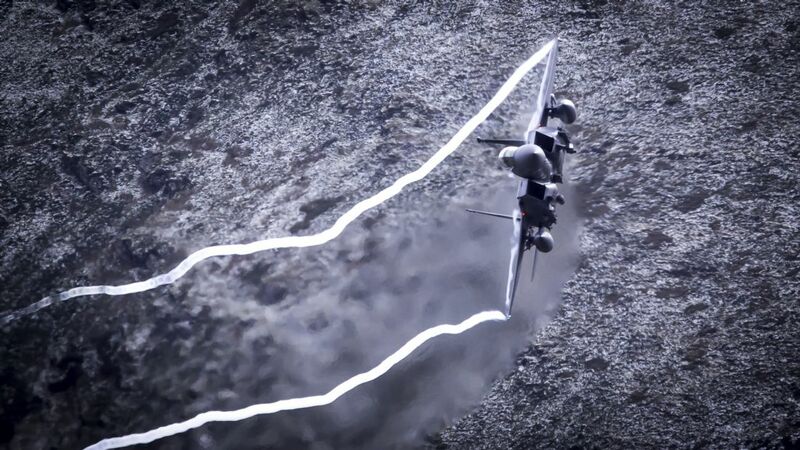 USAFE F-15 Eagle low level through the Mach Loop, Wales. 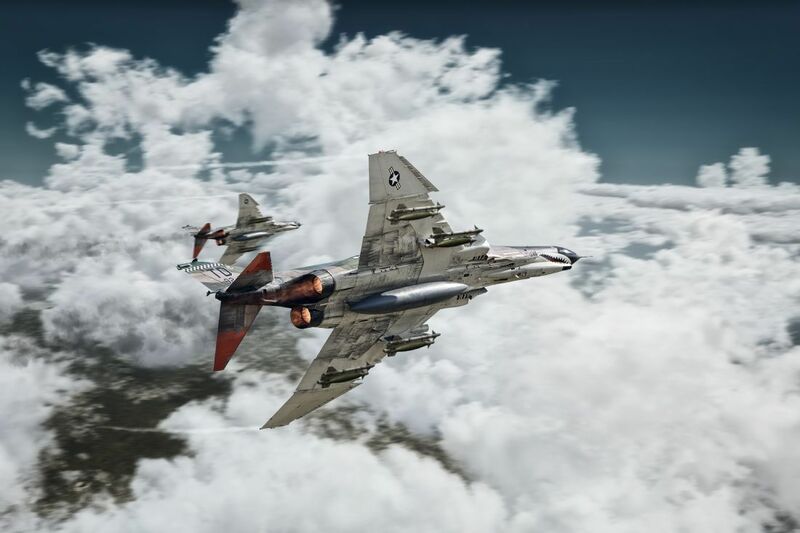 Grumman F-14 Tomcats from VF-74, Fighter Squadron 74, The Be-Devilers. 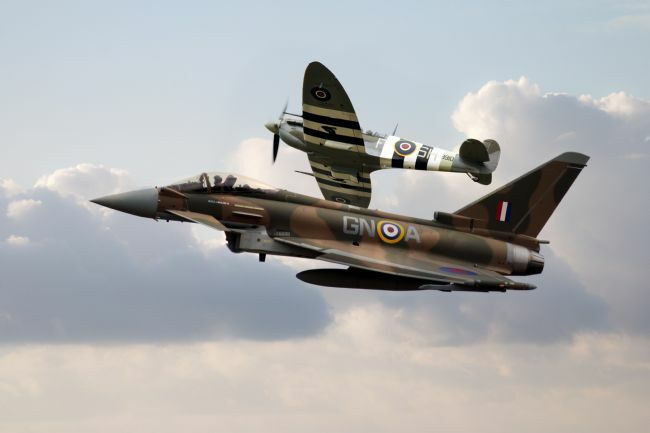 Composite image. 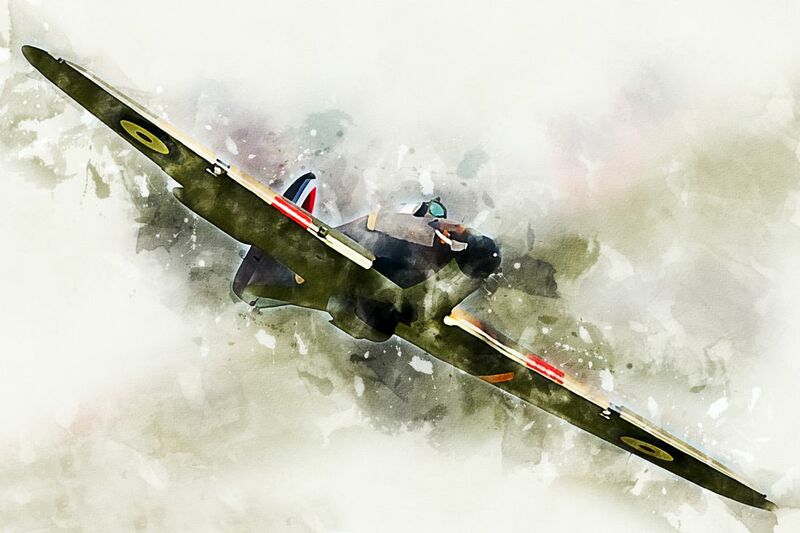 Created entirely from images in the public domain. 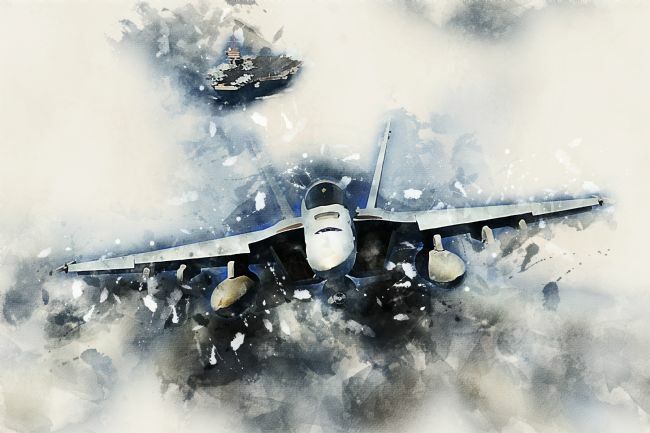 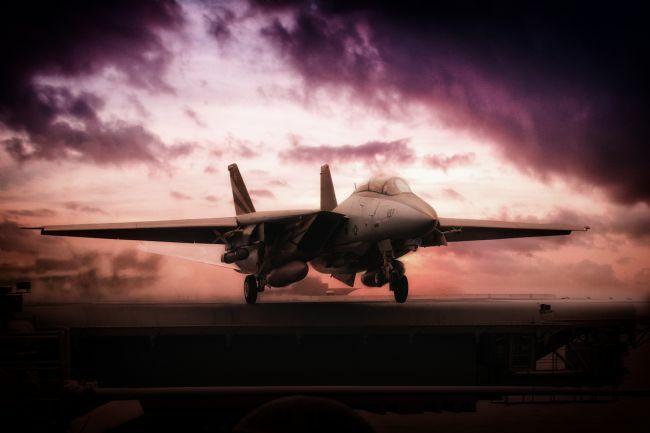 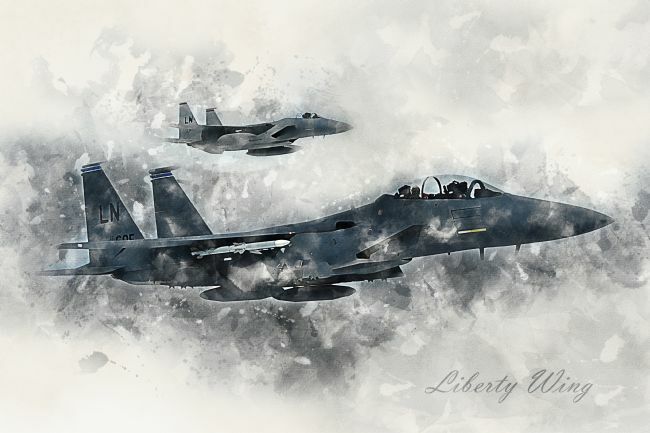 Digital painting of a Grumman F-14 Tomcat and a F-18 Hornet on the carrier deck. 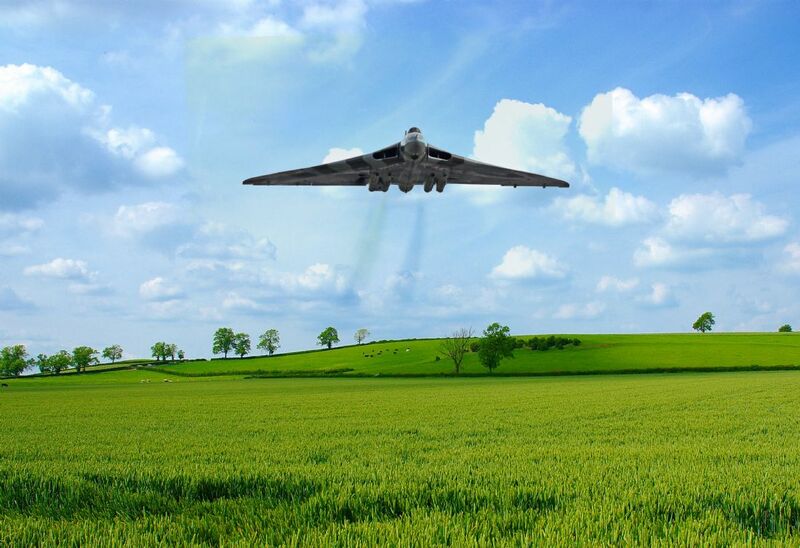 Based on an imaged in the Public Domain. 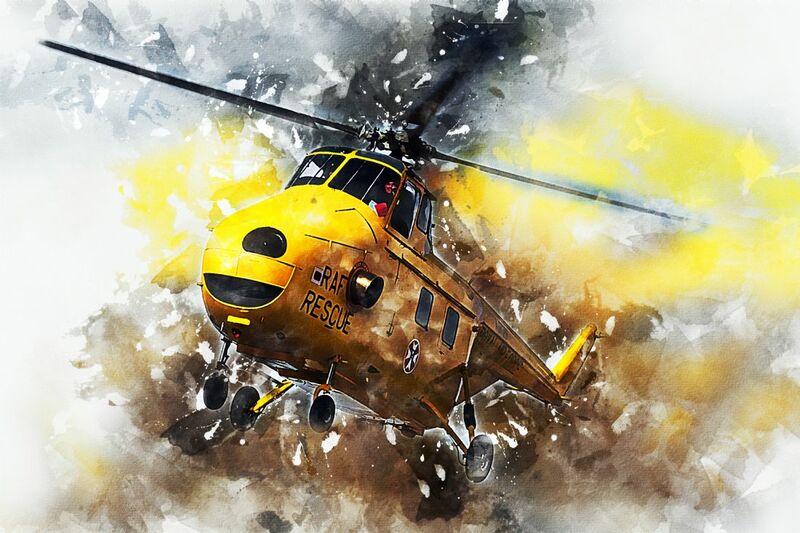 Digital painting. 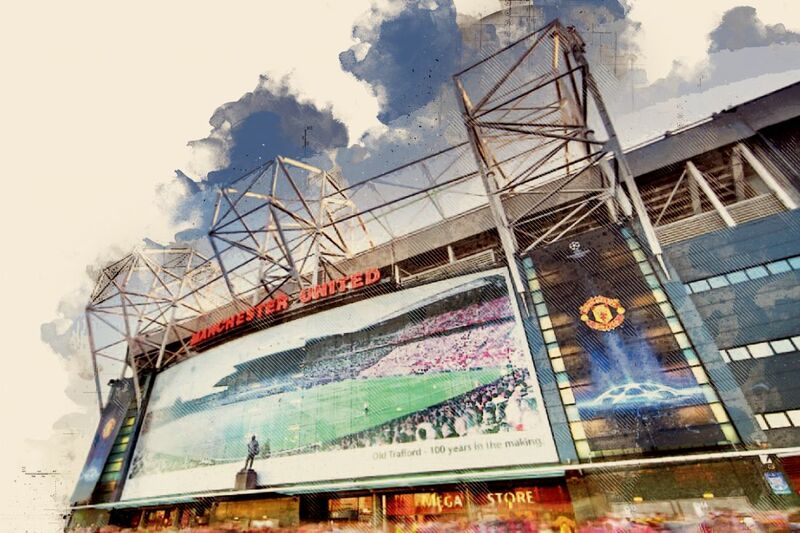 The famous Dutch Lion. 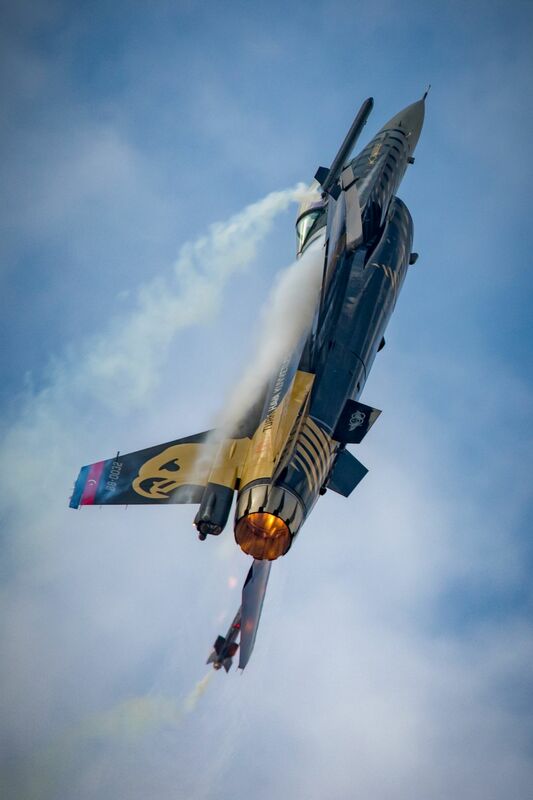 RNLAF F-16 Fighting Falcon display jet. 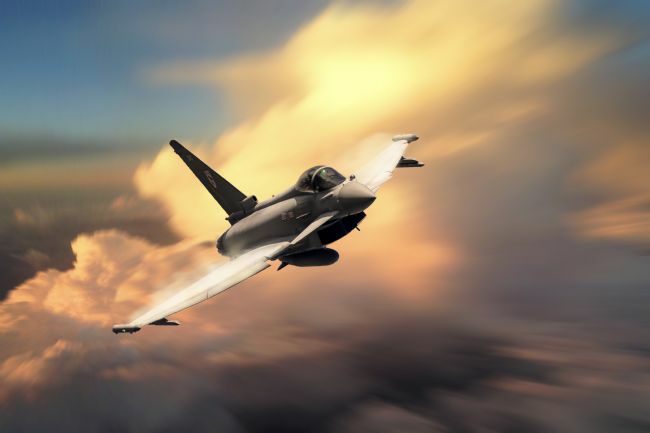 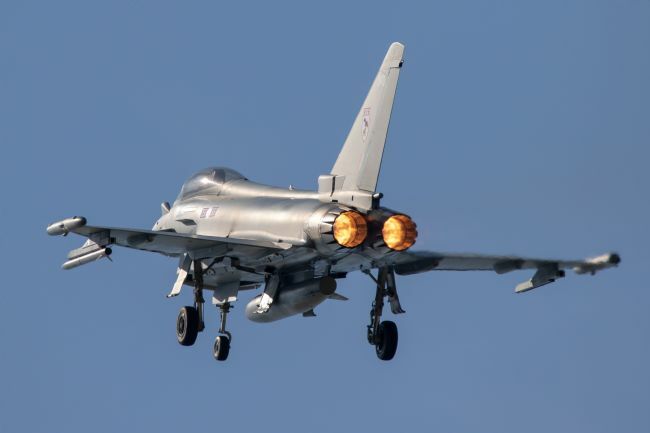 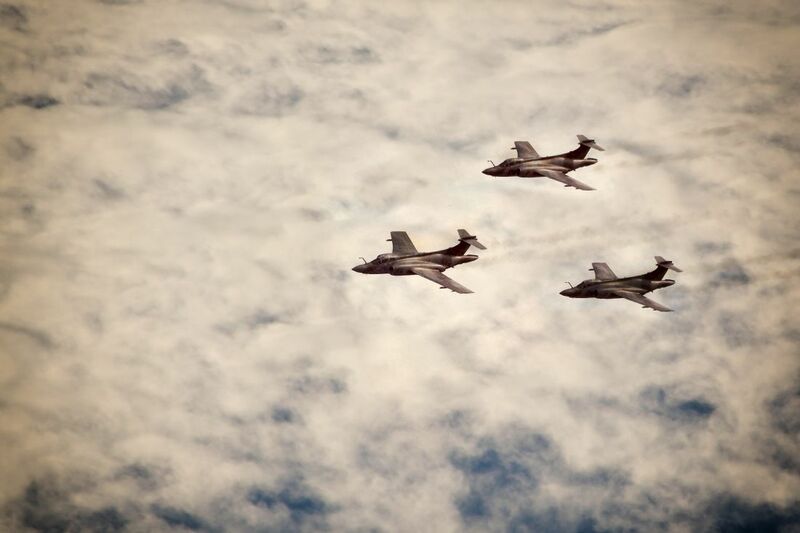 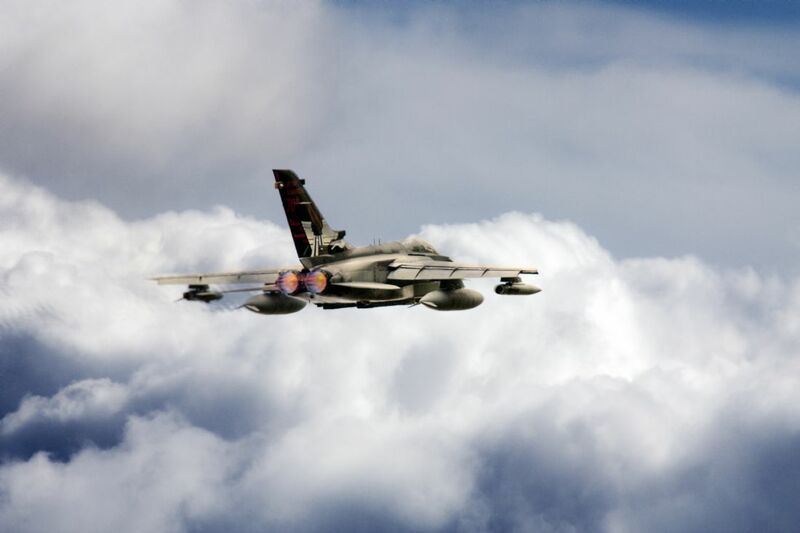 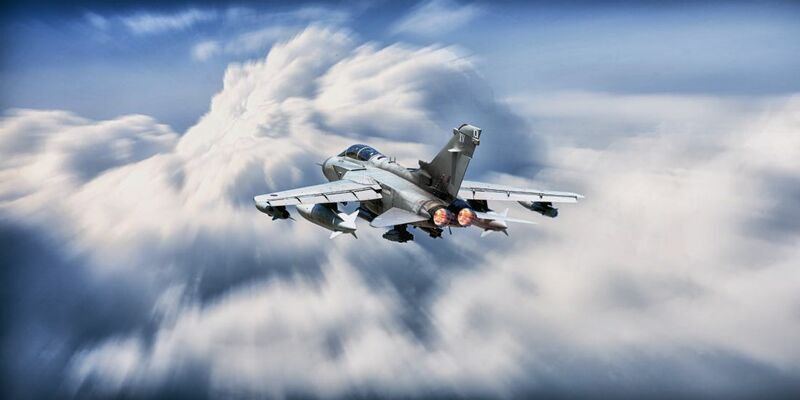 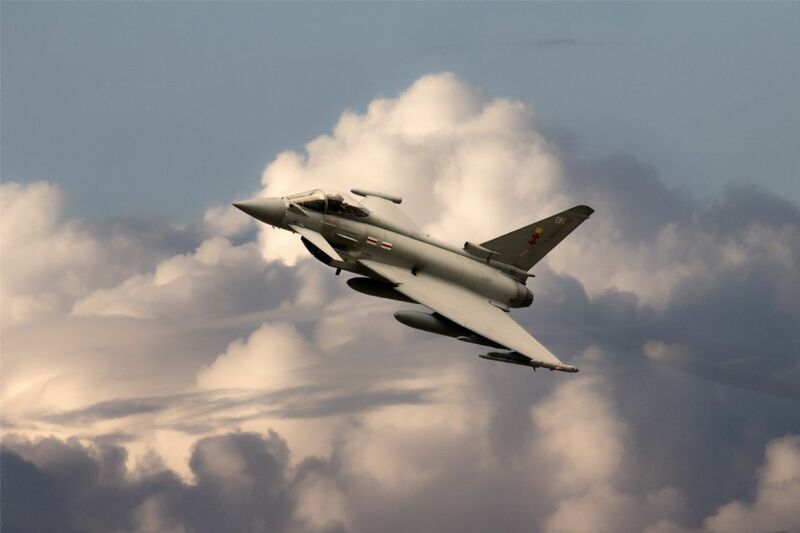 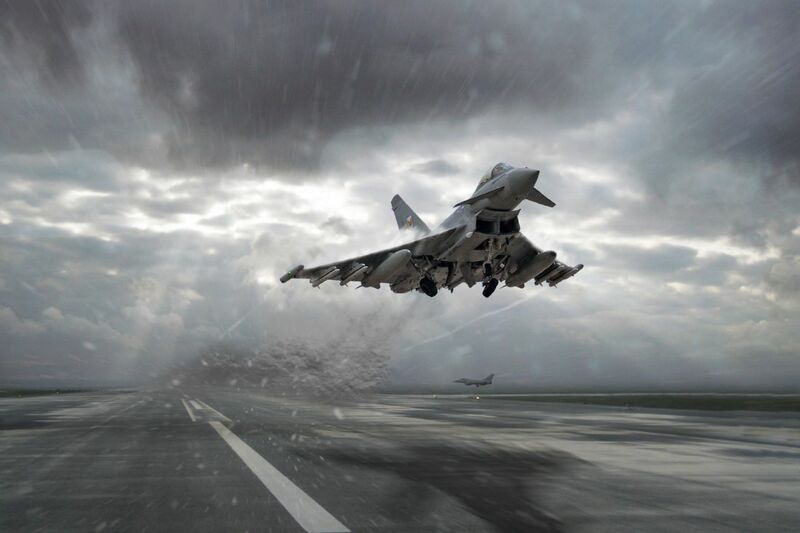 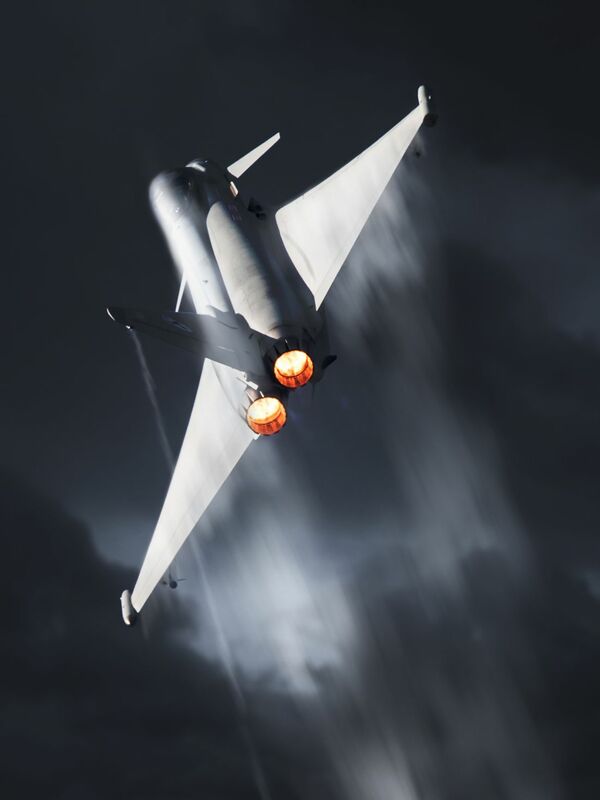 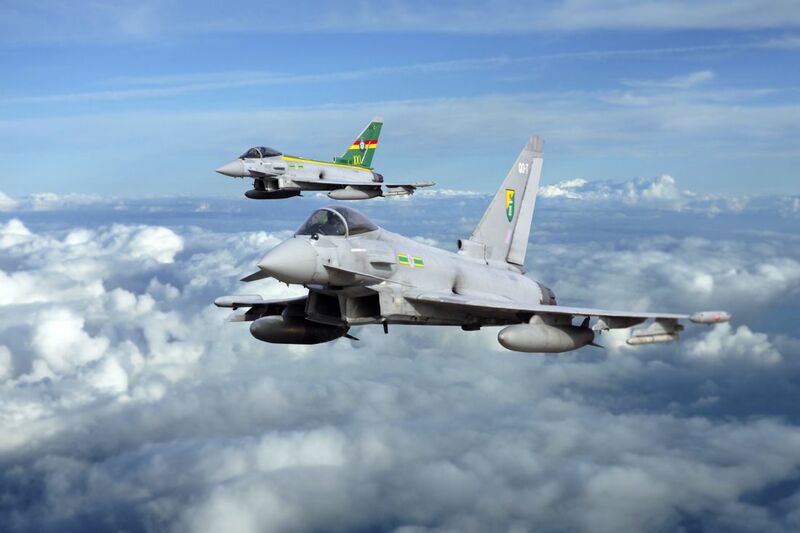 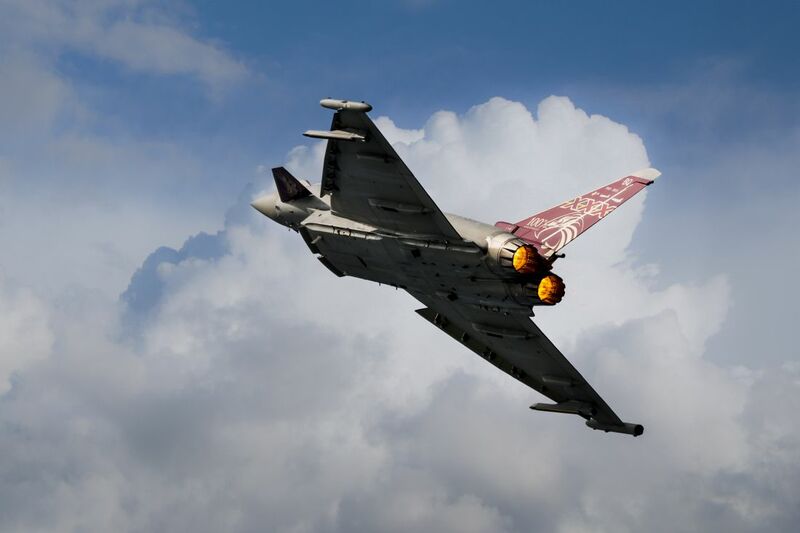 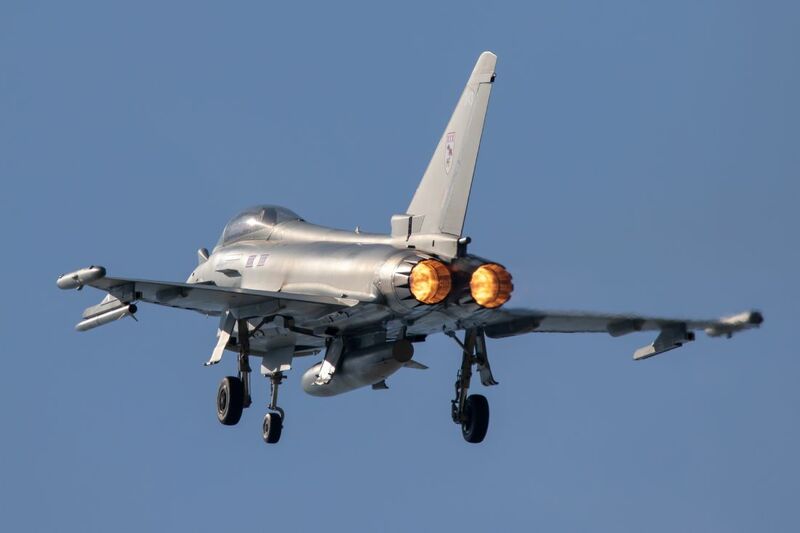 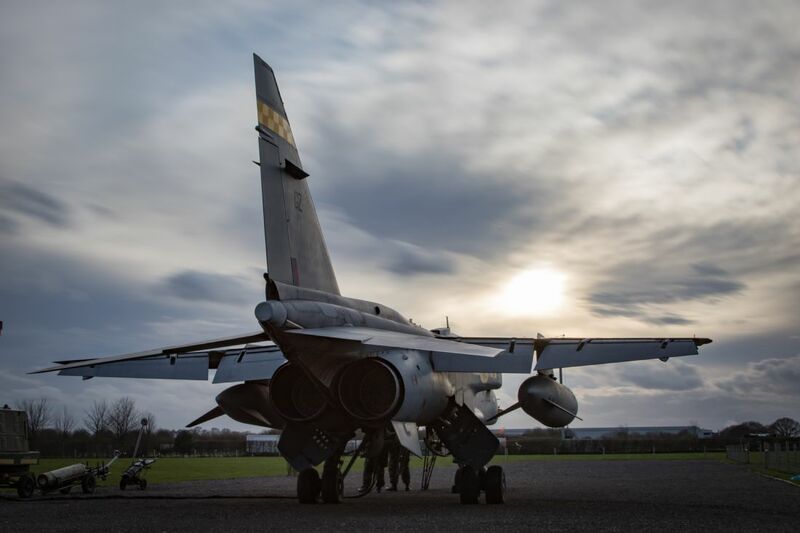 1 Squadron Typhoons scramble from RAF Lossiemouth to protect Uk air space. 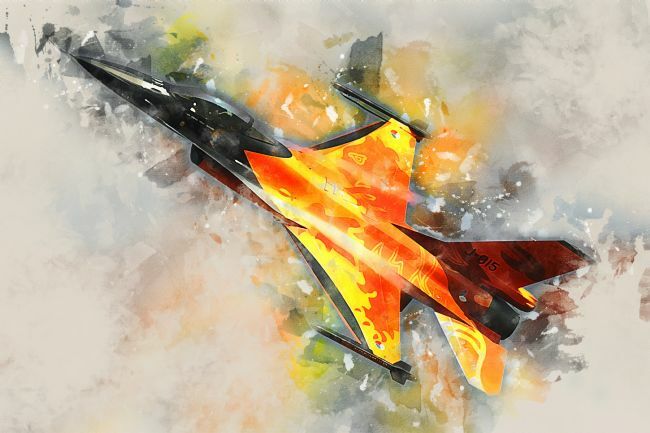 Digital Painting. Closely followed by his Wingman a Spitfire Pilot shot up over the English Channel prepares to ditch in the water. 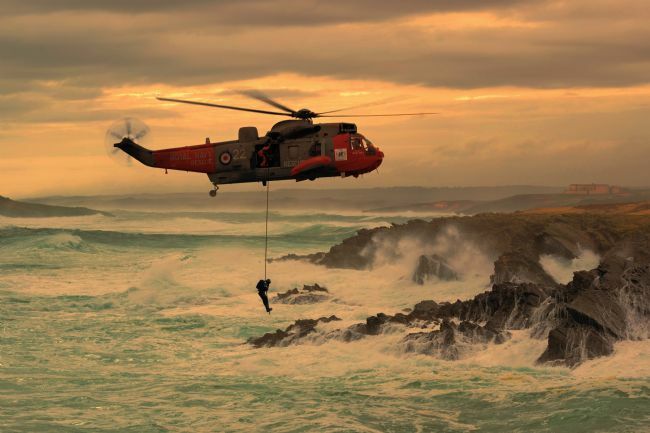 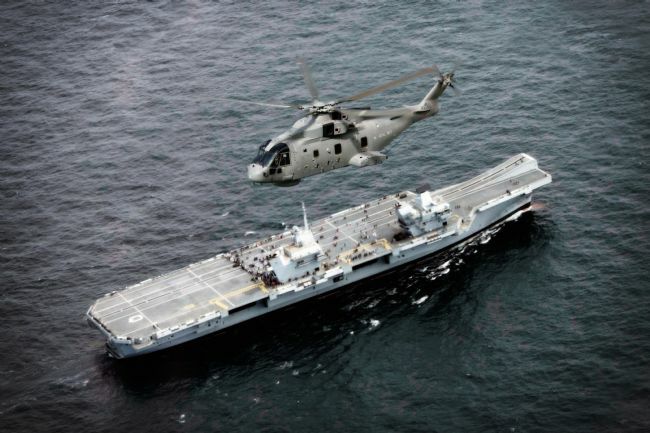 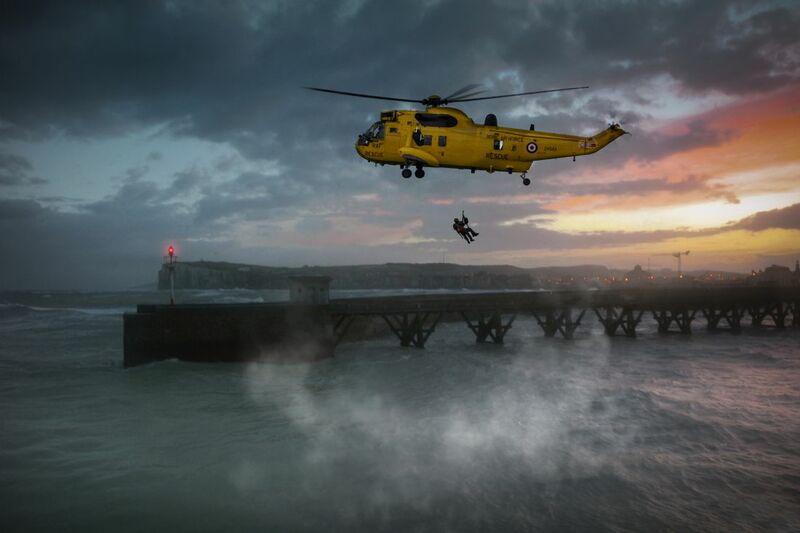 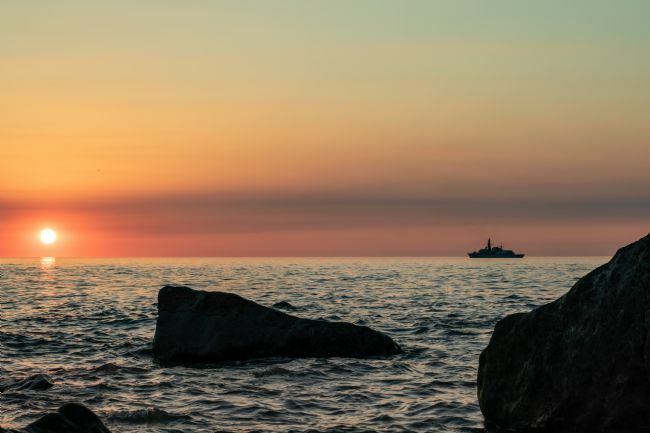 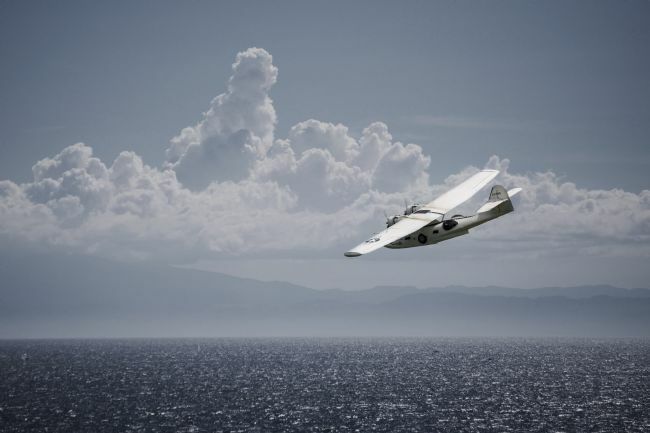 Luckily a nearby Yacht spots the impending water landing and moves to aid in the rescue. 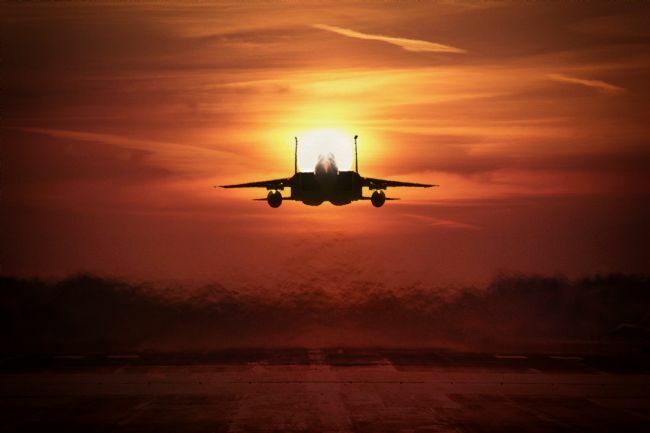 The McDonnell Douglas F-15 Eagle is a twin-engine tactical fighter designed to gain and maintain air superiority in aerial combat. 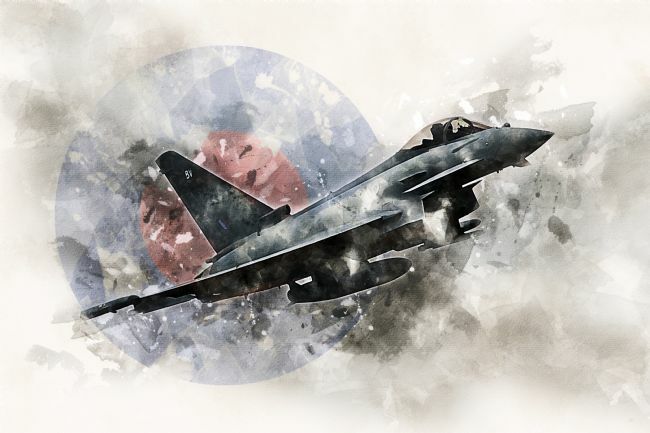 It is considered among the most successful of modern fighters, with over 100 aerial combat victories with no losses in dogfights. 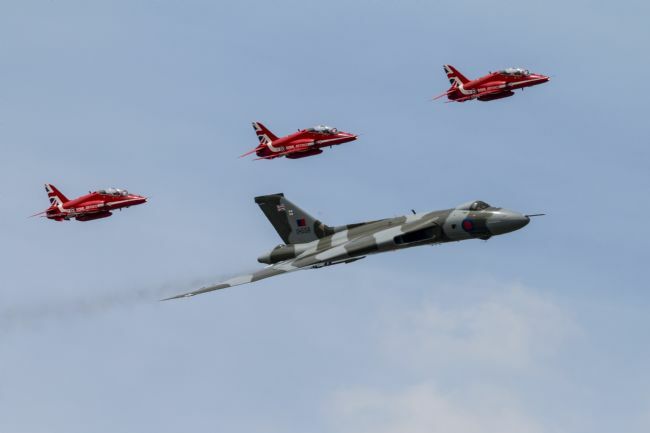 For the final time the Red Arrows lead Avro Vulcan XH558 in a tribute fly past before the big delta bomber lands for the final time. 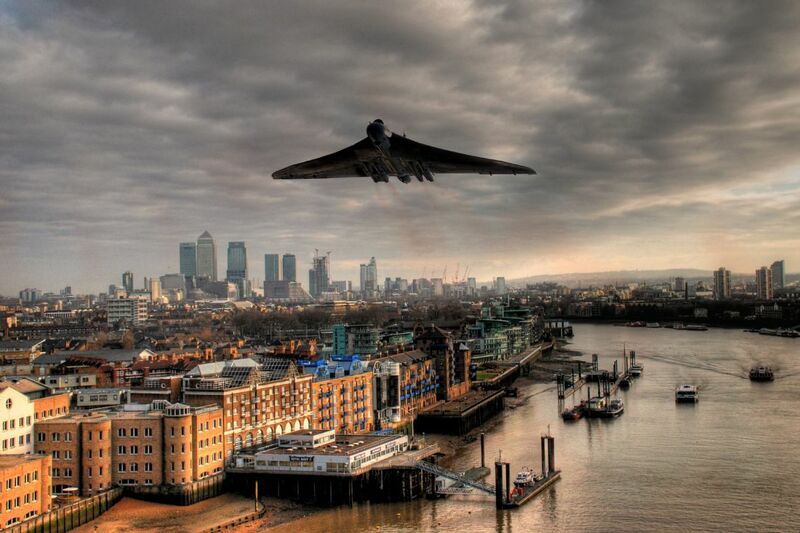 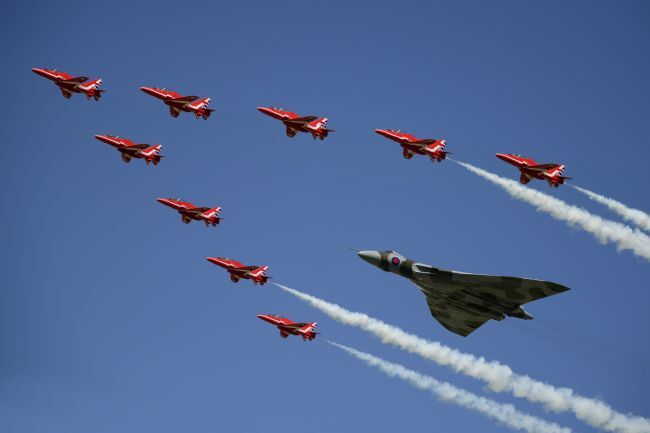 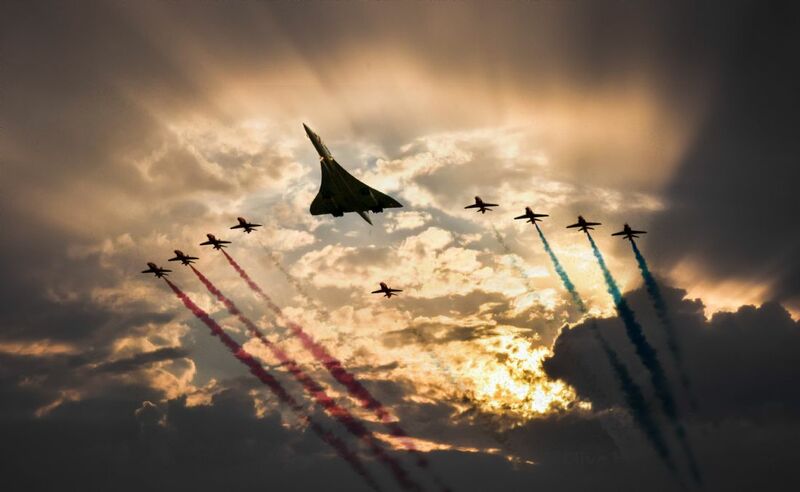 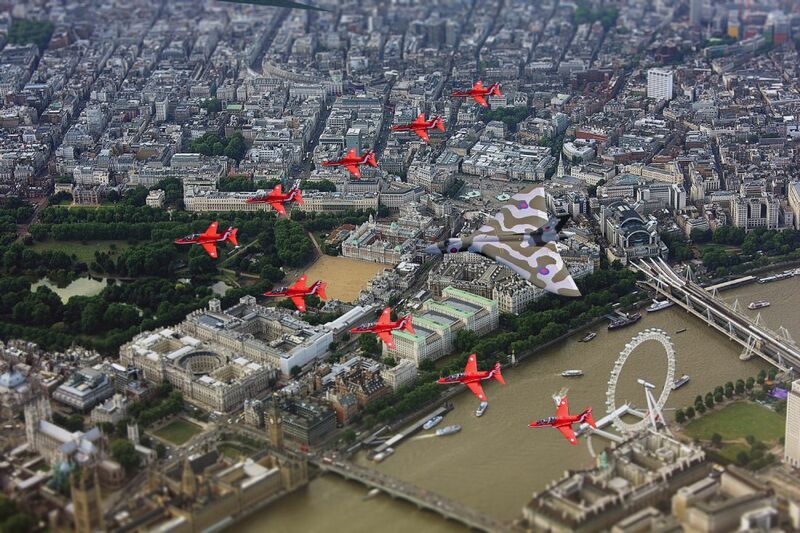 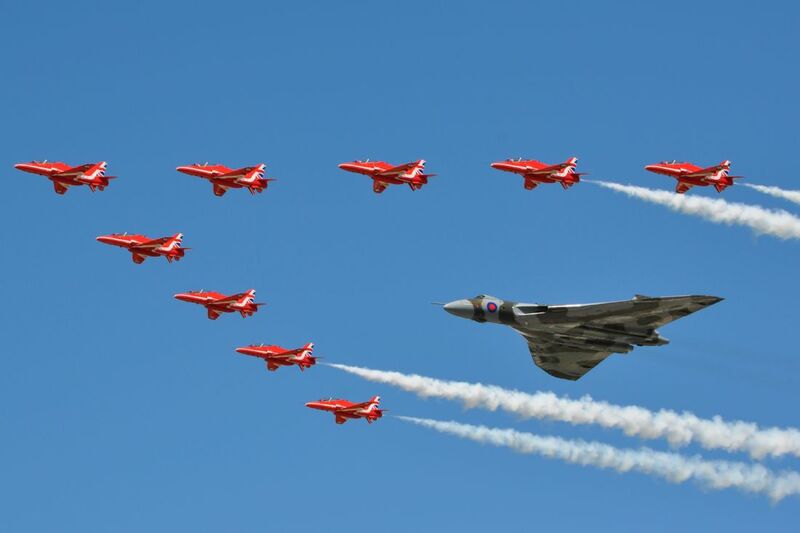 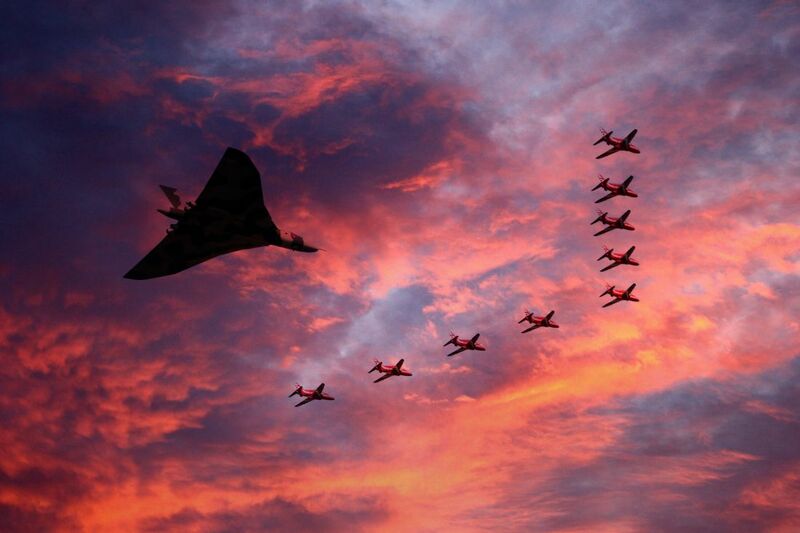 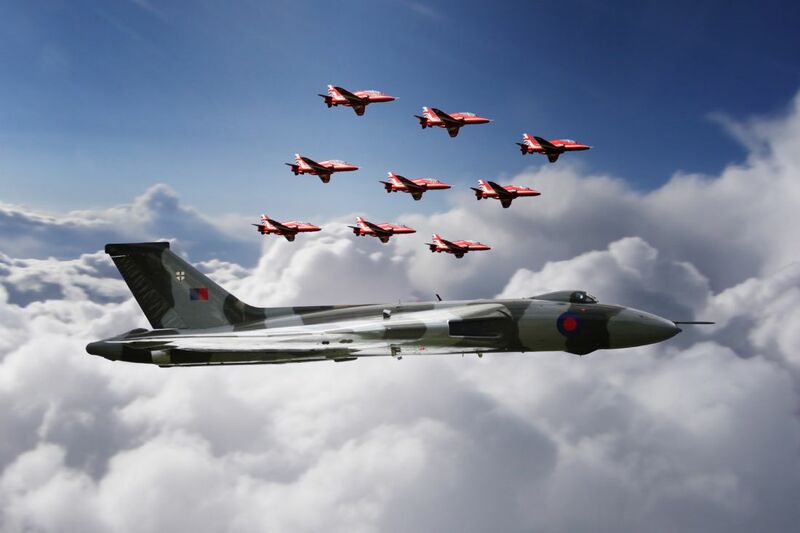 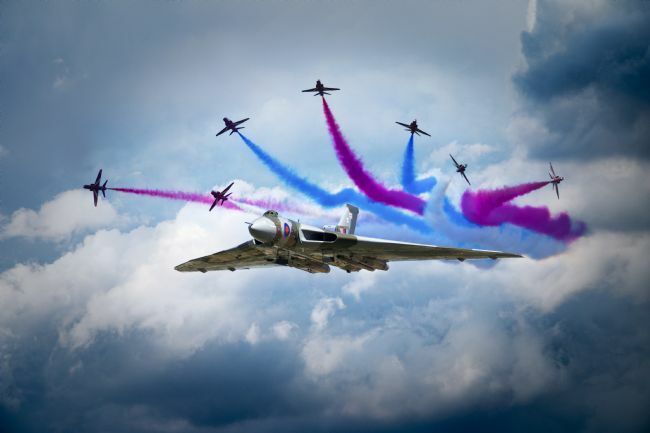 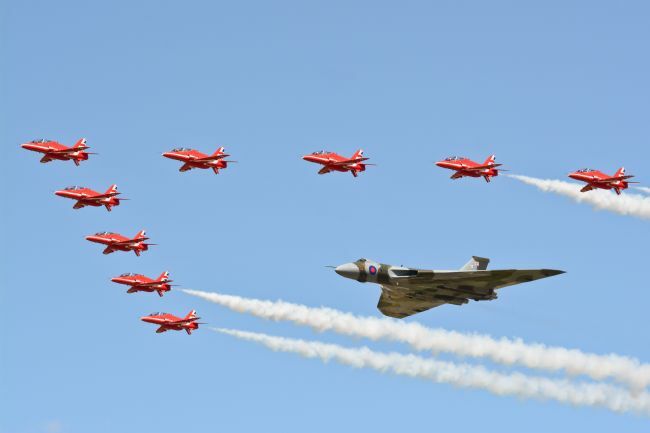 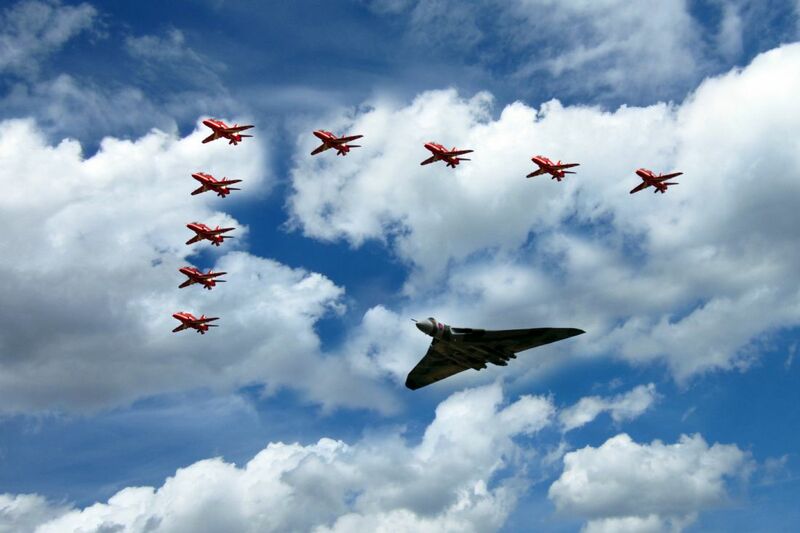 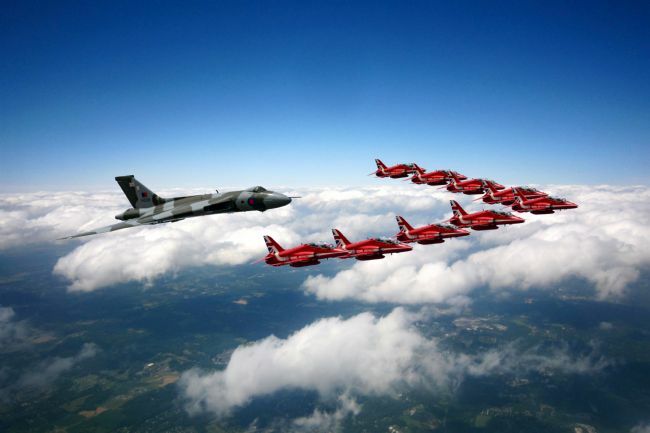 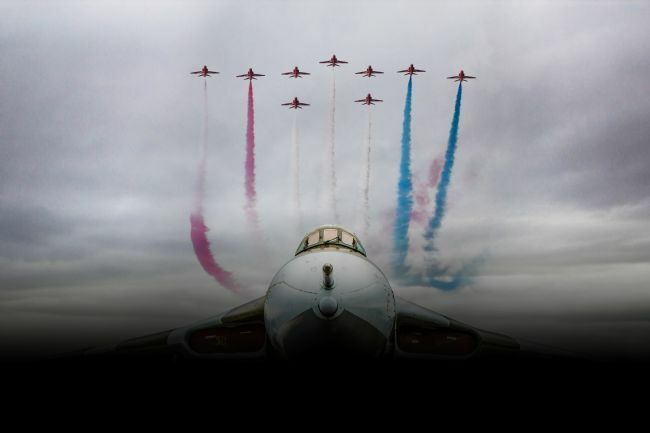 Avro Vulcan XH558 and The Red Arrows in big V formation of the London. Composite image. 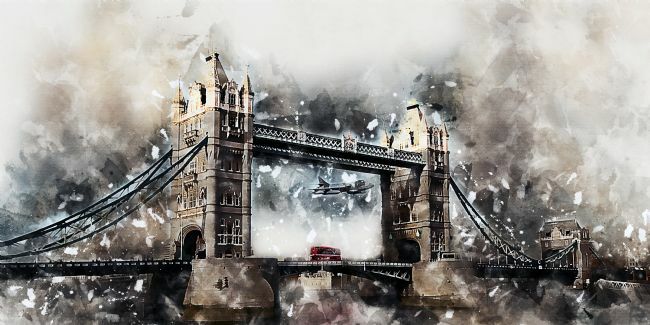 London shot purchased for commercial use. 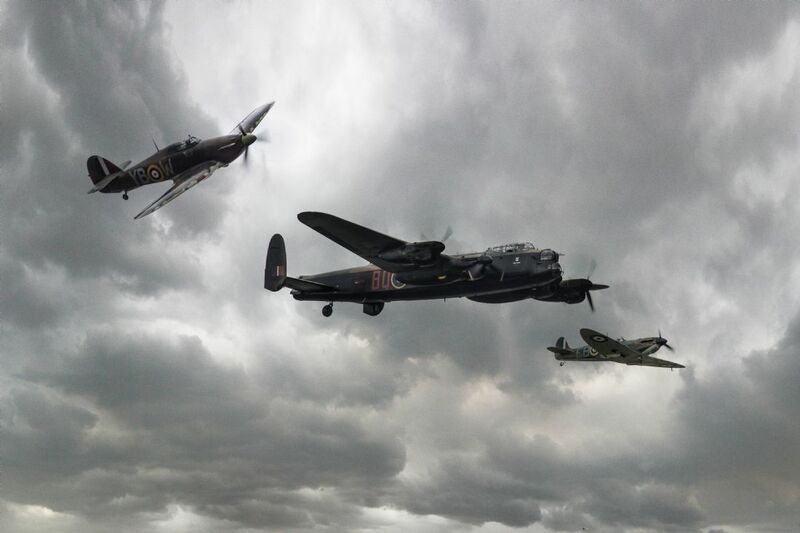 Avro Lancaster Bomber PA474 together with Hurricane PZ865 and Spitfire PS915 from the Battle of Britain Memorial Flight. 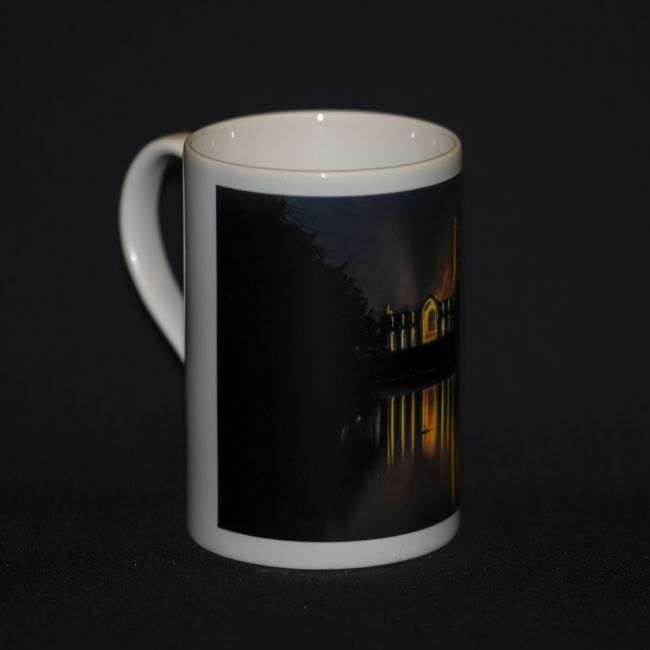 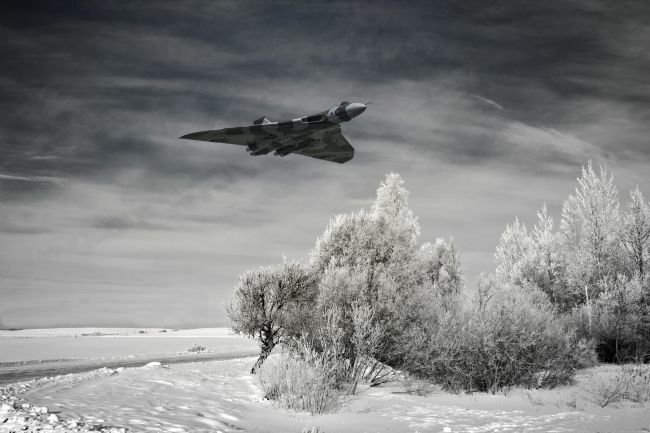 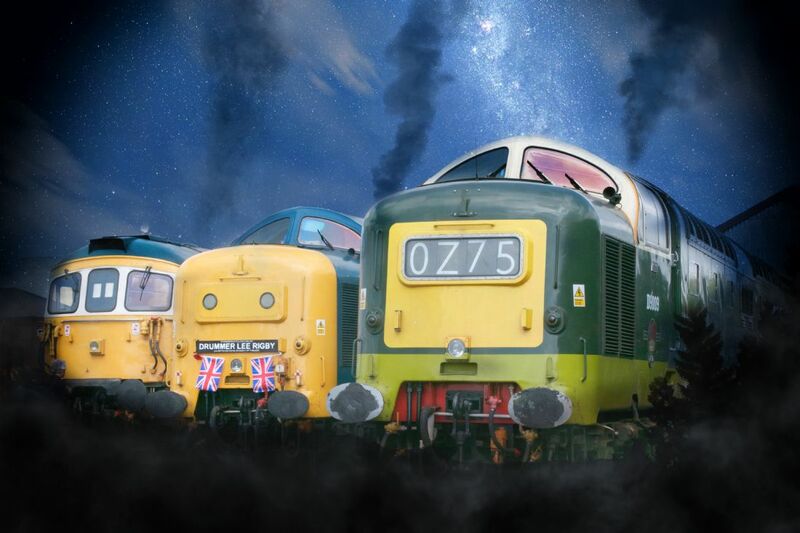 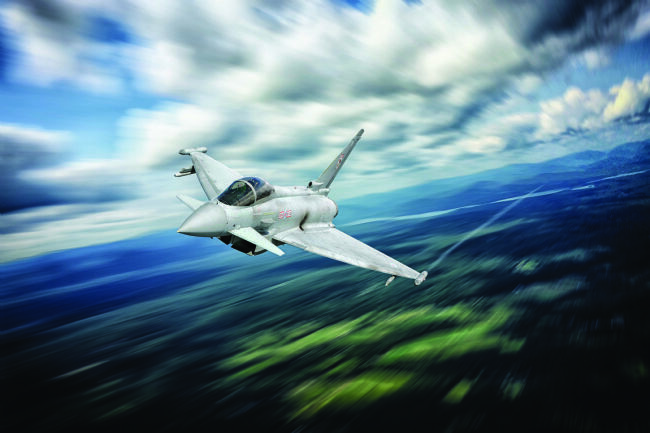 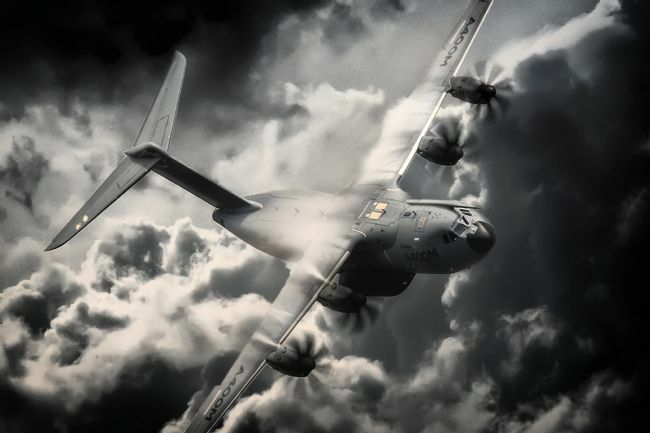 Exclusive to Lens2Print.co.uk Composite Image. 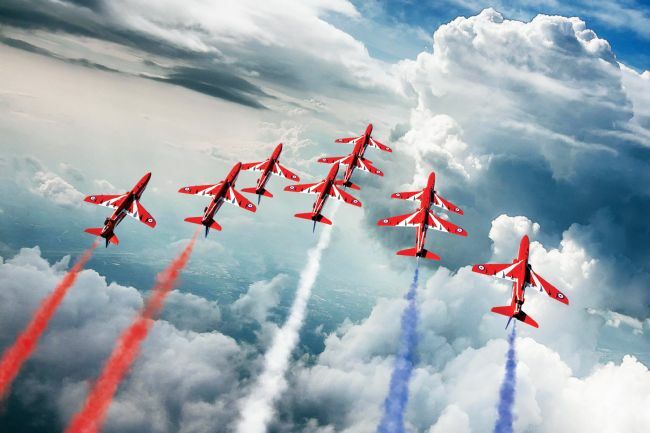 Sky from Pexels.com. 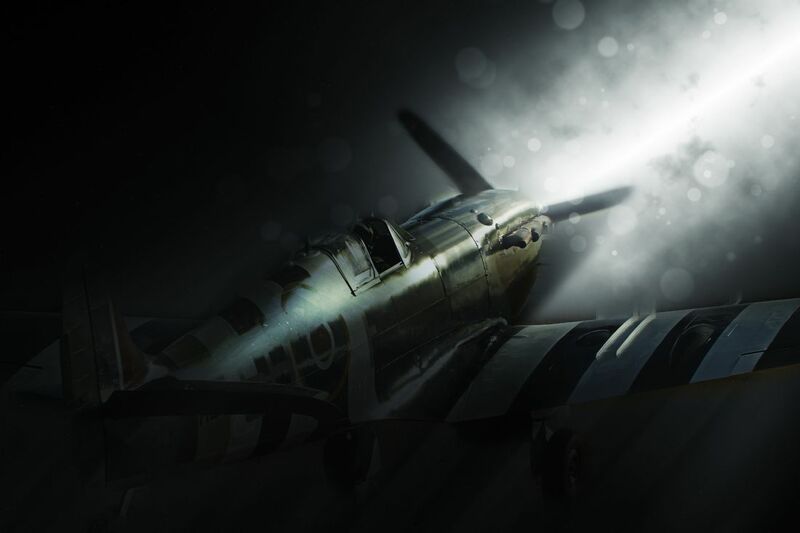 The Blitz. 29th December 1940. 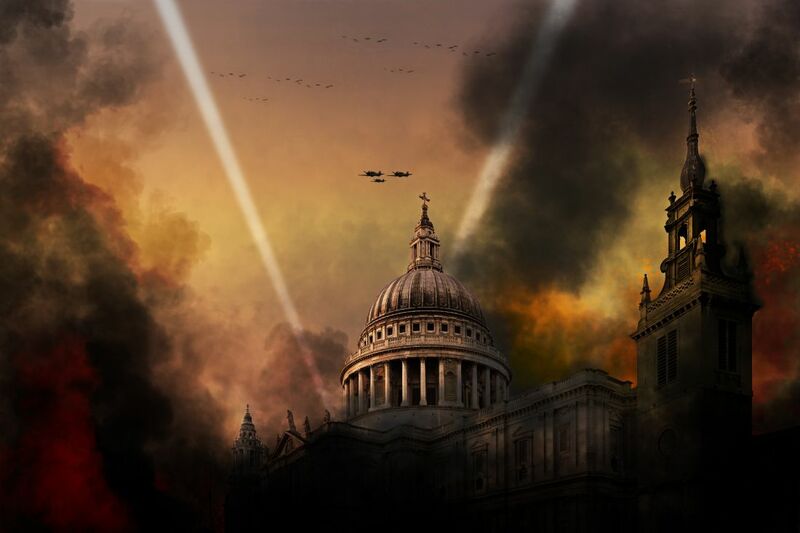 Prime Minister Winston Churchill sent word that St Paul's Cathedral should be protected at all costs. Following the Battle of Britain, the Hurricane continued to give service, and through the Blitz, was the principal single-seat night fighter in Fighter Command. 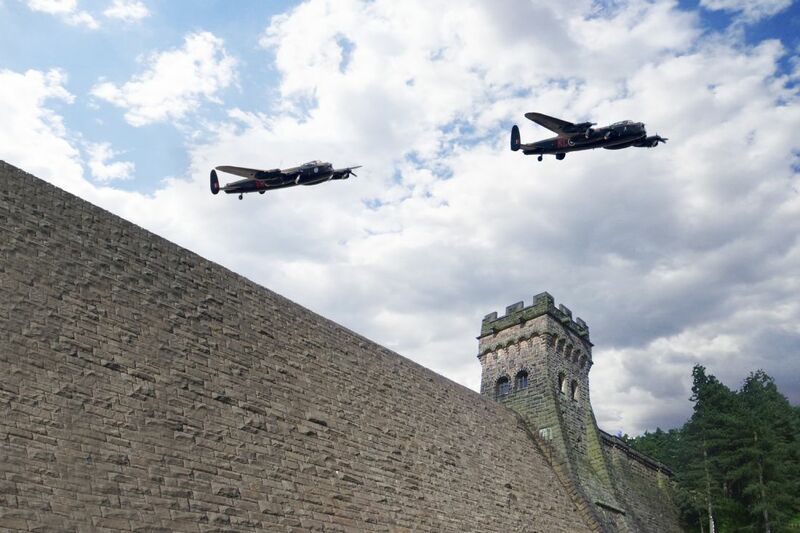 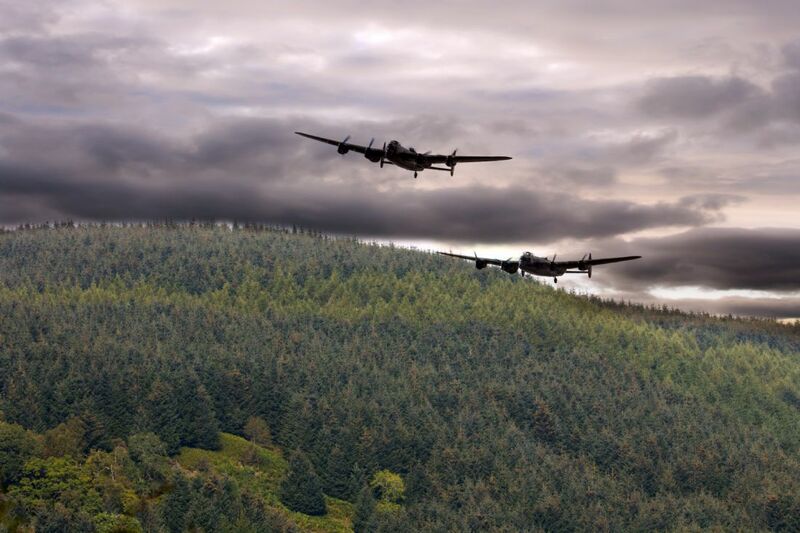 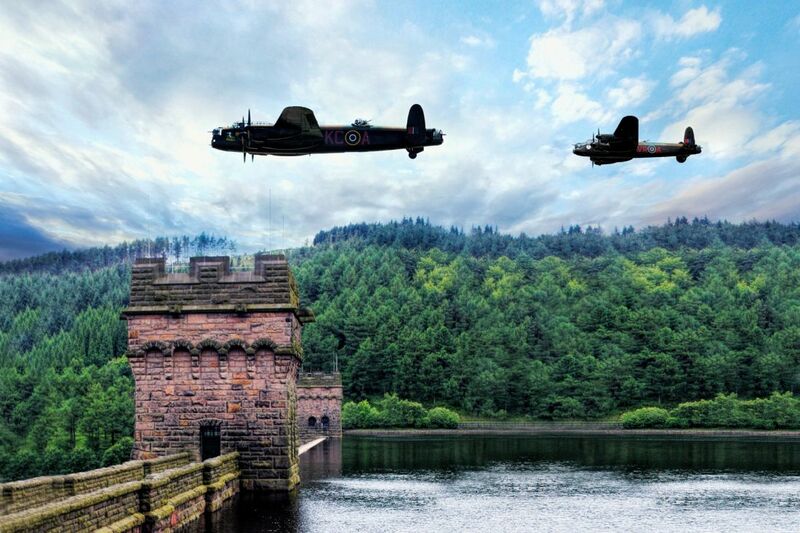 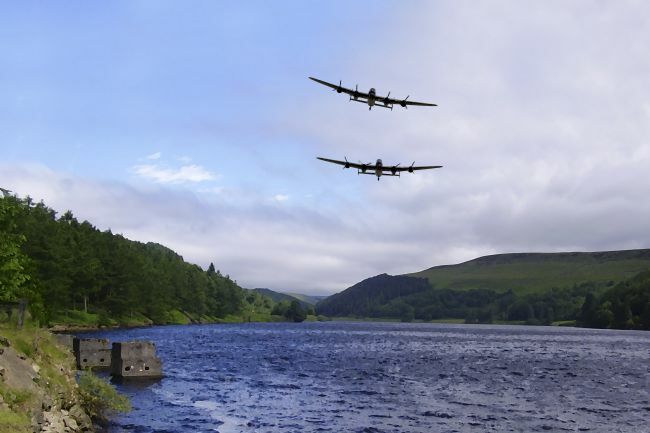 Lancaster Bombers fly through the famous towers on the dams of the Derwent Valley. 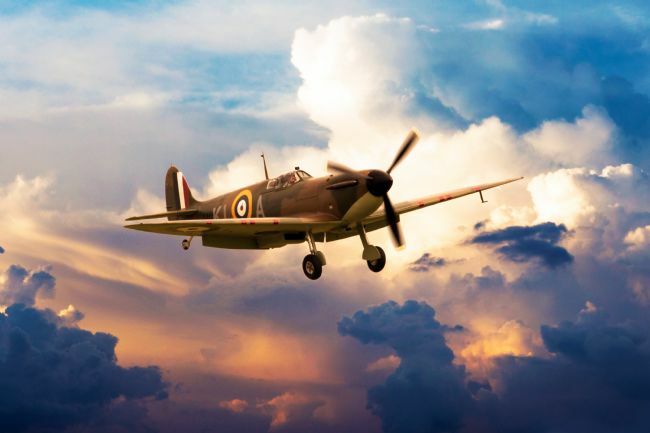 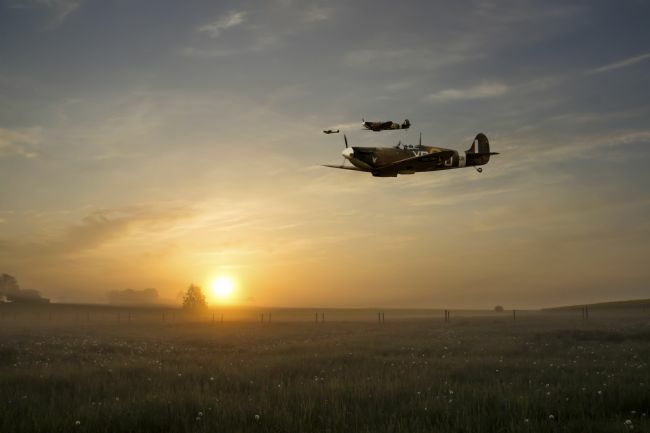 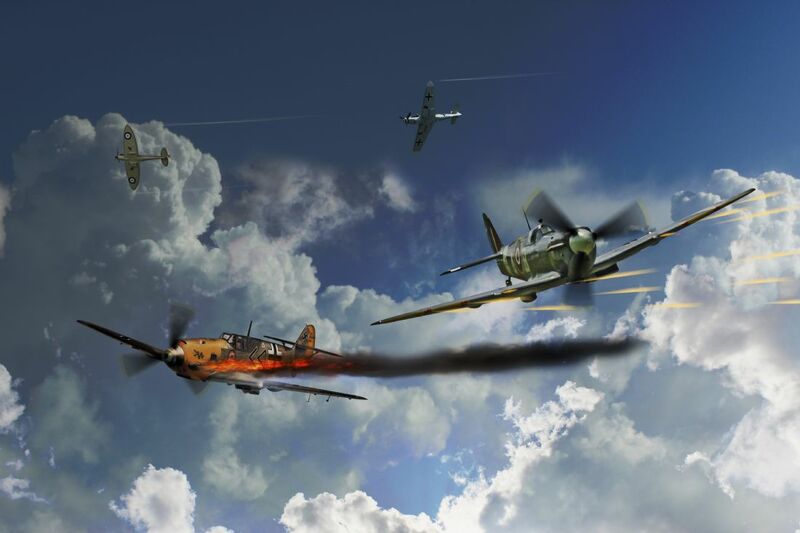 On the 19th August 1942, AB910 flew in one of the largest air battles of any war in history. 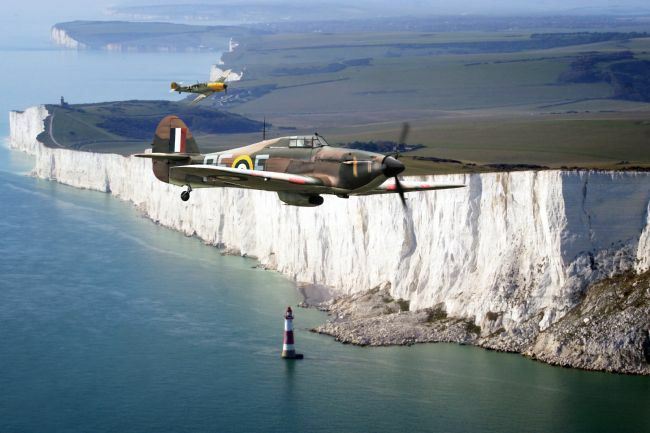 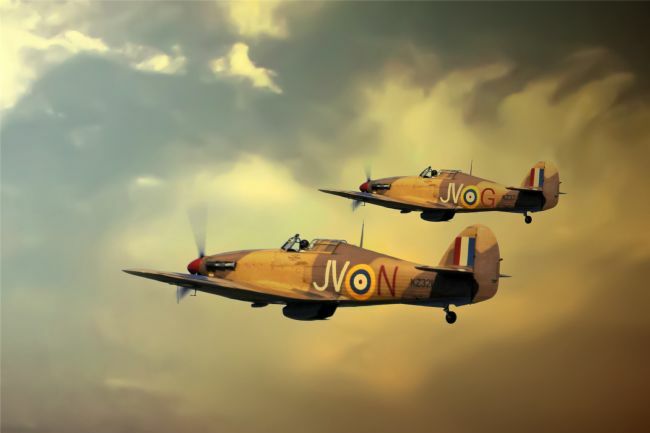 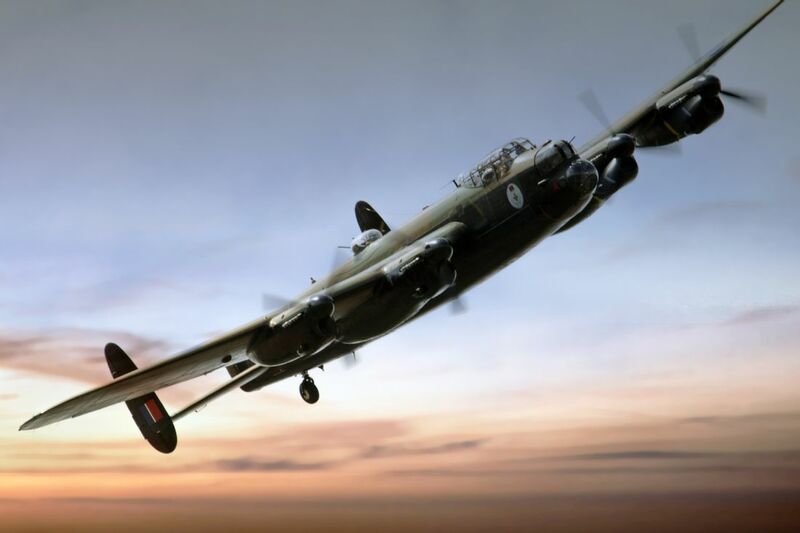 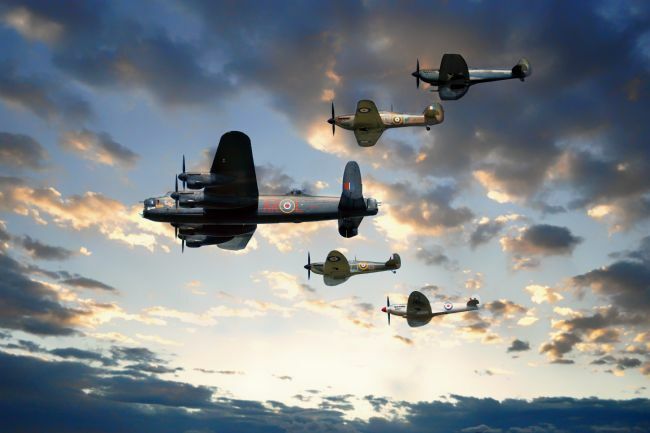 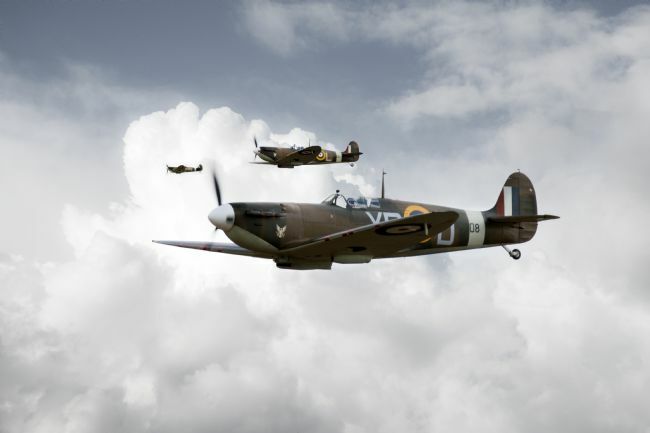 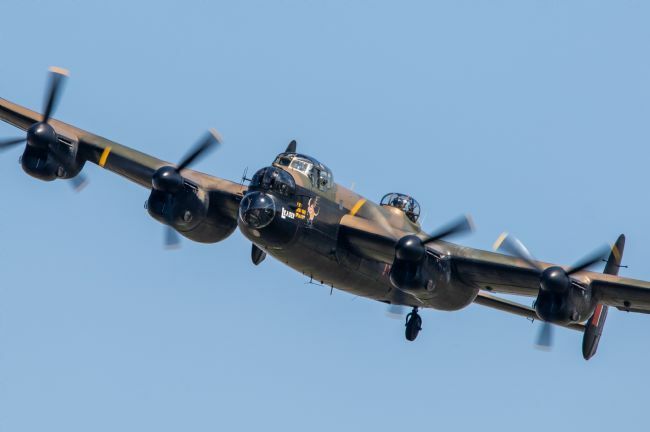 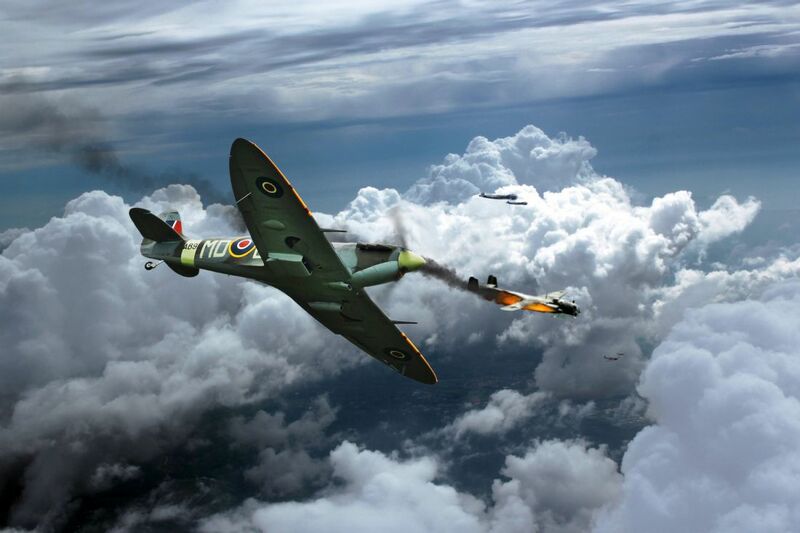 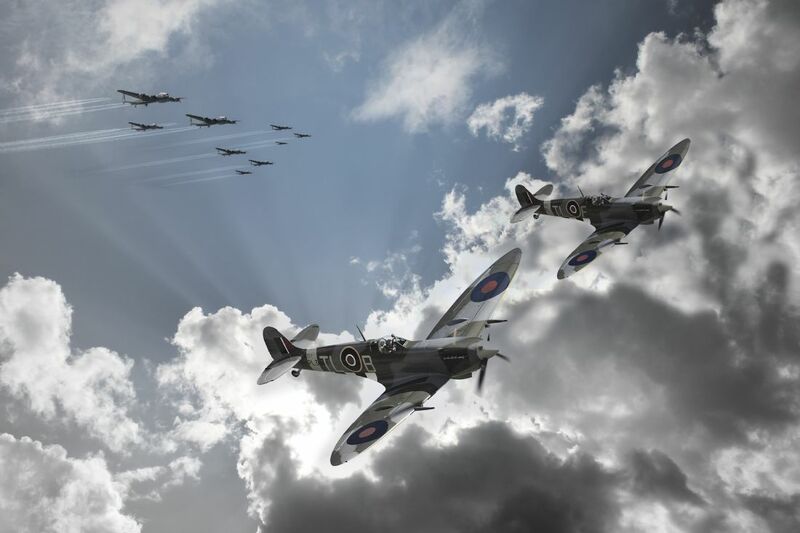 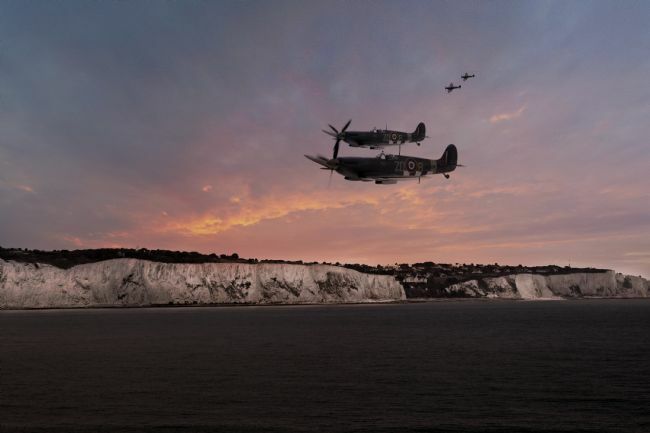 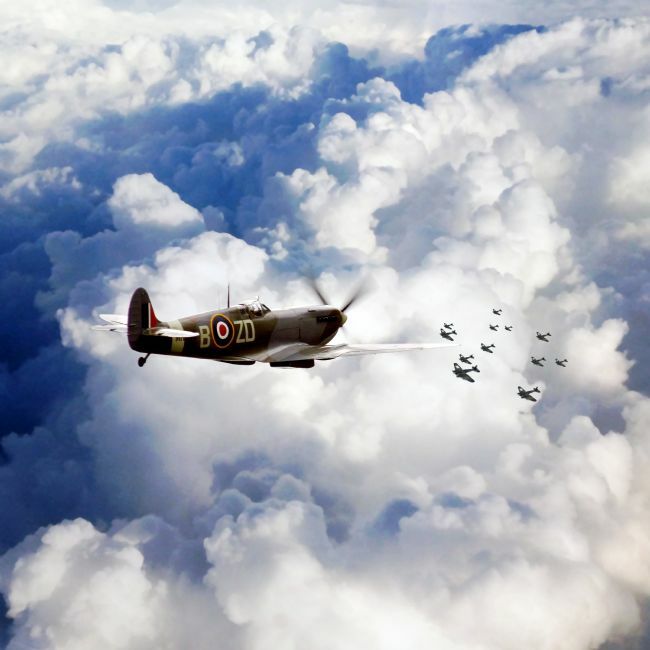 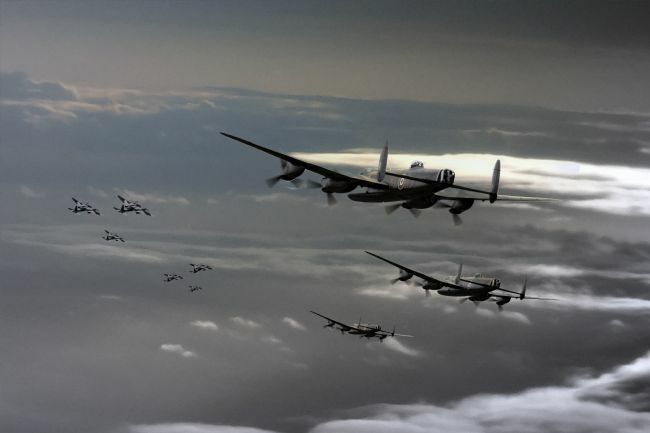 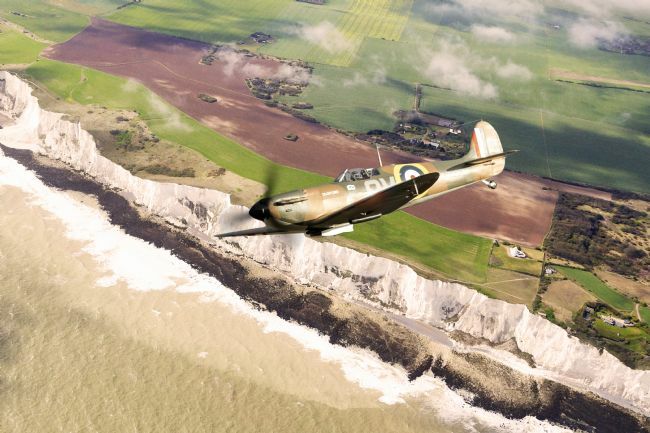 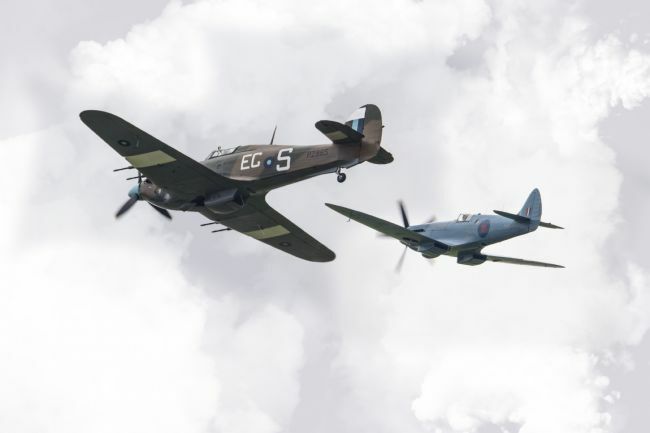 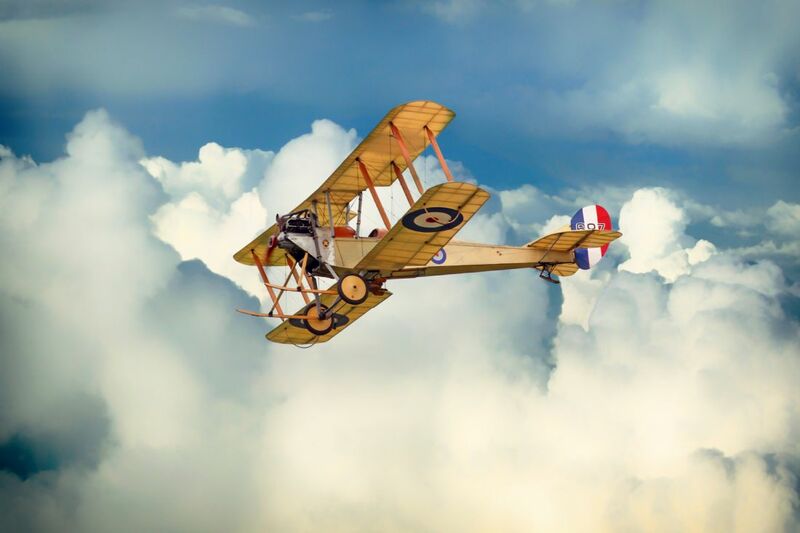 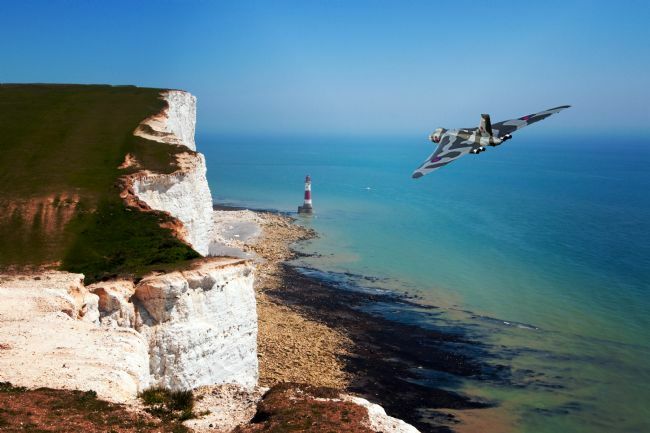 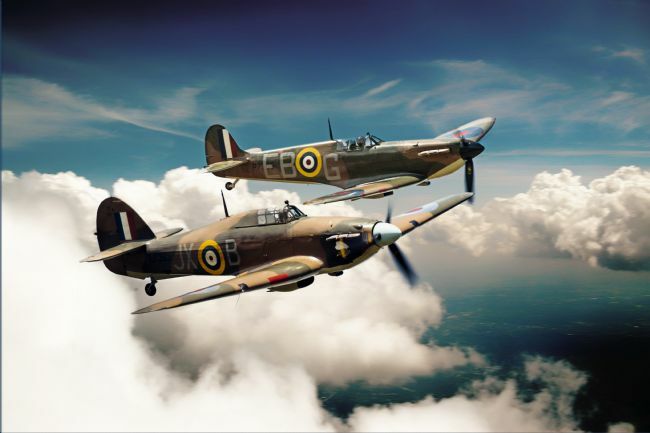 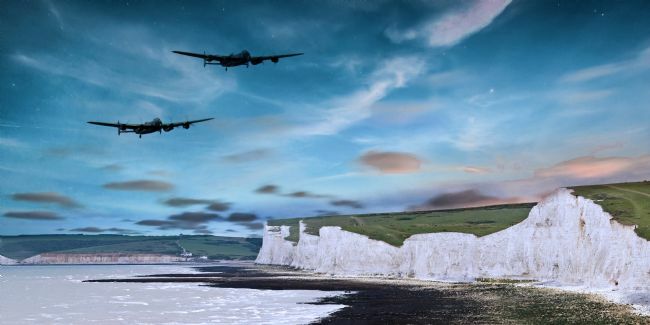 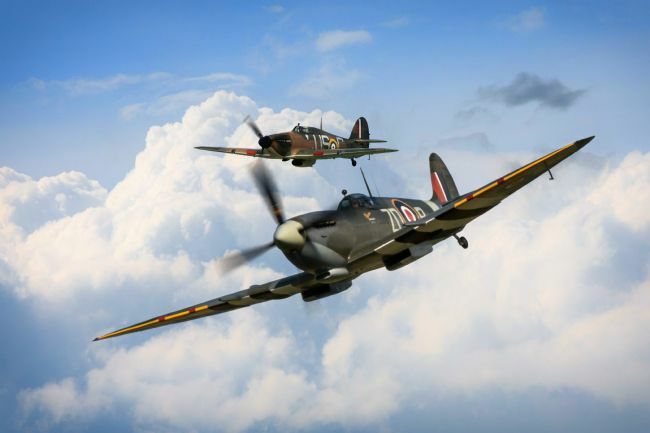 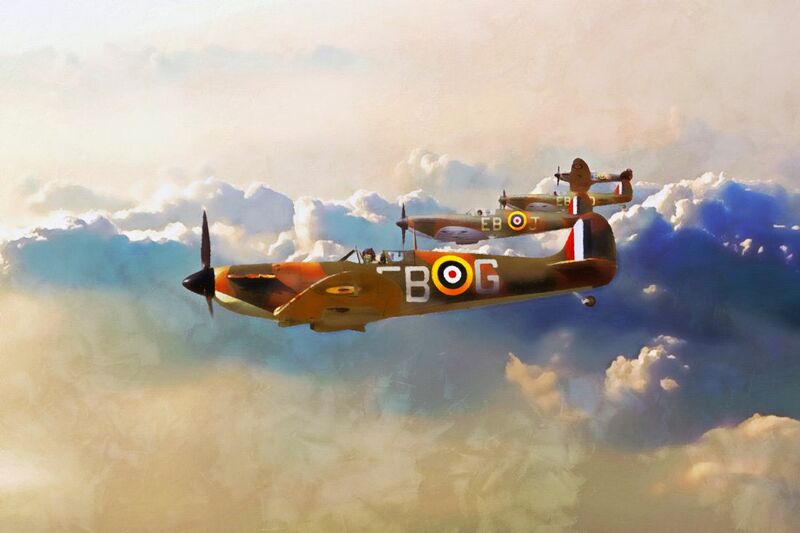 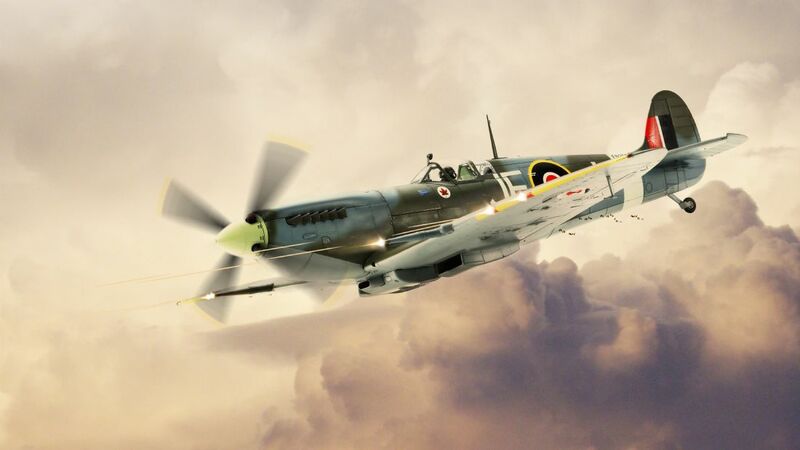 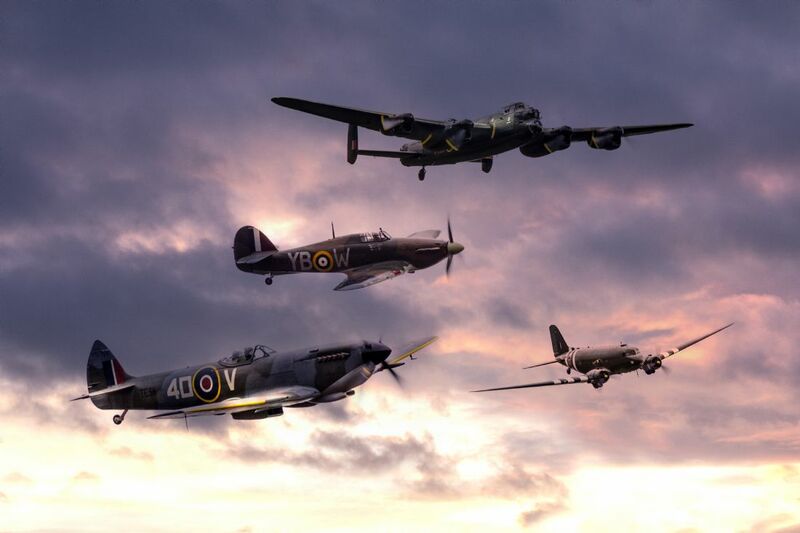 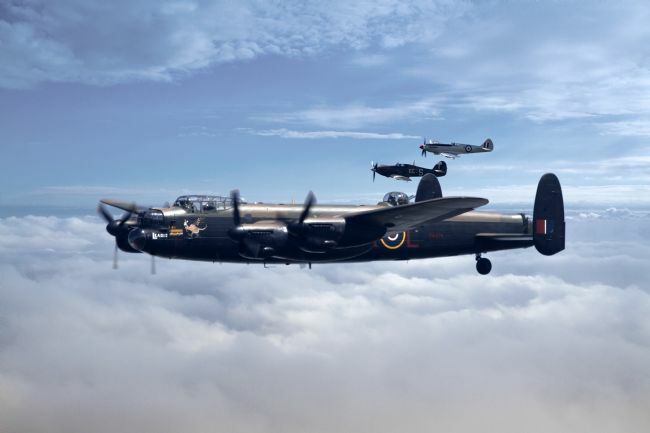 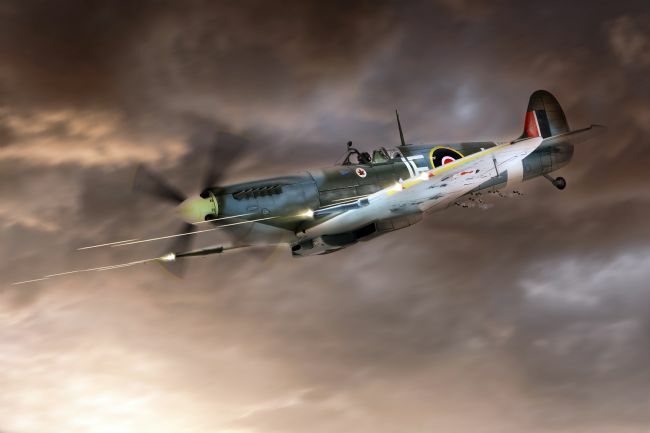 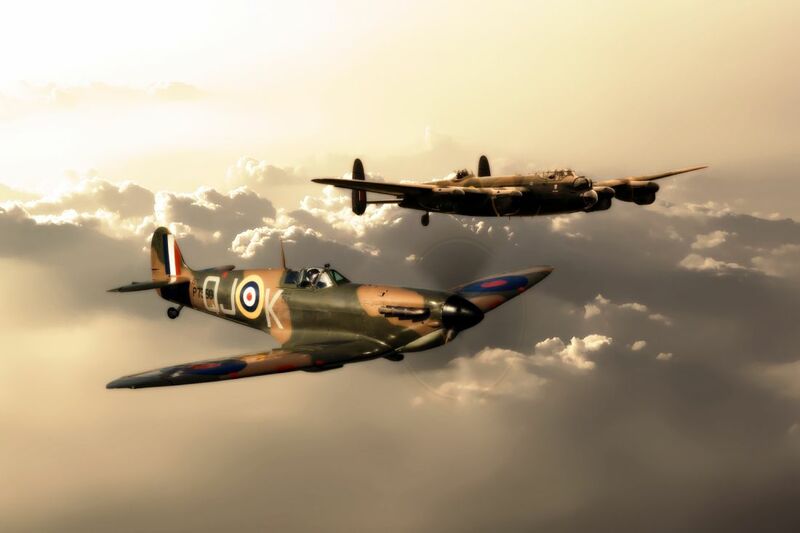 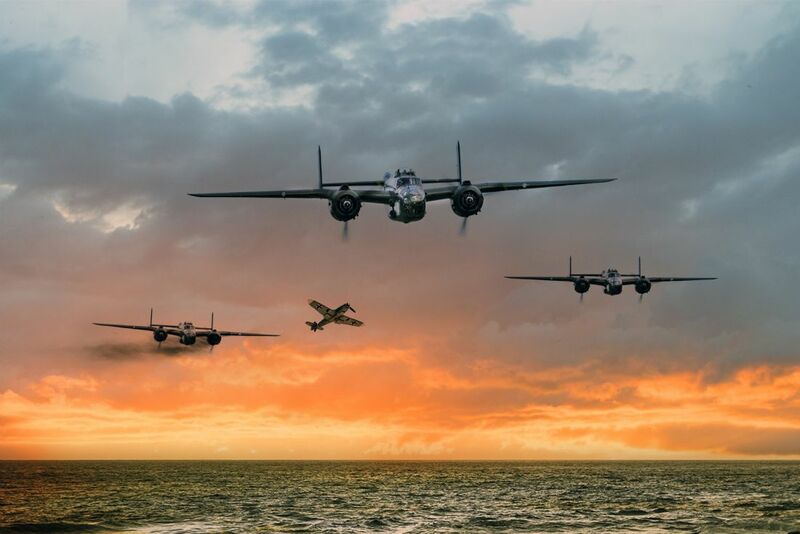 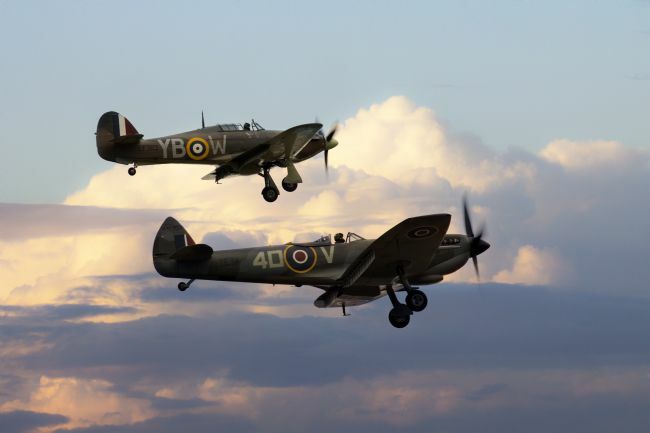 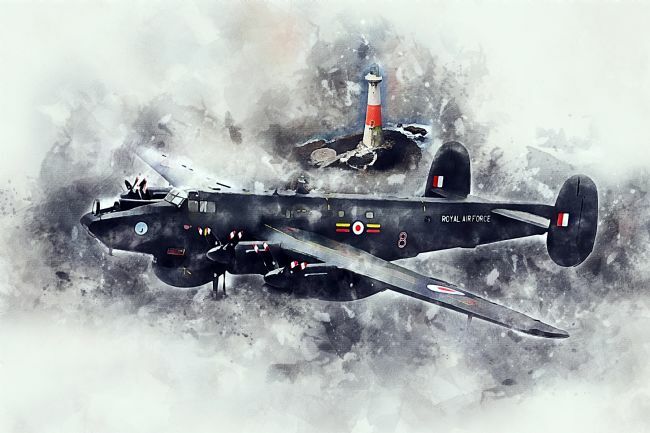 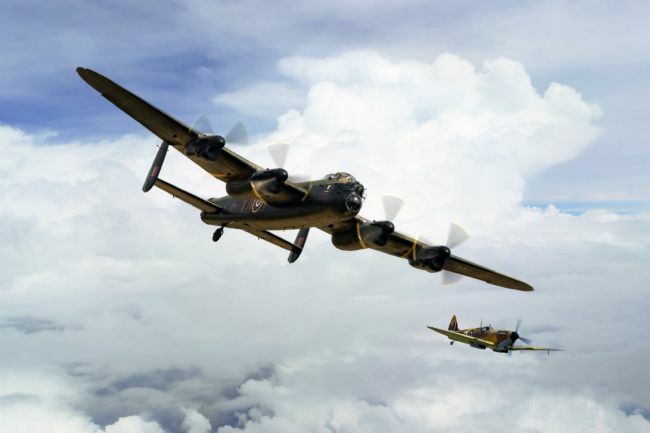 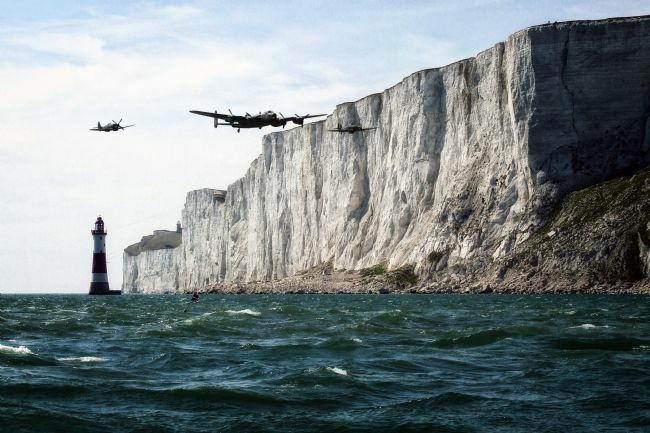 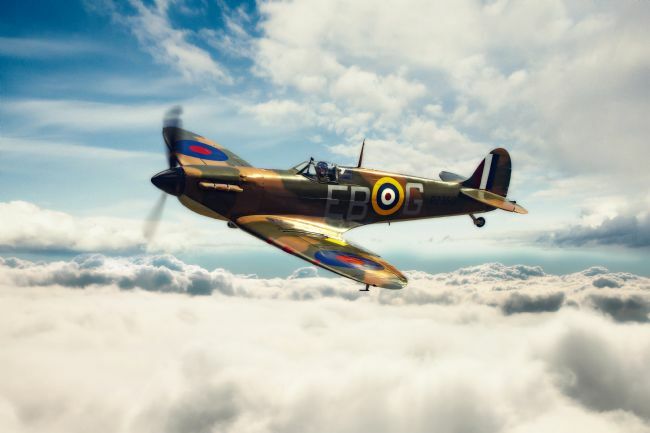 Through fierce fighting, it flew four sorties over the English Channel in support of Operation Jubilee, an Allied-attack on the German-occupied port of Dieppe. 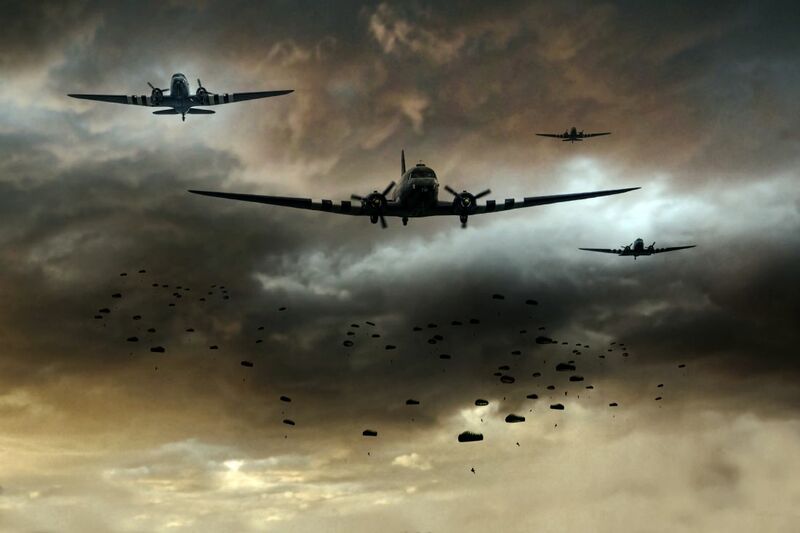 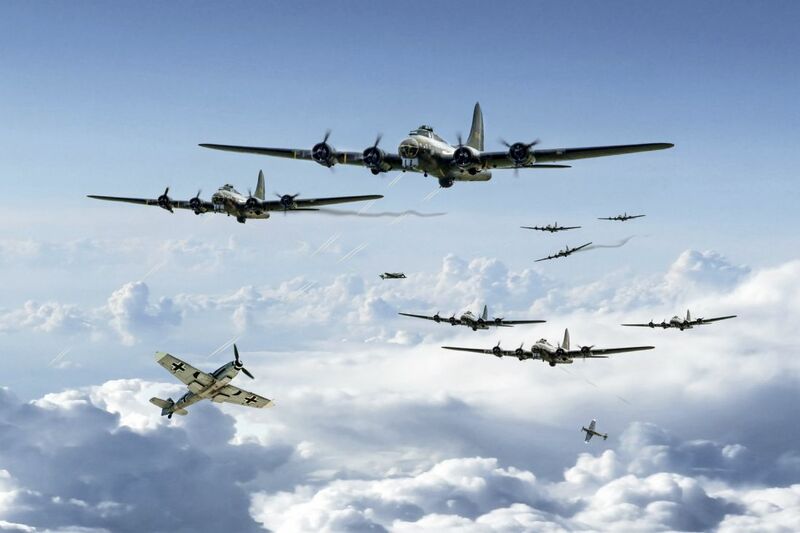 6th June 1944 and waves of Douglas Dakotas drop troops over Northern France. 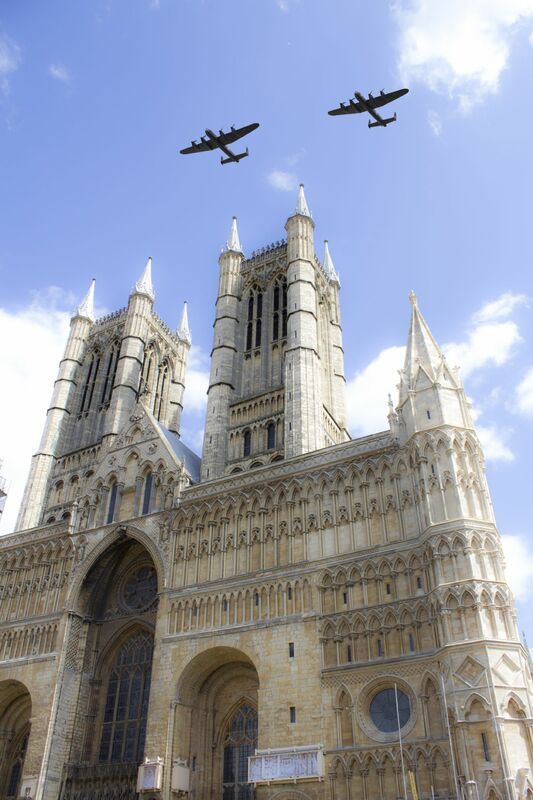 D-Day and the allied forces get a foothold in Northern Europe. 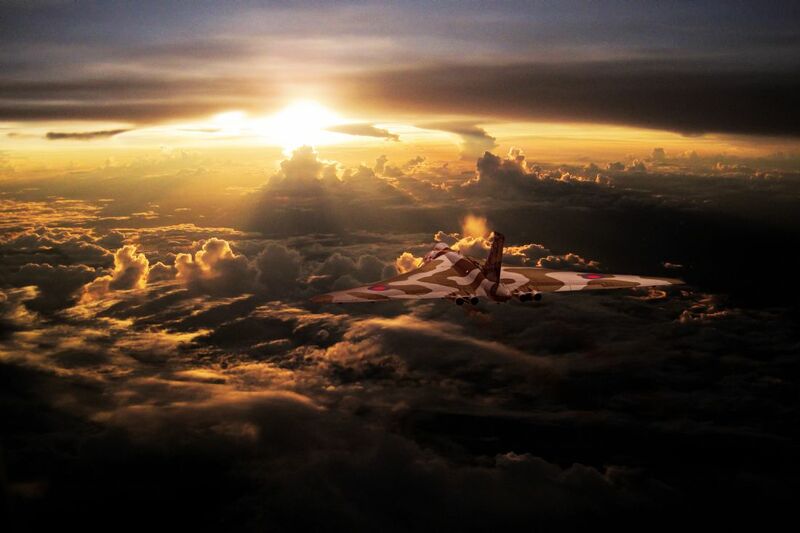 Composite Image. 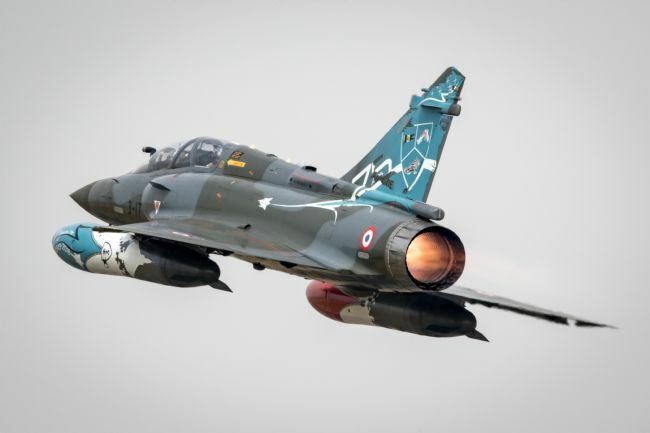 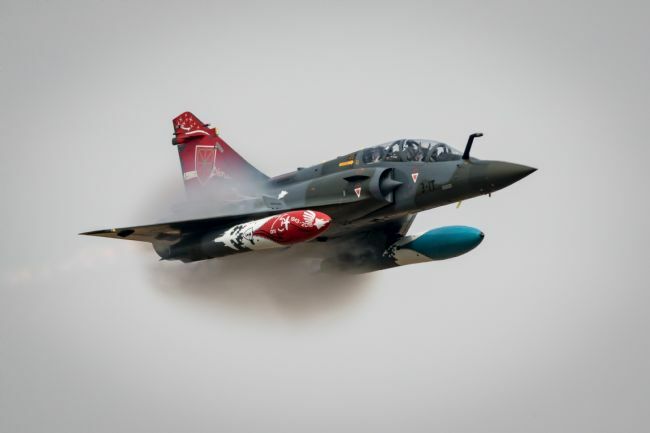 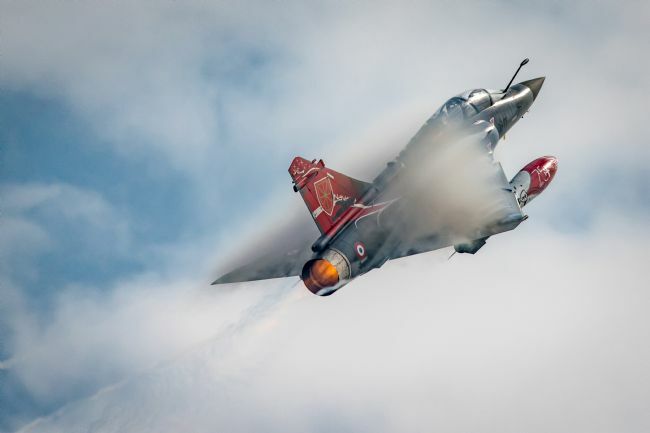 Couteau Delta Mirage 2000 at the Royal International Air Tattoo 2018. 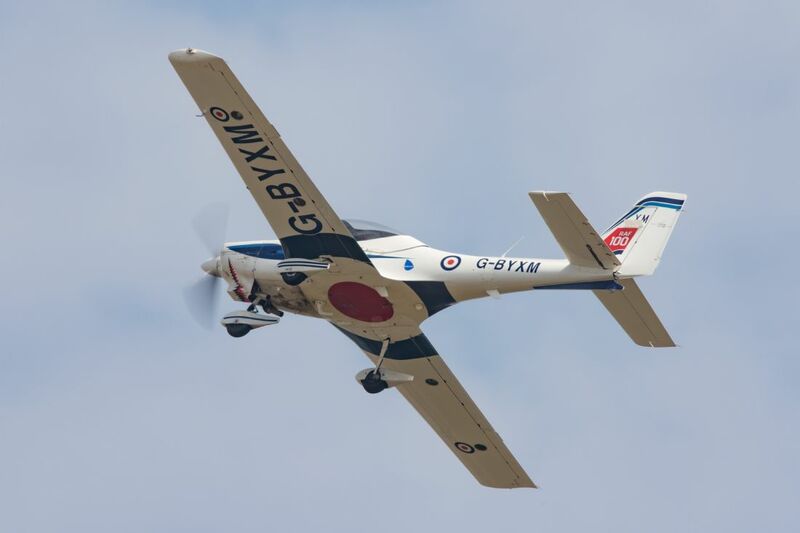 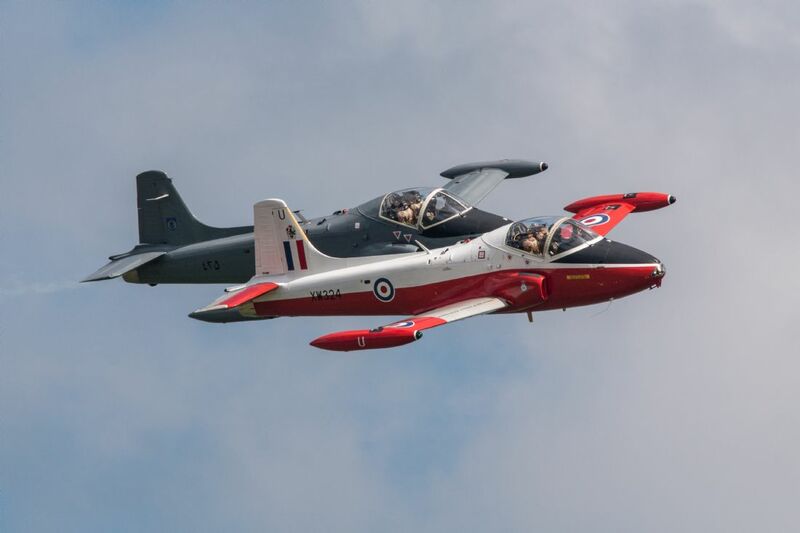 The Grob G 115 Tutor primarily used for flight training has been the mainstay of RAF flight training soon to be replaced by the Prefect. 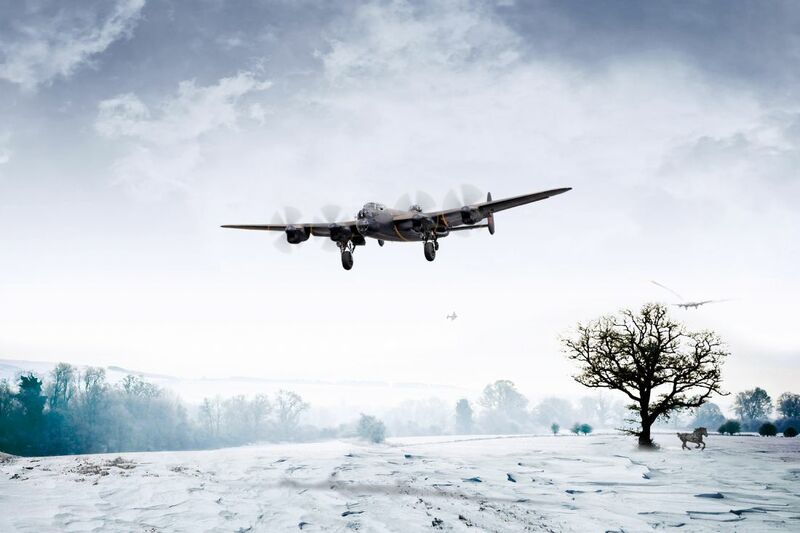 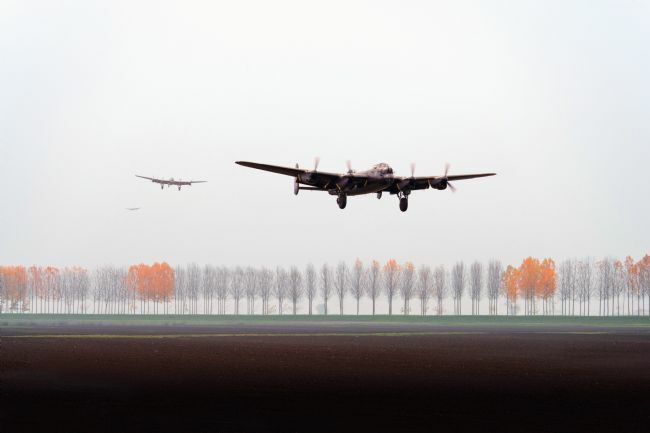 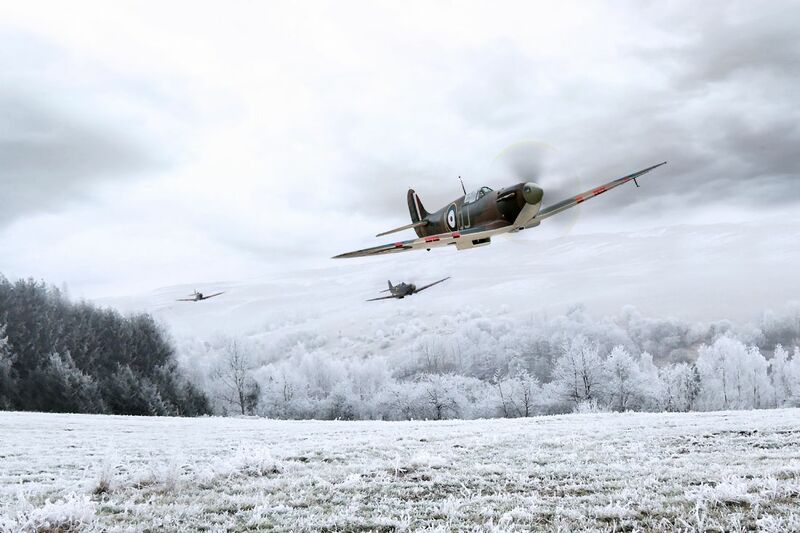 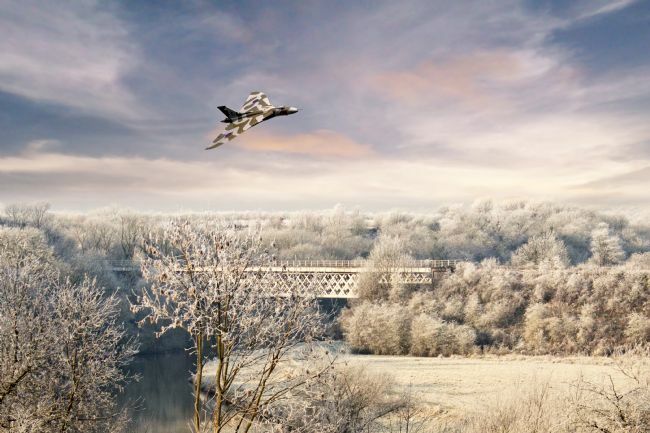 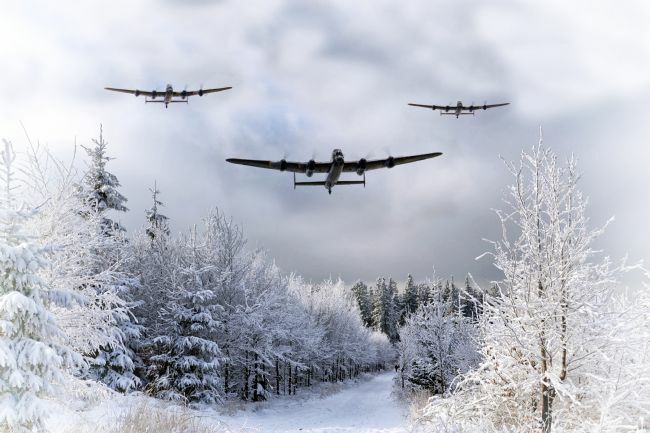 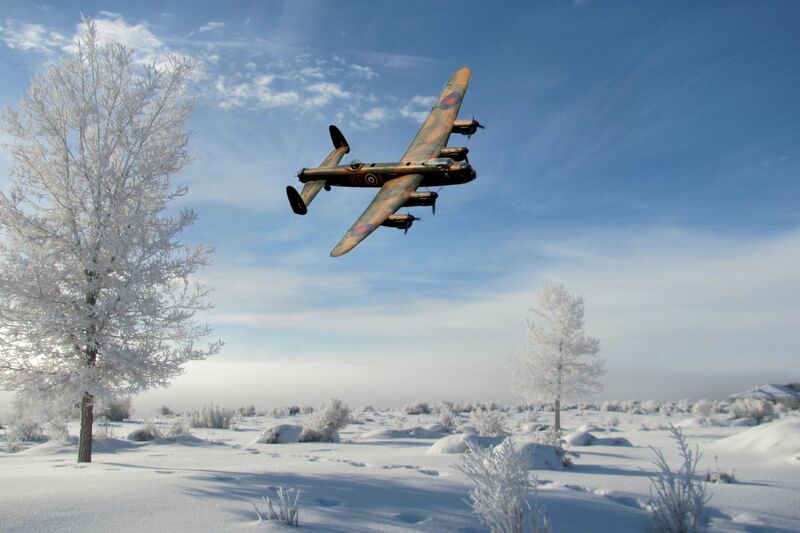 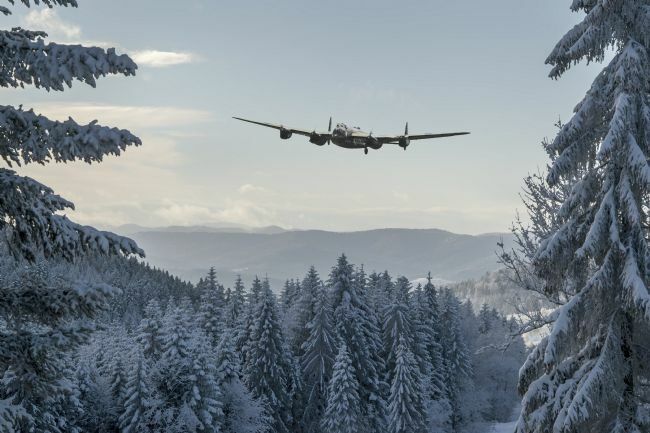 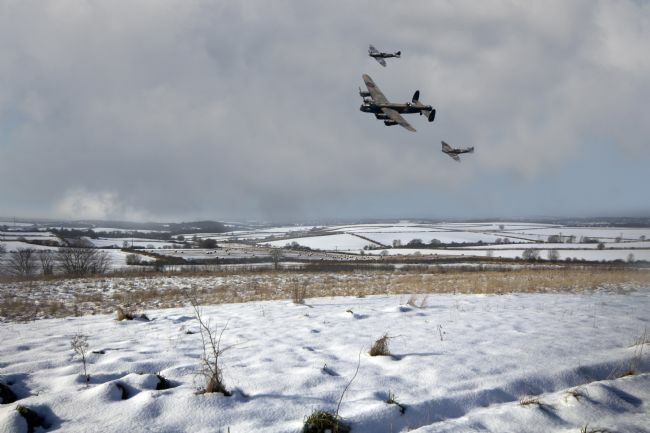 A flight of Avro Lancaster Bombers head out over a snow covered countryside Composite Image. Background available from Pexels. Overview of a small village in Kunar province, Afghanistan. 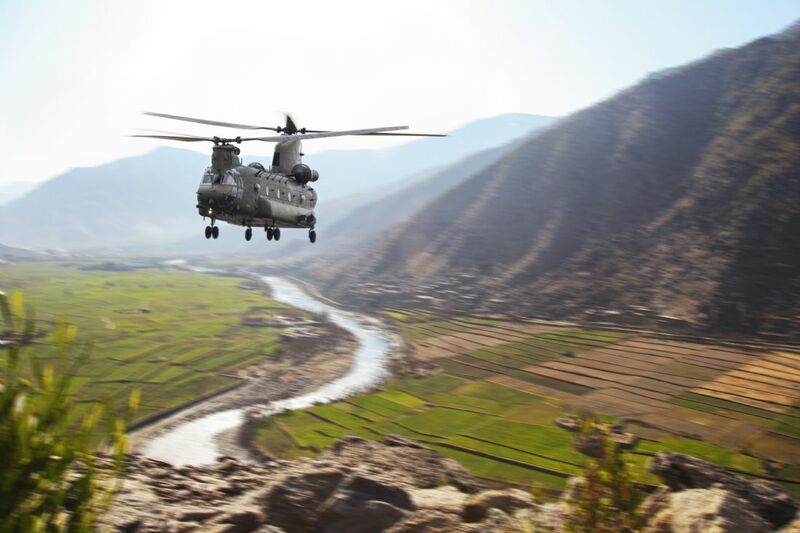 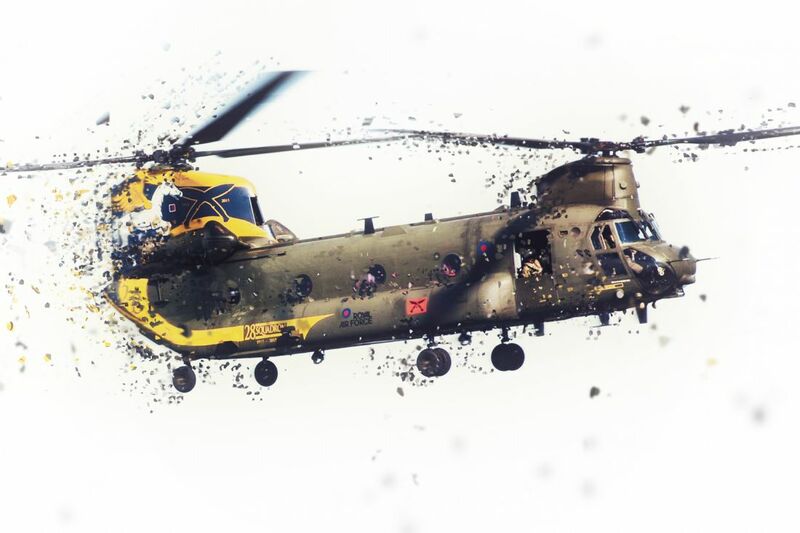 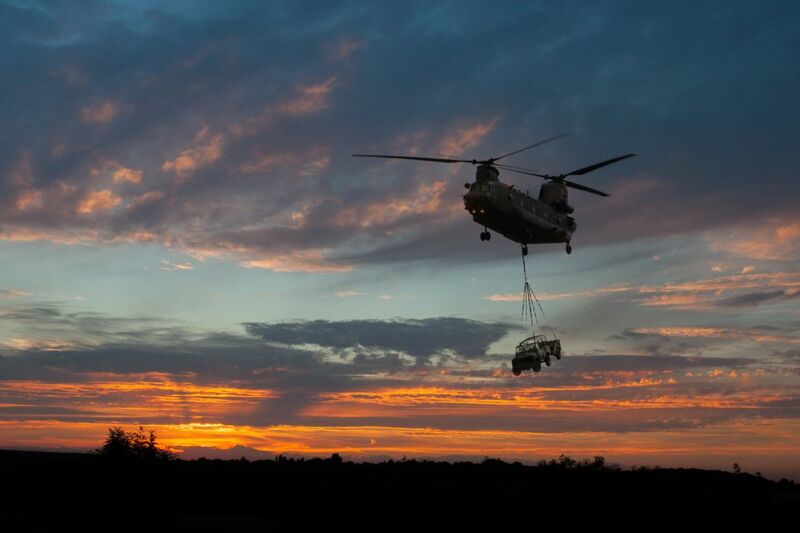 An RAF Chinook powers out of the valley after a supply drop. 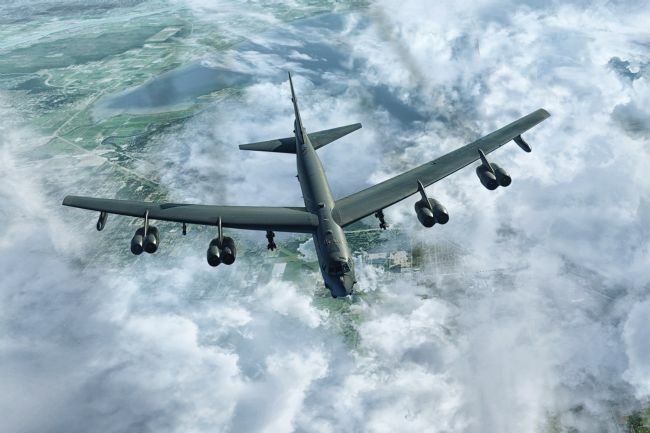 The legendary B-52 Stratofortress Strategic Bomber of the USAF. Composite Image. 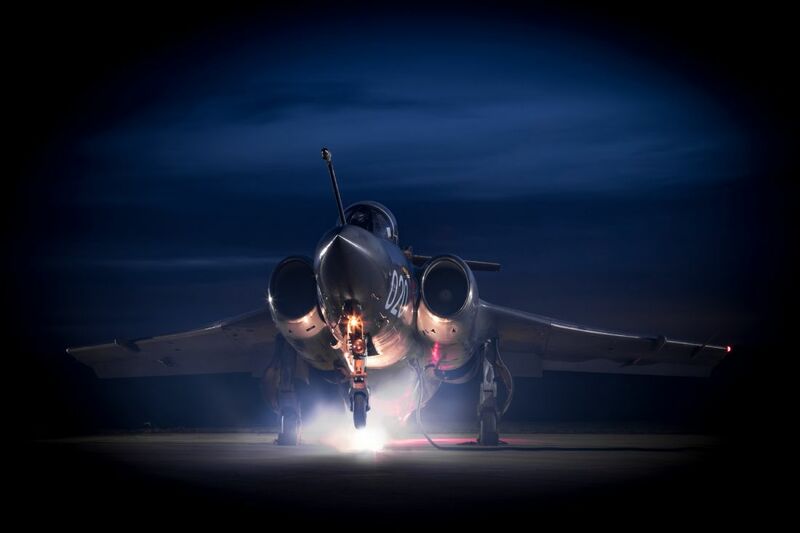 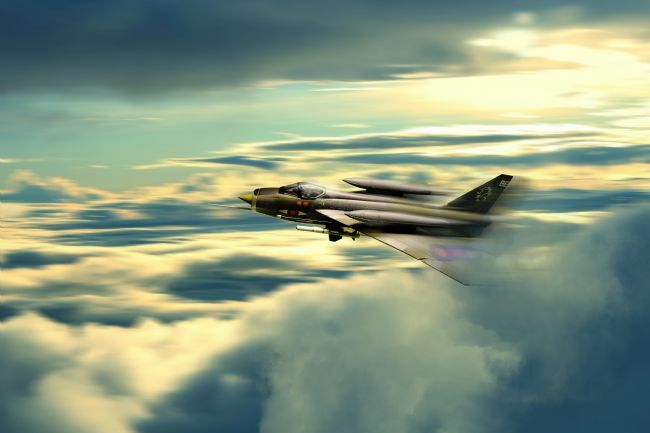 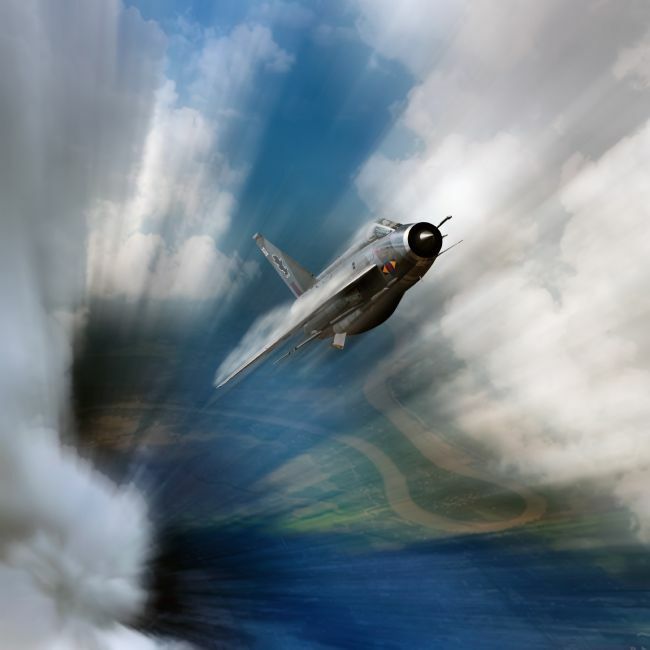 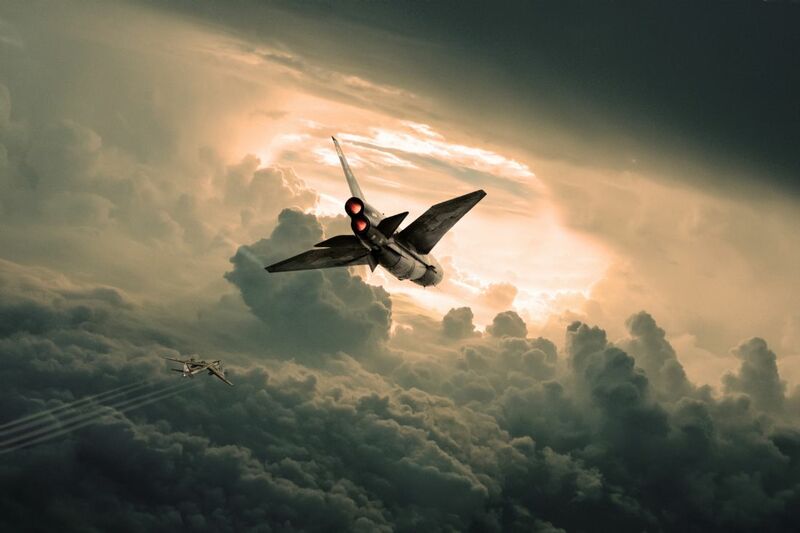 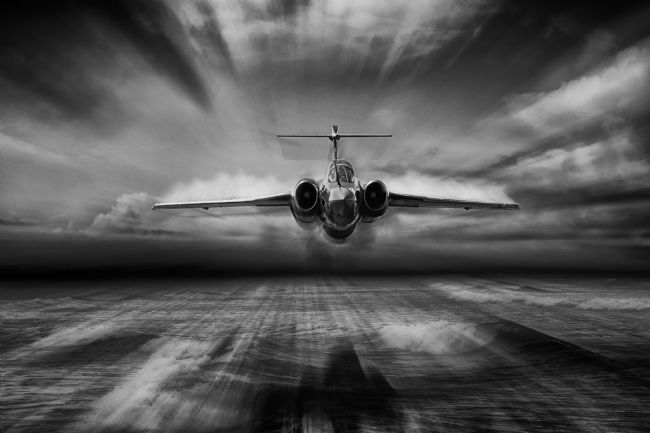 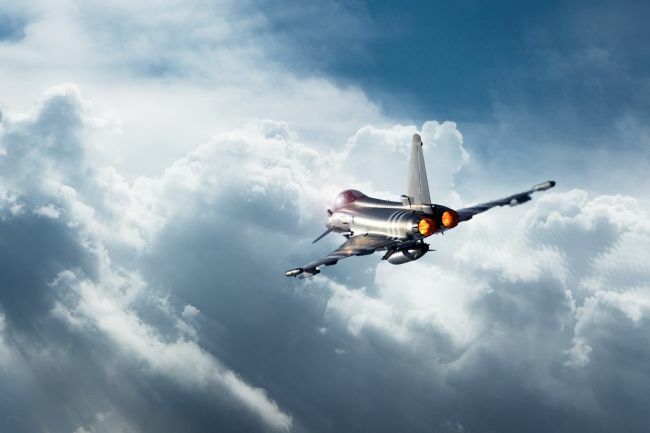 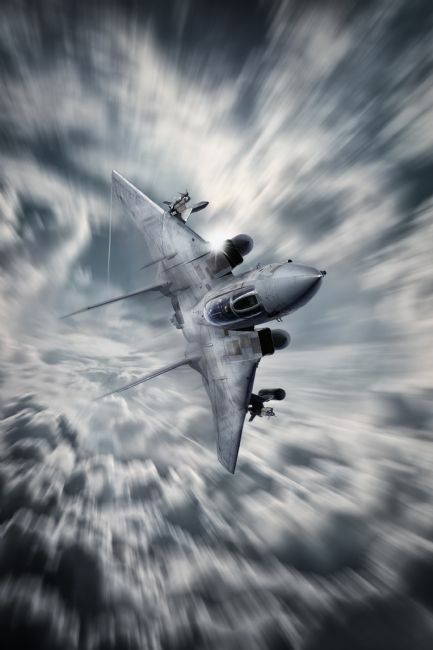 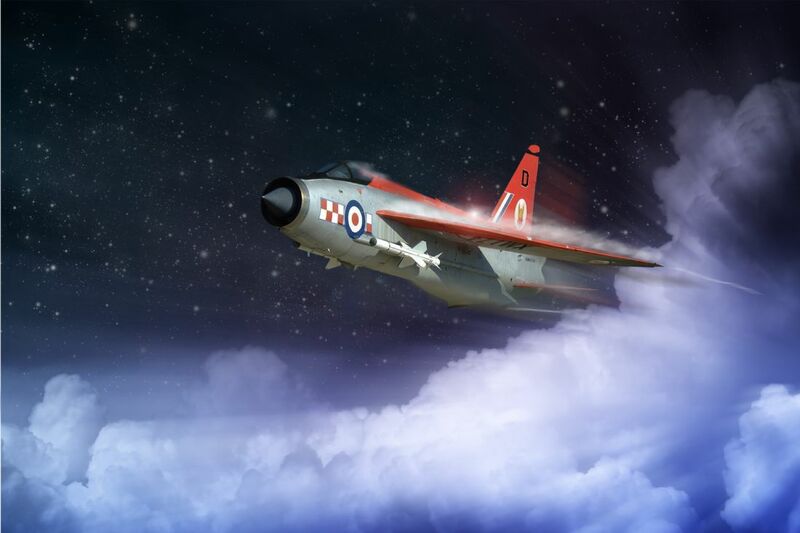 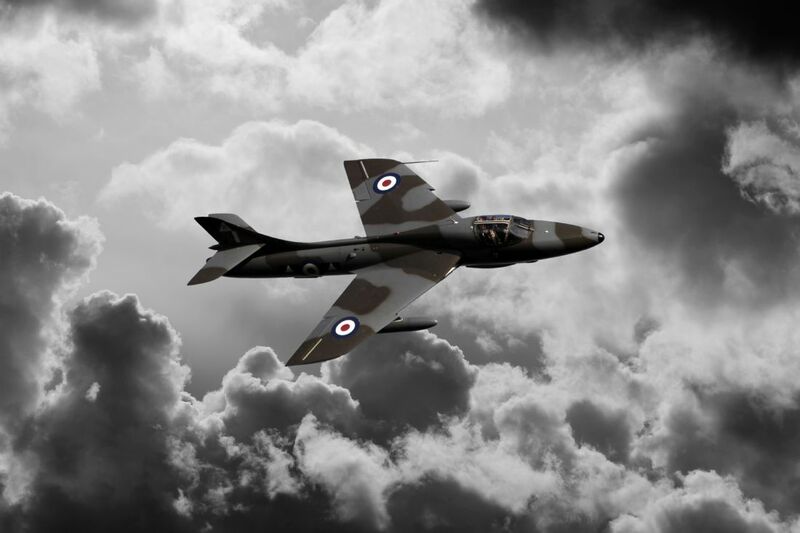 An English Electric Lightning thunders through the clouds. 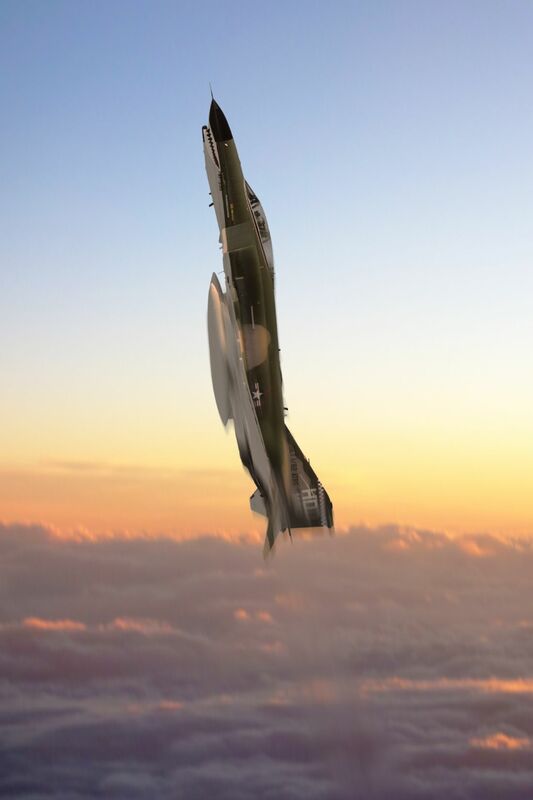 Composite Image. 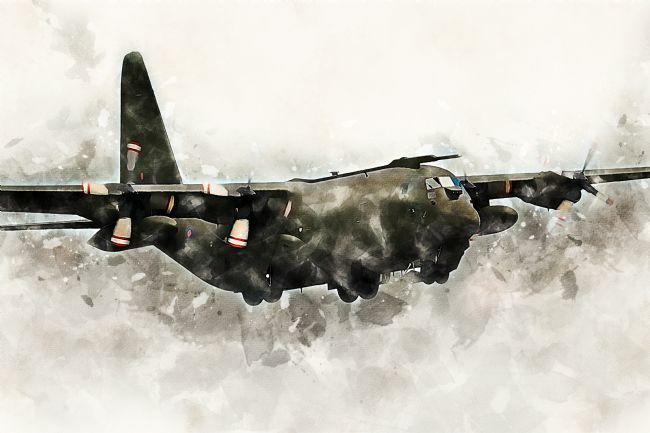 Created from stock images and digital paint techniques. 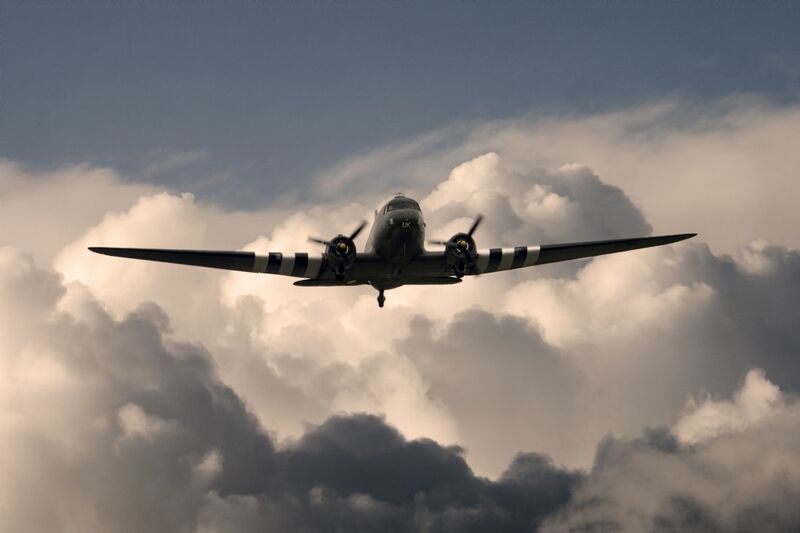 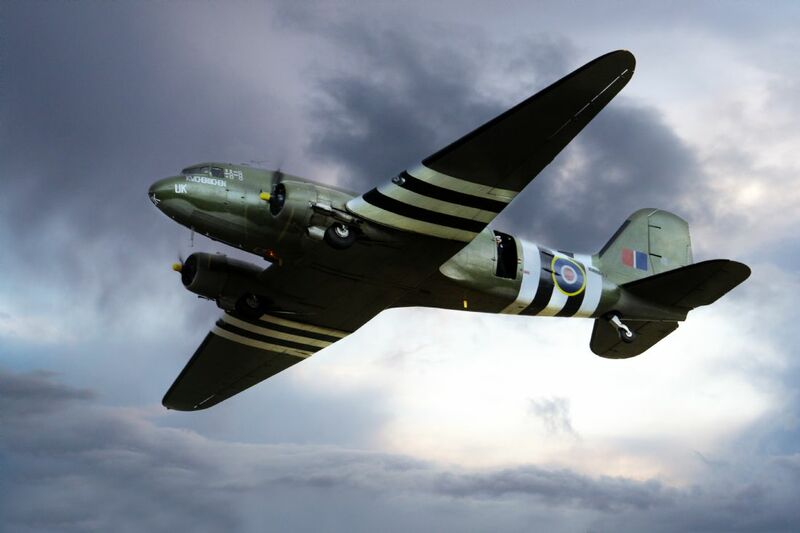 On 6th June, 233 Squadron flew Douglas C-47 'Daks' Dakotas on 21 sorties to drop supplies to elements of the British 6th Airborne Division. 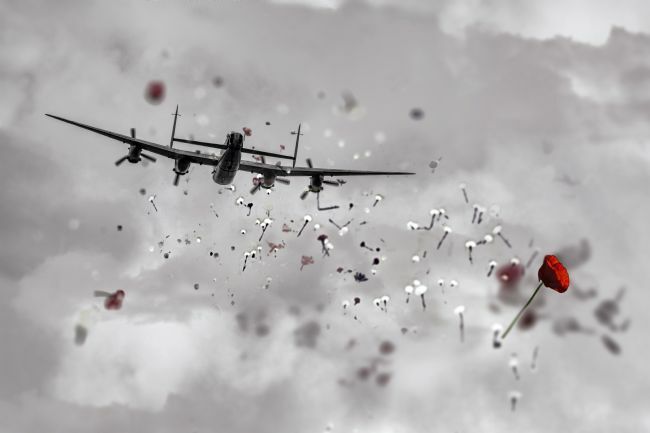 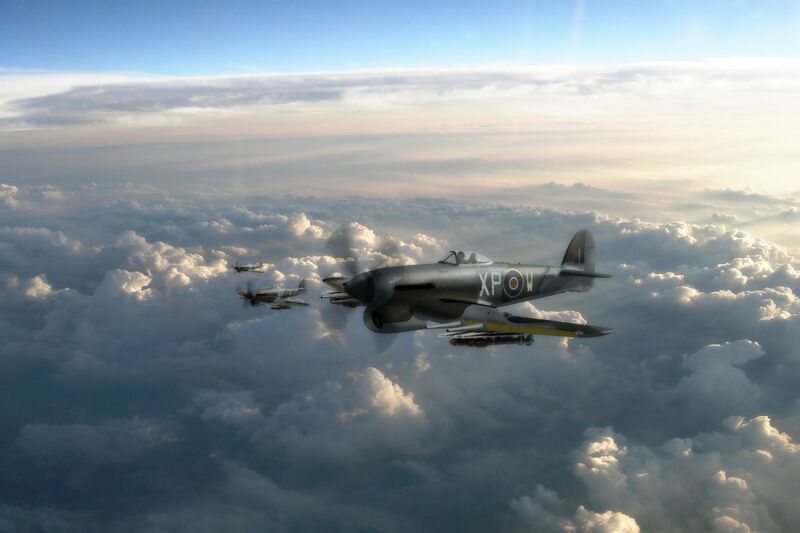 During the operations on D-Day, 4 of the Squadron’s aircraft were lost to anti-aircraft fire. 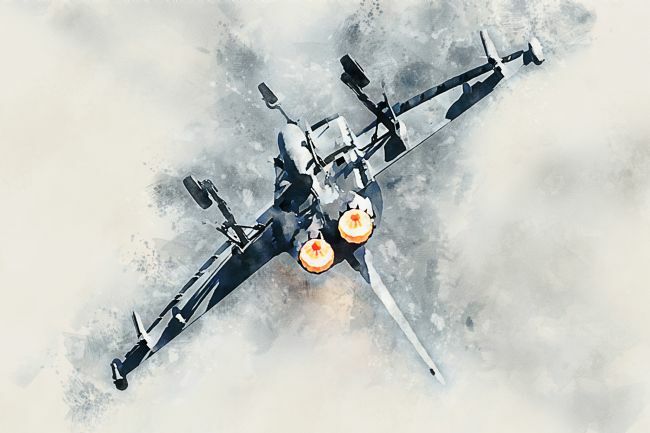 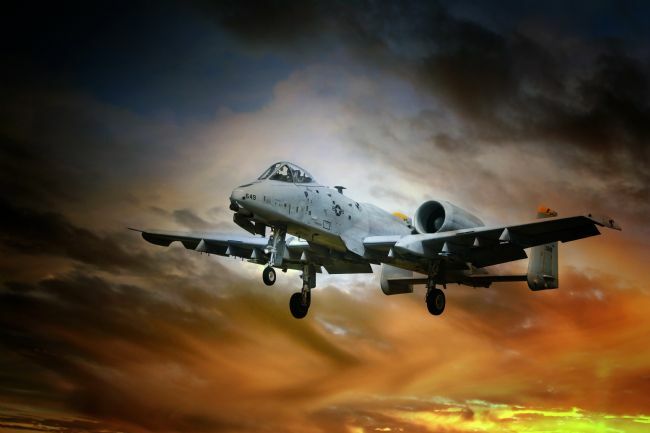 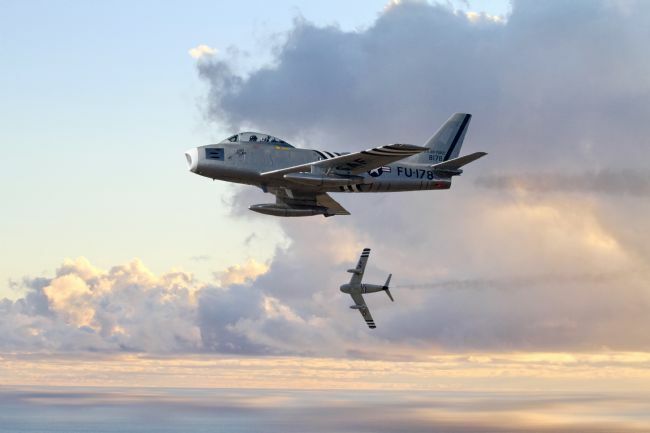 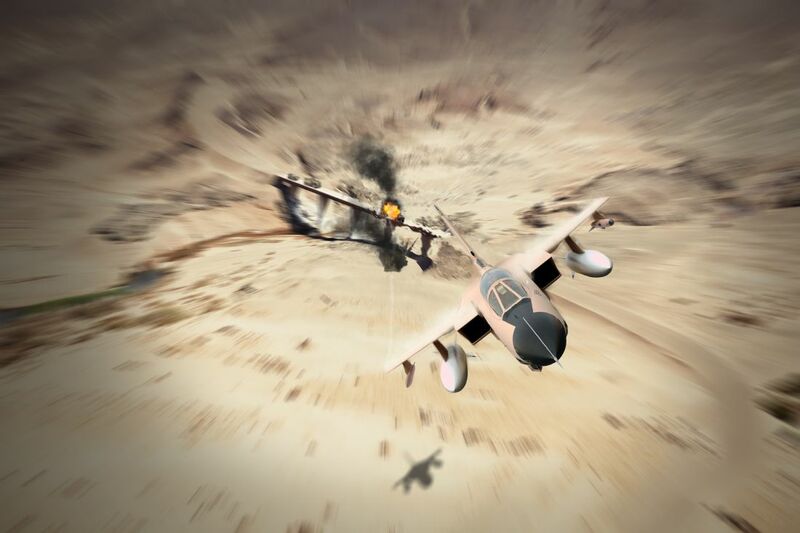 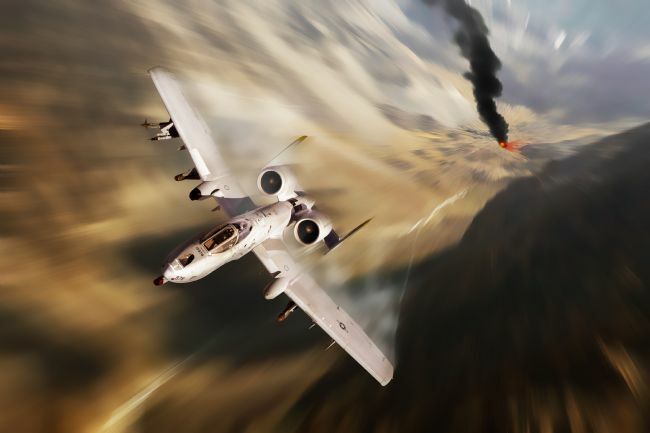 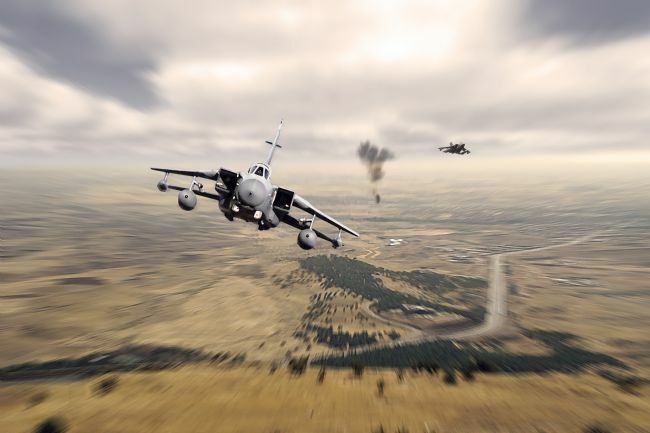 A USAF Fairchild Republic A-10 Thunderbolt II hitting targets on a Close Air Support mission Digital Artwork. Created using stock imager and digital painting techniques. 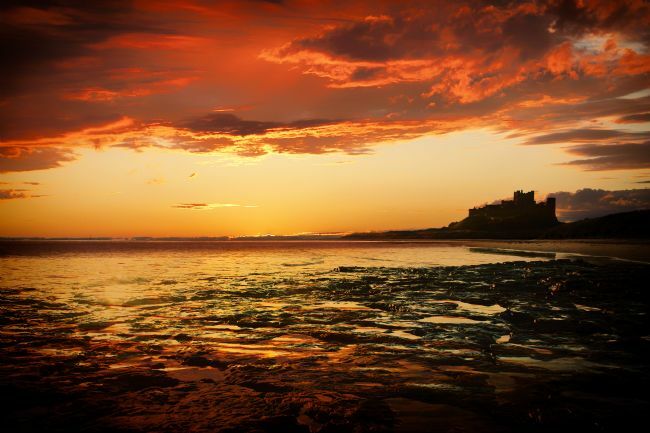 Beautiful Bamburgh sunrise on the Northumberland coast. Bamburgh Castle silhouetted in the foreground. 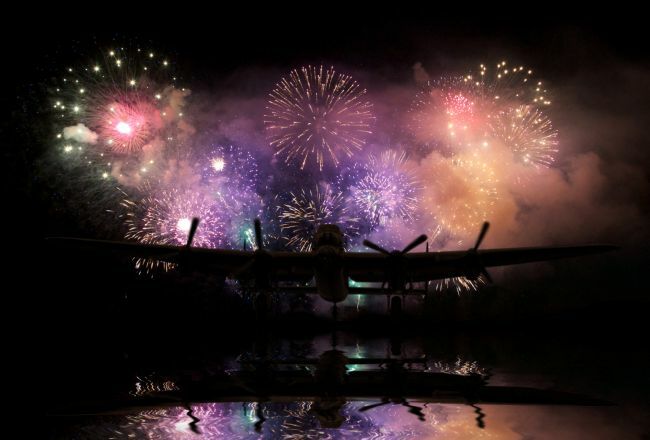 Lancaster Bomber Just Jane and Fireworks. 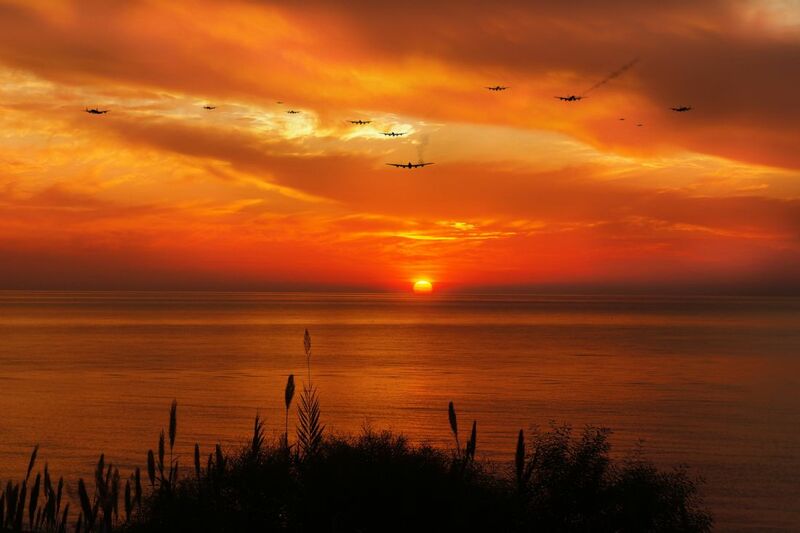 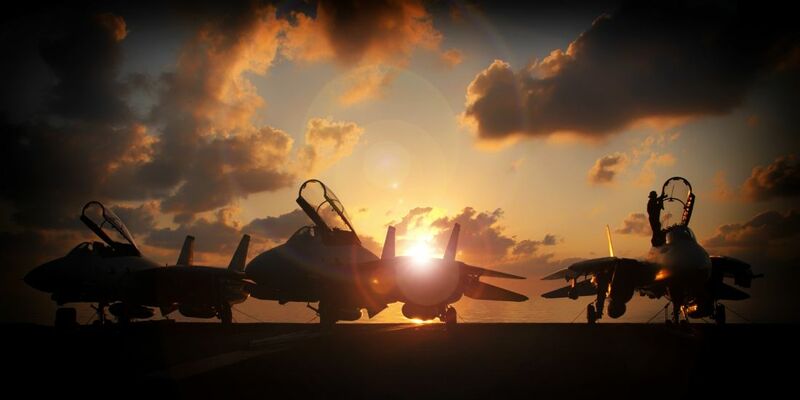 F-14 Tomcats sitting on the deck of the USS Carl Vinson as the sun sets Composite image created entirely from images the Public domain. 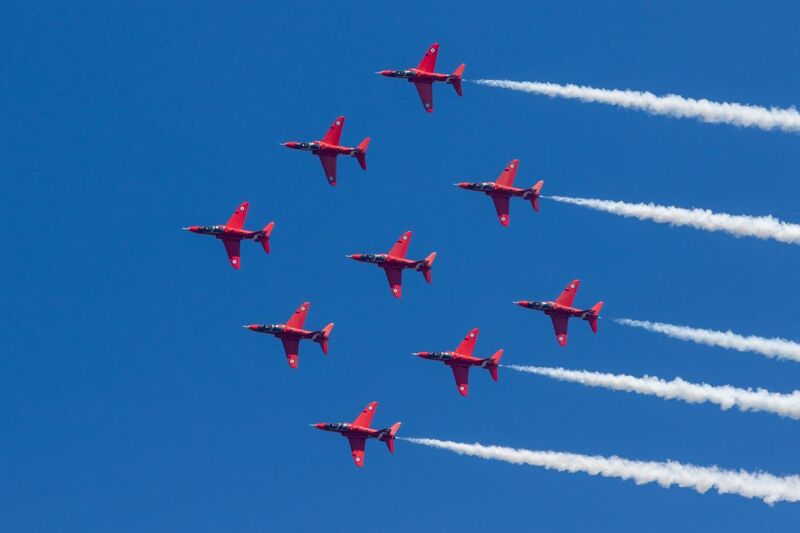 Wikimedia and Pexels. 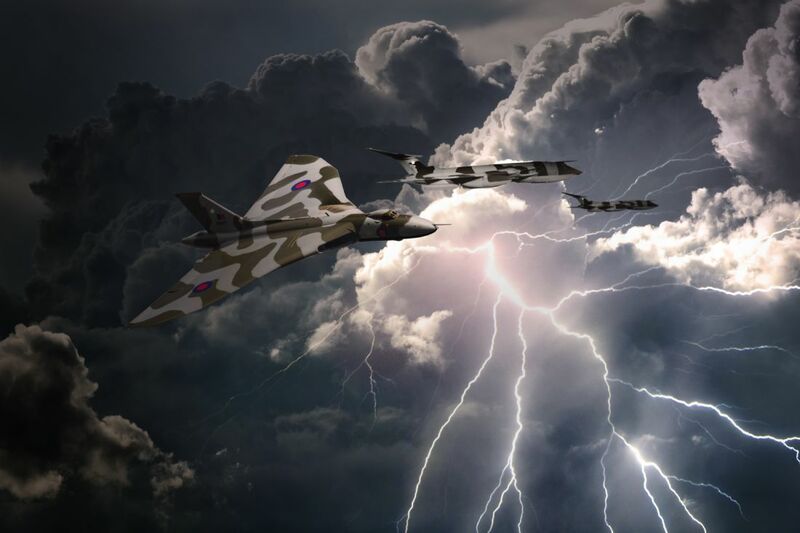 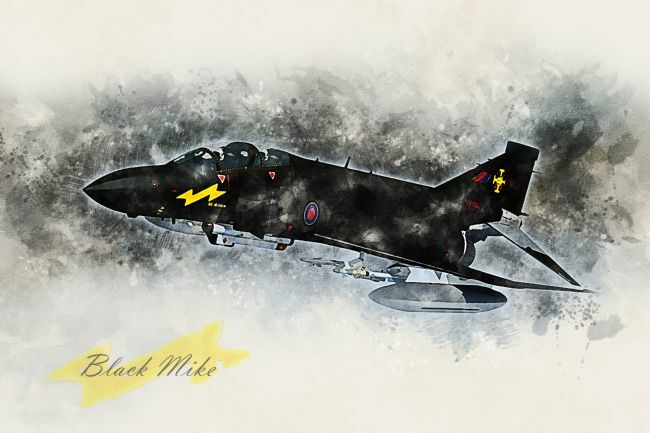 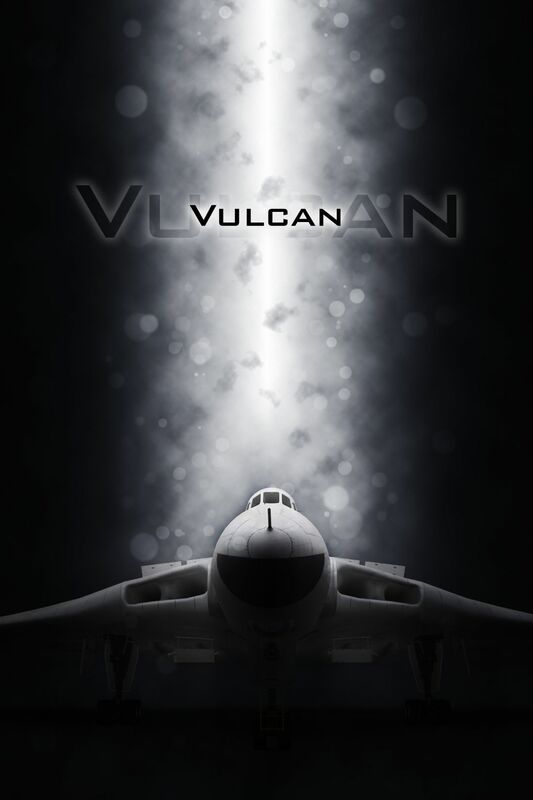 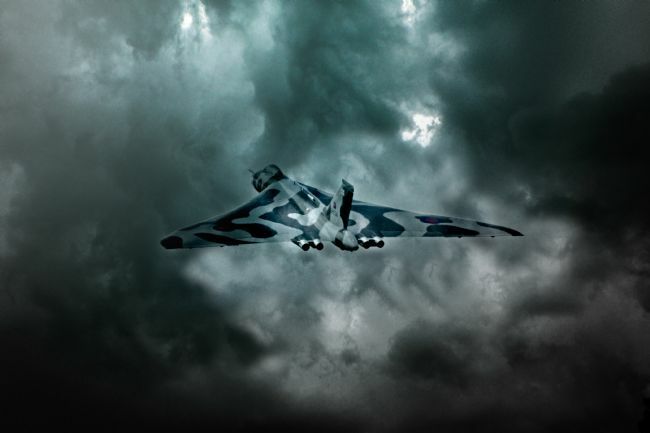 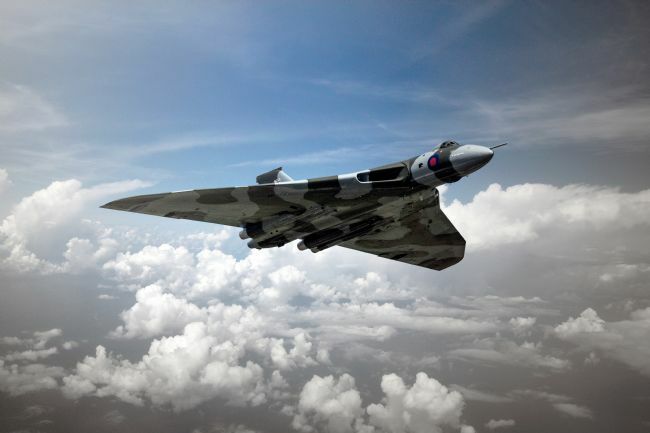 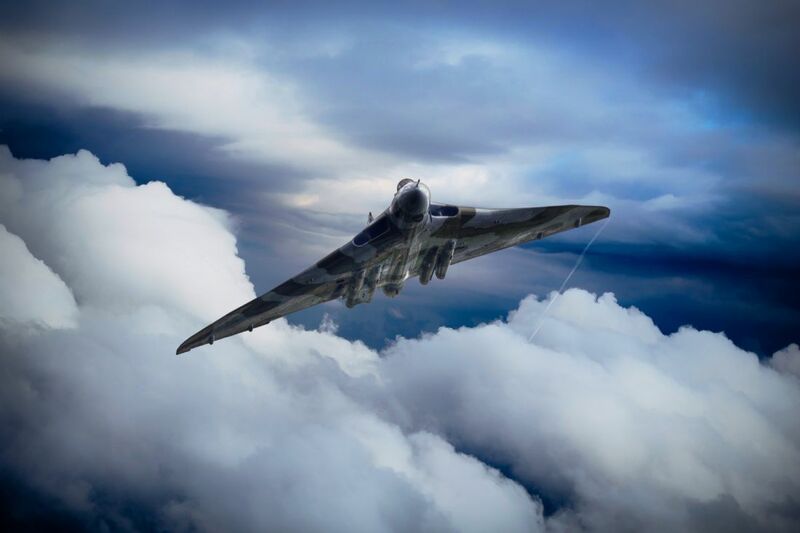 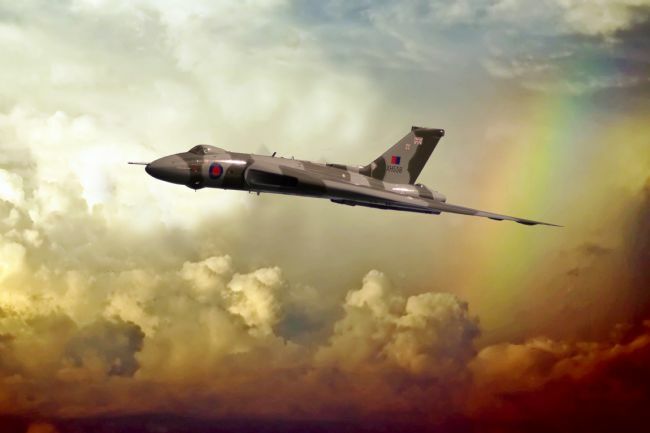 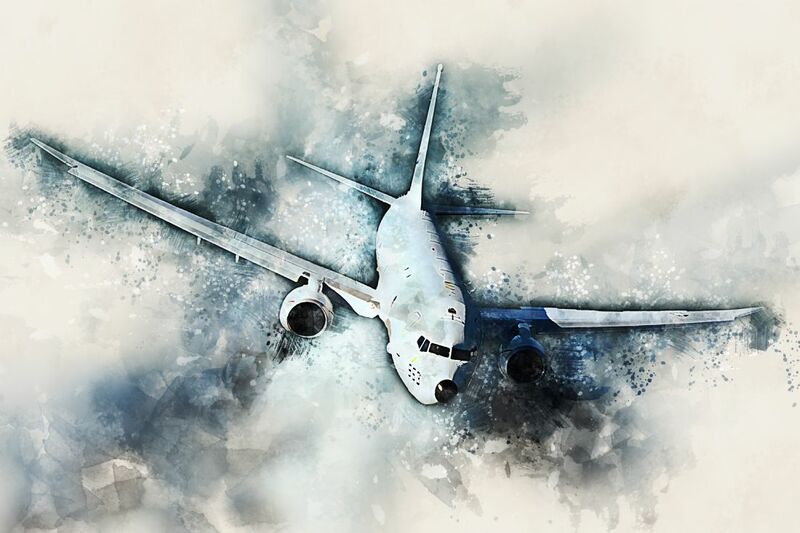 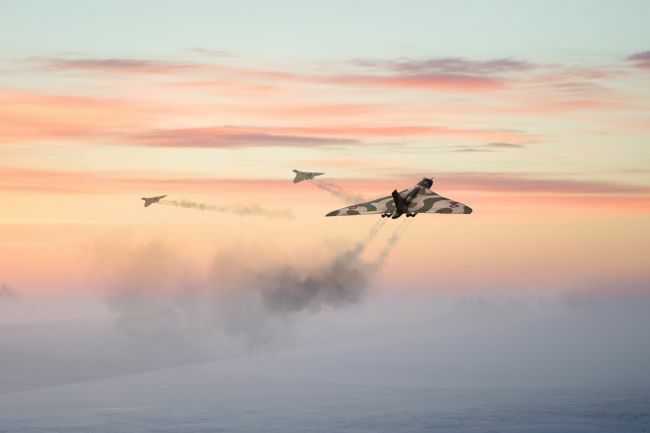 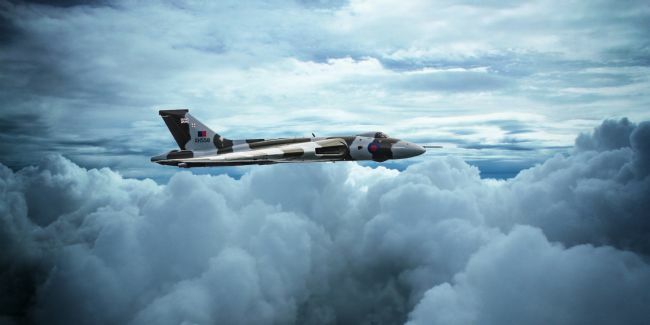 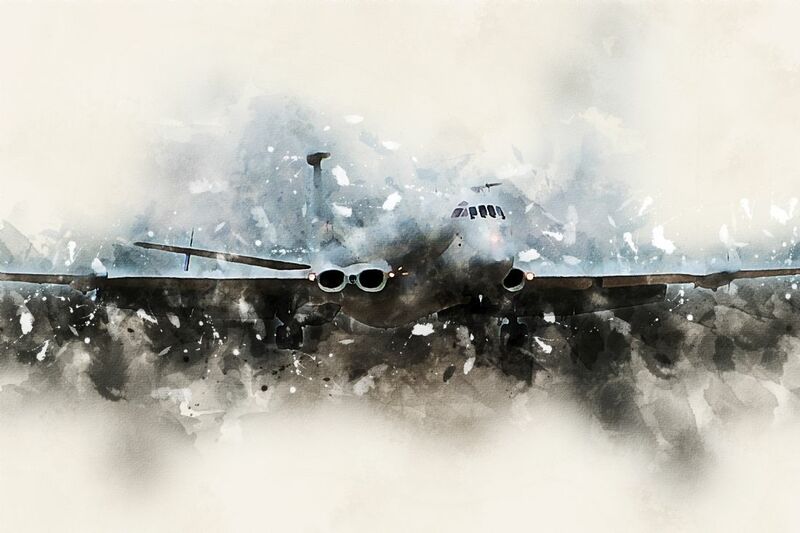 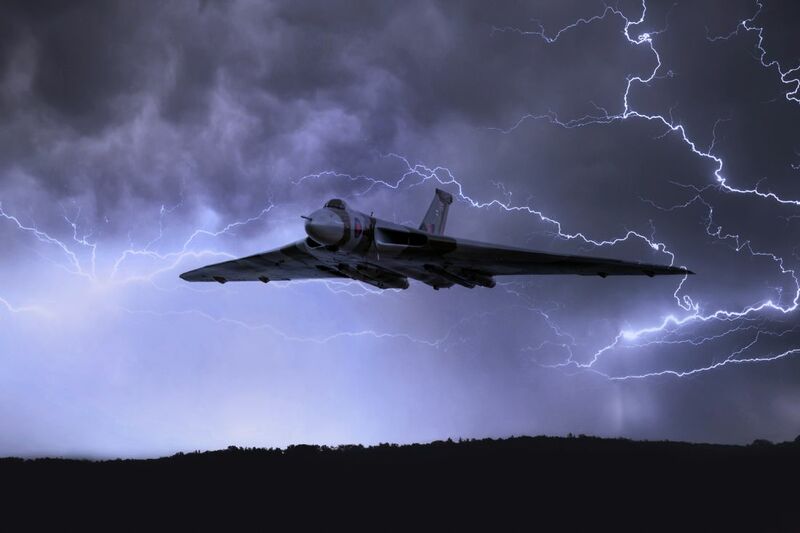 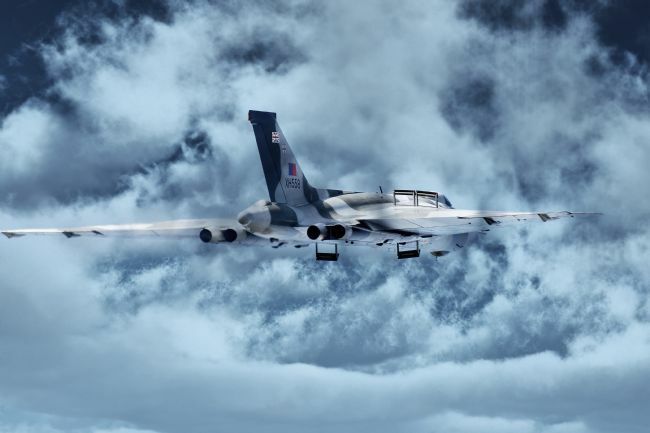 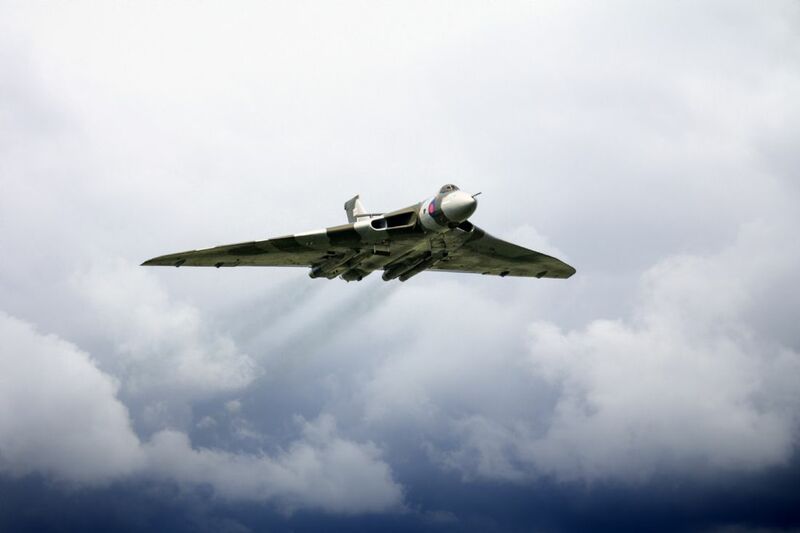 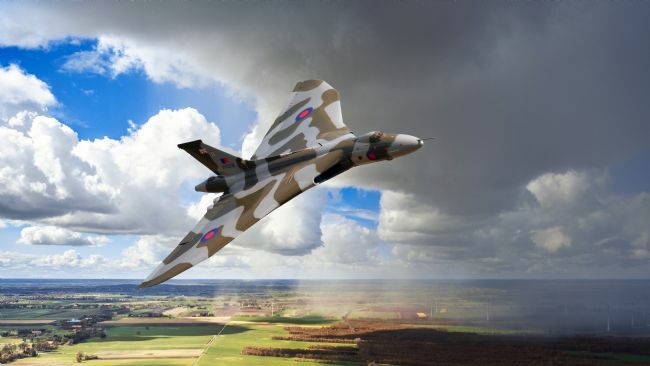 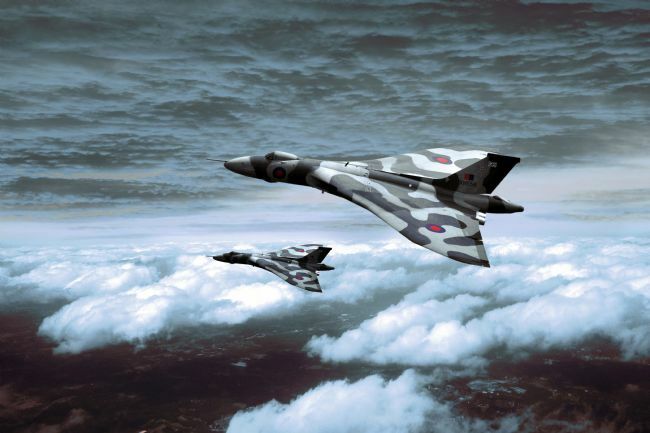 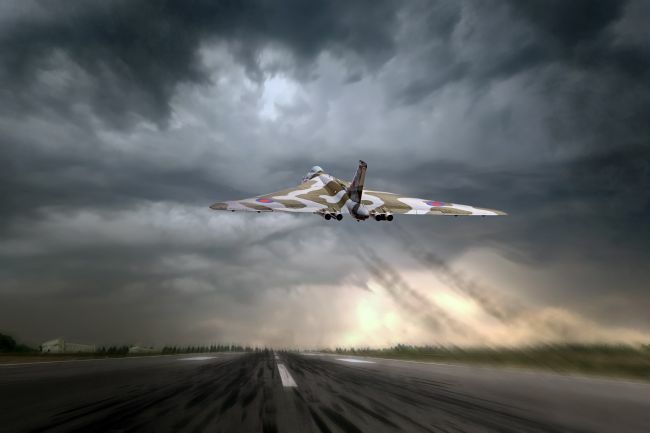 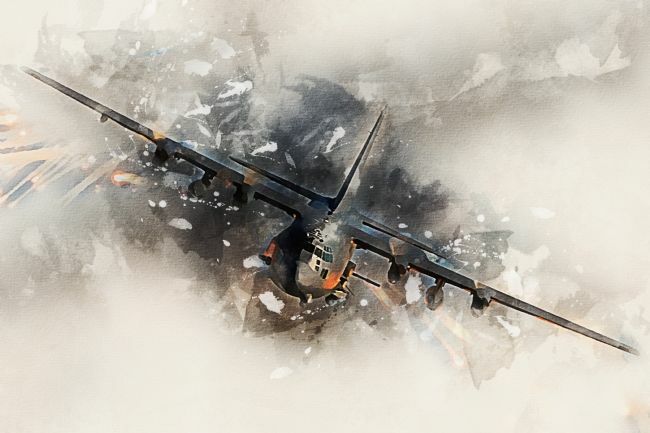 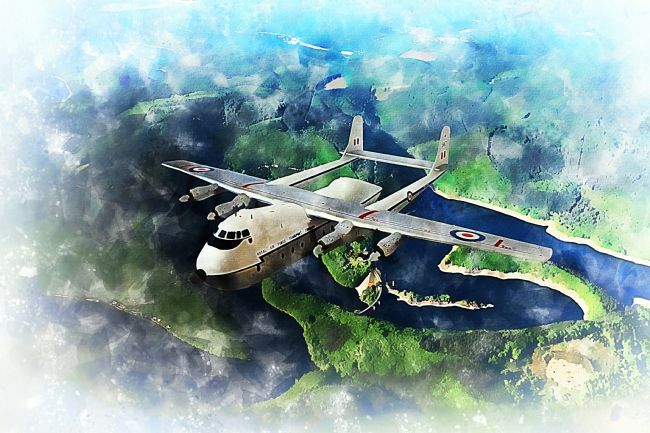 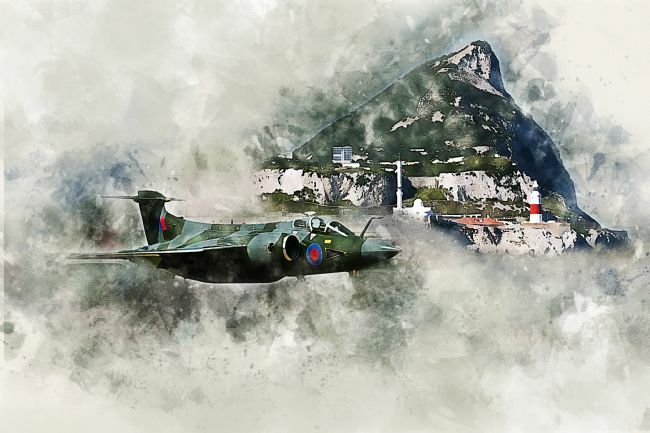 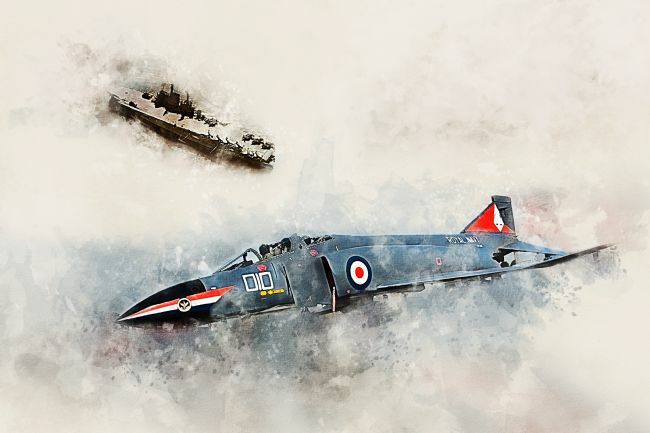 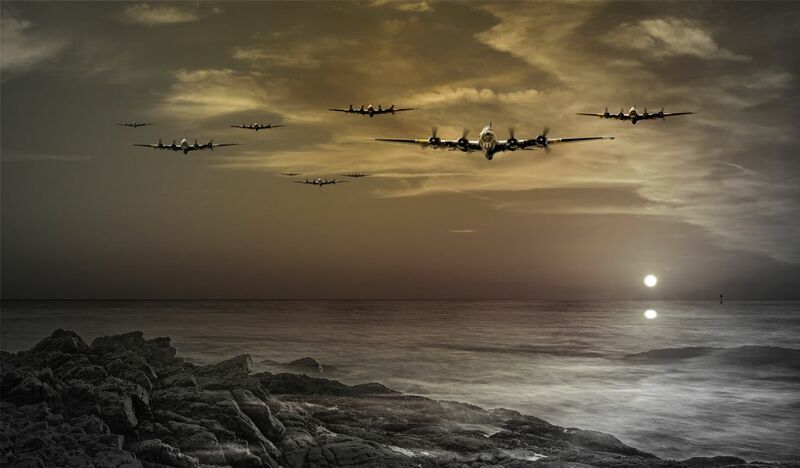 During Operation Black Buck 1, Flight Lieutenant Martin Withers and his crew aboard Vulcan 607 and its Victor K2 tankers find themselves flying through a violent electrical storm over the South Atlantic or their way to Port Stanley. 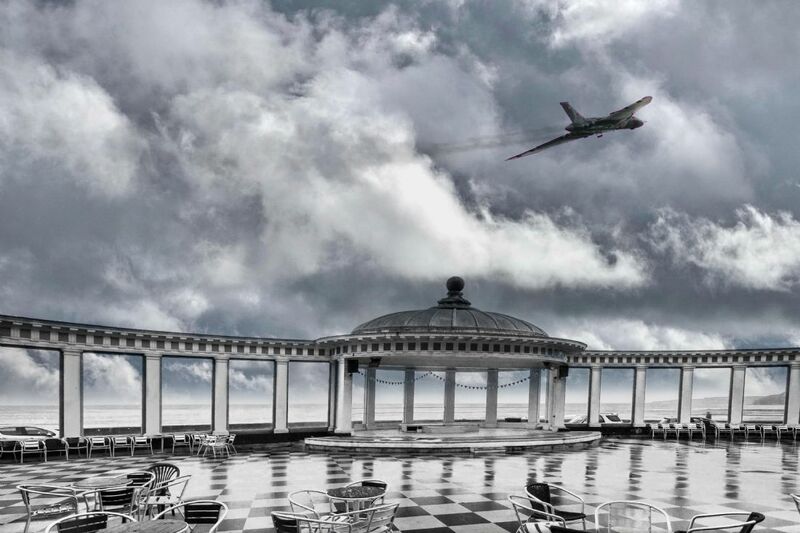 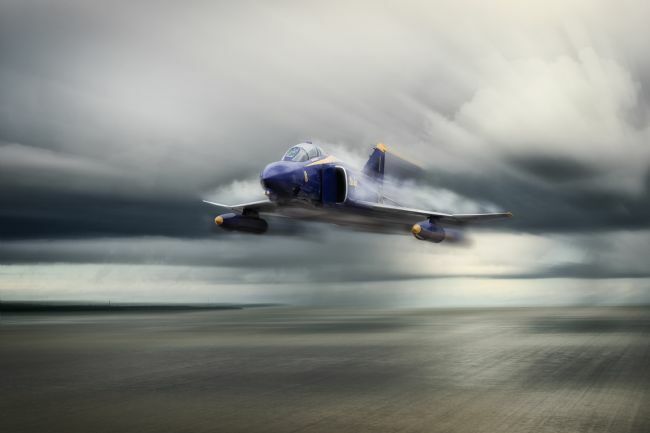 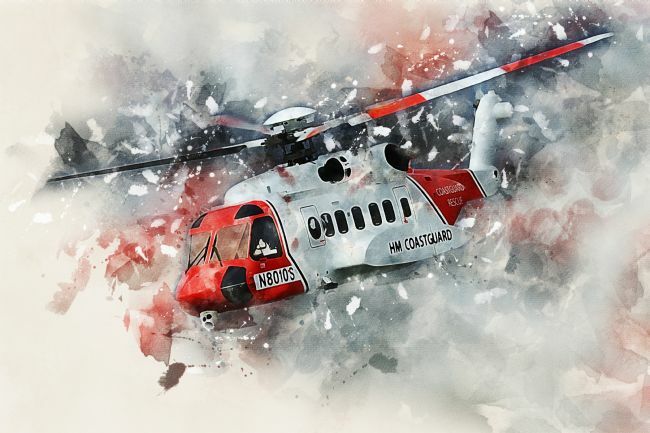 Composite image created using photographs and digital painting techniques. 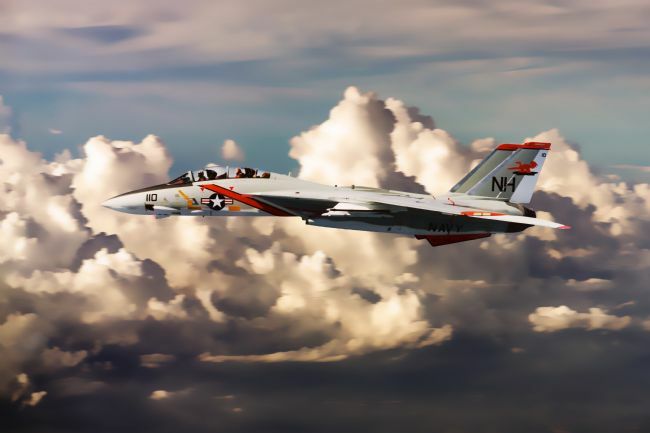 A US Navy Grumman F-14 Tomcat from VF-213 the Black Lions. 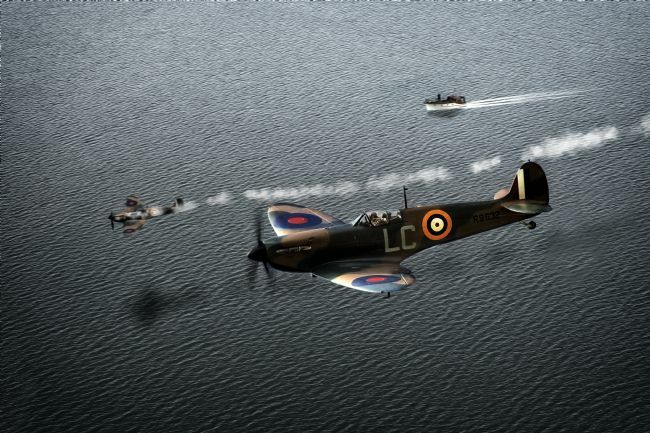 Composite Image created from images available in the Public Domain. Wikimedia and Pexels. 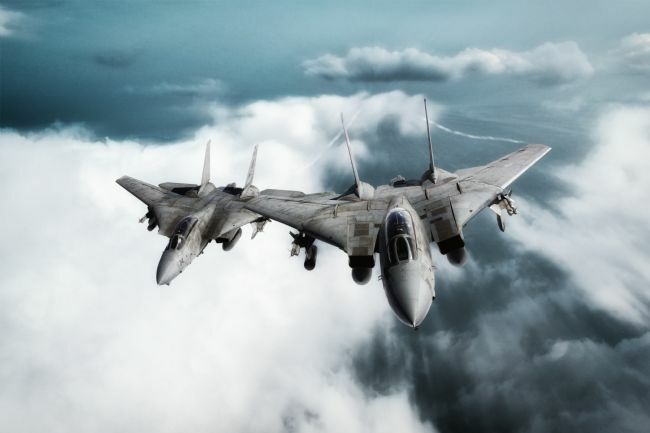 F-14 Tomcats from Strike Fighter Squadron 213 Blacklions of the US Navy Composite Image. Created using images taken from the Public Domain. 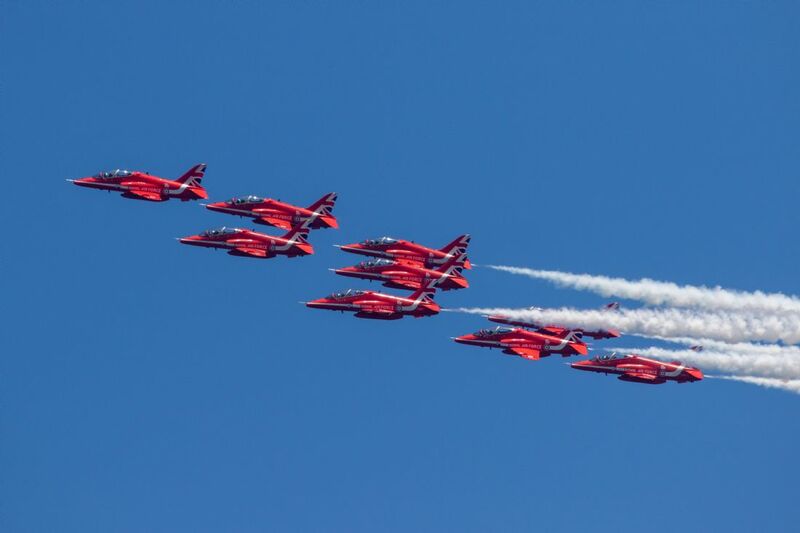 Wikimedia and Pexels. 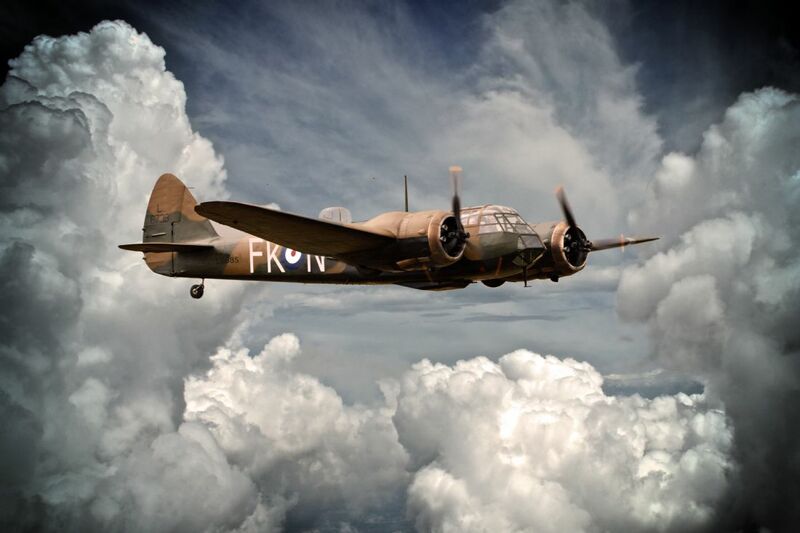 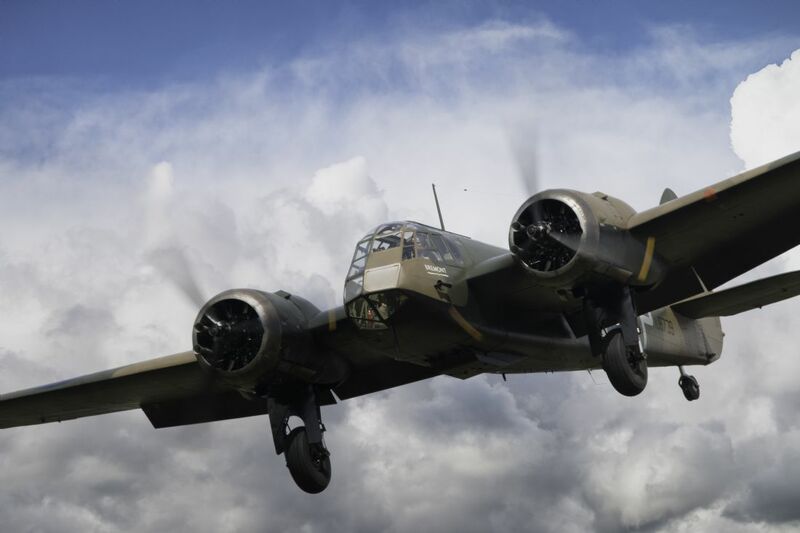 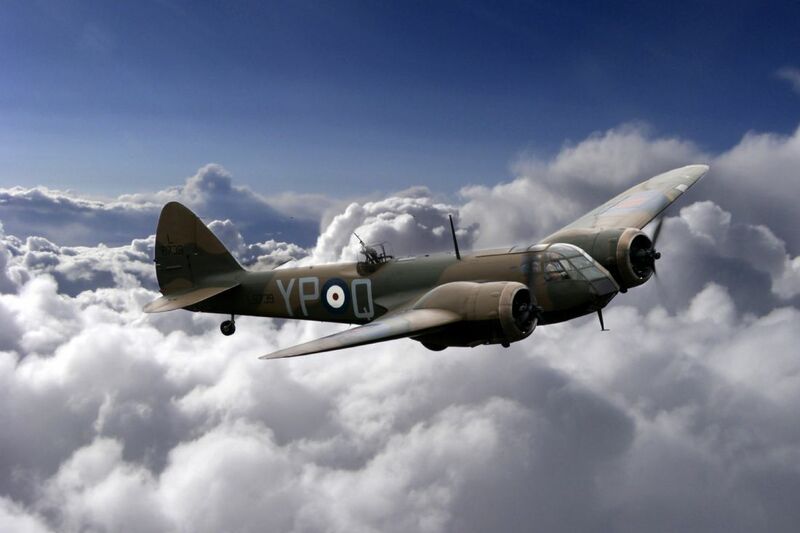 The Bristol Blenheim, a light bomber aircraft used extensively throughout the Second World War. Composite Image. Background image taken from Pexels. 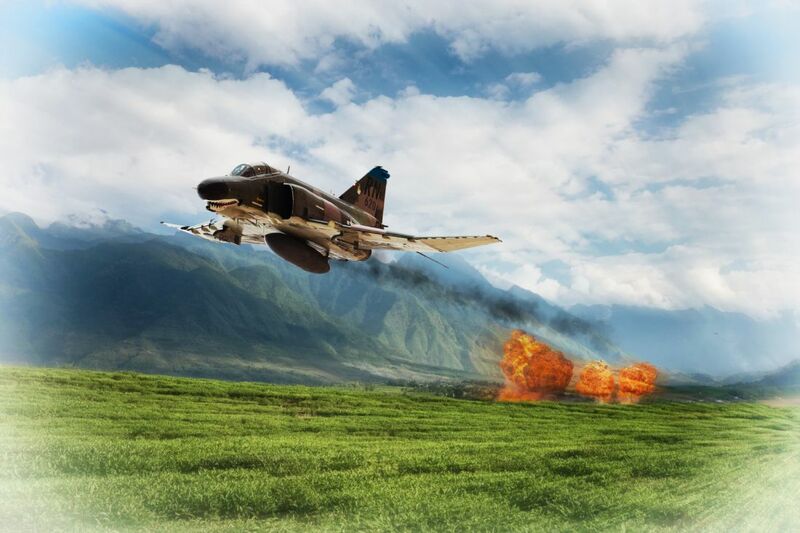 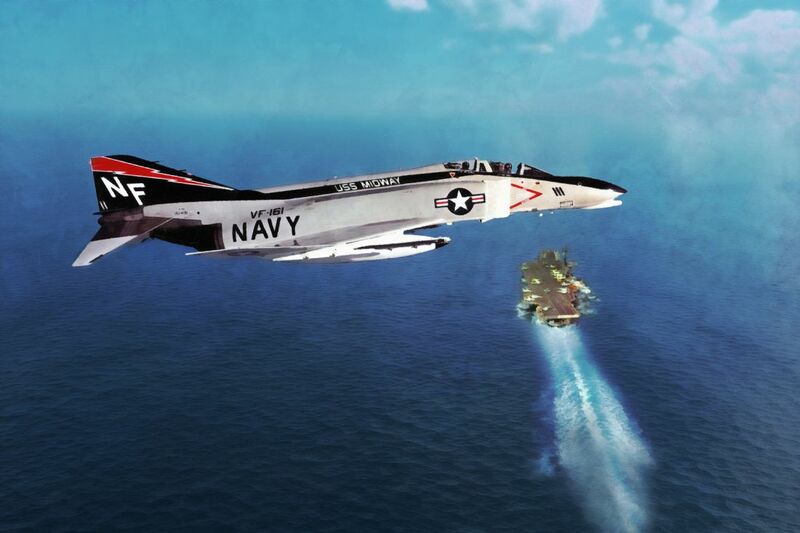 USAF F-4 Phanom hitting targets in the Vietnamese Jungle Composite Image. 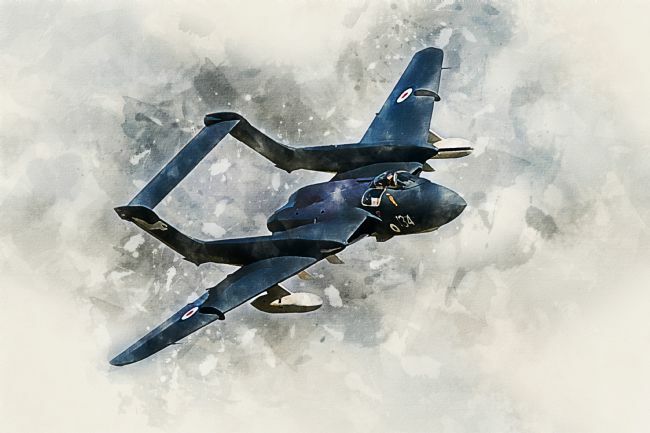 Created using images available in the Public Domain. Pexels. 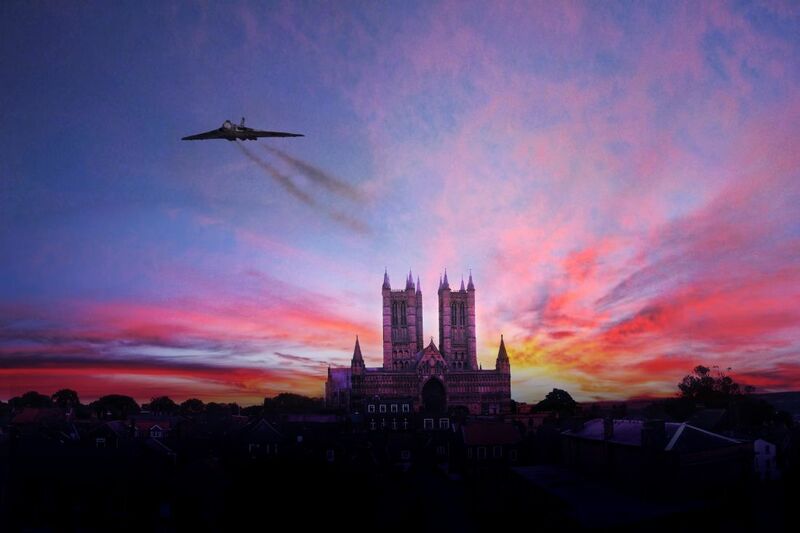 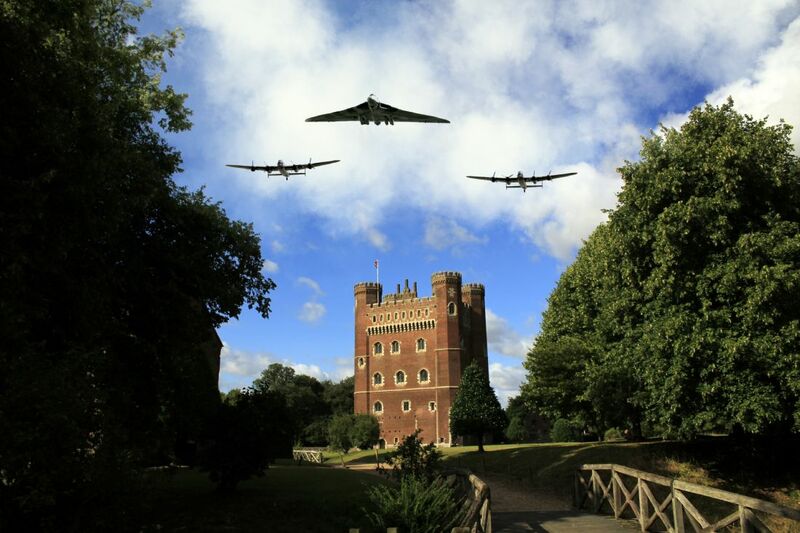 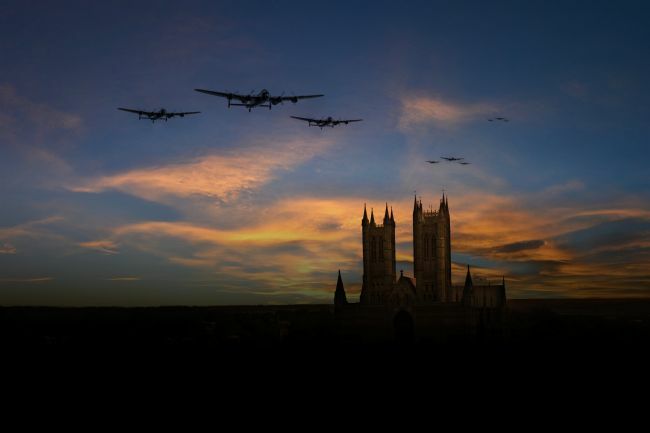 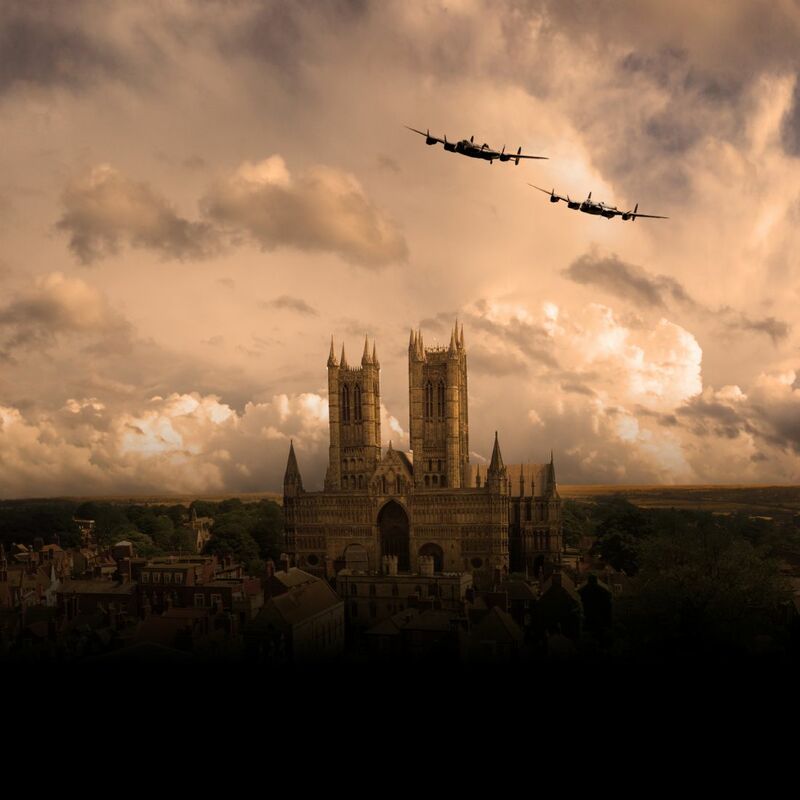 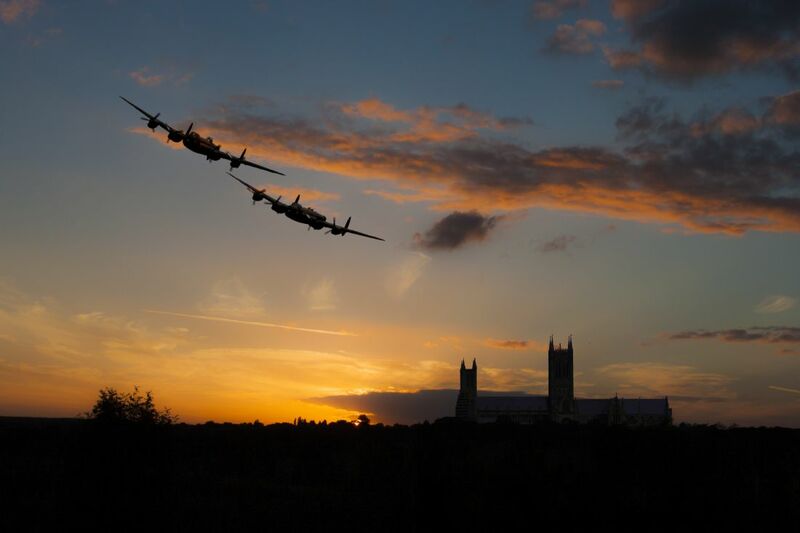 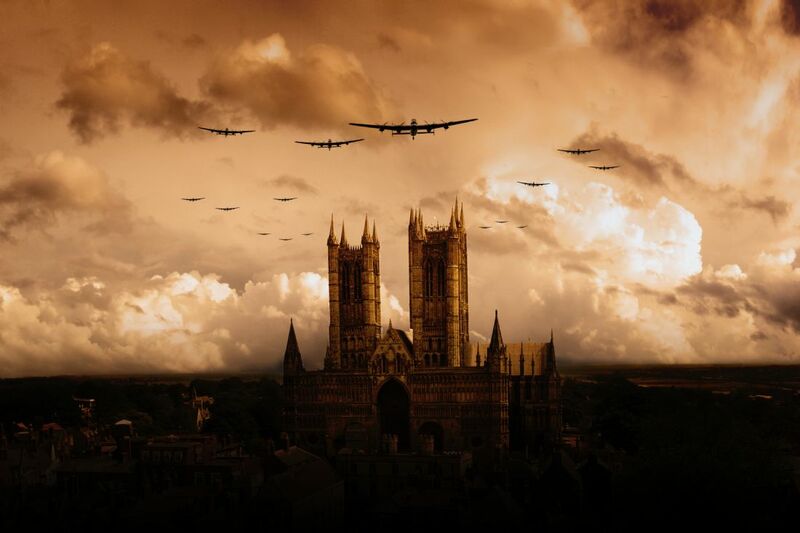 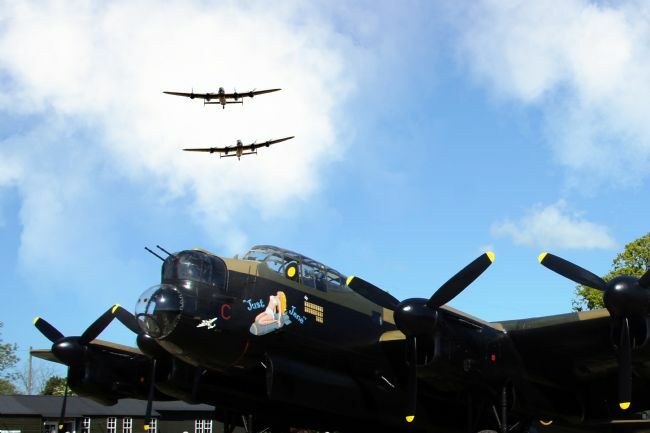 Lancaster Bombers over the iconic Lincolnshire landmark, the Cathedral on the hill. 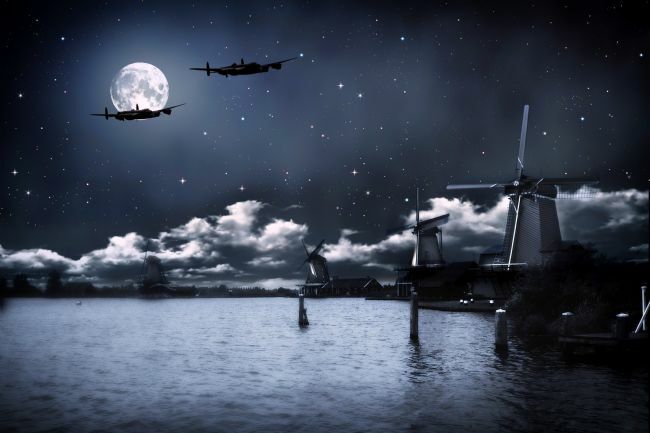 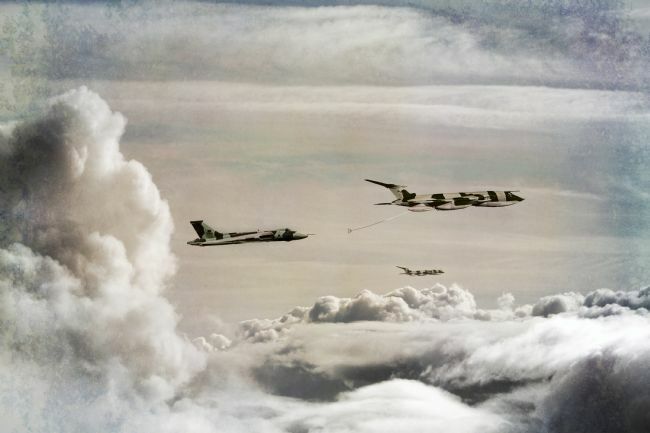 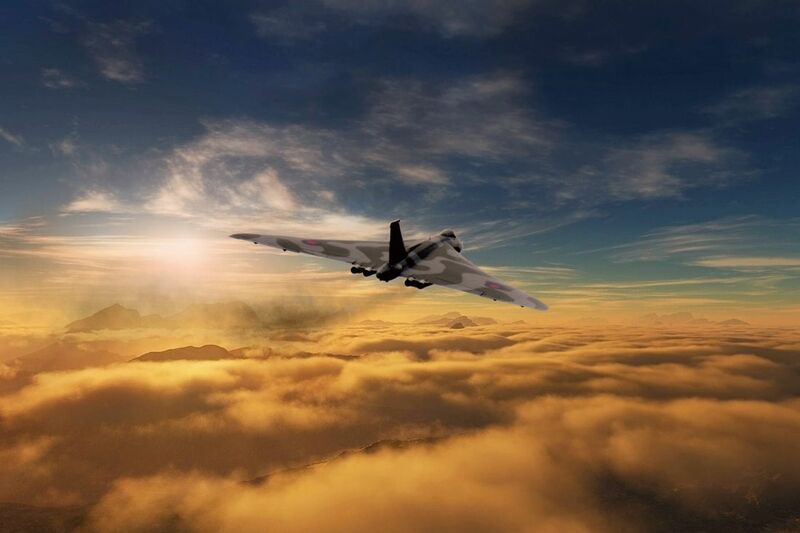 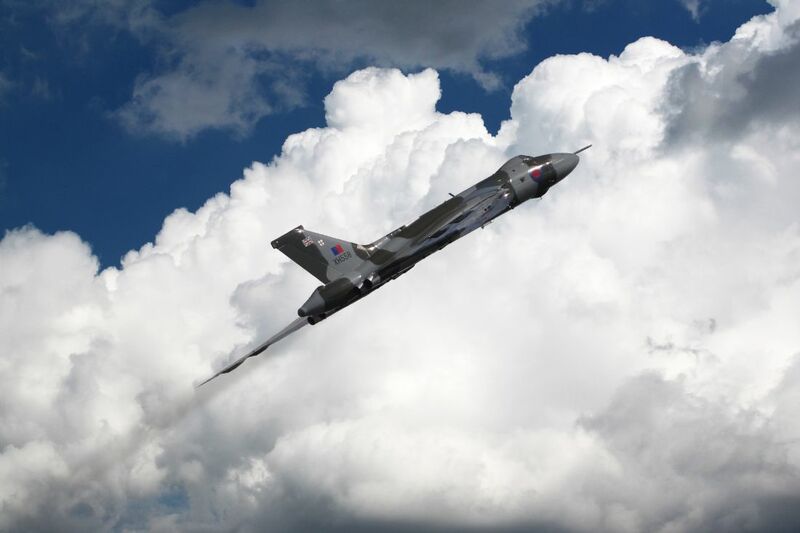 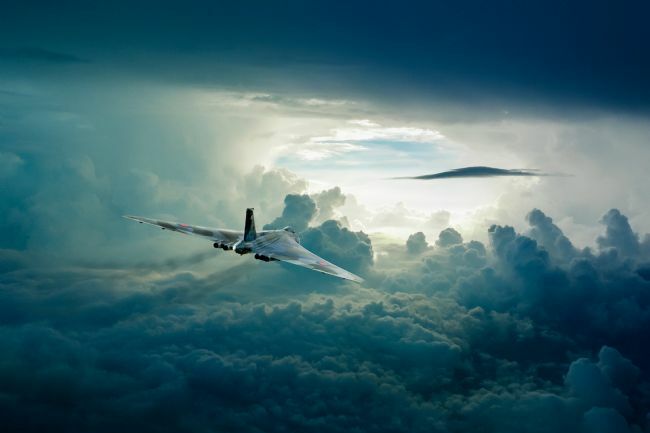 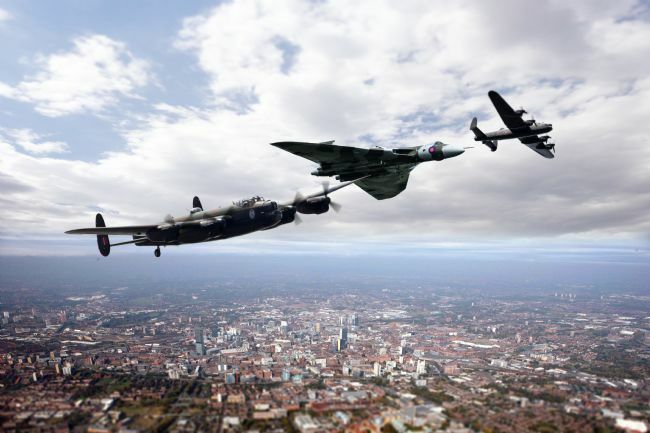 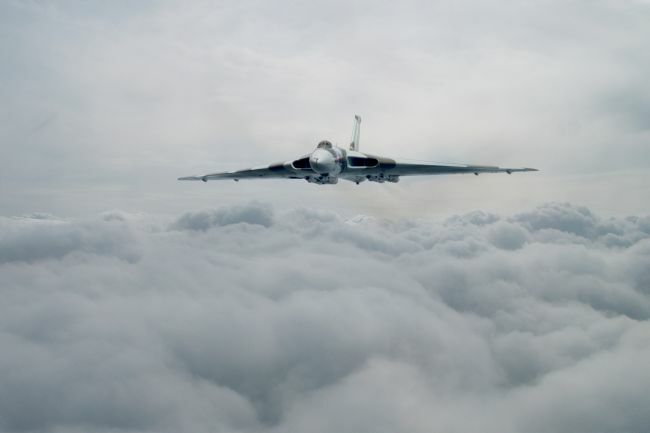 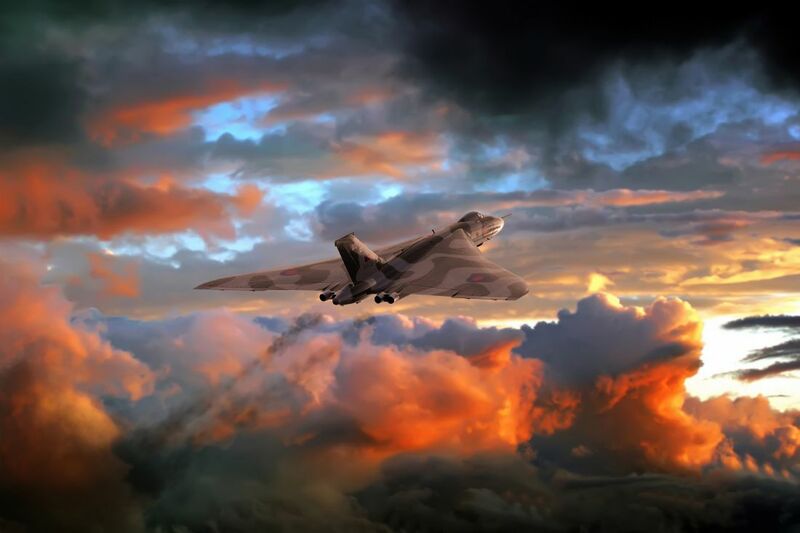 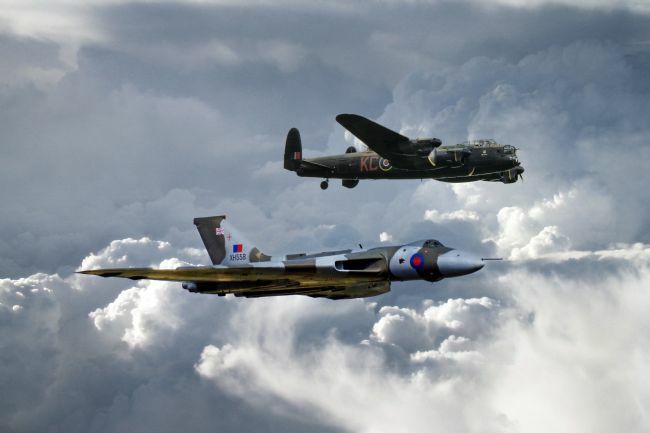 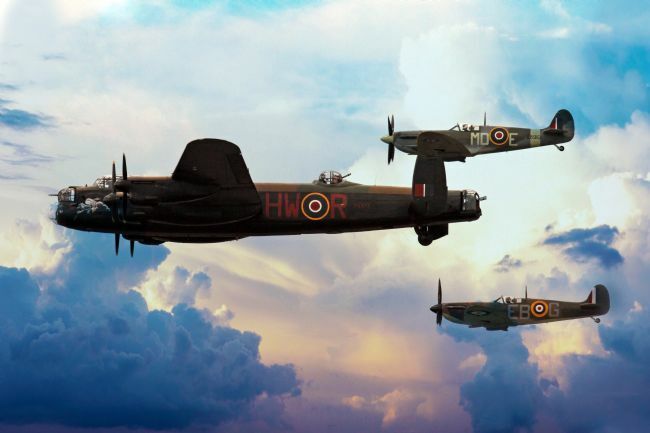 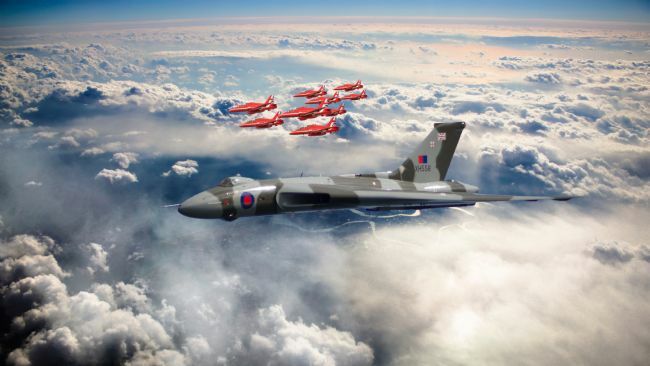 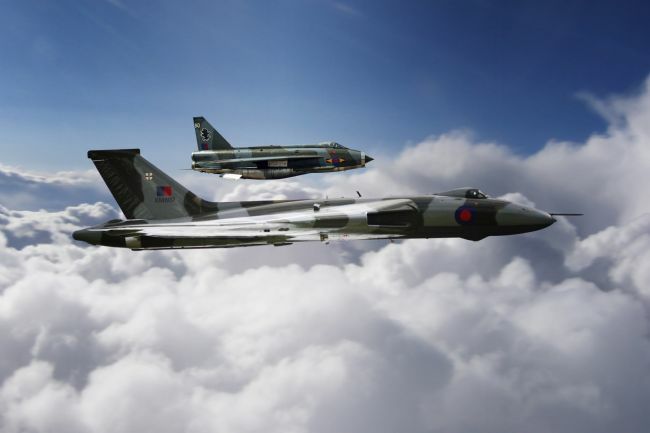 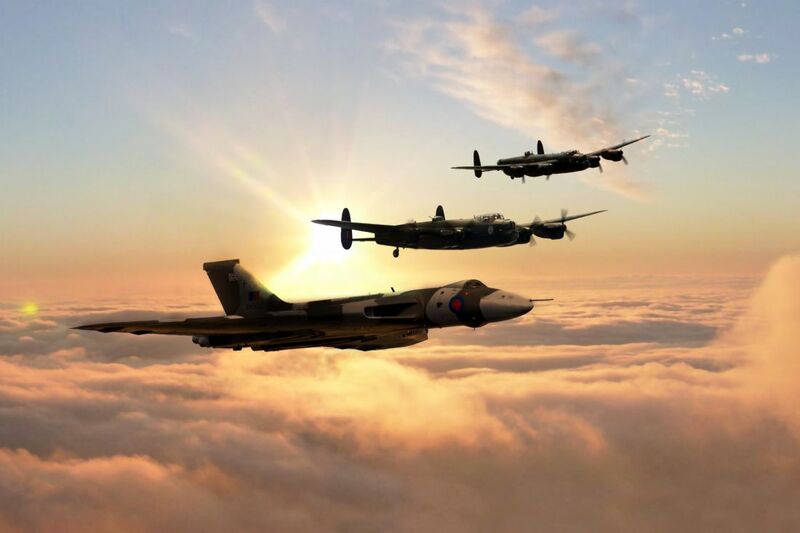 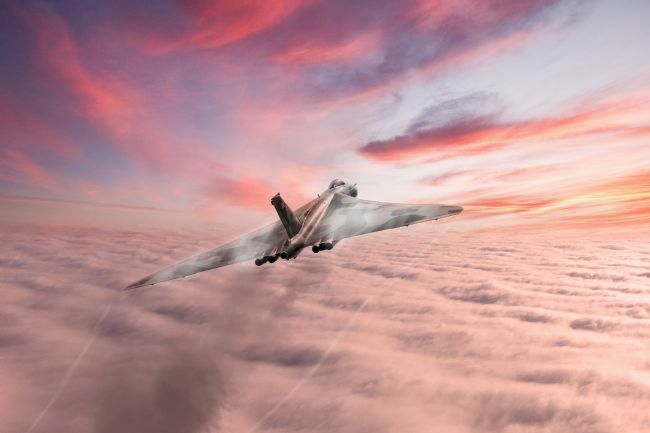 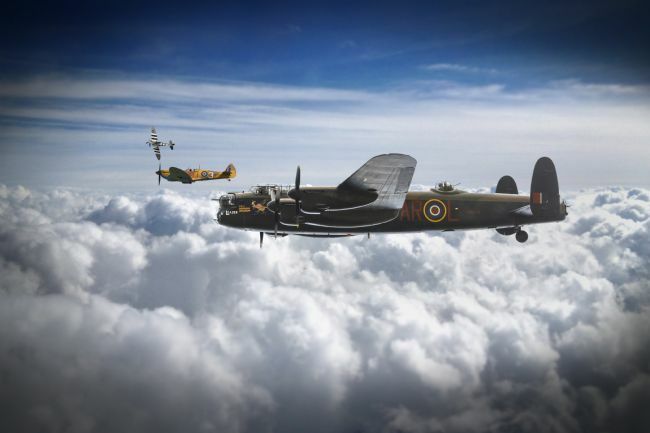 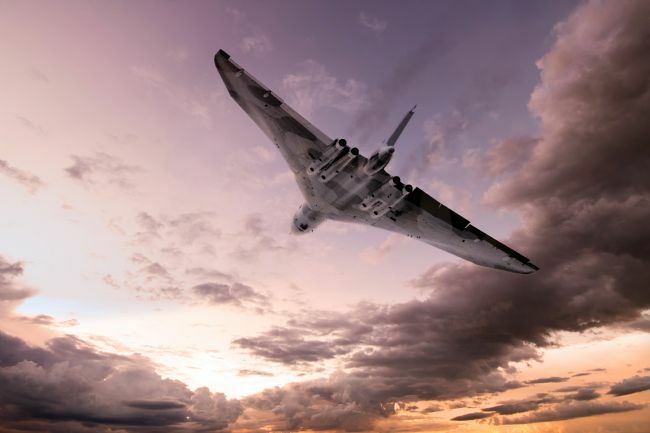 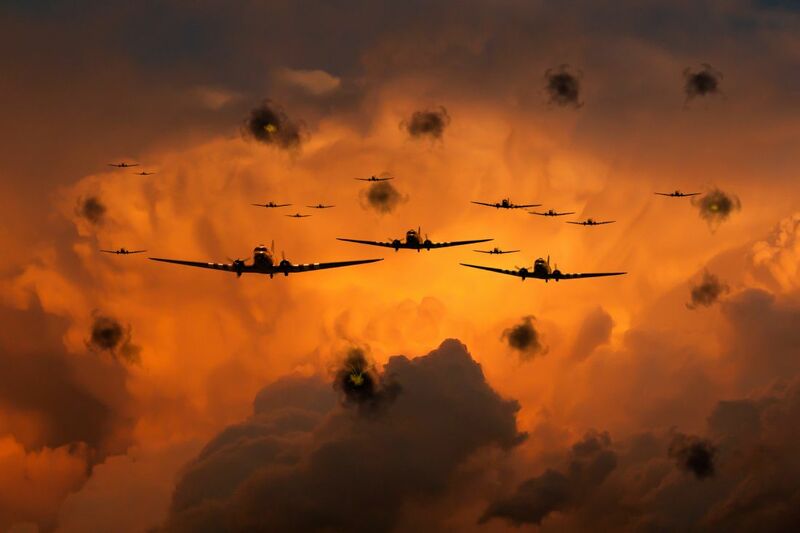 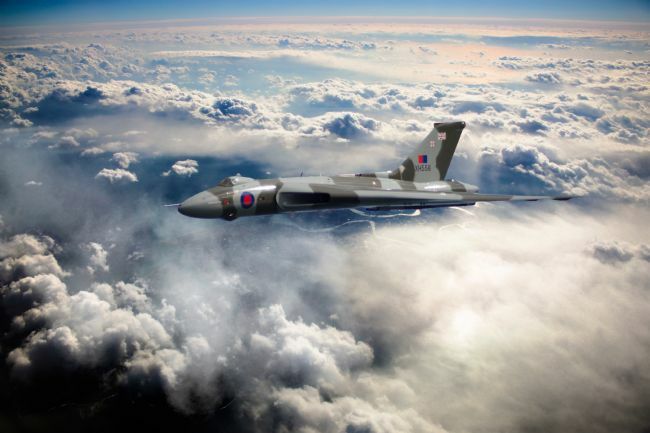 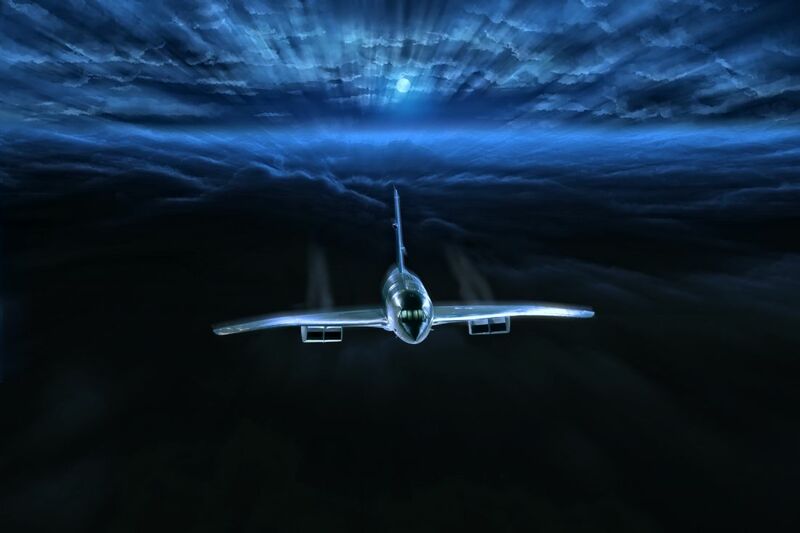 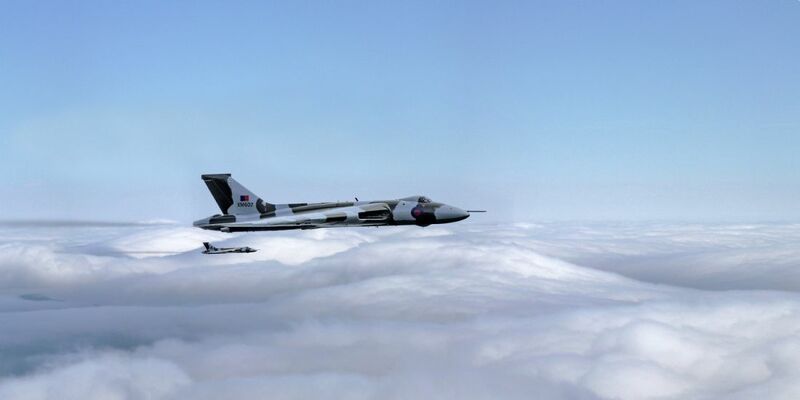 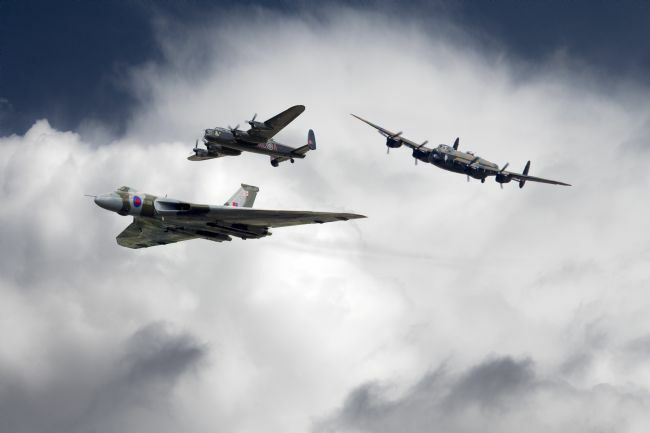 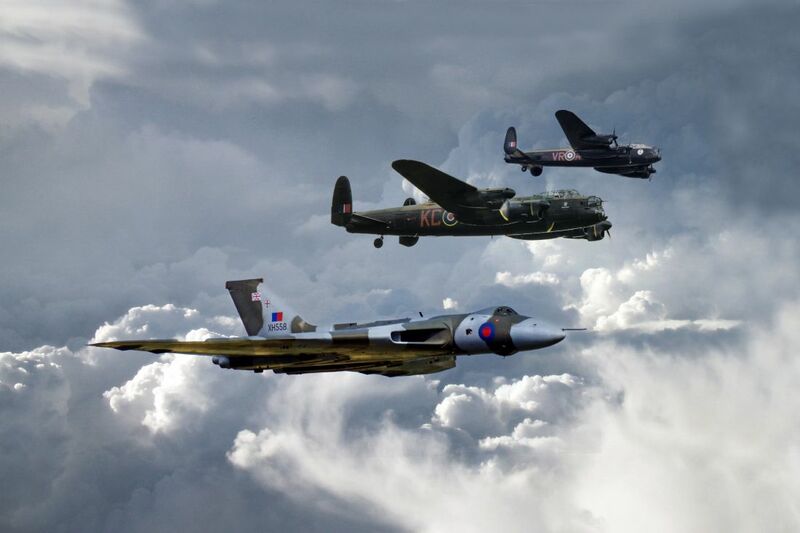 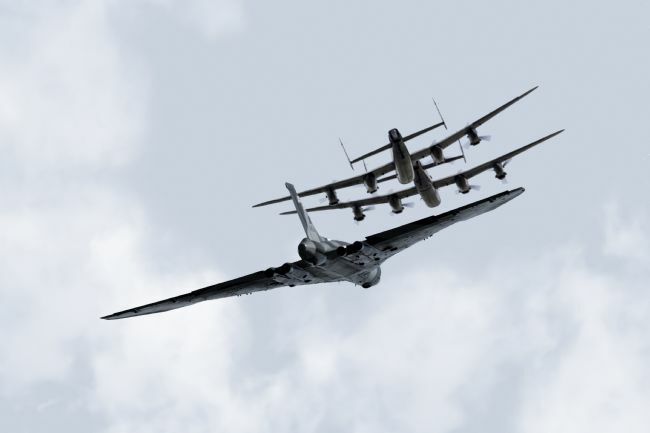 Avro Vulcan and Avro Lancaster Bombers above the clouds in formation Composite image. 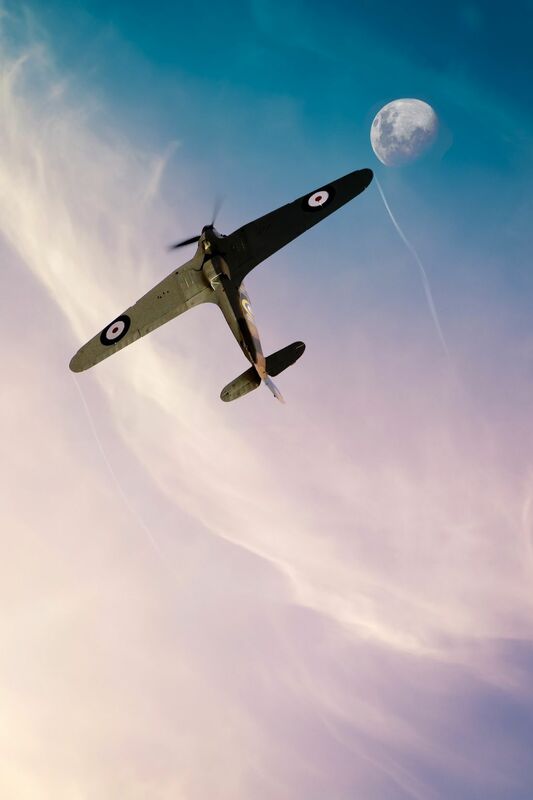 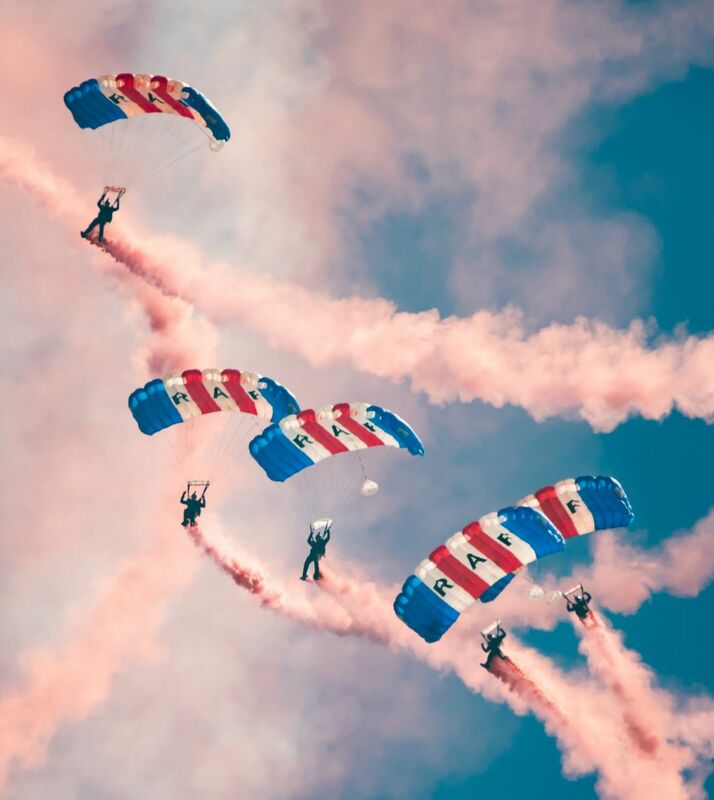 Sky image available from Pexels. Avro Lancaster Bomber over the mountains of Europe. Composite Image. 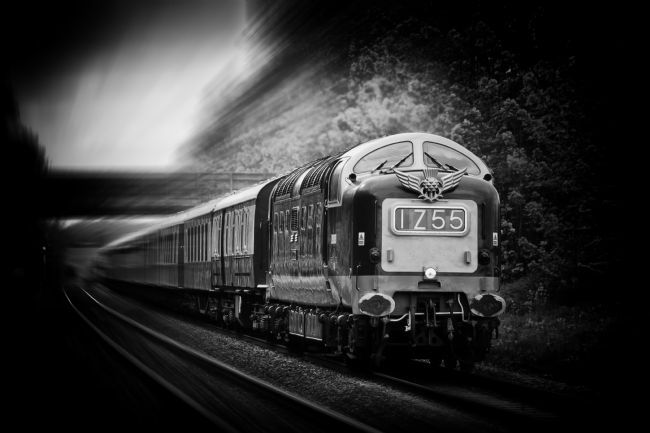 Original Background available from Pexels. 106 Halifaxes, 102 Lancasters and 16 Mosquitos, split into small forces, attacked coastal gun positions at Boulogne, Colline Beaumont, Le Clipon and Trouville without loss. The mighty A-10 Thunderbolt II also known as the Tank Buster or Warthog. 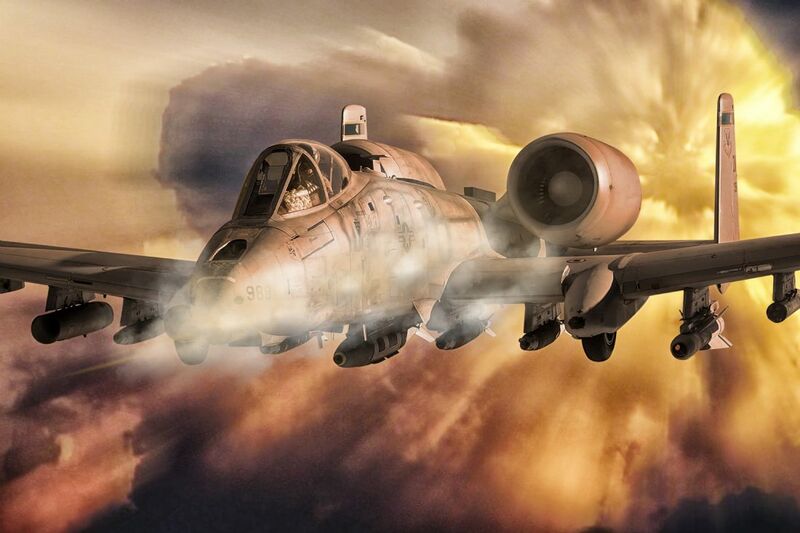 A formidable close air support asset. 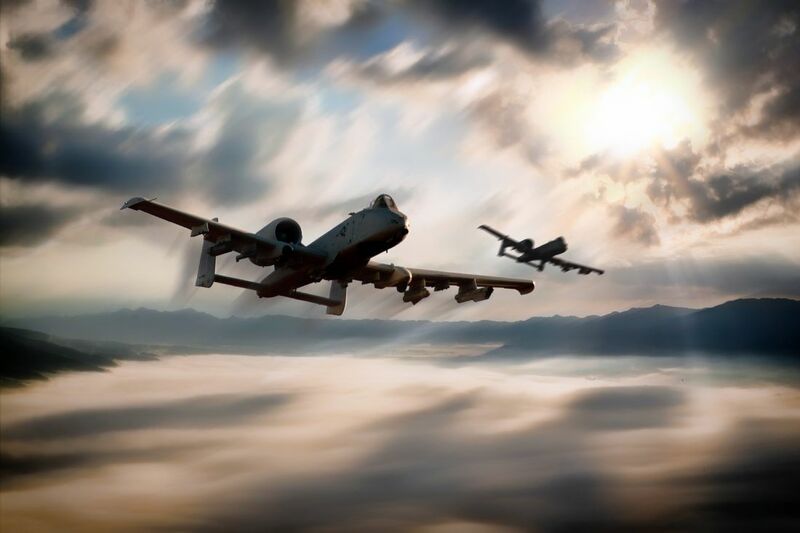 A pair of A-10 Thunderbolt II over an Afghan mountain range Composite Image. 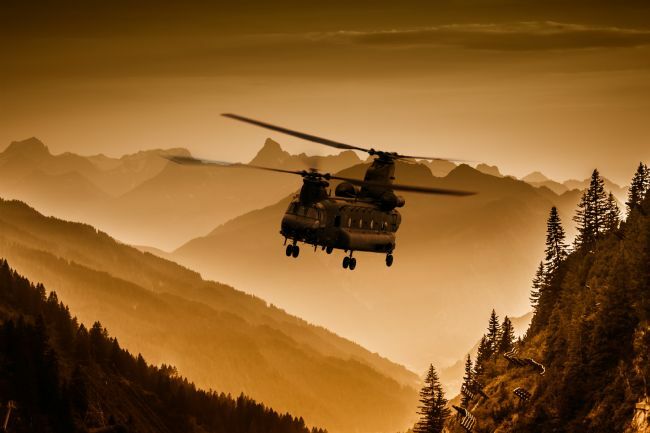 Mountain Image taken from Pexels. 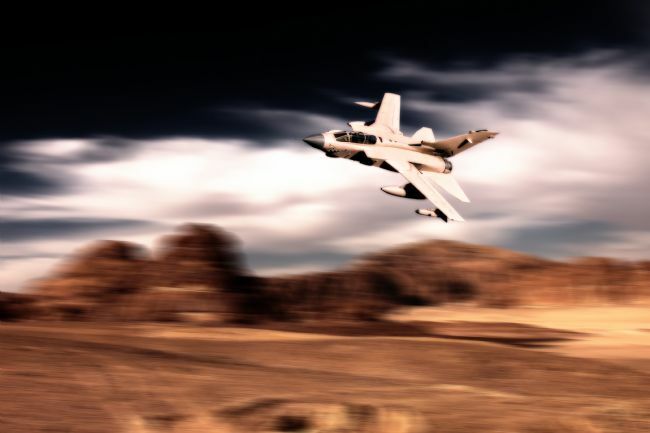 A Blackburn Buccaneer at the Red Flag military exercise Nevada. Composite Image. Original background from Pexels. 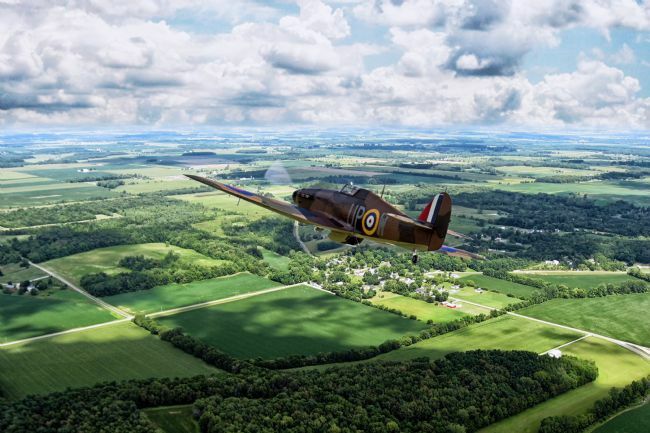 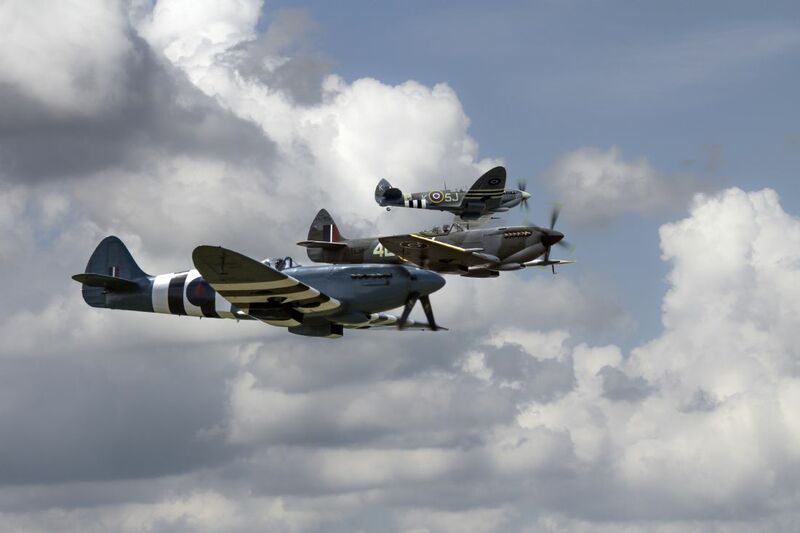 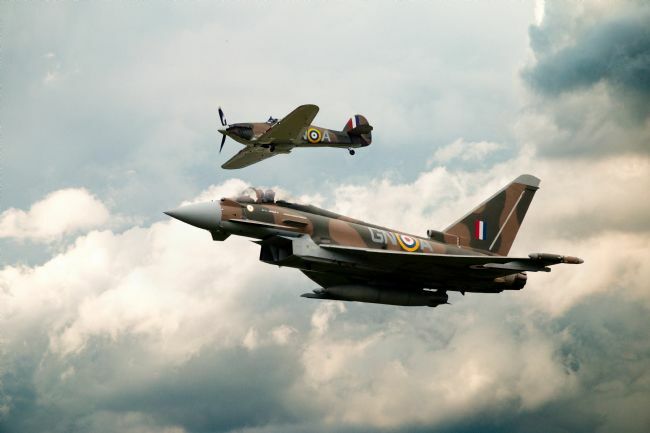 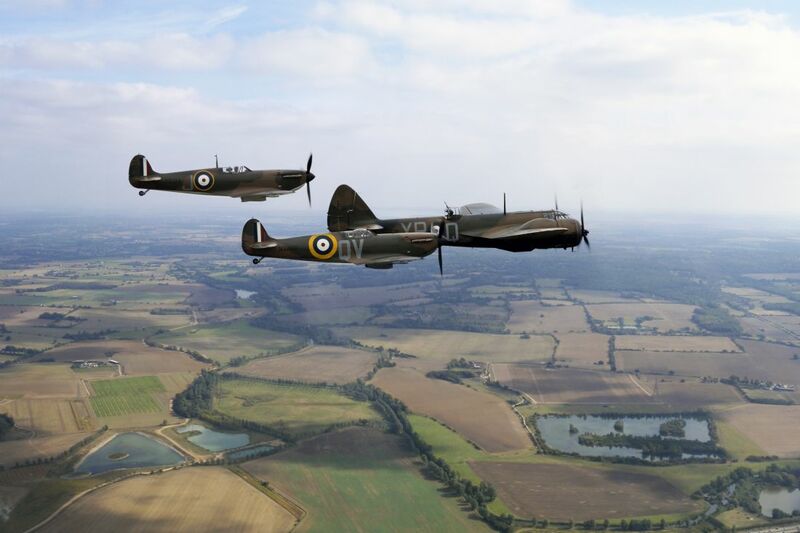 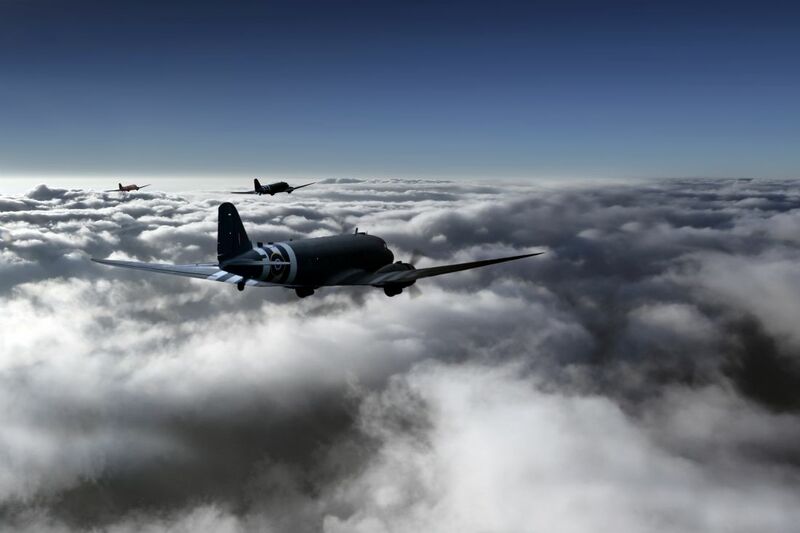 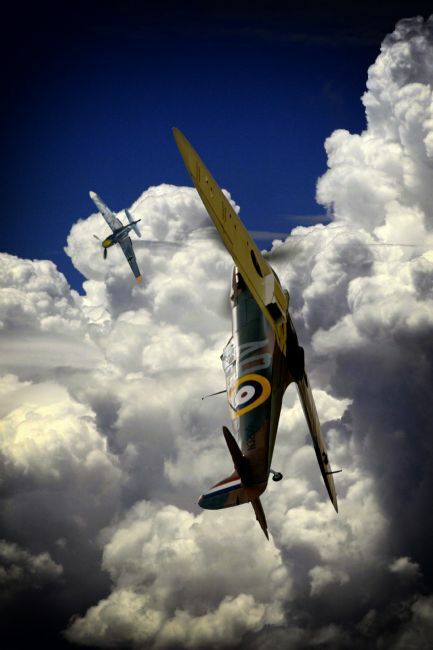 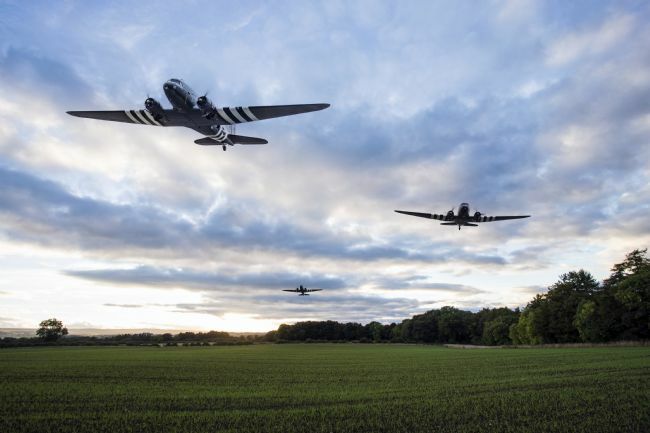 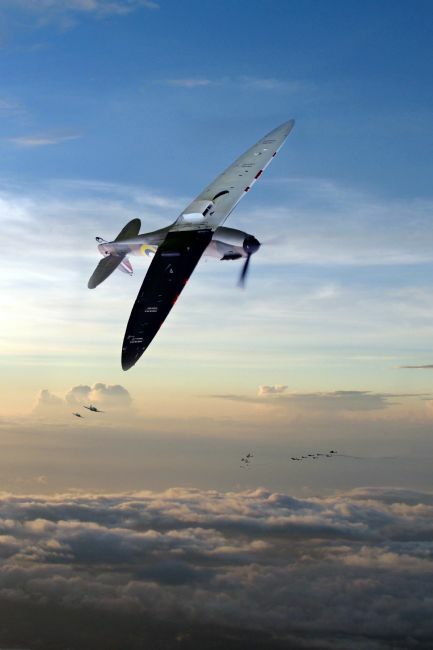 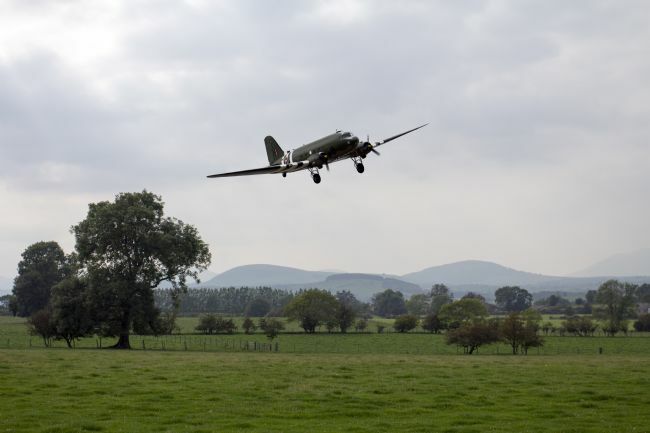 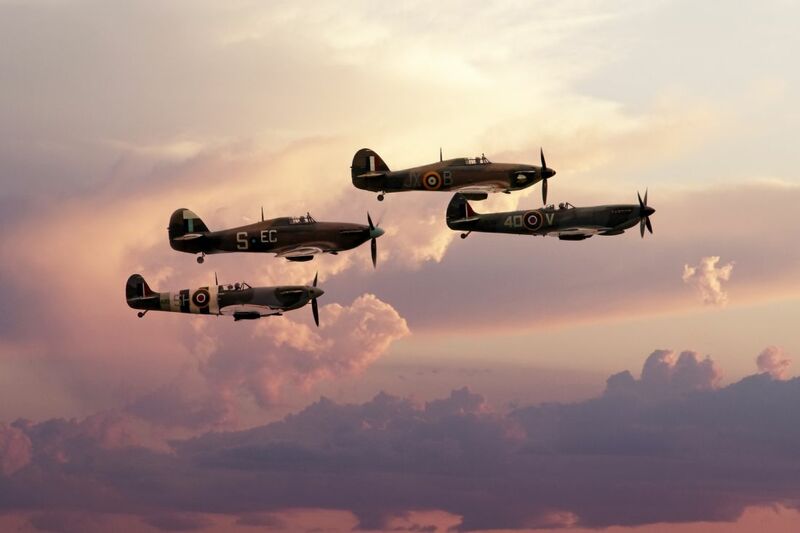 The RAF Battle of Britain Memorial Flight over the English Summer countryside. 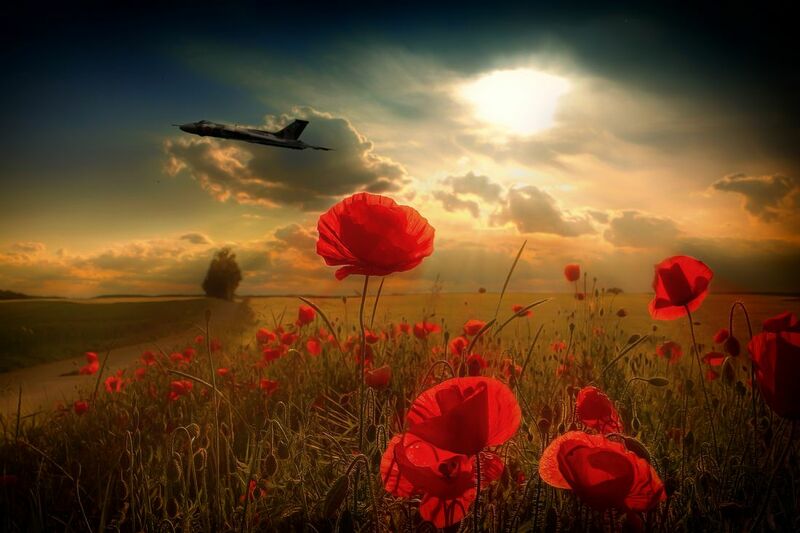 A Poppy in the foreground. 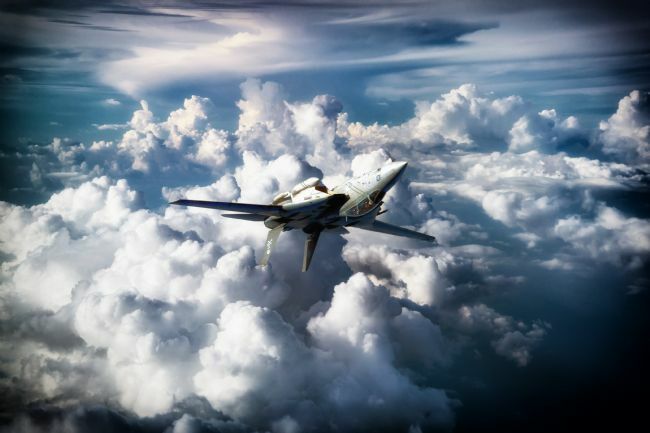 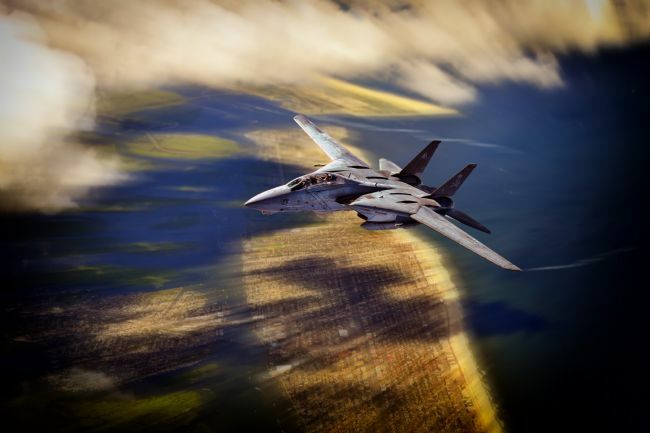 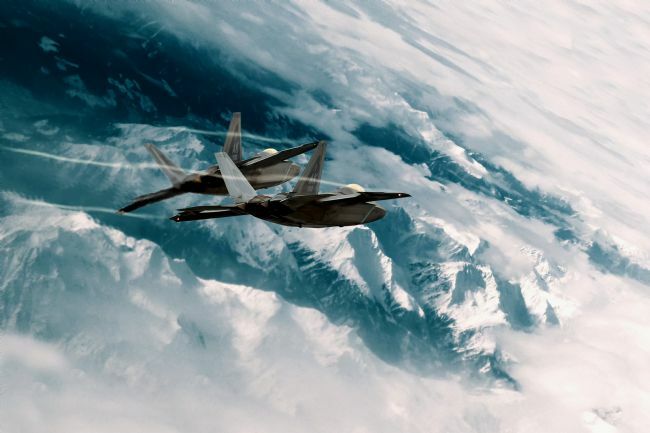 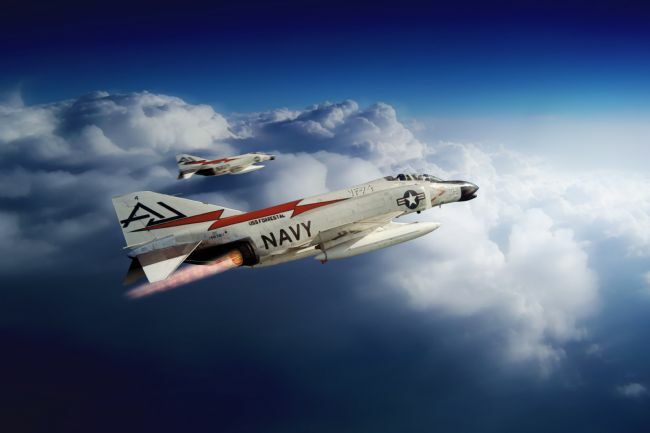 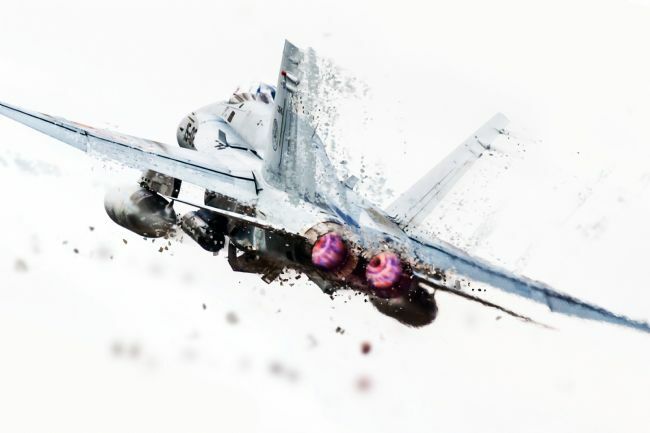 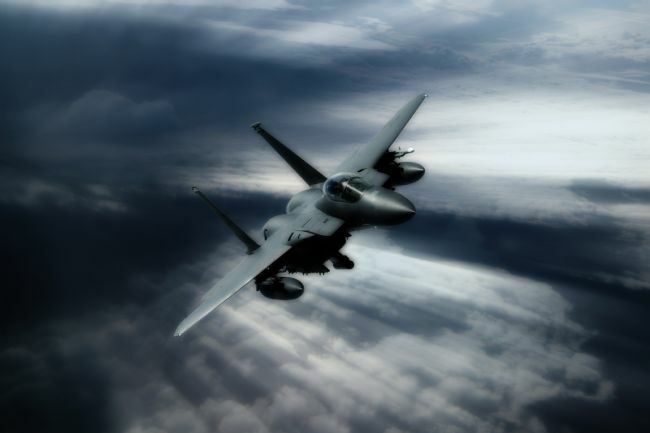 An US Navy F-14 Tomcat inverted in the clouds Created entirely from images available in the Public Domain. Background from Pexels. 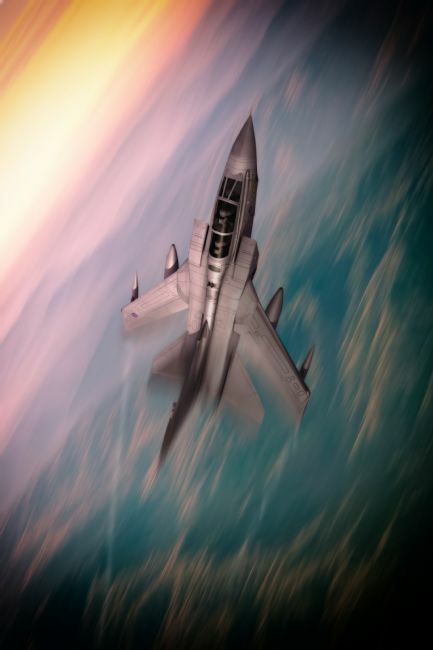 F-14 Tomcat from Wikimedia used under the creative commons licence. 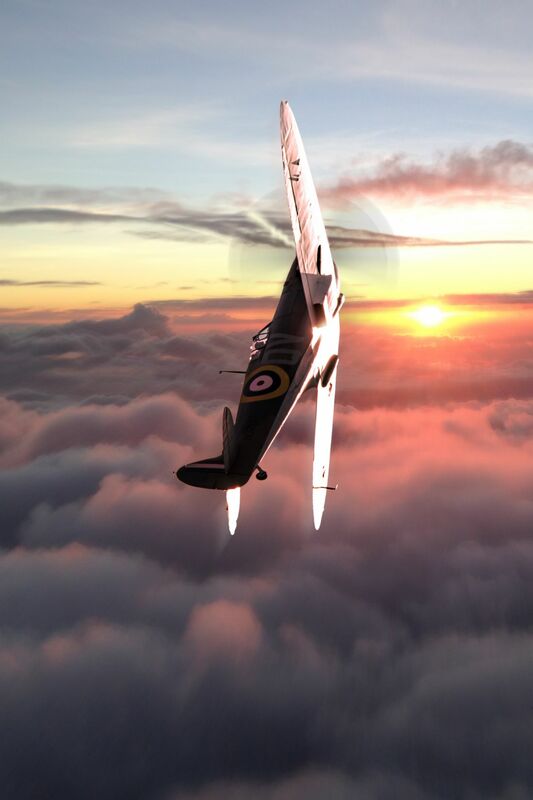 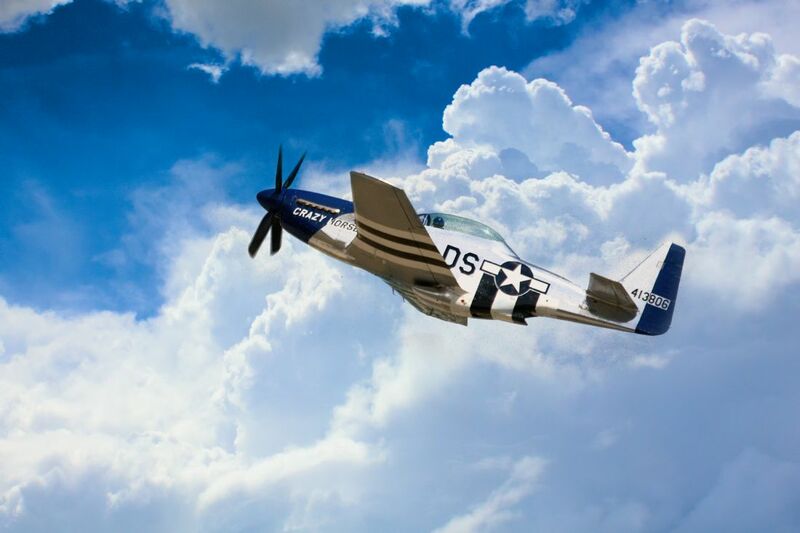 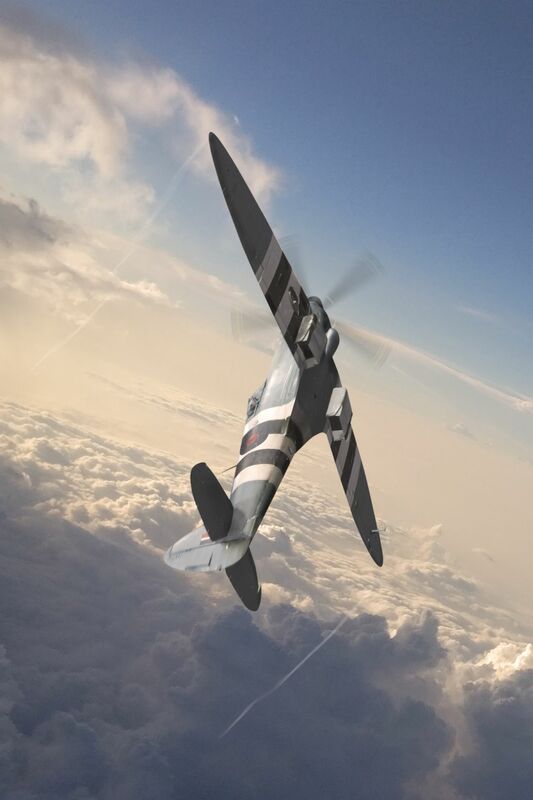 North American P-51 Mustang 'Big Beautiful Doll' Created entirely from images available in the Public Domain. 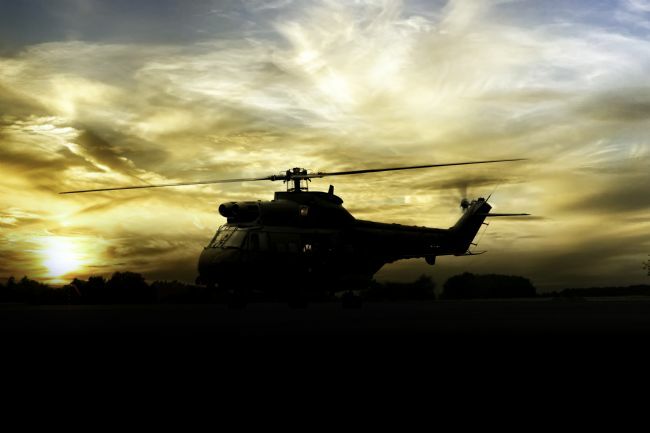 Background from Pexels. P-51 Mustang from Wikimedia used under the creative commons licence. 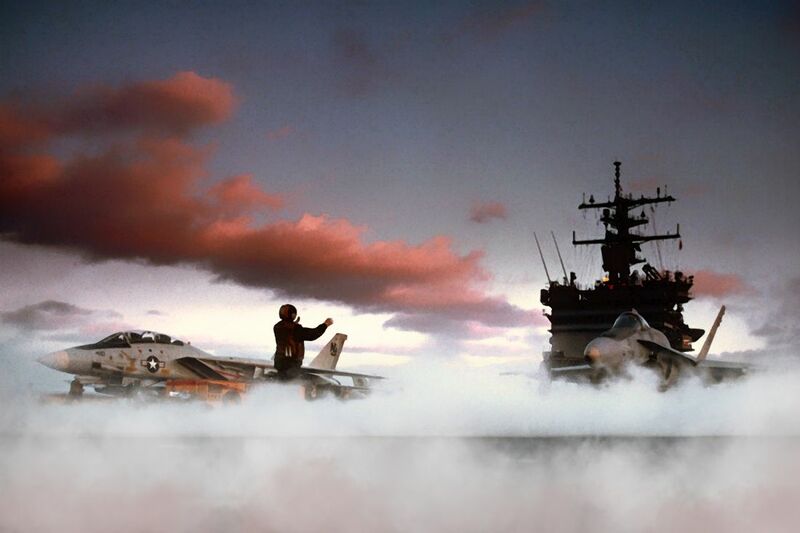 A Us Navy F-14 Tomcat from VF-111 The Sundowners launches from the USS Carl Vinson Created entirely from images available in the Public Domain. 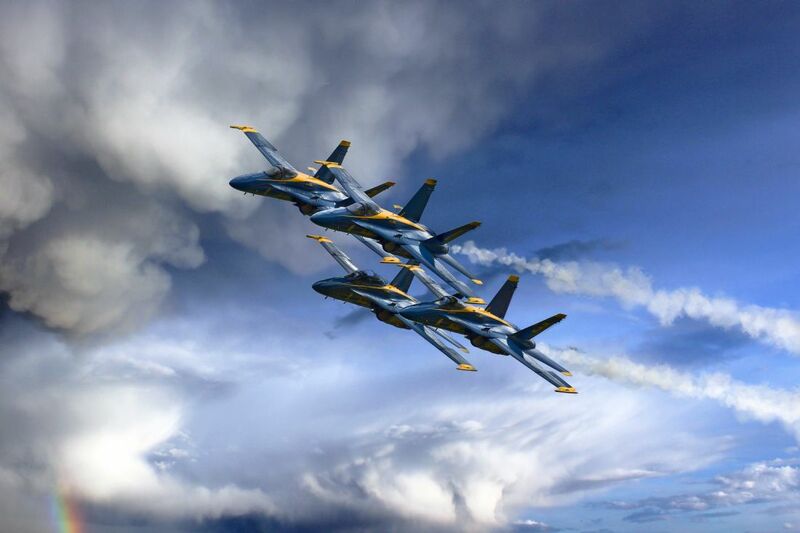 Background from Pexels. 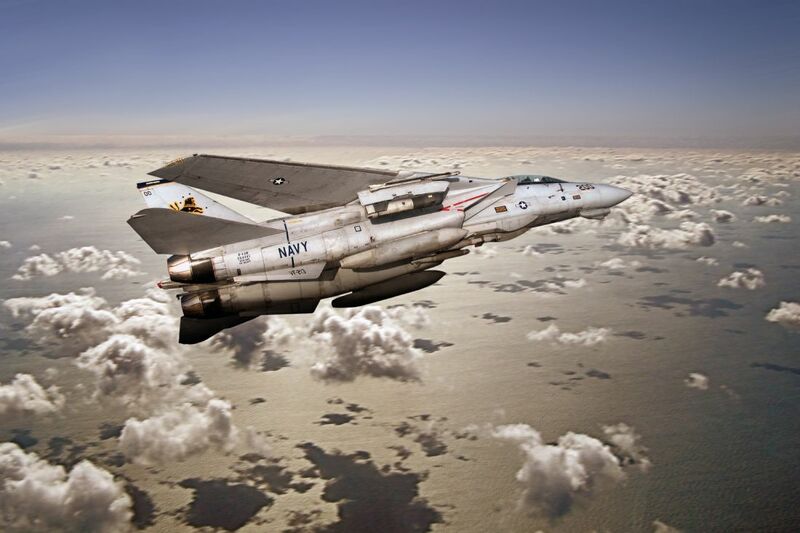 F-14 Tomcat from Wikimedia used under the creative commons licence. 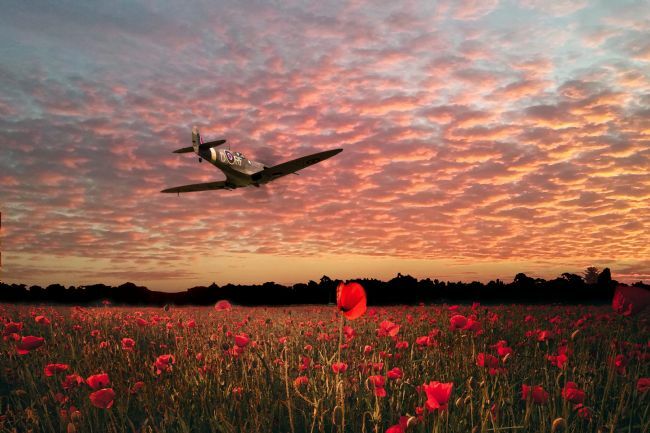 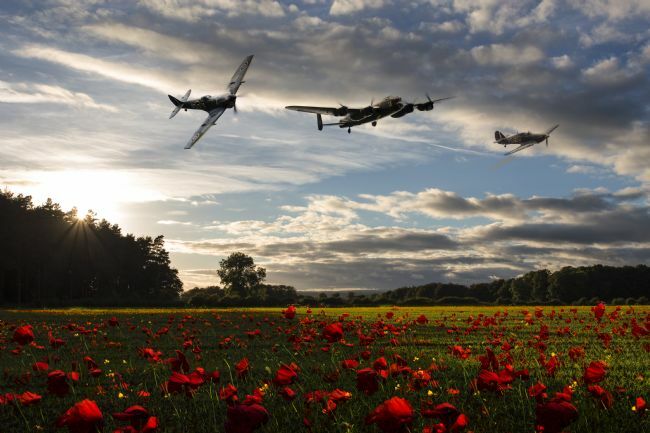 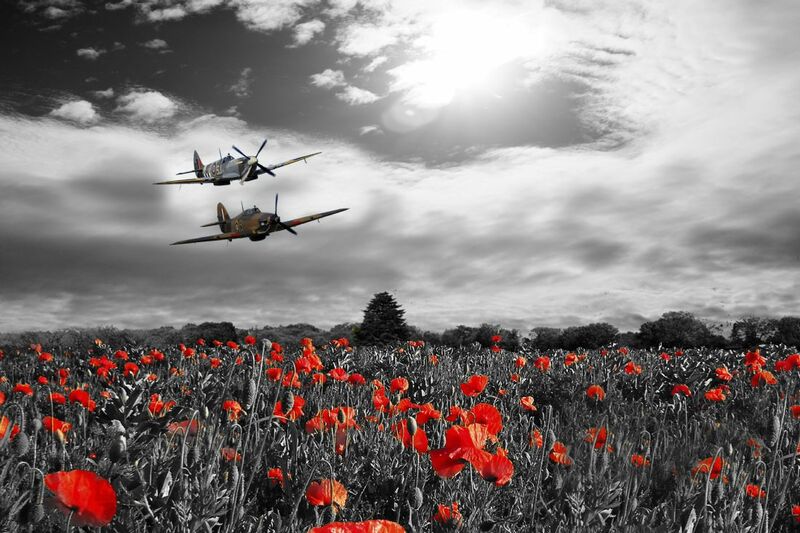 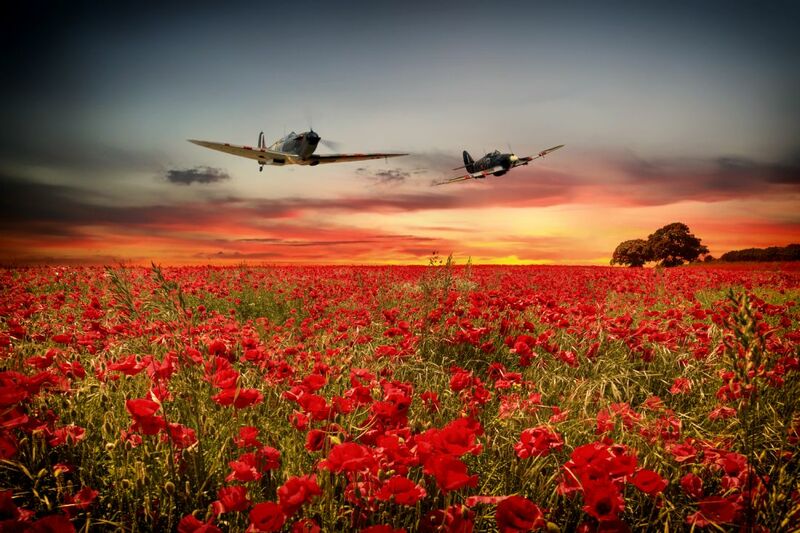 Supermarine Sptfire and Hawker Hurricane making a low pass over a flowering field of poppies. 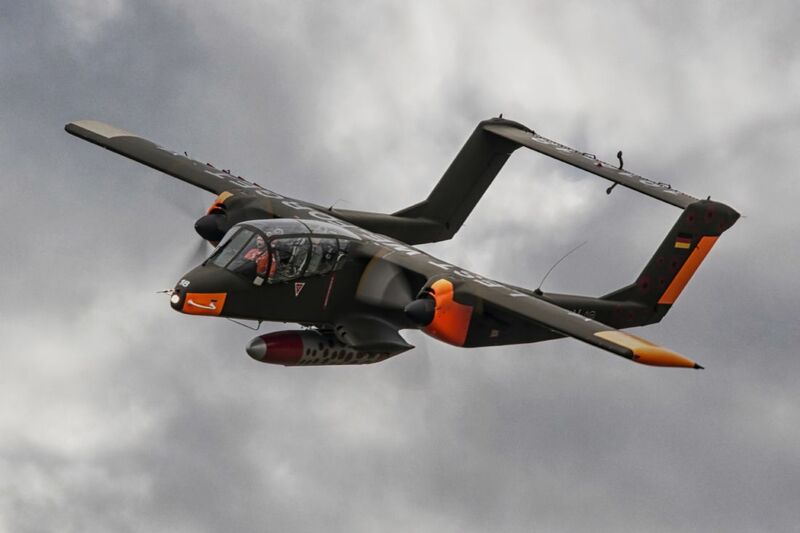 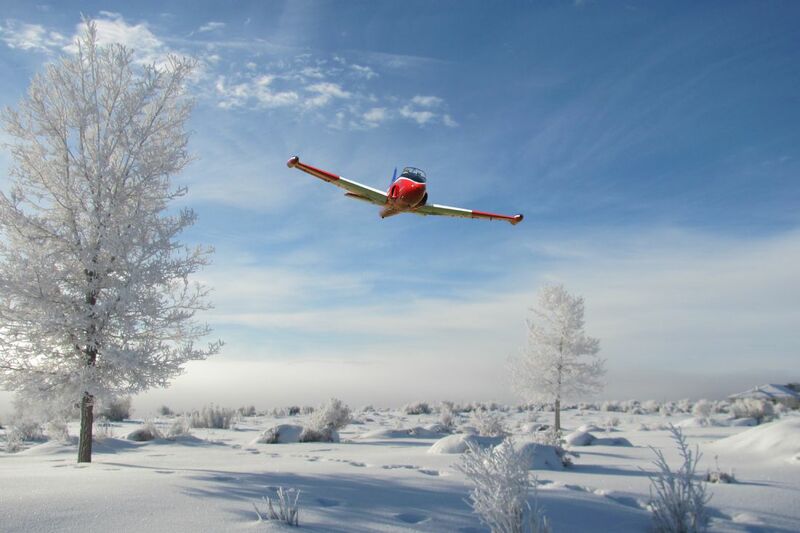 The Hawk T TMk2 has an extended nose for additional avionics and features a number of major changes under the skin. 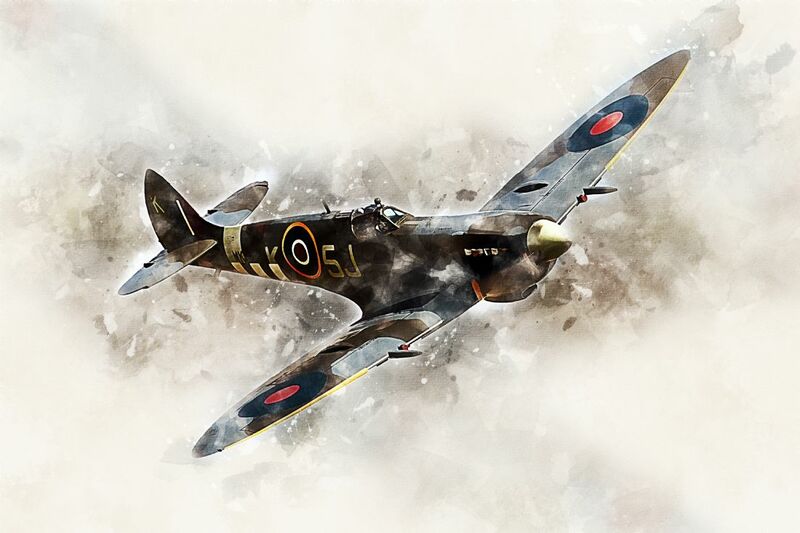 Coded UP-W, Hurricane R4118 flew 49 combat missions and destroyed five German aircraft during World War Two, during which period it was rebuilt four times due to sustained enemy fire and a series of training accidents. The only Hurricane from the Battle of Britain still airborne today, Hawker Hurricane Mk1 R4118 is widely regarded as the most historic British aircraft to survive in flying condition from the Second World War. 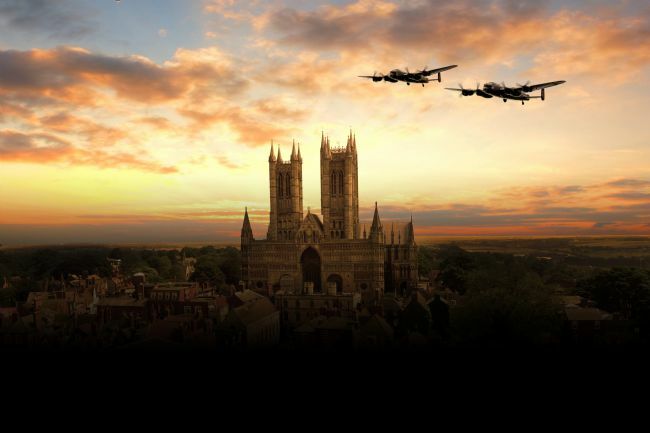 The flying memorial to the aircrews of WW2. 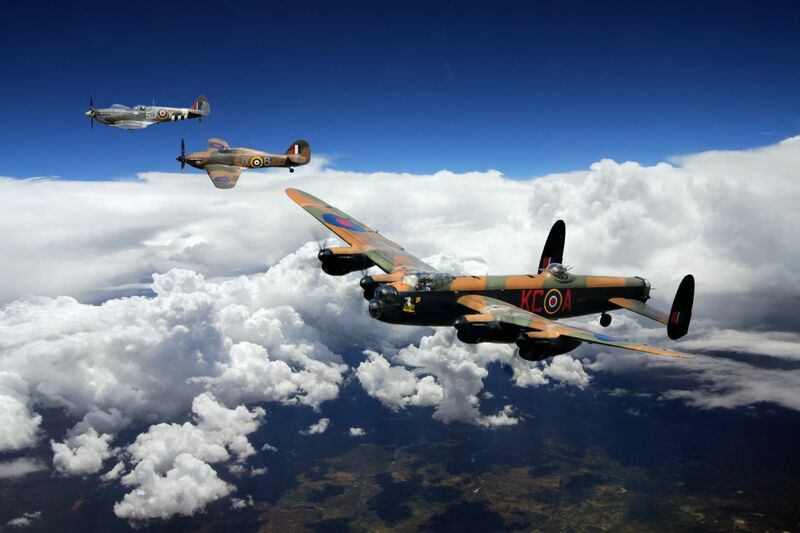 The Battle of Britain Memorial Flight Lancaster Bomber, Spitfires, and Hurricanes. 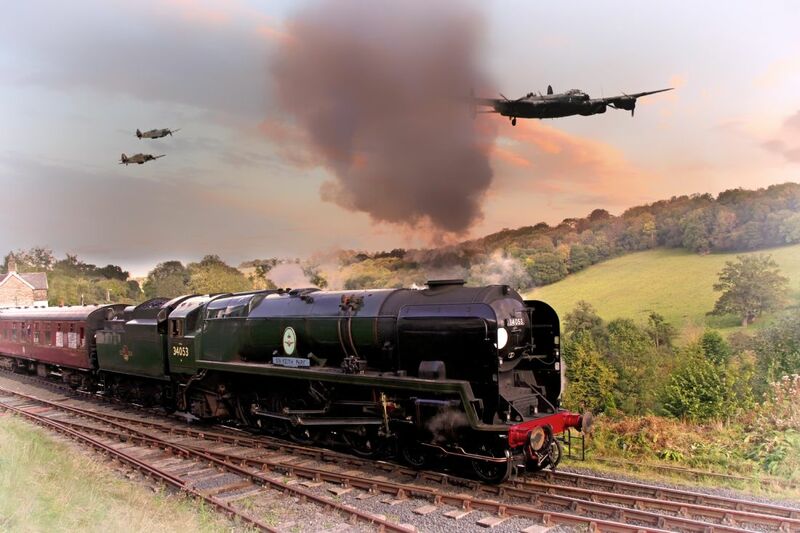 Locomotive 34053 Sir Keith Park, Battle of Britain Class flanked by the Battle of Britain memorial Flight. 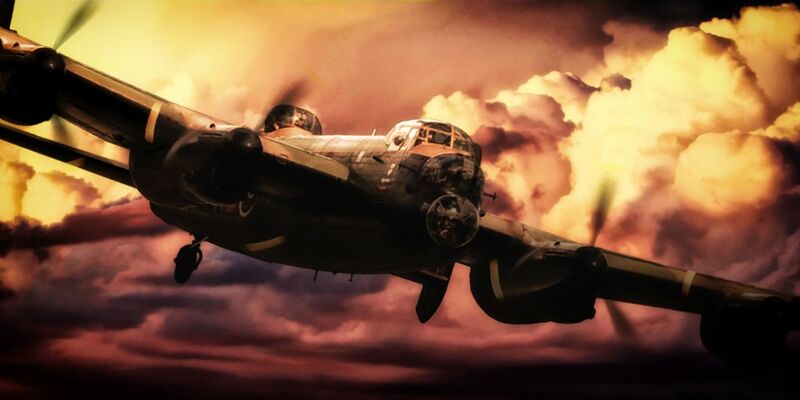 Vintage effect colourised photo applied. 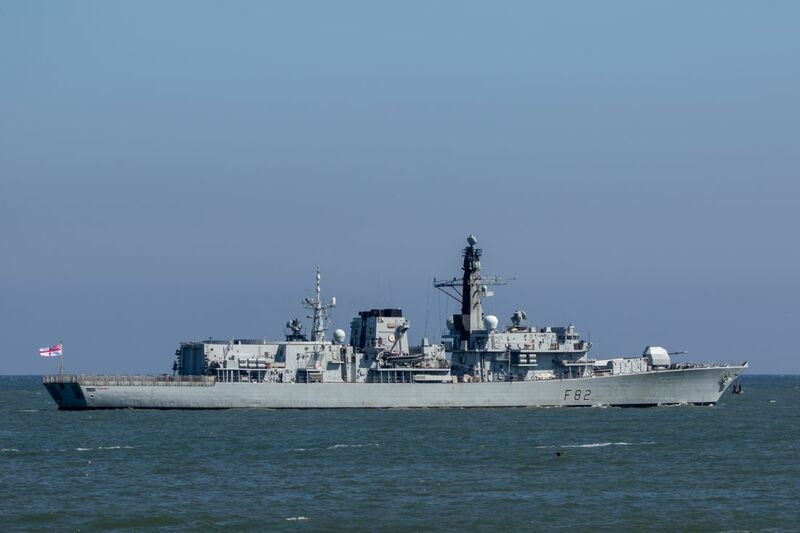 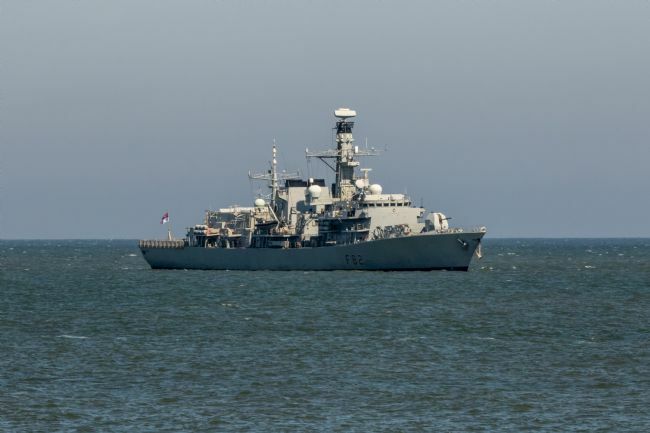 HMS Somerset is a Type 23 frigate of the Royal Navy. 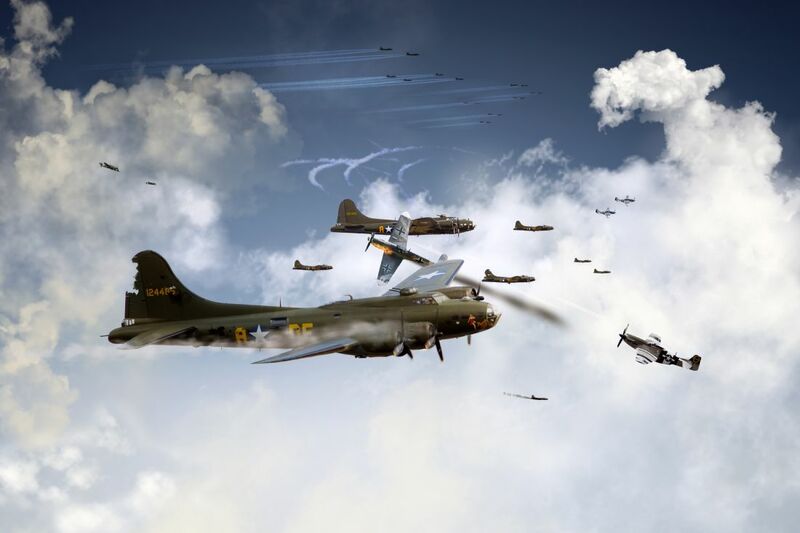 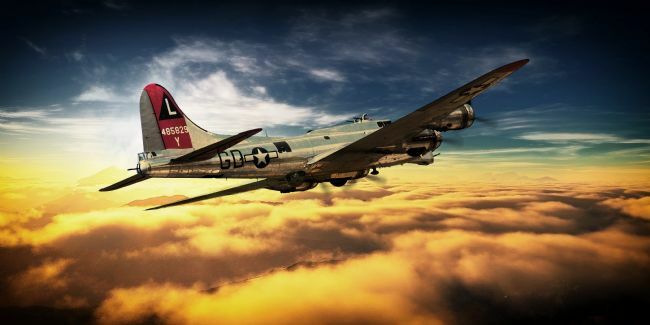 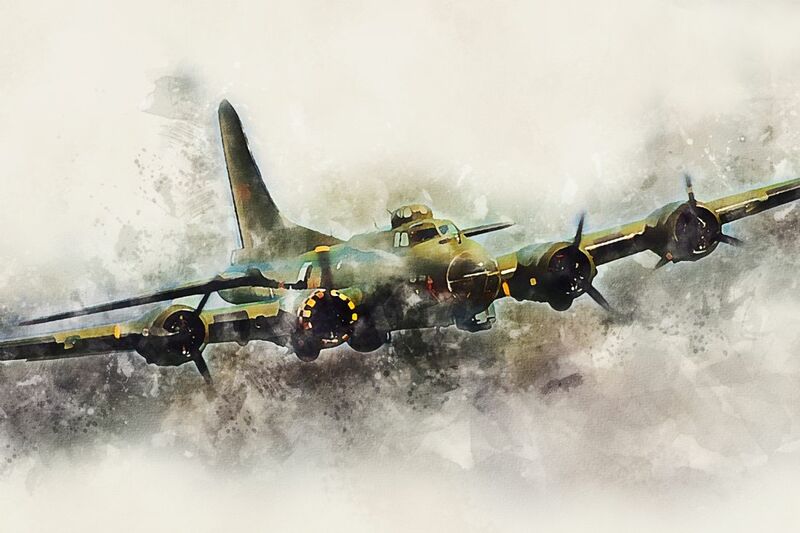 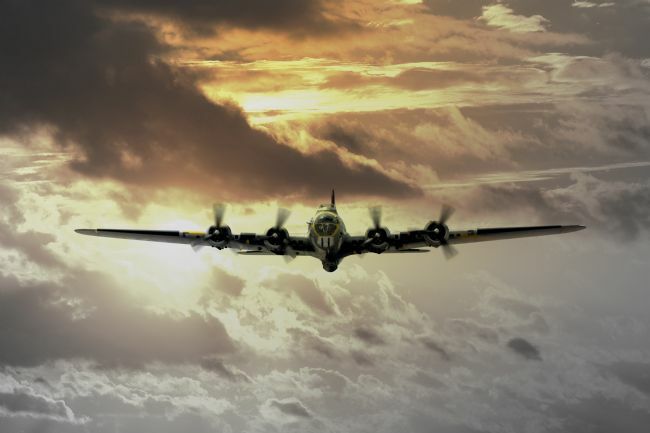 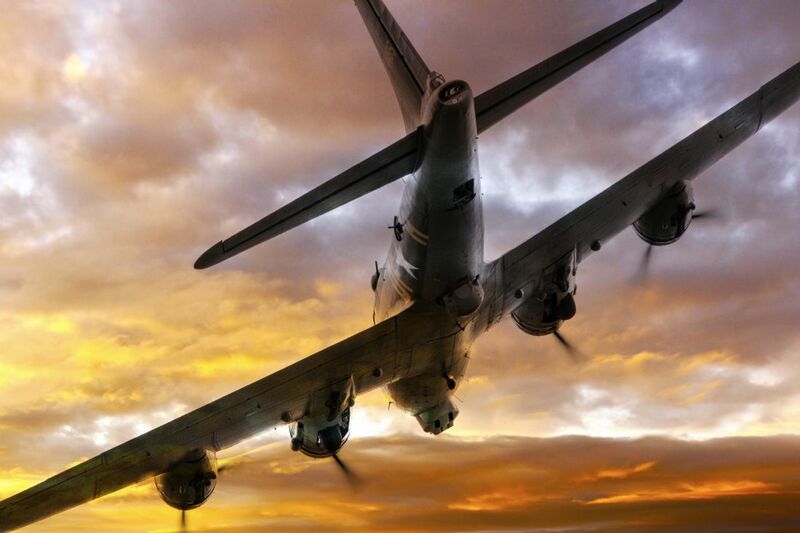 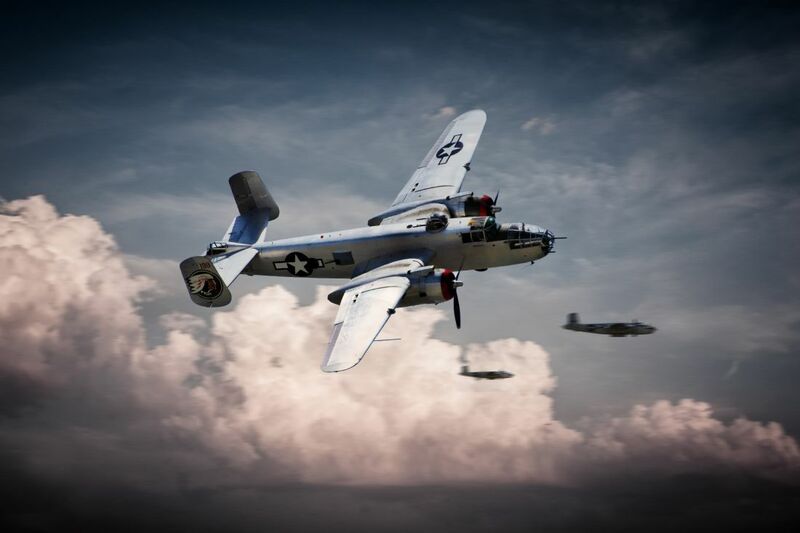 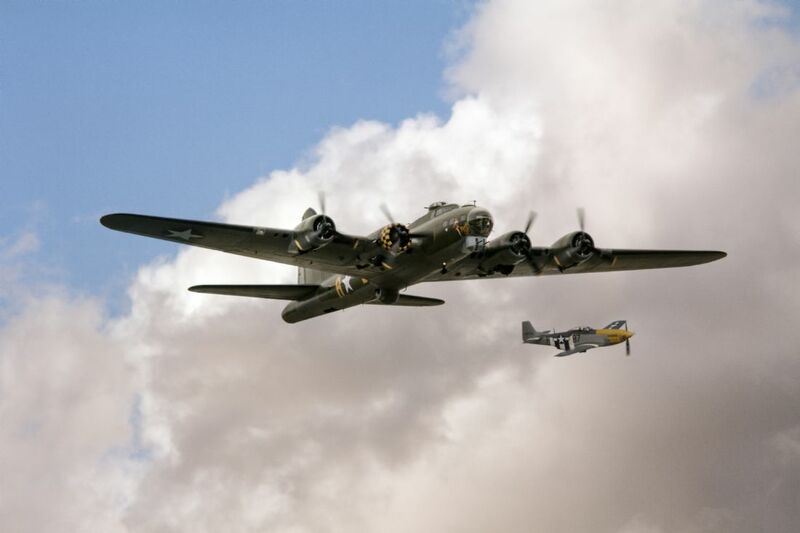 The B-17 was noted for its ability to absorb battle damage, still reach its target and bring its crew home safely. 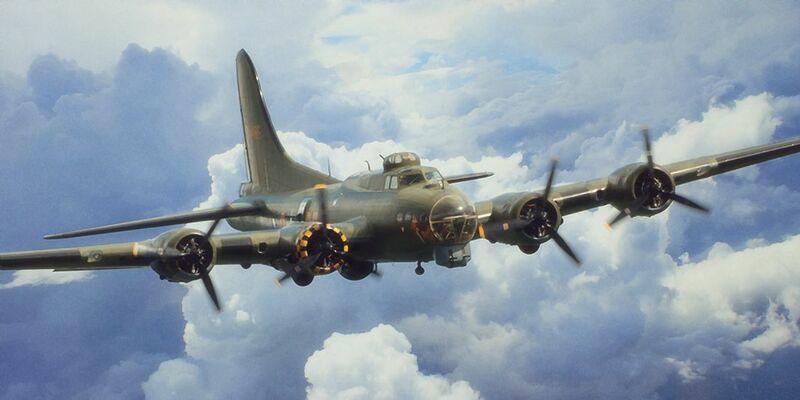 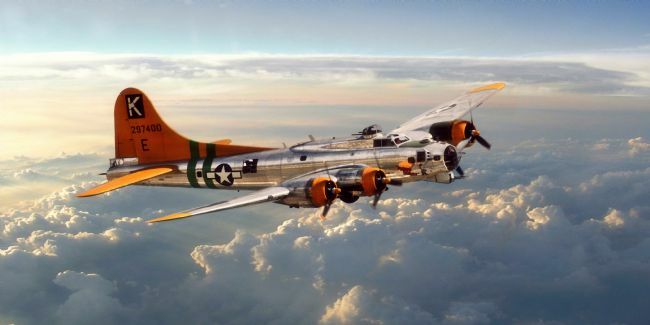 The B-17 design went through eight major changes over the course of its production, culminating in the B-17G. Three B-25 Mitchell's make a break for it low and fast in a bid to evade enemy fighters. 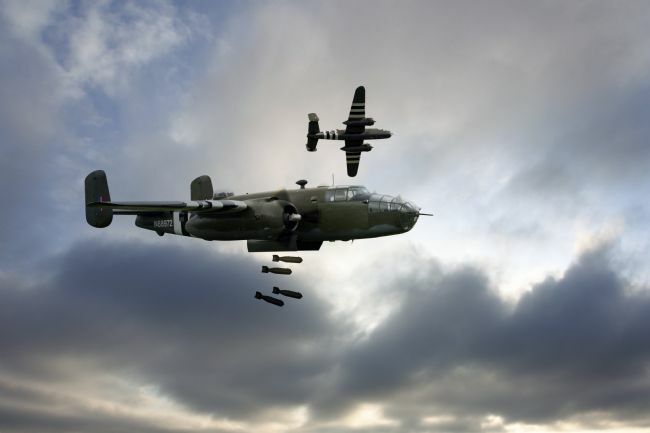 The North American B-25 Mitchell was a twin-engined medium bomber manufactured by North American Aviation. 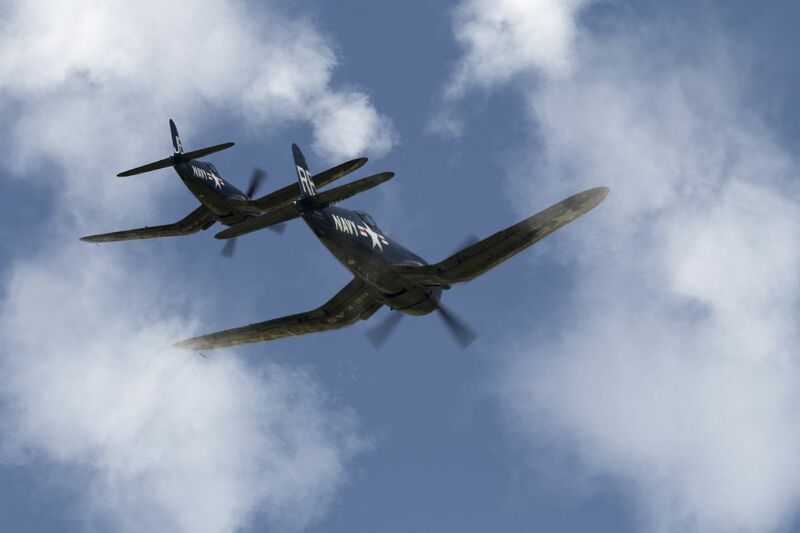 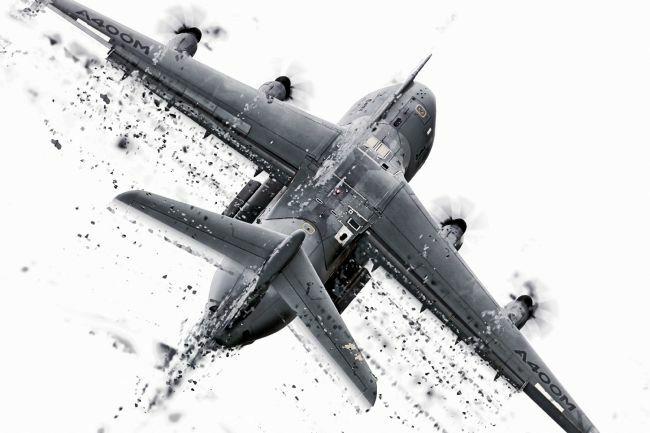 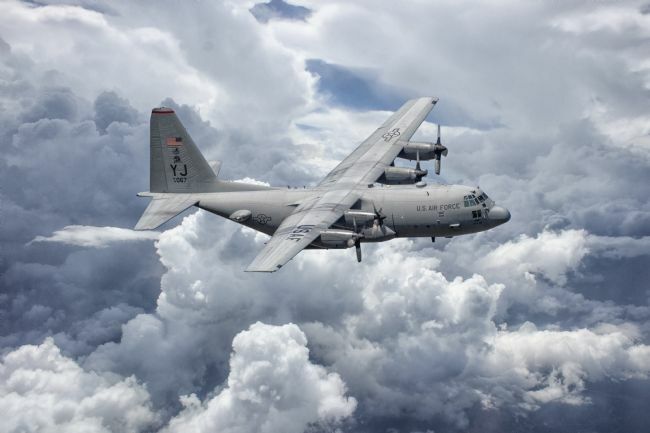 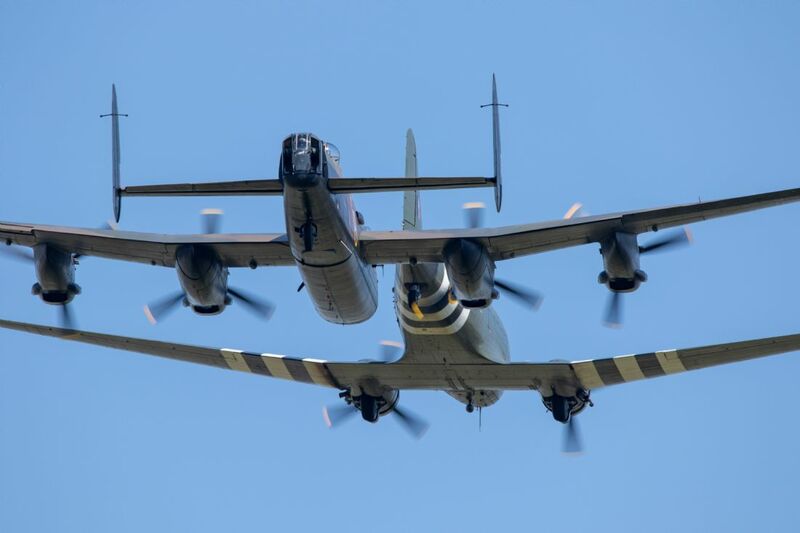 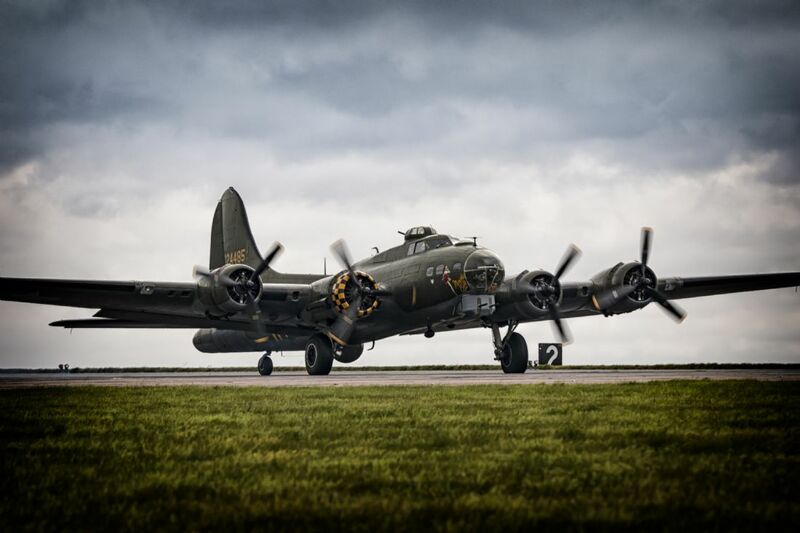 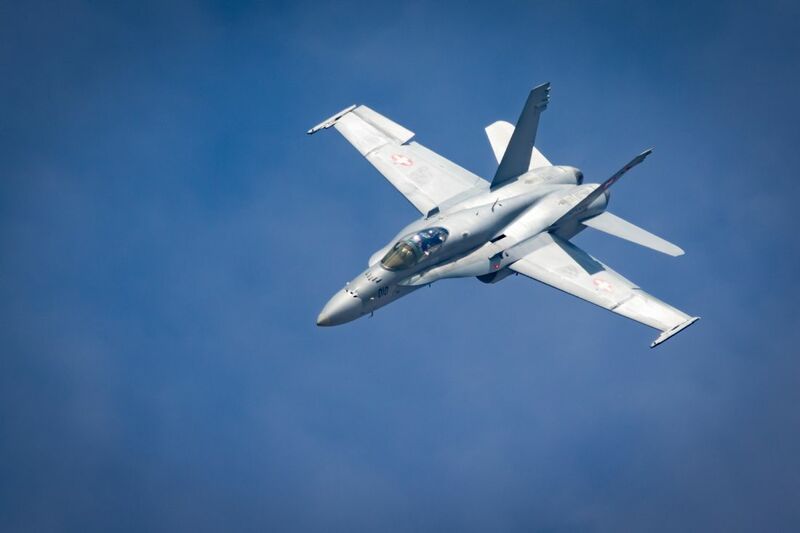 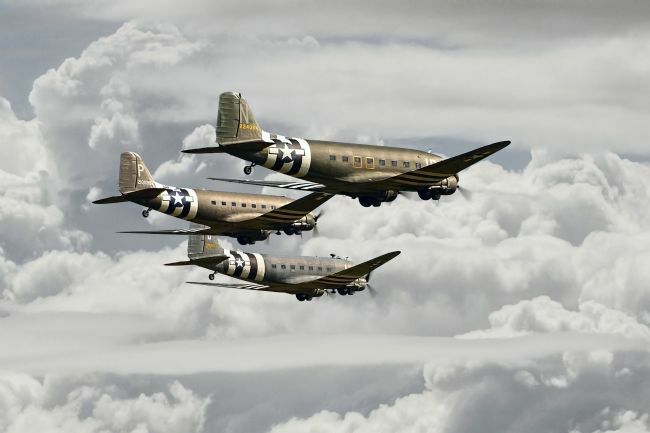 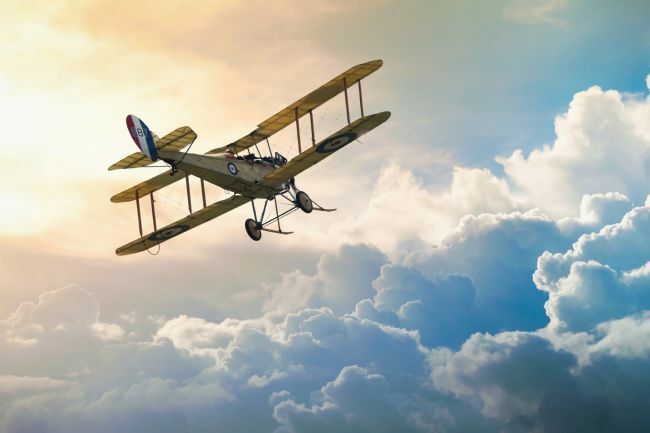 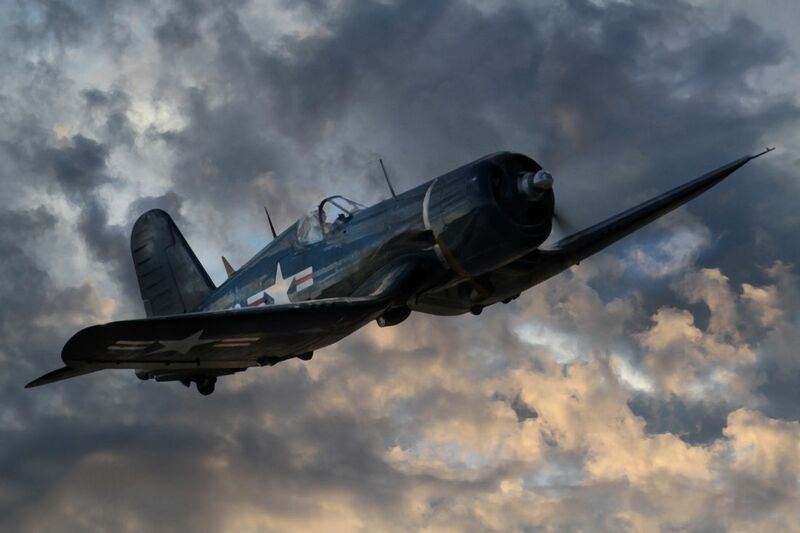 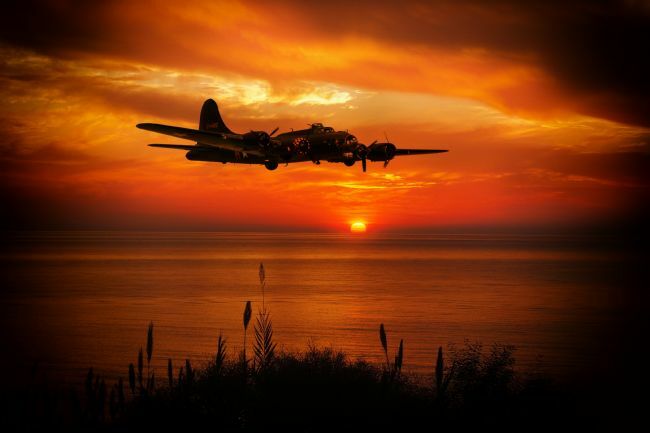 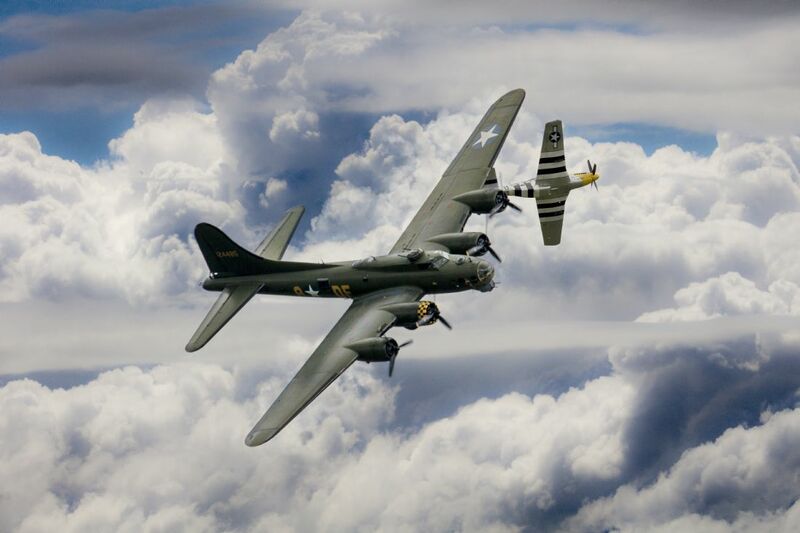 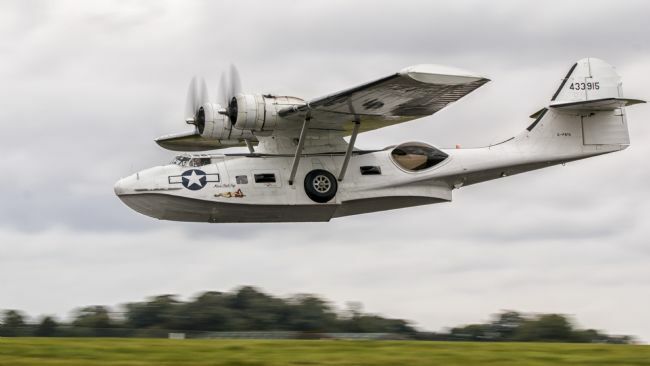 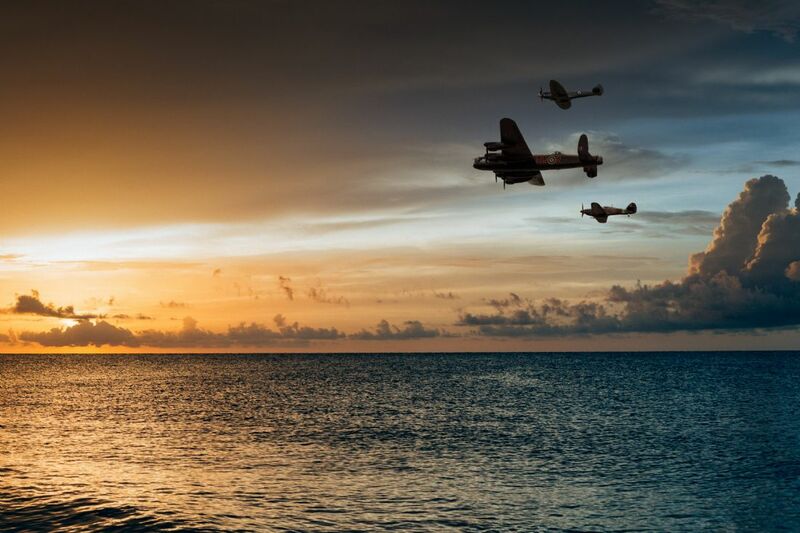 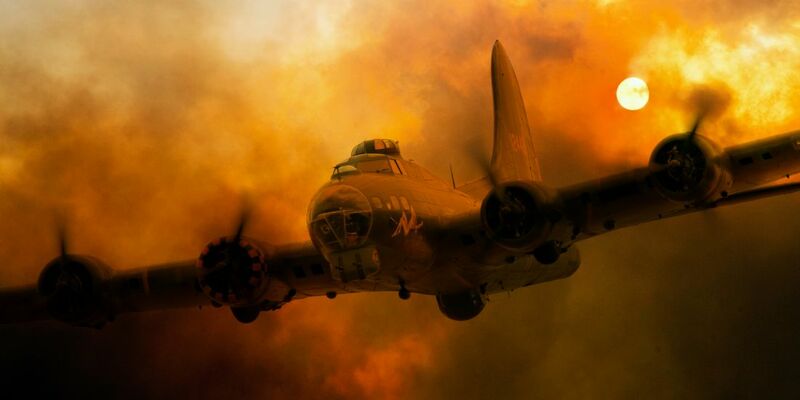 It was used by many Allied air forces, in every theater of World War II, as well as many other air forces after the war ended, and saw service across four decades. 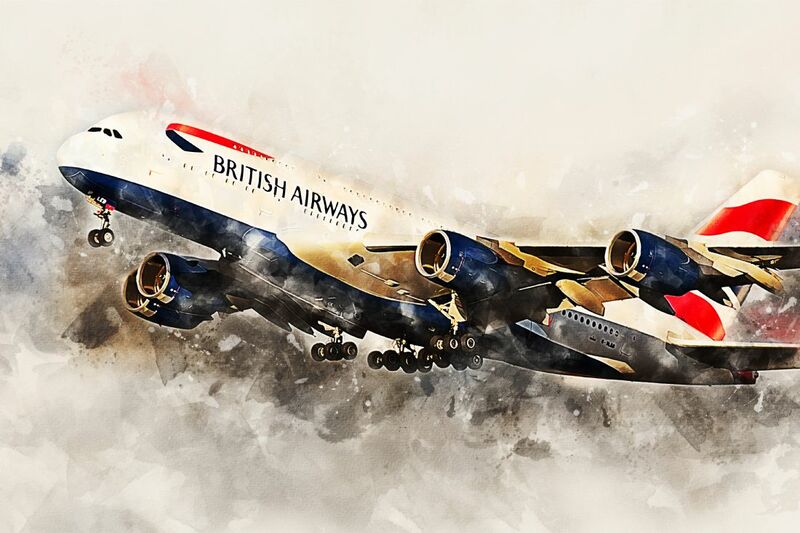 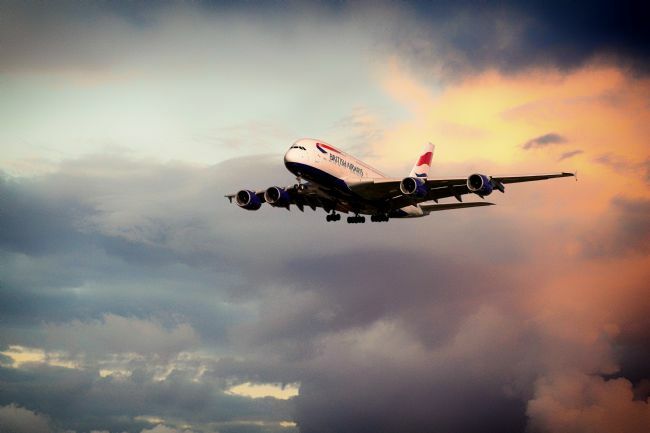 British Airways Airbus A380 cruising in the early morning sunshine. 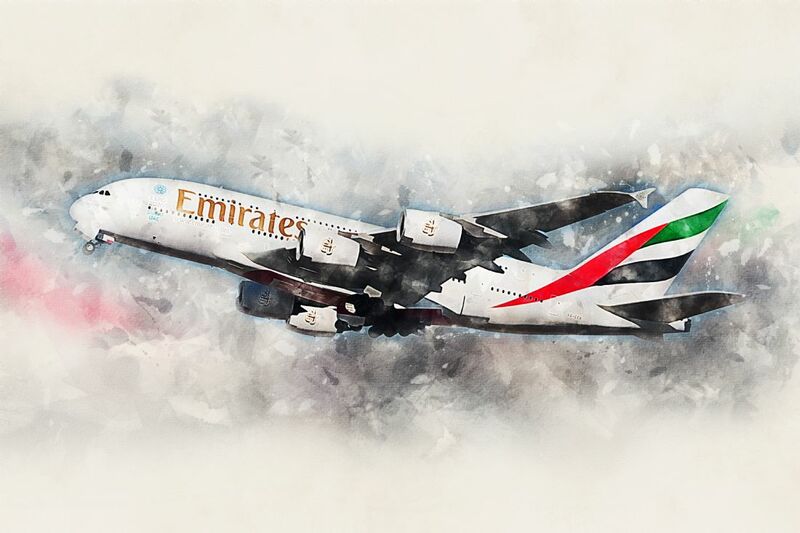 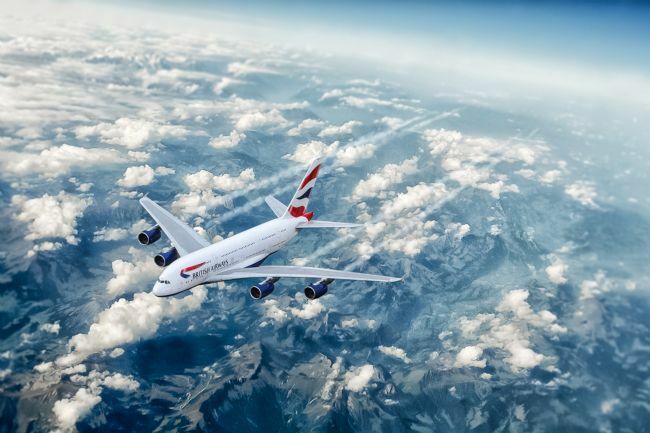 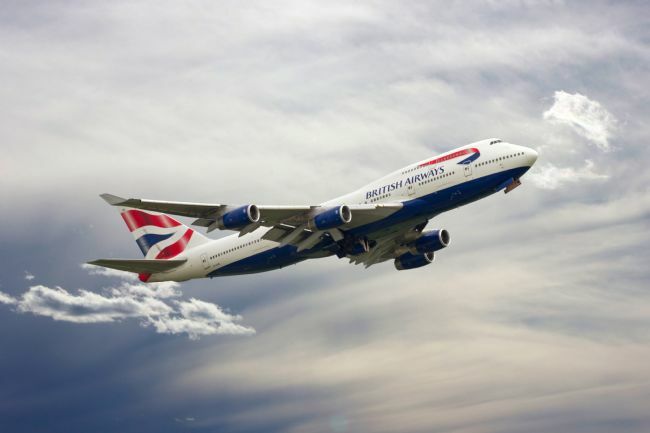 The Airbus A380 is a double-deck, wide-body, four-engine jet airliner. 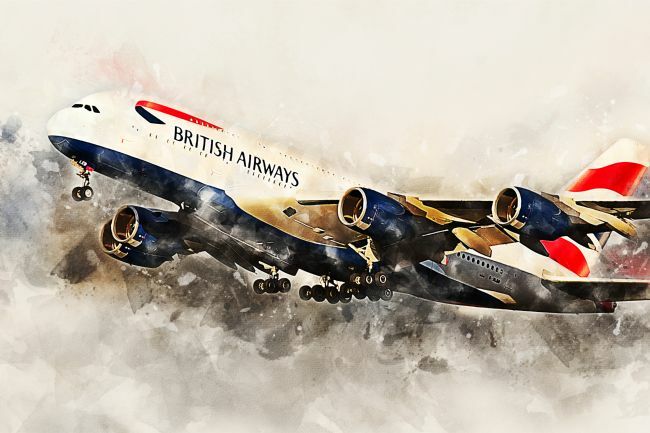 It is the world's largest passenger airliner. BAC Lightning F6 - XS904/BQ. 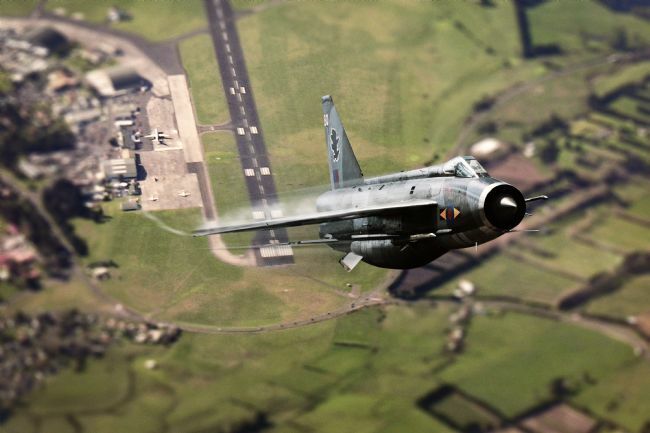 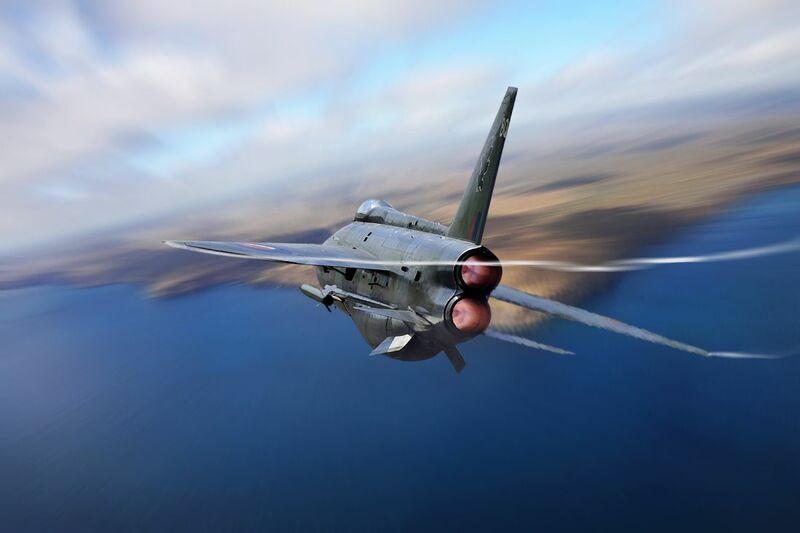 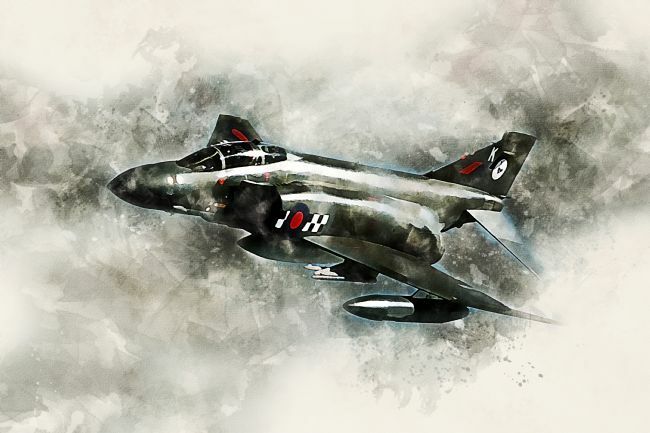 The English Electric Lightning was the only all British Mach 2 fighter to be developed during the Cold War. English Electric was later incorporated into the British Aircraft Corporation and all later aircraft were produced as the BAC Lightning. 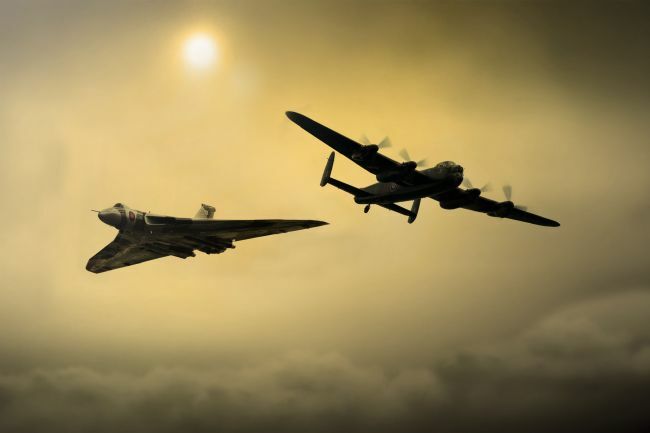 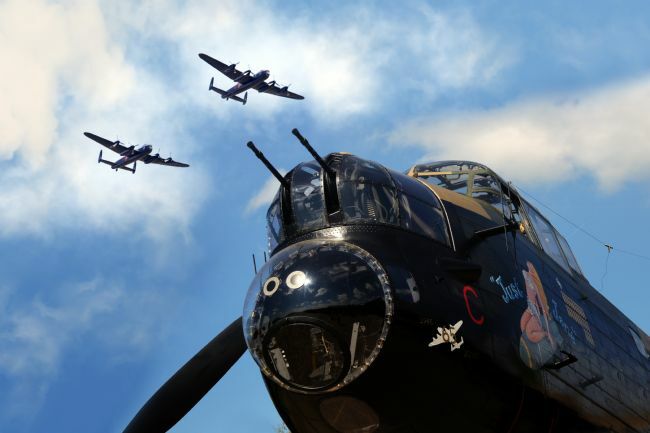 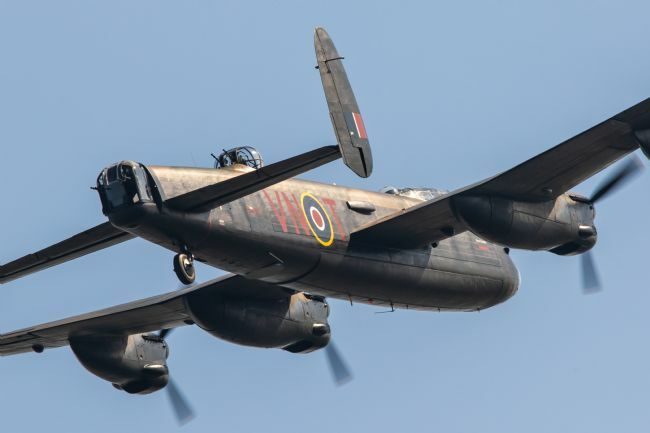 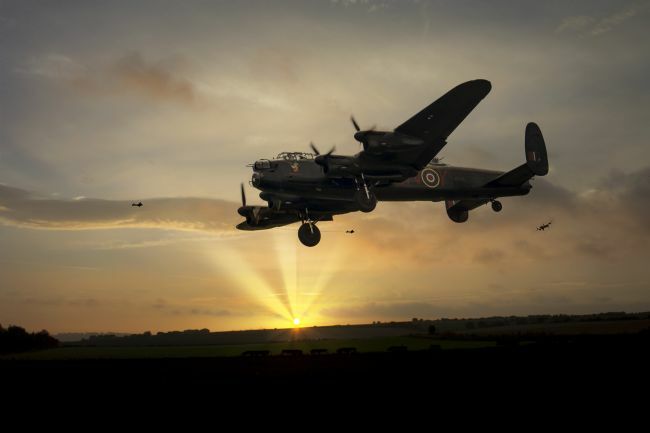 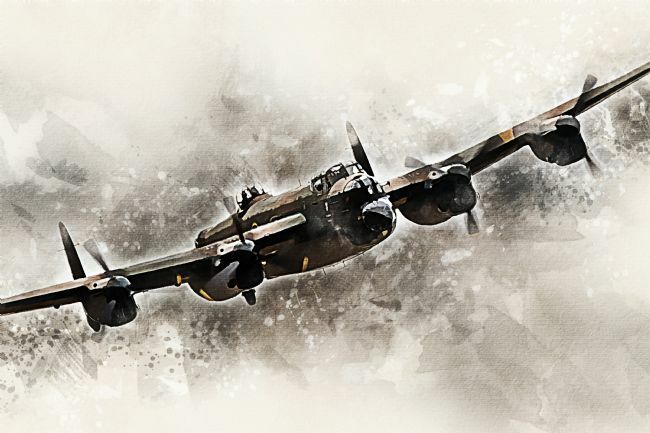 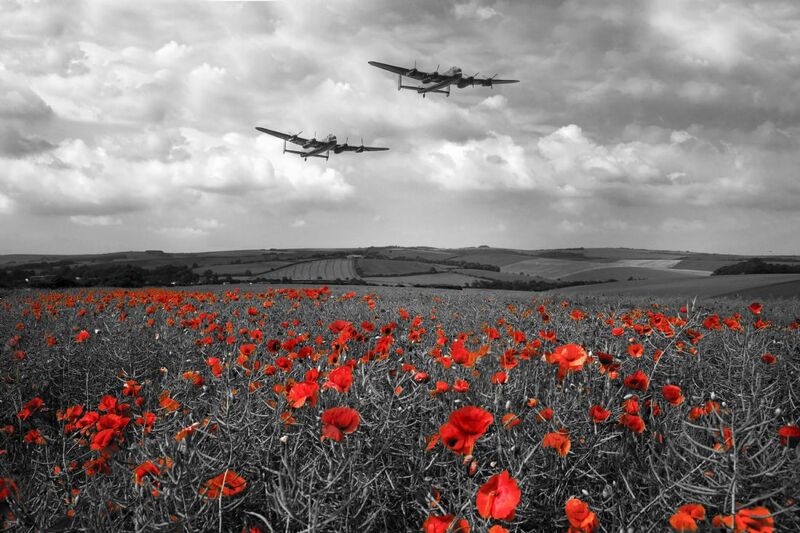 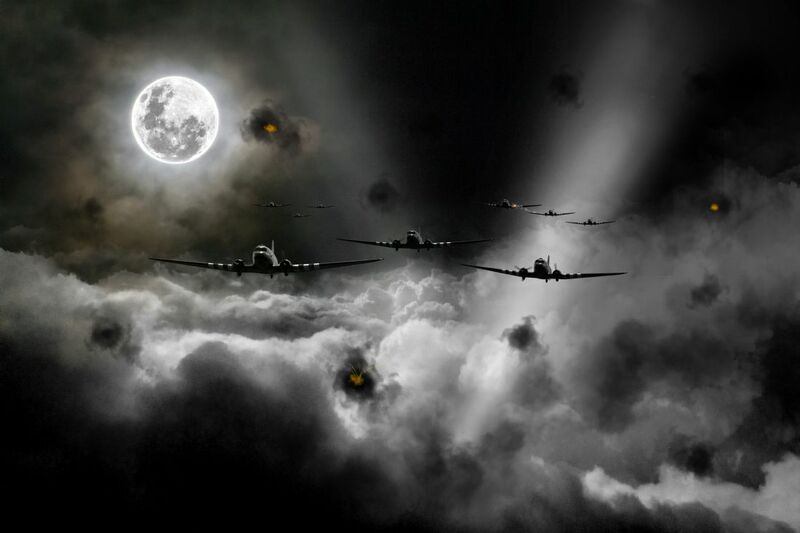 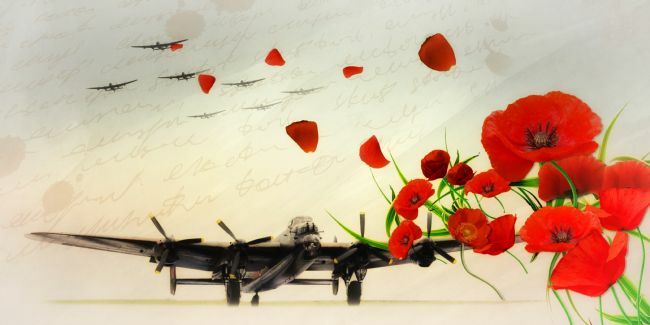 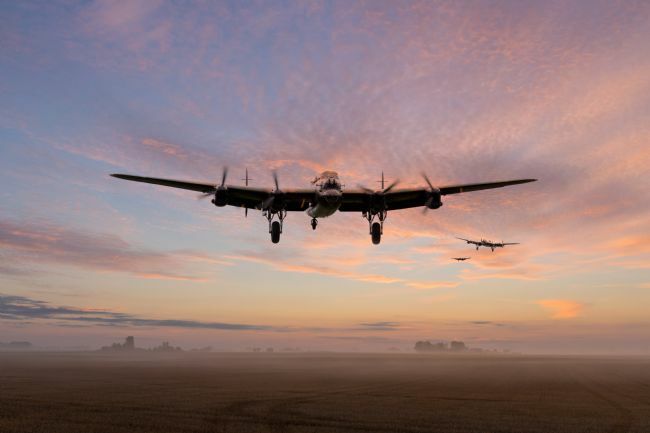 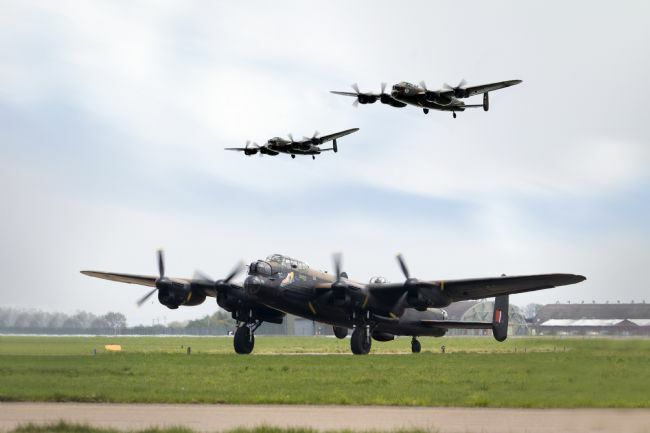 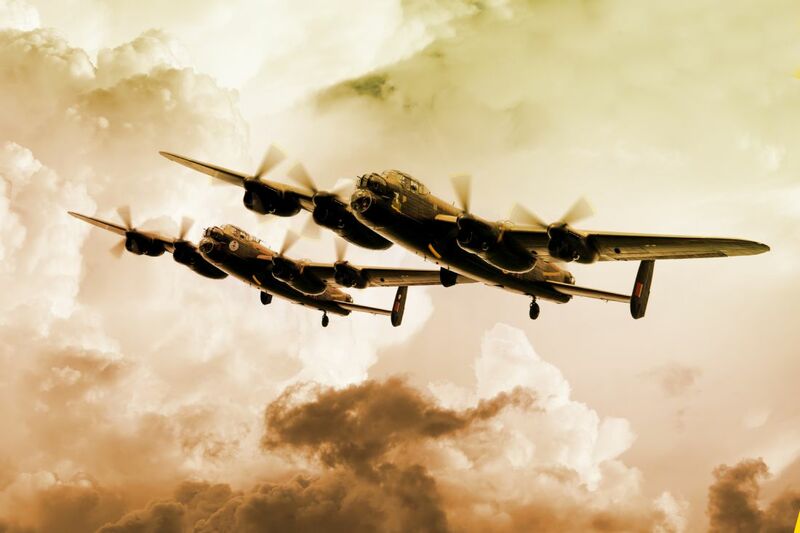 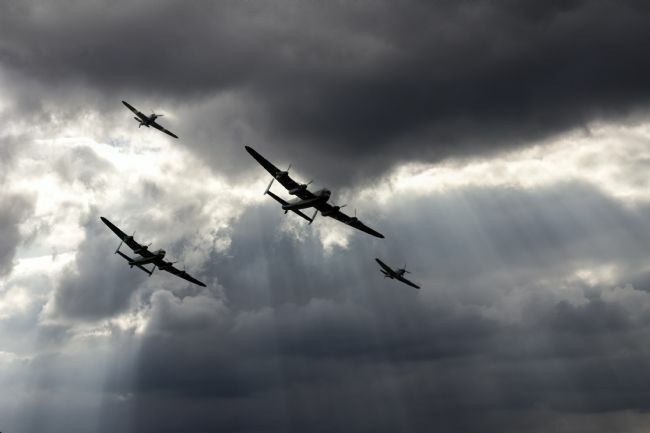 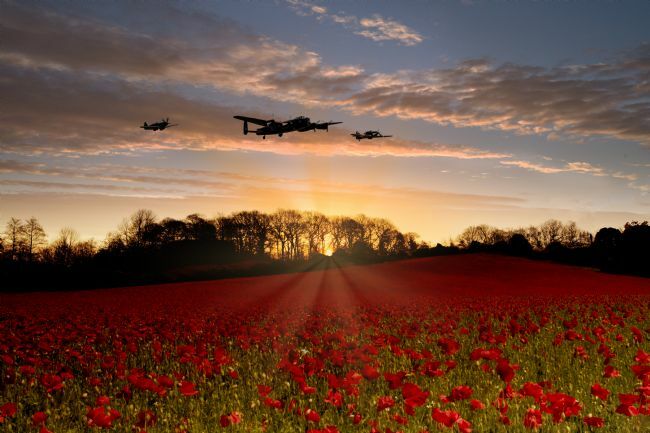 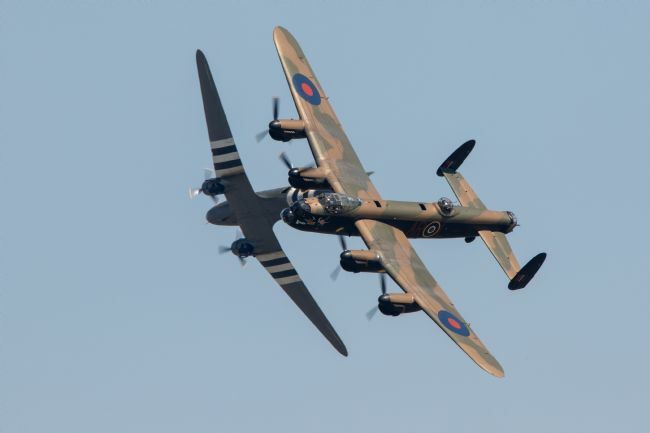 The roar of the Vulcans mighty Olympus Engines and the hum of the four Merlins on the Lancaster. 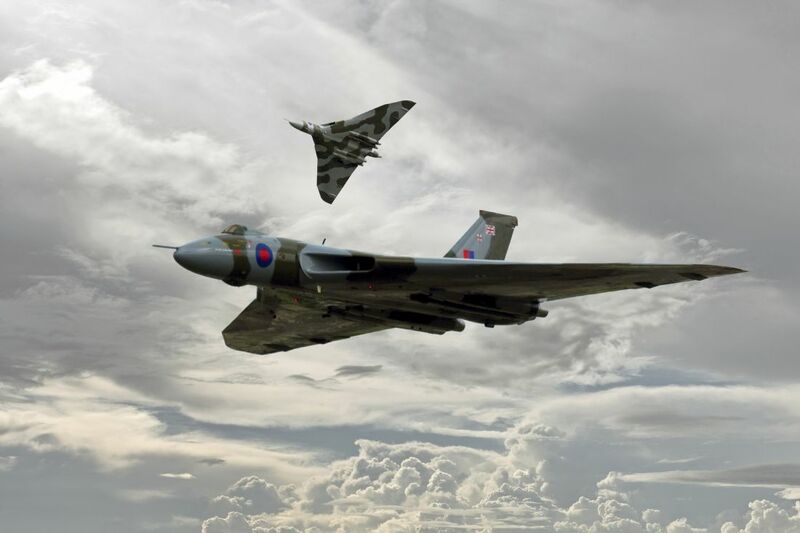 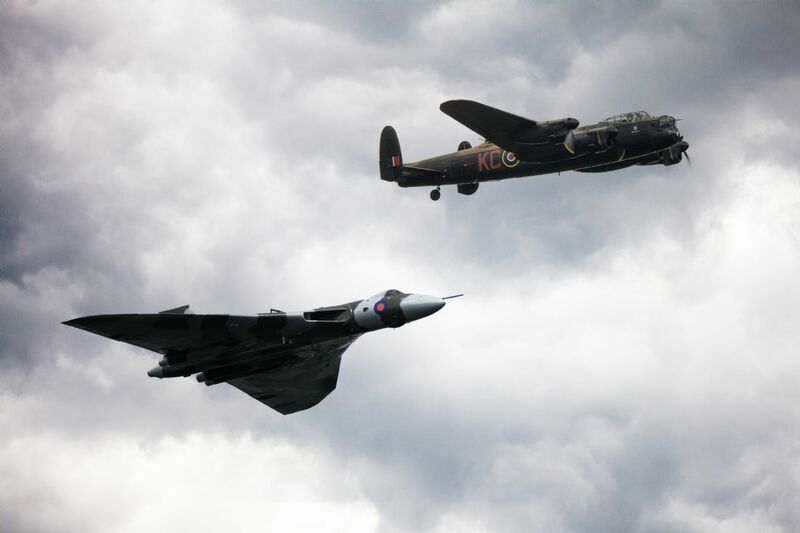 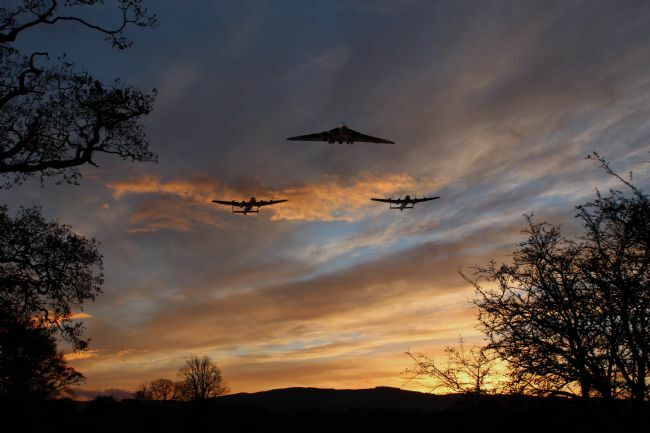 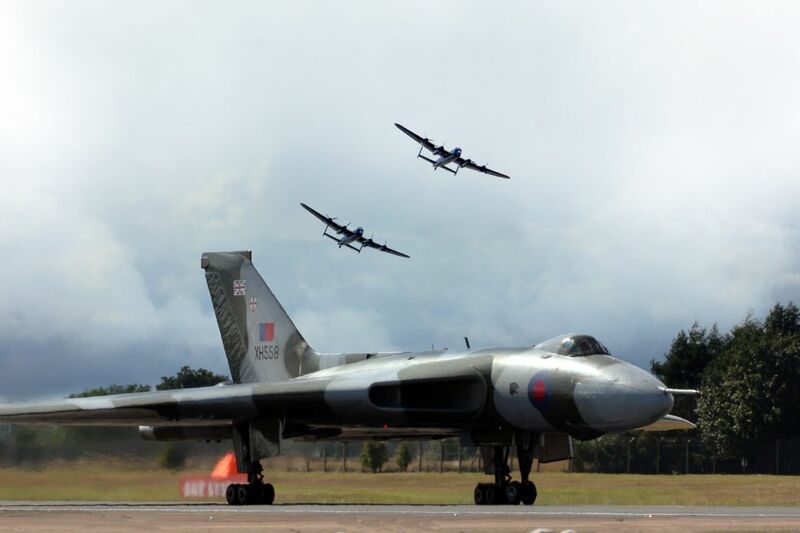 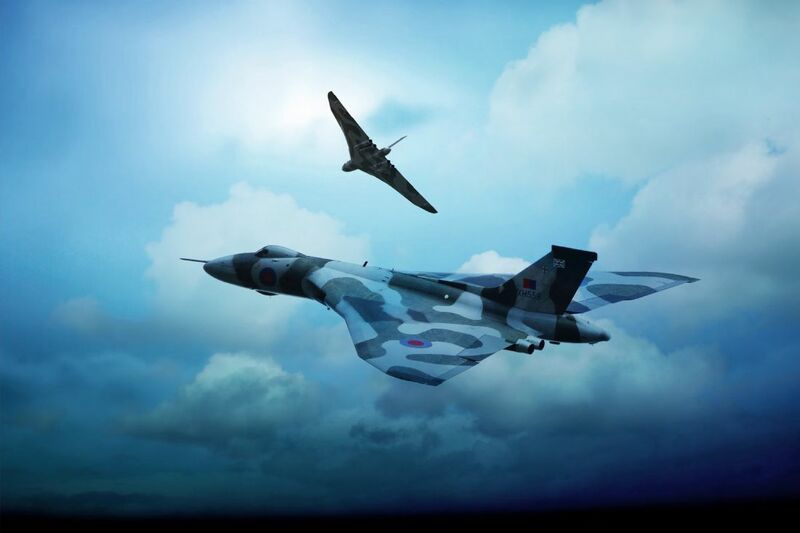 The Iconic Avro Vulcan and Avro Lancaster Bomber in formation. 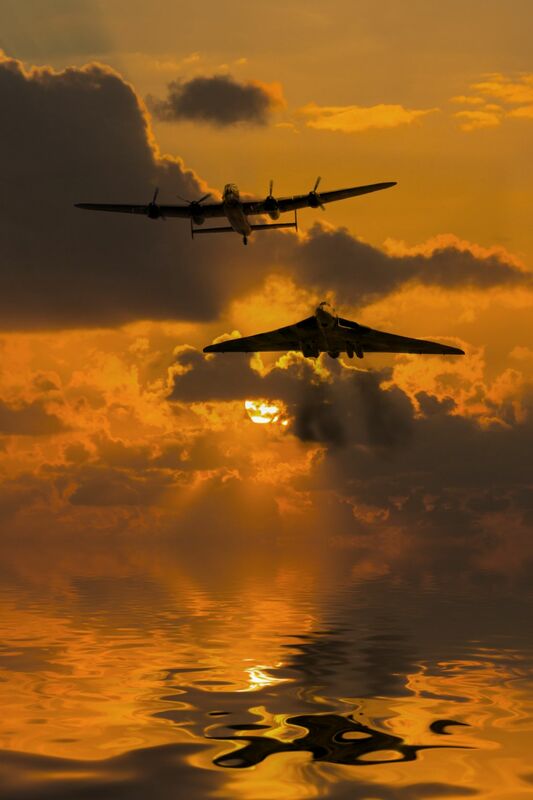 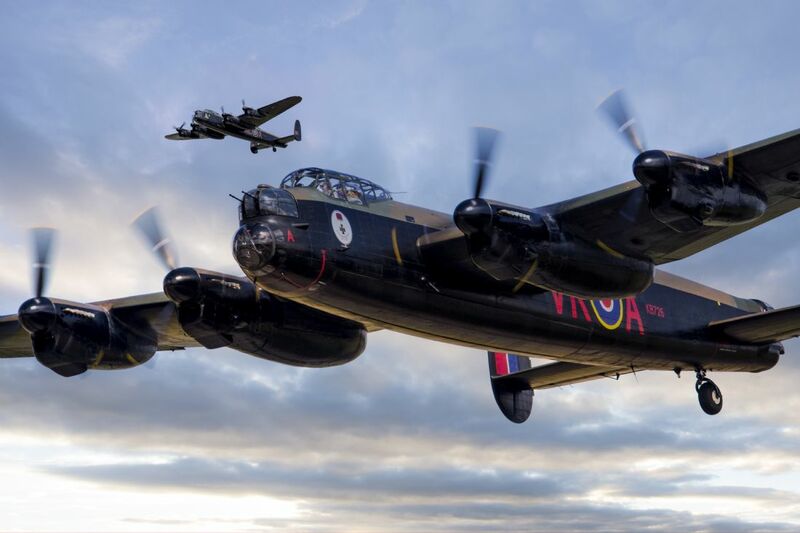 Vulcan Bomber and Lancaster Bomber. 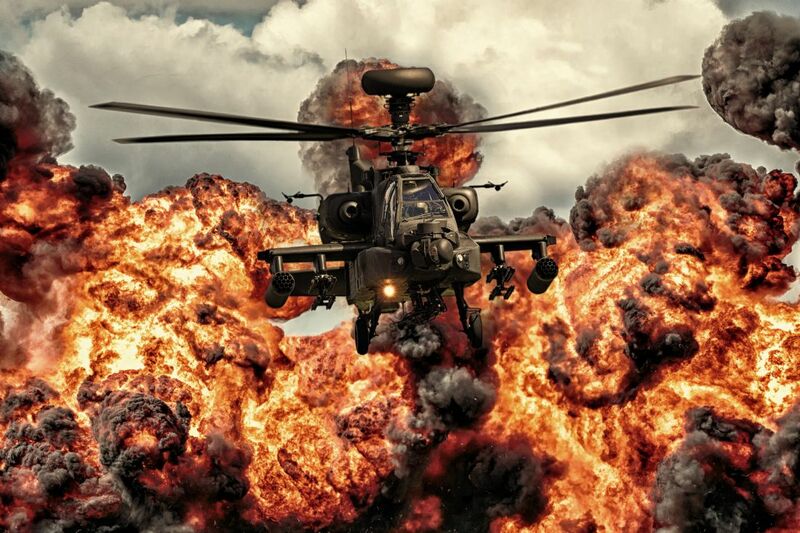 The AgustaWestland AH Mk 1 Apache. 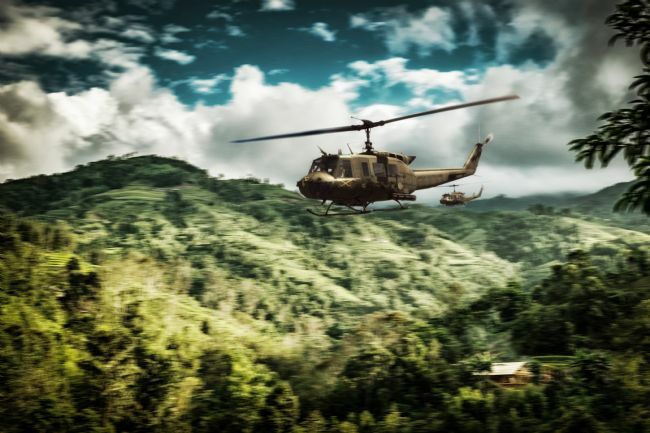 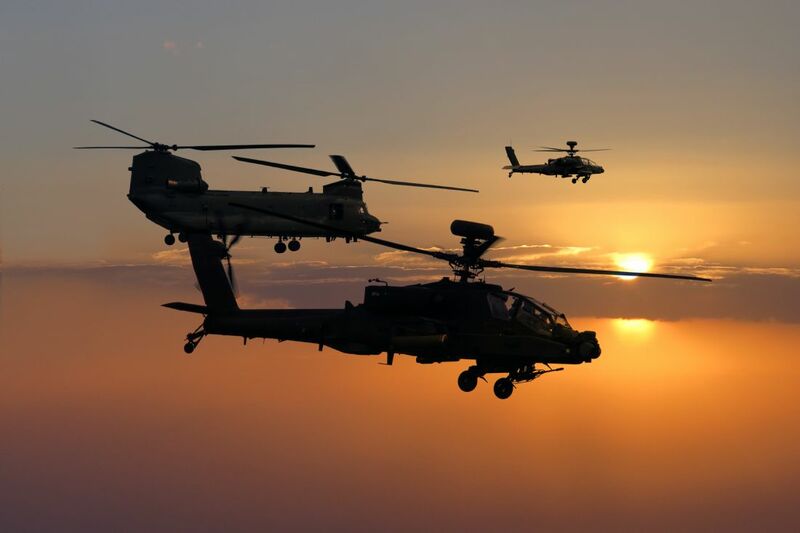 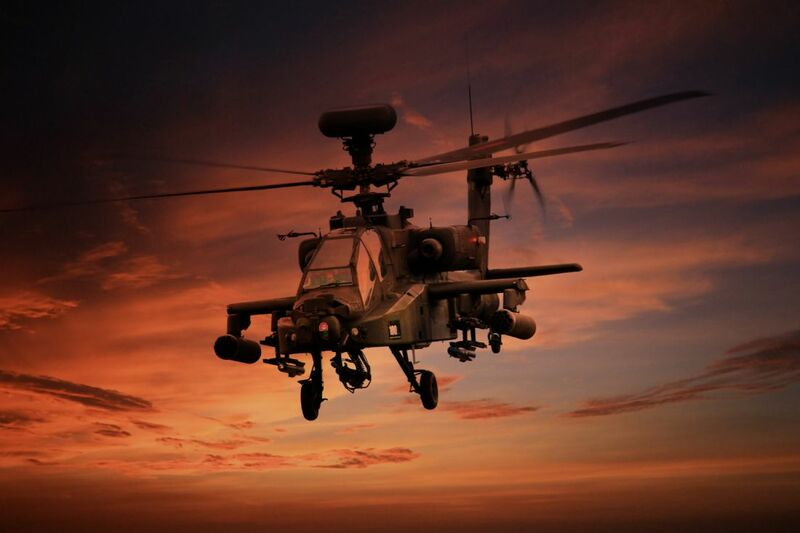 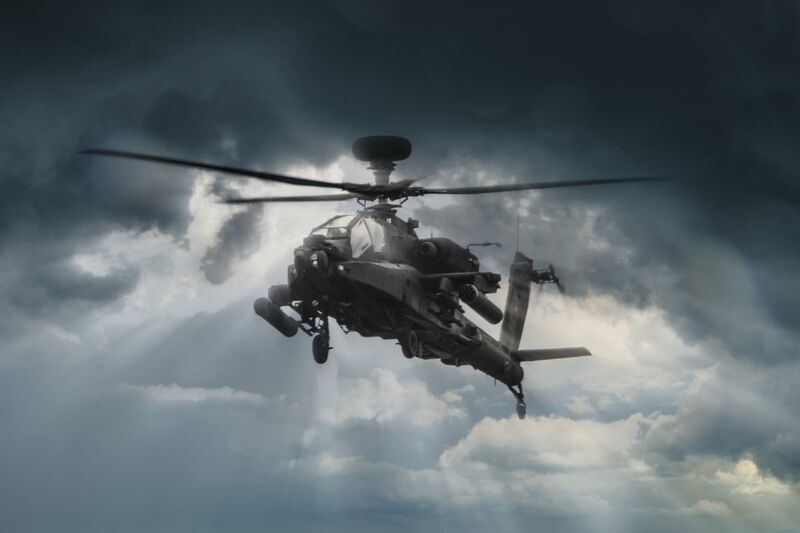 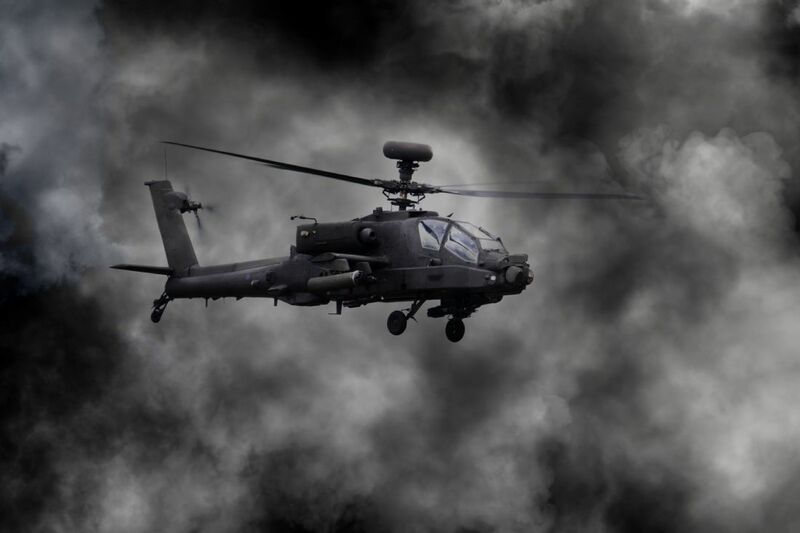 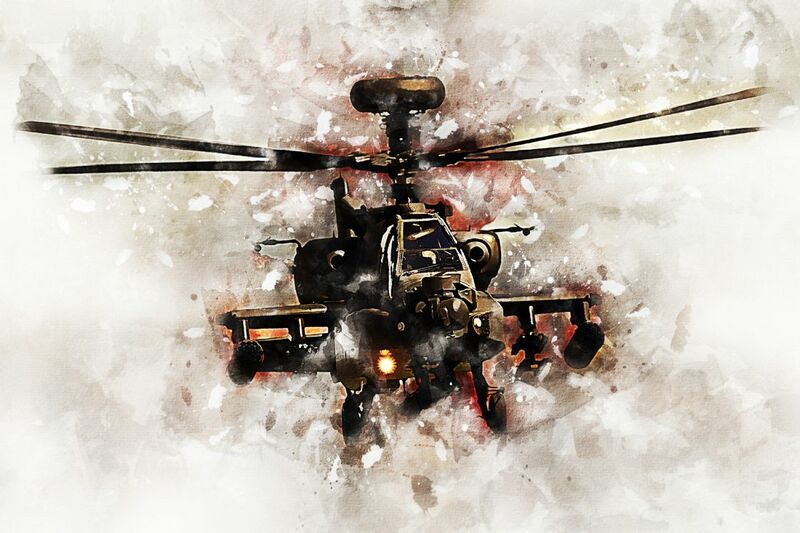 The Apache has become a valued form of close air support in the continuing conflict in Afghanistan, being deployed to the region since 2006. 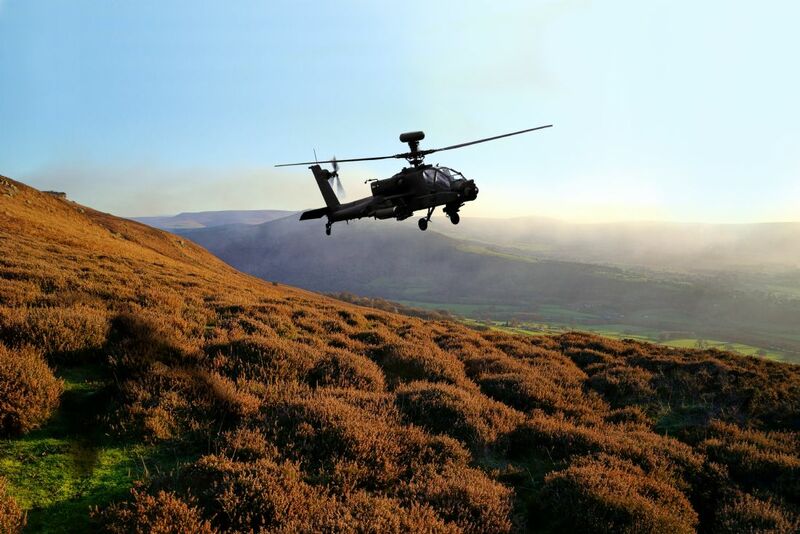 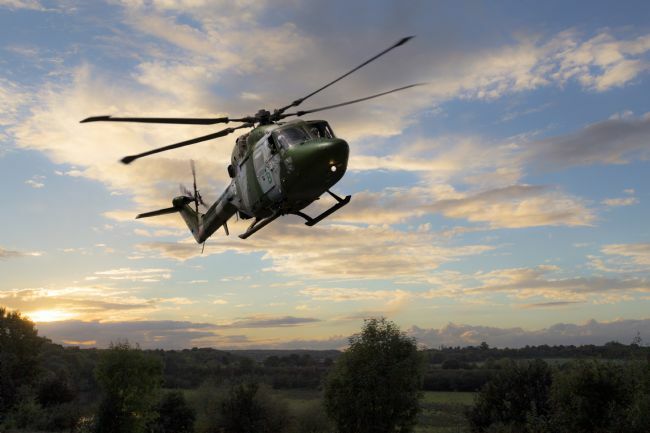 An AAC Lynx helicopter slows to a hover above the autumn countryside. 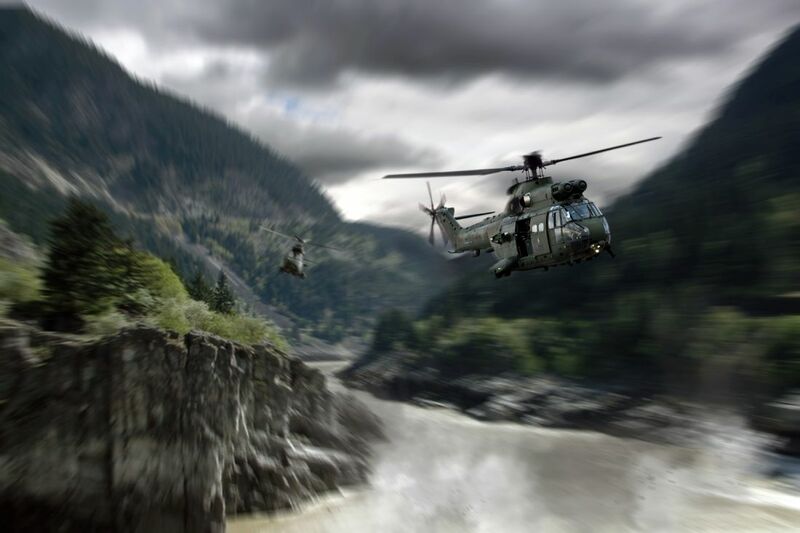 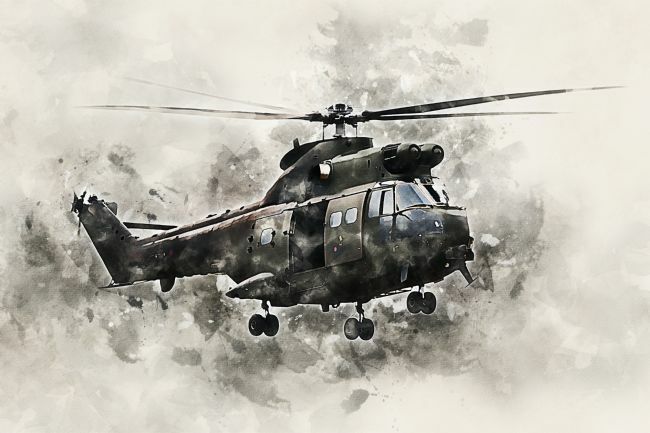 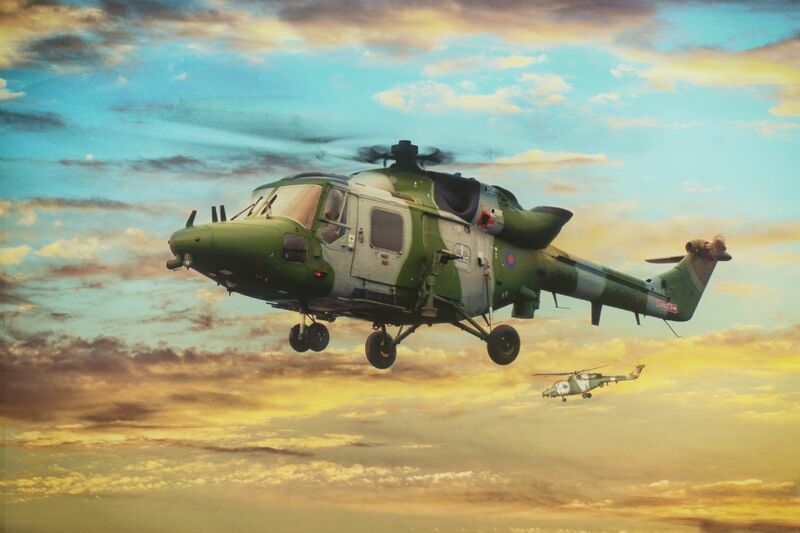 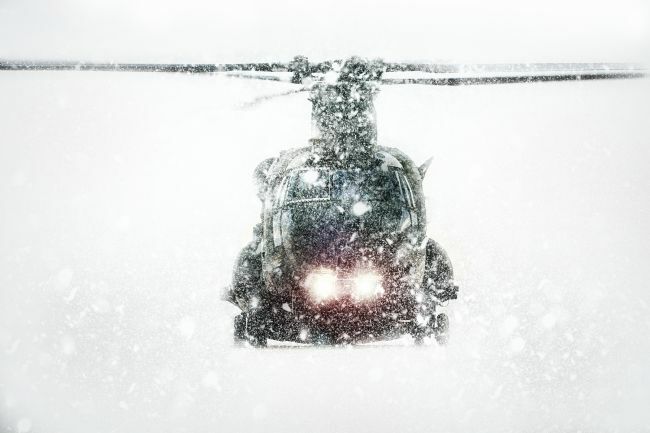 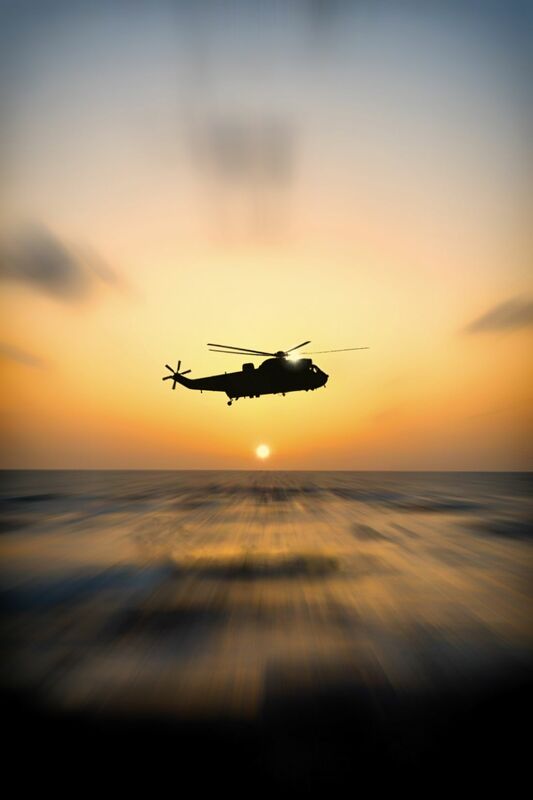 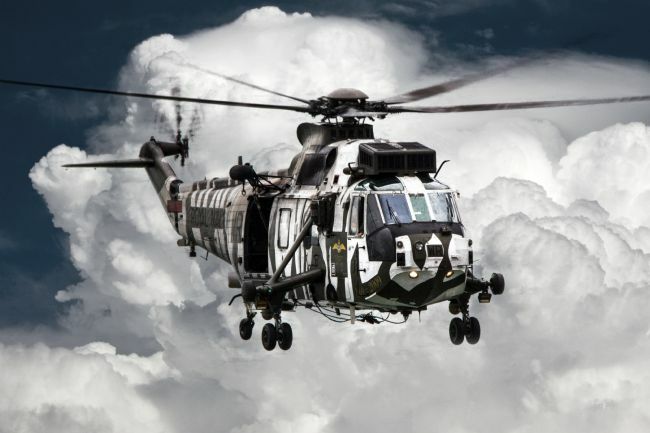 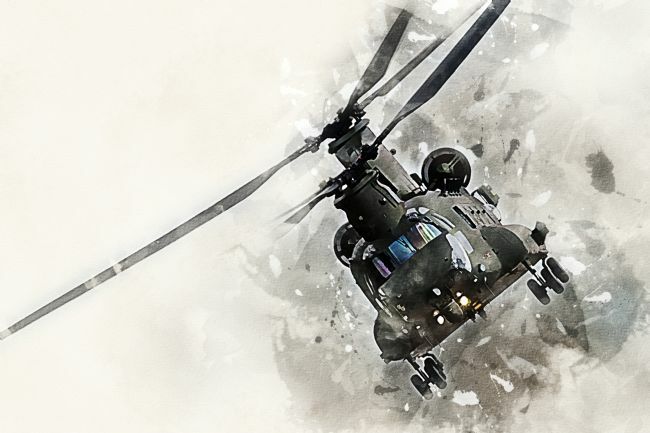 Lynx is the British Army's primary battlefield utility helicopter. 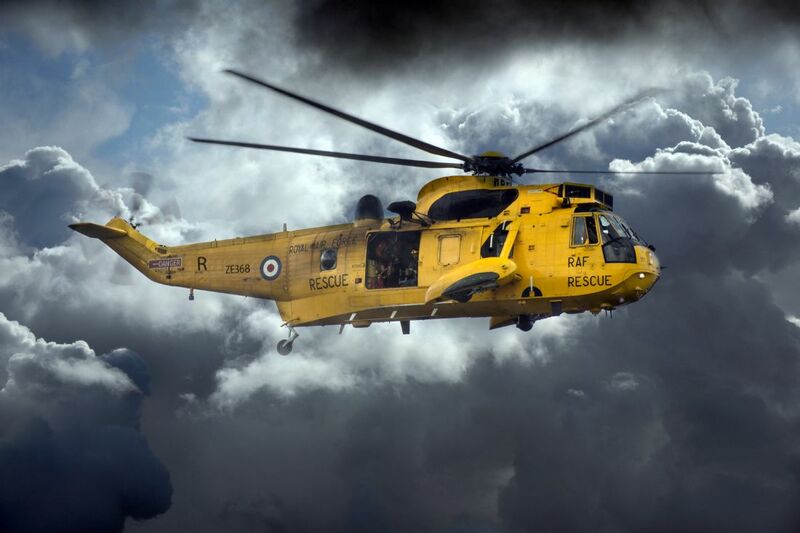 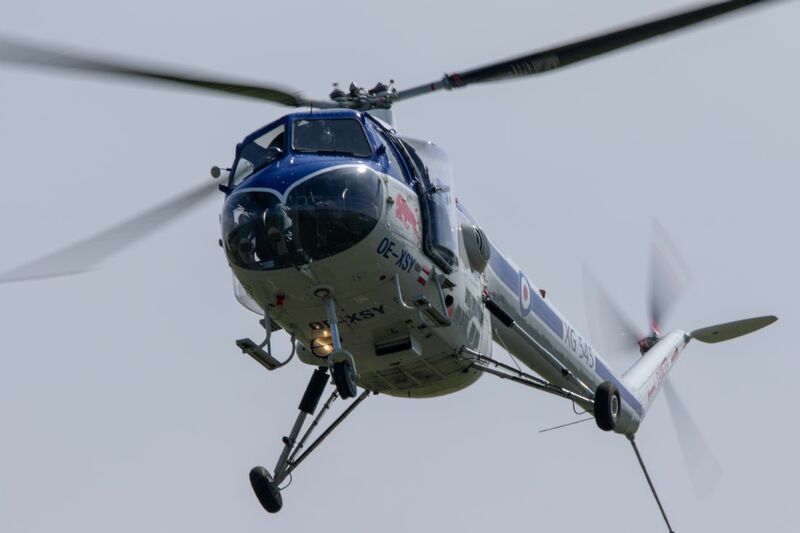 The RAF operates a total of 34 HC2s, 6 HC2As and 8 HC3s (the HC3 has yet to enter operational service). 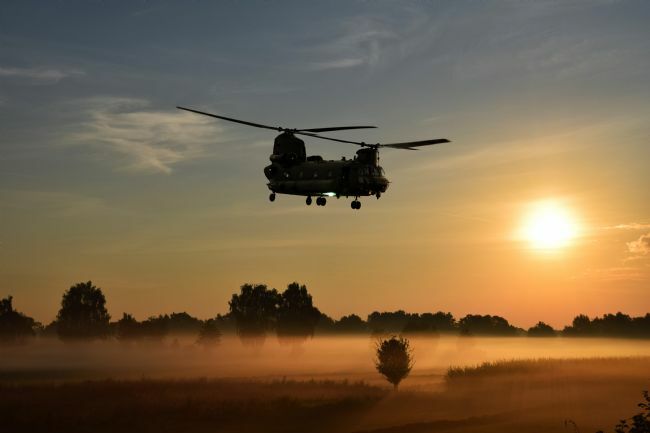 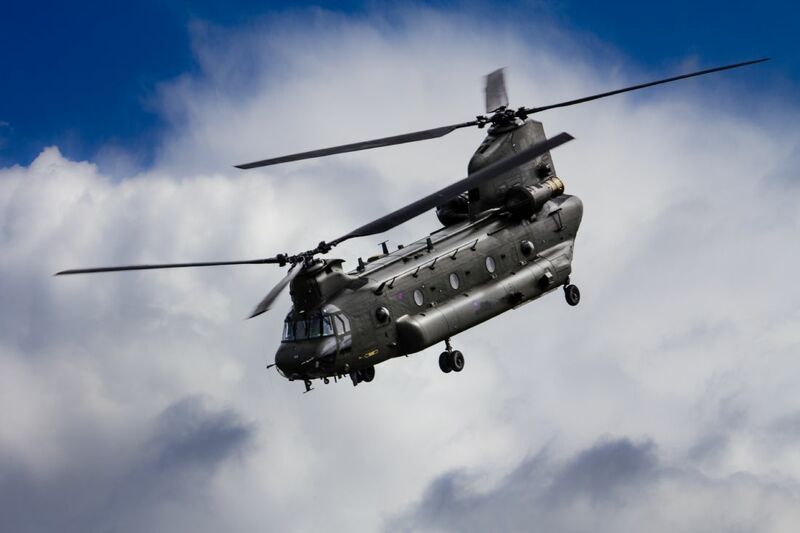 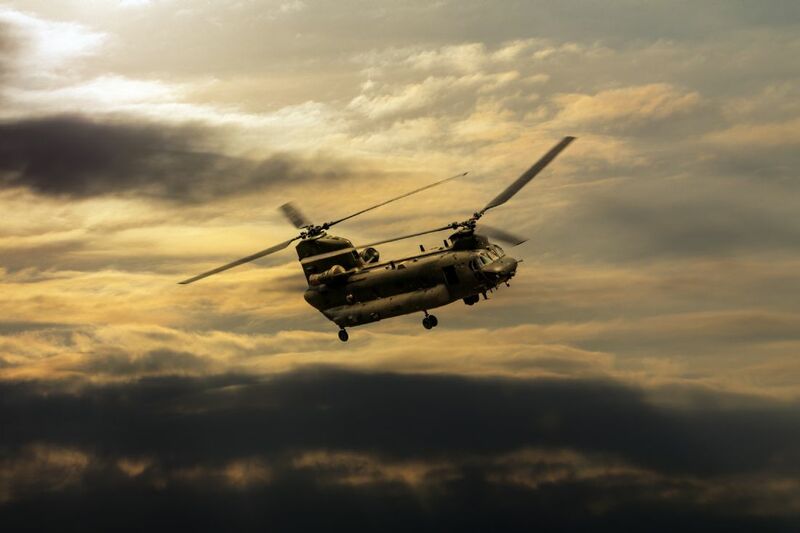 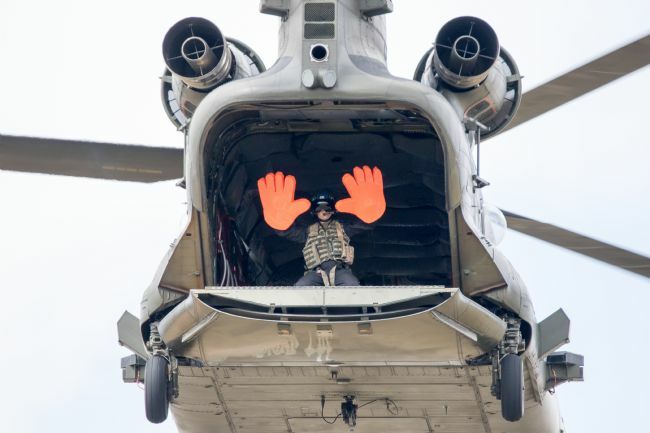 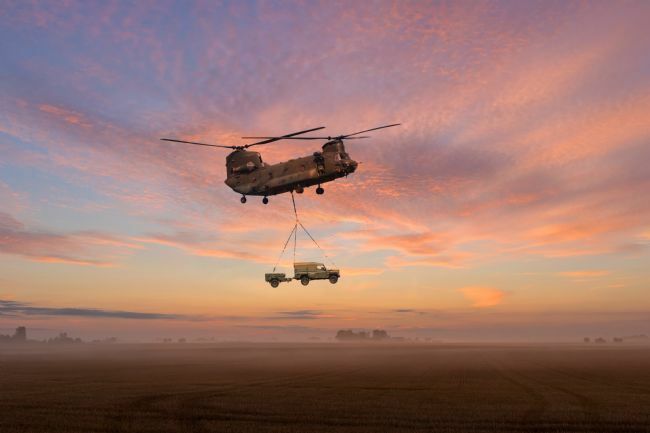 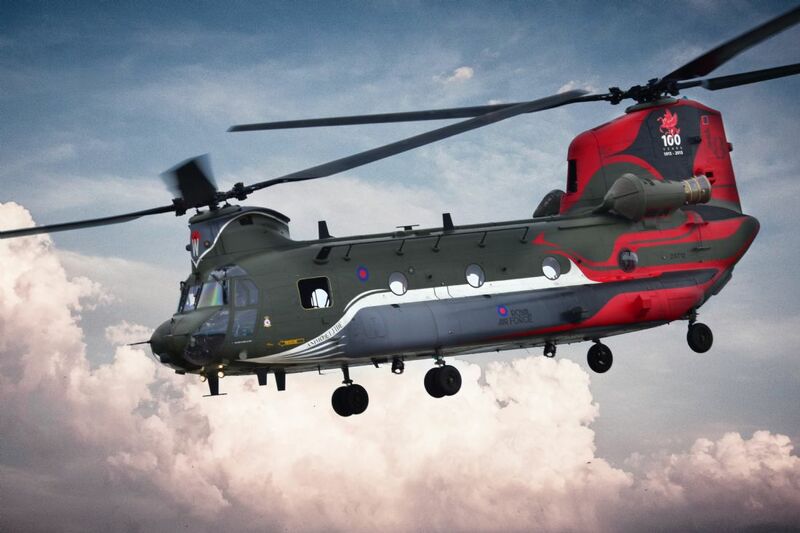 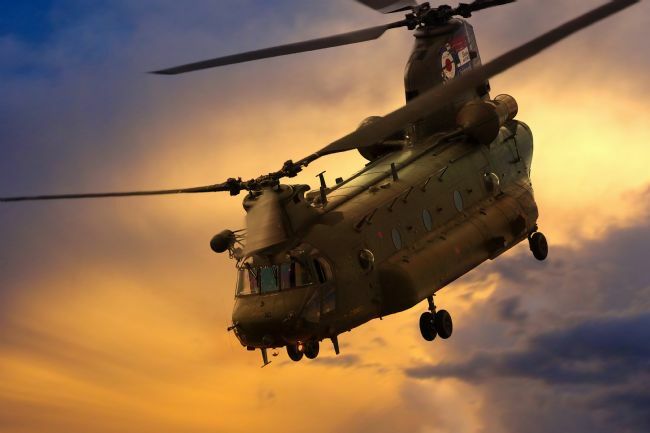 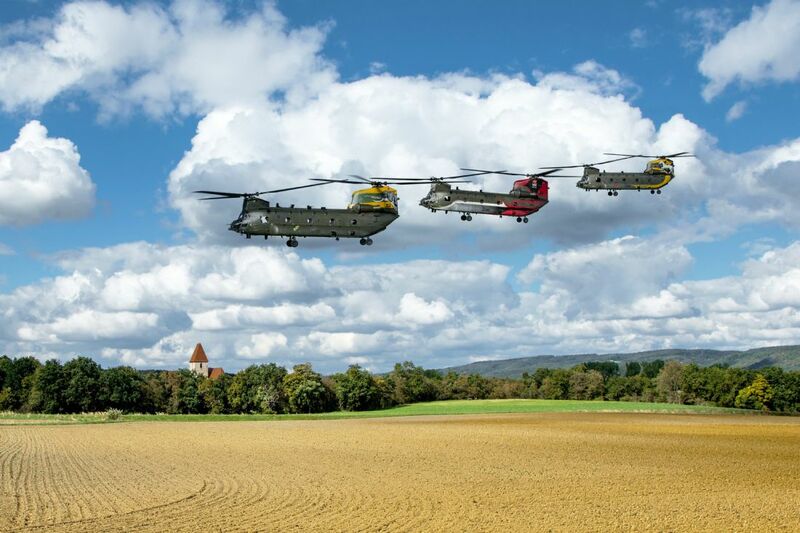 The Chinooks are part of the Joint Helicopter Command (JHC) at RAF Odiham in Hampshire. 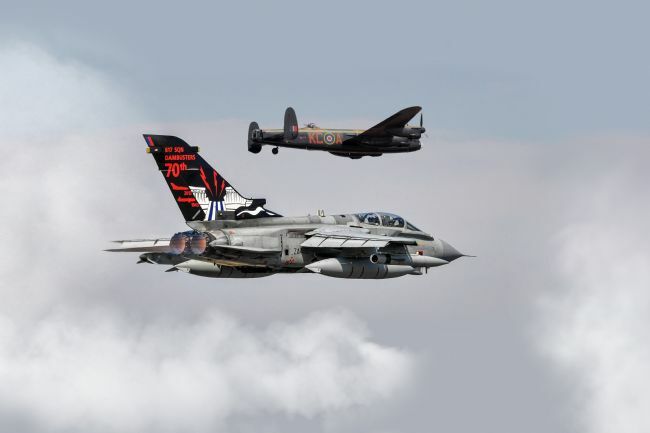 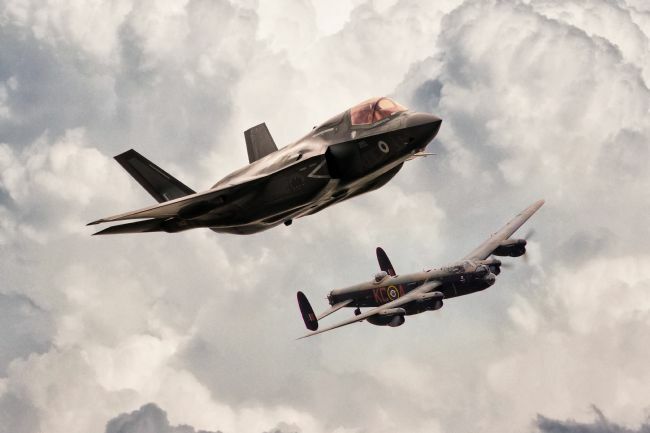 Odiham supports three operational squadrons, No 7 Squadron, No 18 Squadron and No 27 Squadron, and the Operational Conversion Flight. 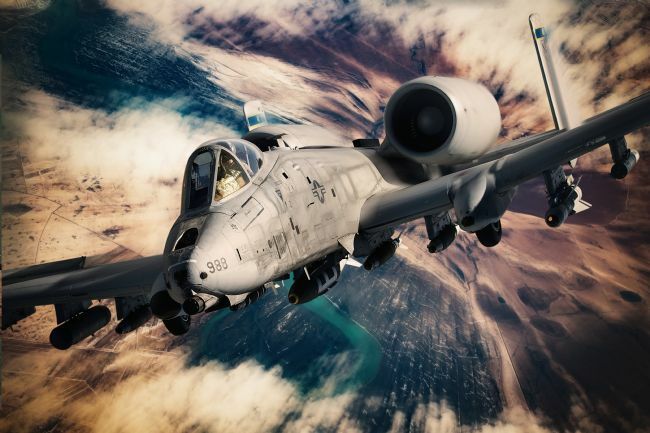 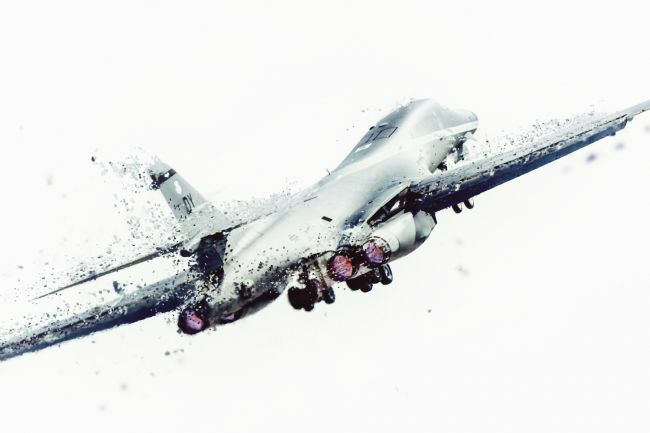 The A-10 was used in combat for the first time during the Gulf War in 1991, destroying more than 900 Iraqi tanks, 2,000 other military vehicles and 1,200 artillery pieces, making it by far the most effective aircraft of the war. 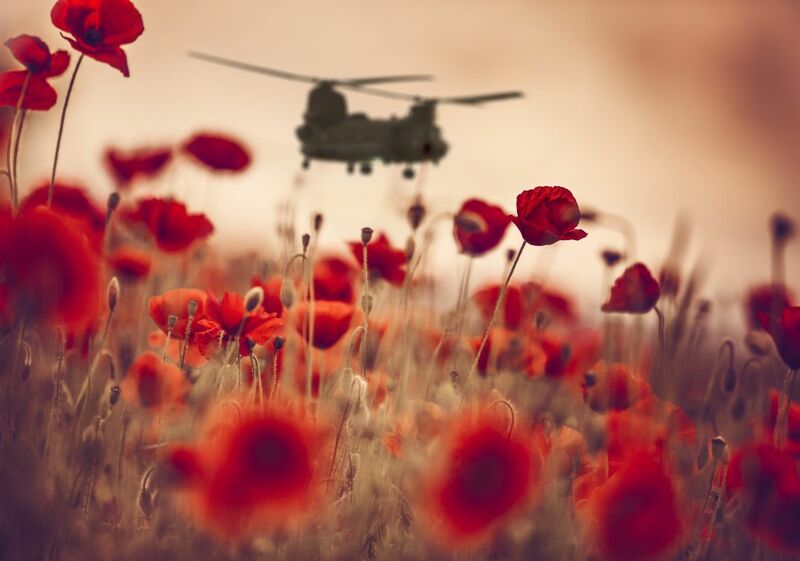 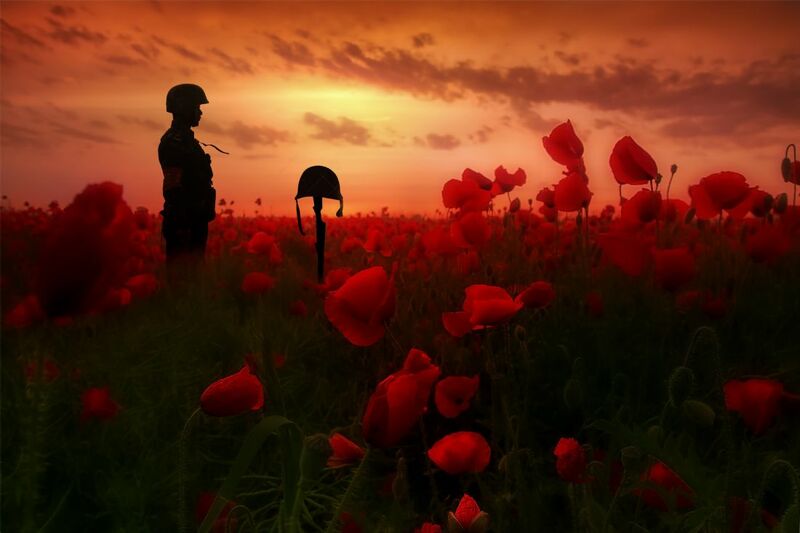 A silhouetted soldier stands in a field of poppies and pays his respects to all the fallen heroes. 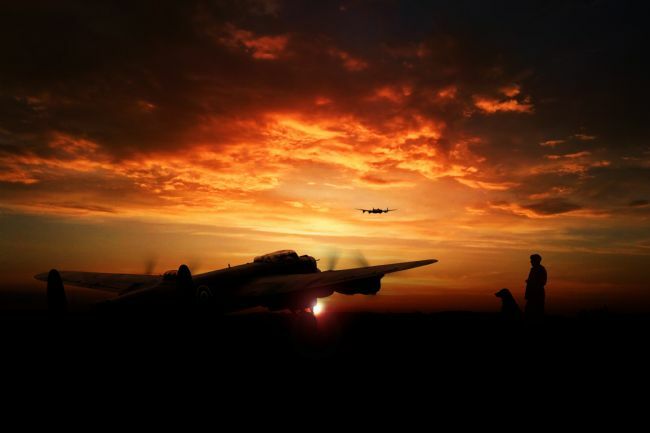 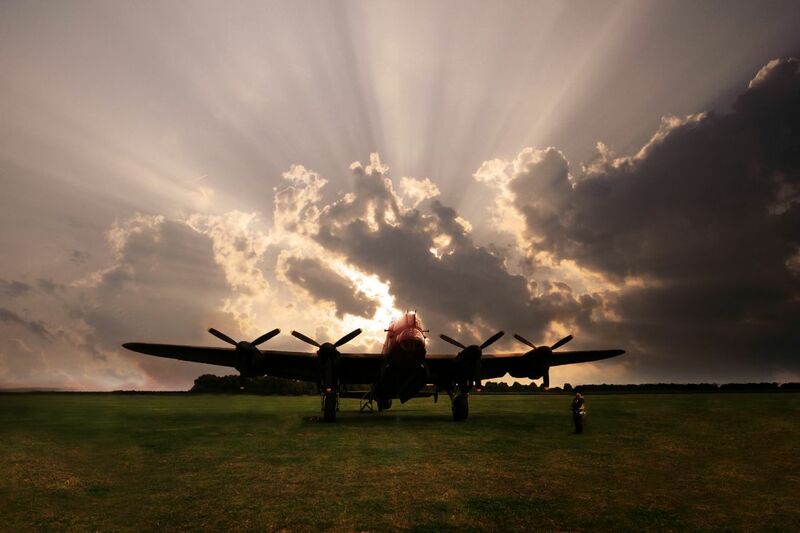 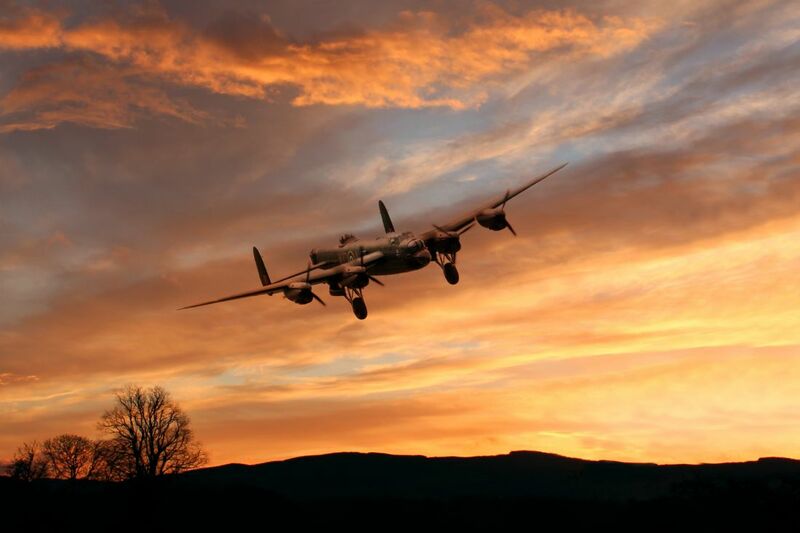 The flight captain stands in front of his Lancaster Bomber in a moment of quiet contemplation as the sun sets behind. Flight Lieutenant Eric James Brindley Nicholson of 249 Squadron Church Fenton. 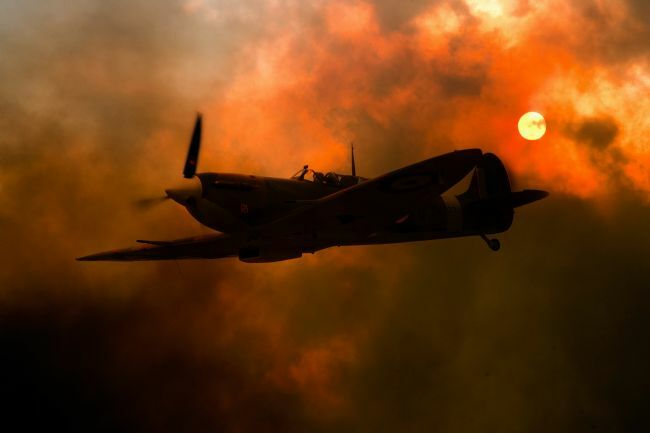 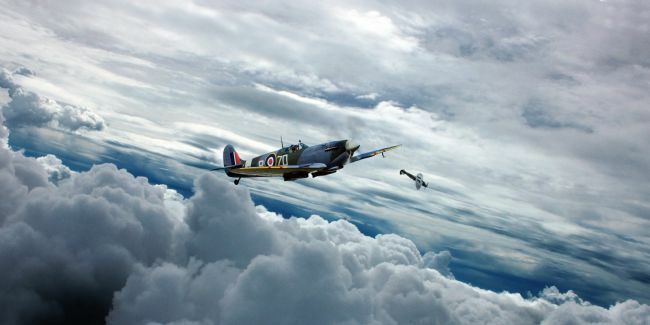 Was awarded the Victoria Cross, when, On 16 August 1940, Nicolson's Hawker Hurricane was fired on by a Messerschmitt Bf 110, injuring him in one eye and one foot. 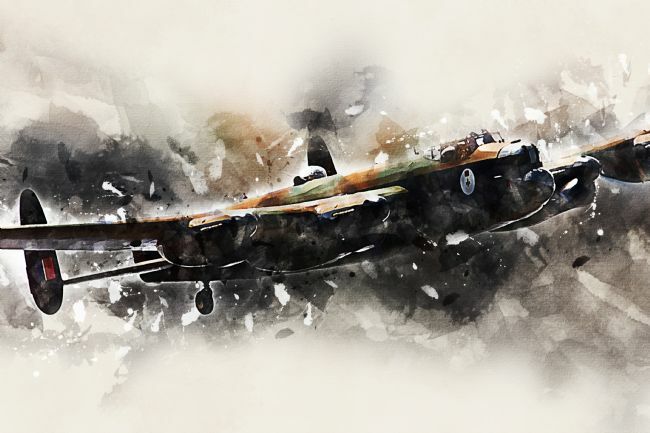 As he struggled to leave the blazing machine he saw another Messerschmitt, got back into the bucket seat, pressed the trigger and shot down the enemy plane. He was able to bail out land safely in a field. 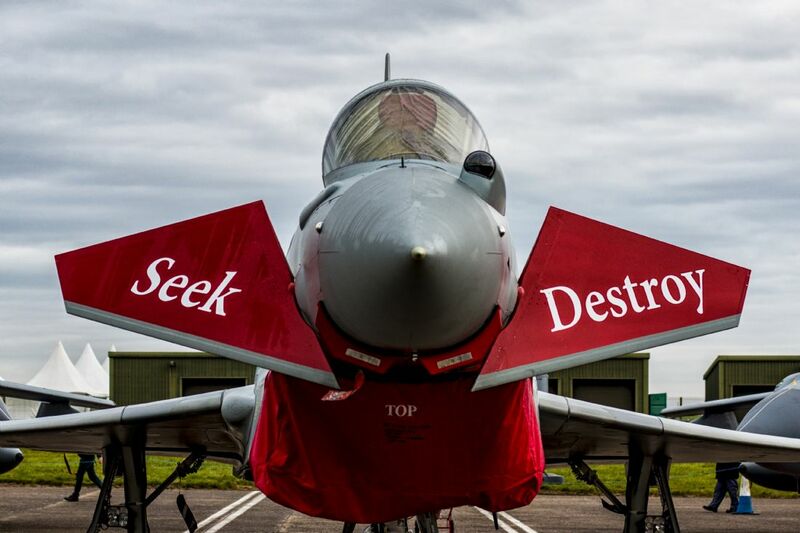 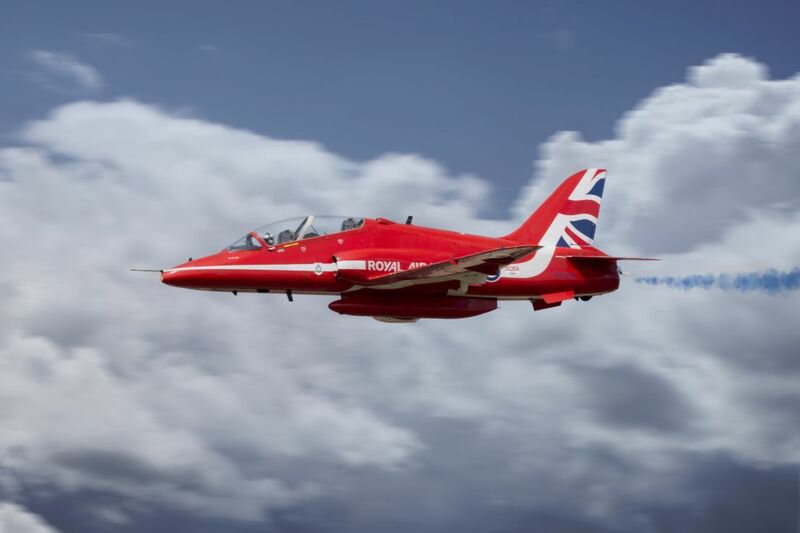 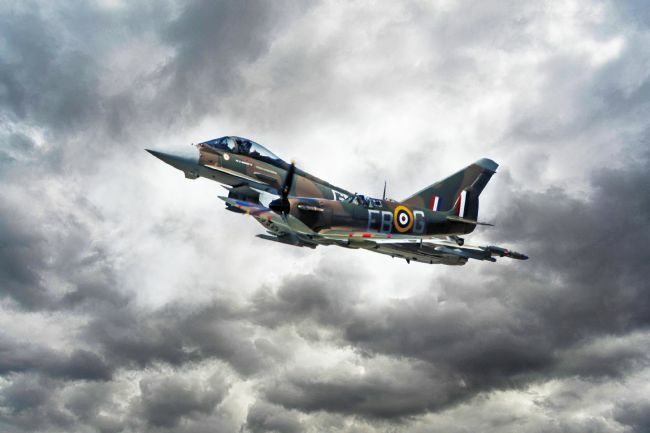 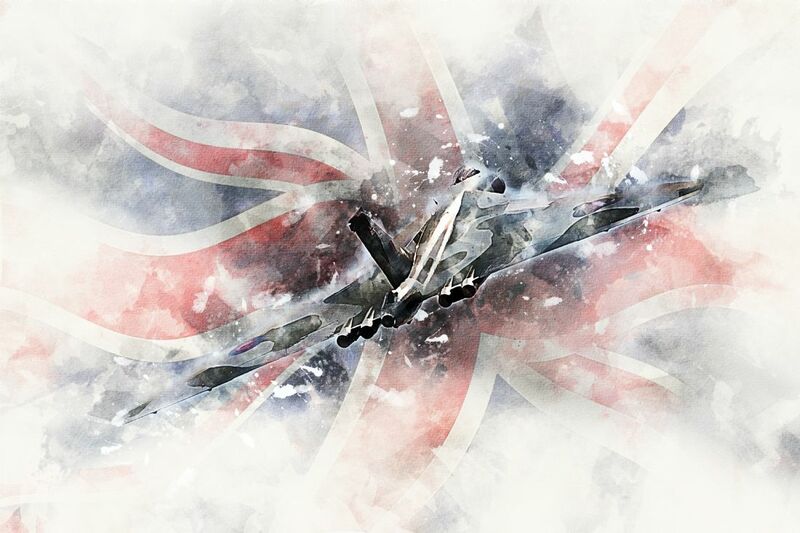 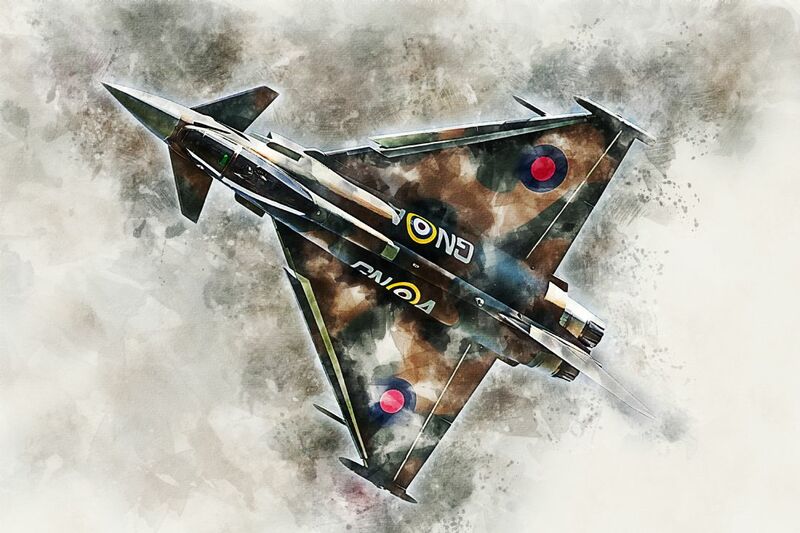 In 2015 the RAF Typhoon display aircraft was painted in special scheme to represent Nicholson's Hurricane. 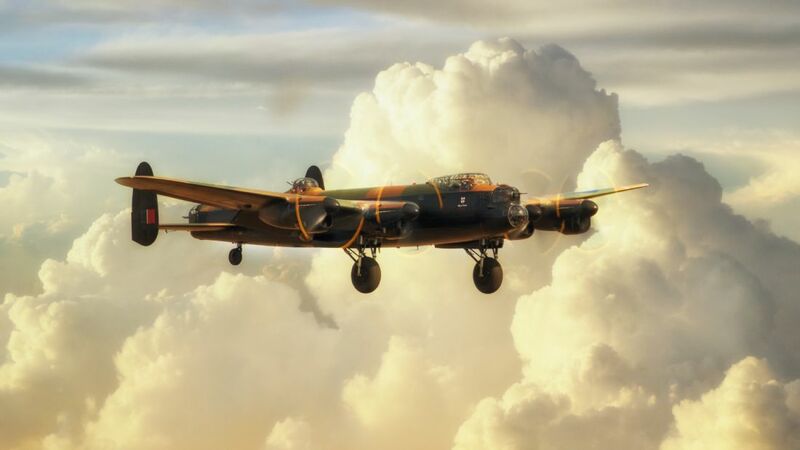 After the fall of Italy 253 Squadron was relocated where it provided bomber escorts over Yugoslavia and took part in anti-shipping missions in the Adriatic. 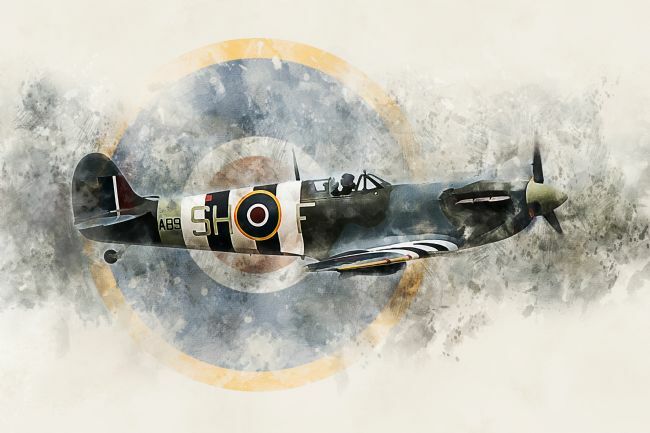 Centenary commission piece for No.33 Squadron Royal Air Force. 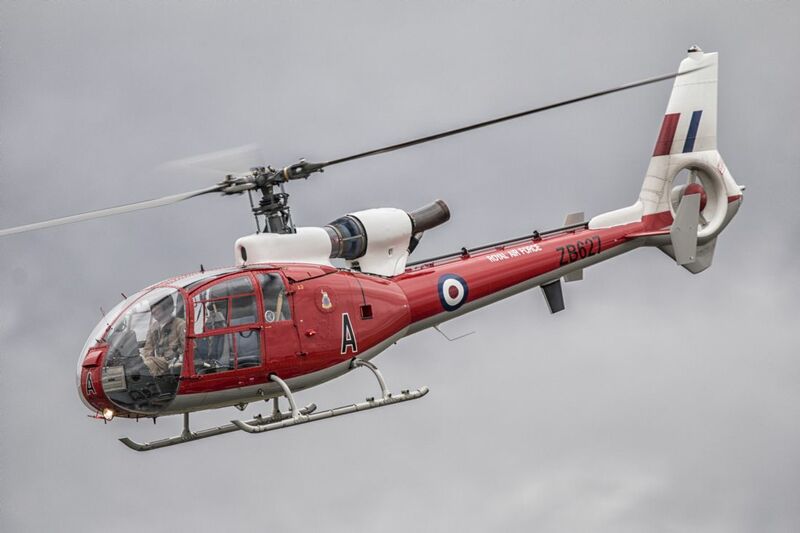 The Bristol Type 171 Syacamore Helicopter. 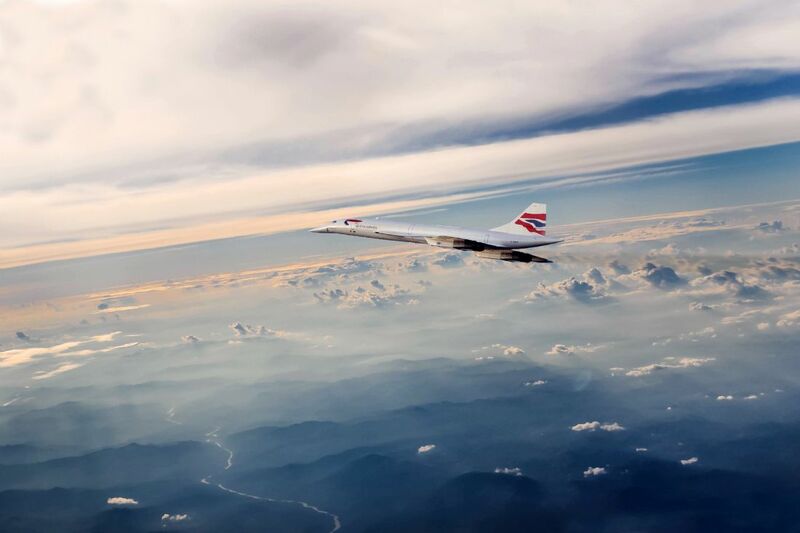 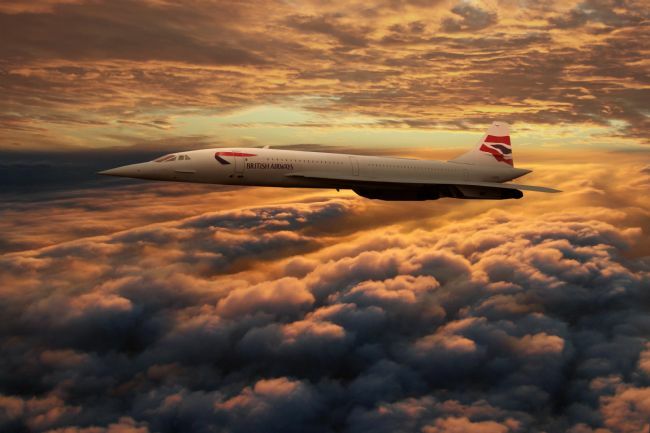 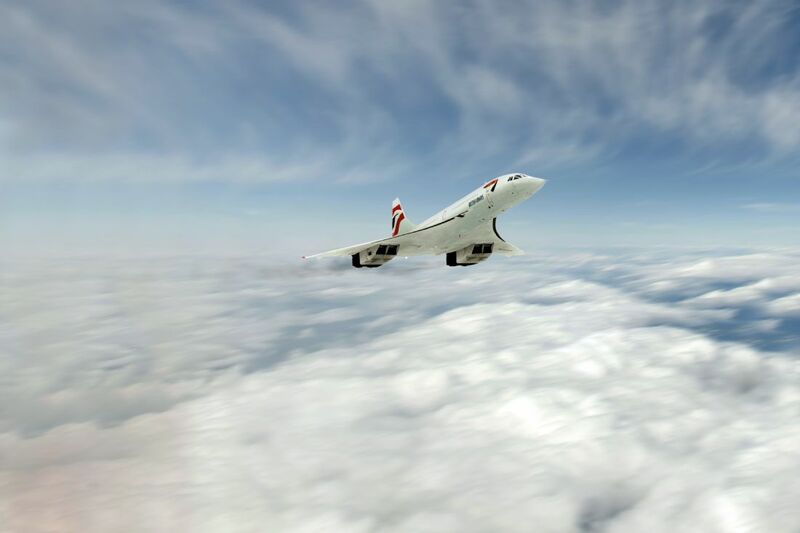 British AIrways Concorde above the clouds. 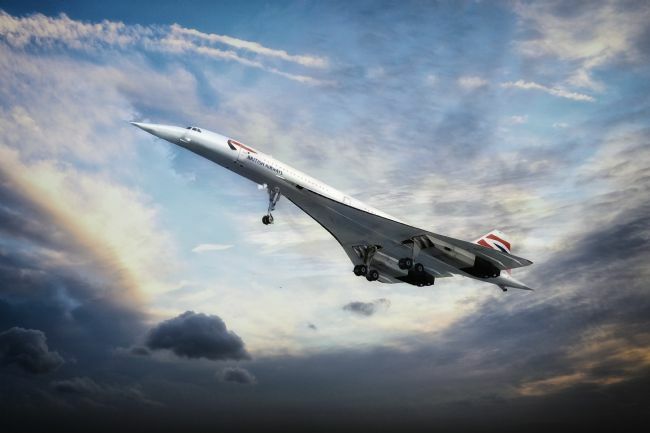 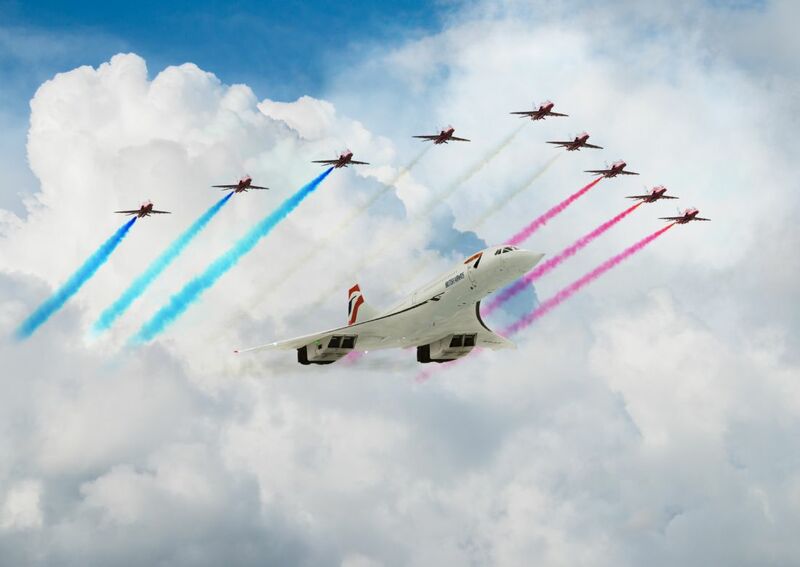 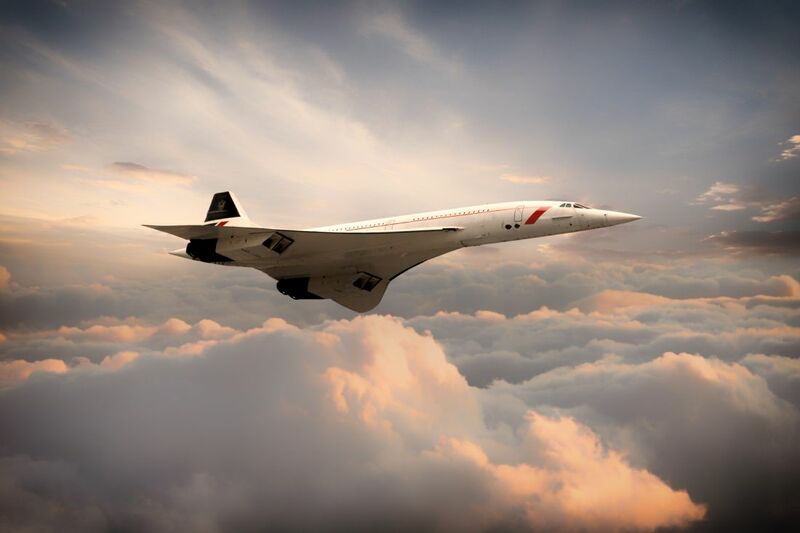 The Concorde ws the fastest commercial airliner in the world. Spitfire PR Mk XIX PM631 a high altitude photographic reconnaissance Spitfire. 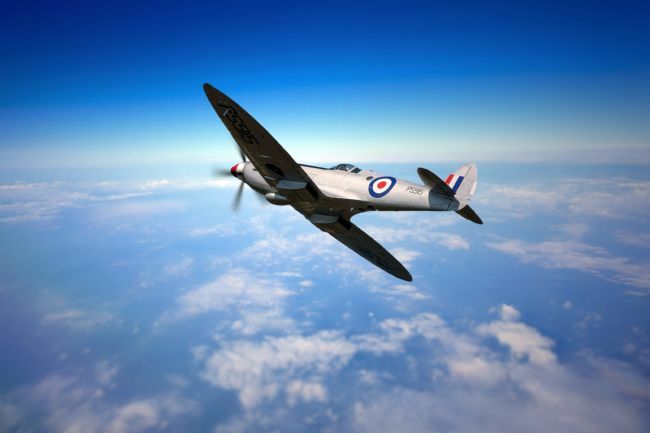 Spitfire PR XIXs were unarmed but could fly at 370mph at 40,000 feet (with pressurised cockpits) and had a range of 1,500 miles. 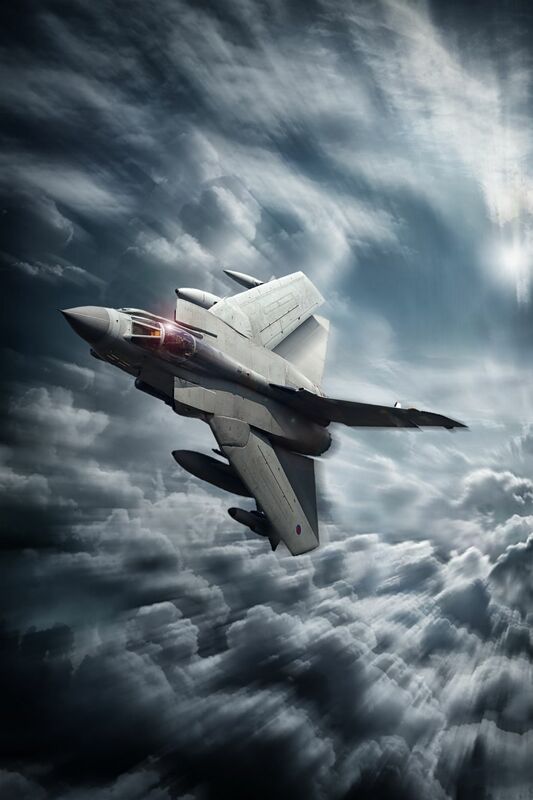 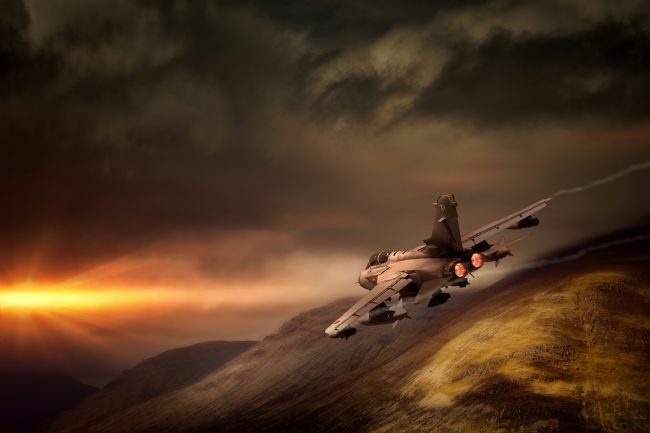 A 31 Squadron 'Goldstars' Tornado GR4 bursts through the clouds. 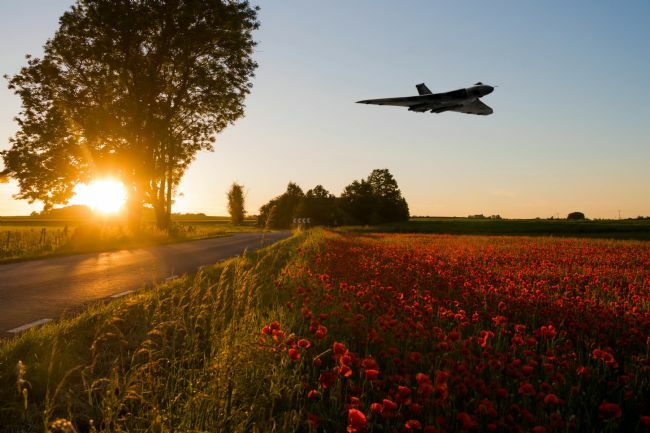 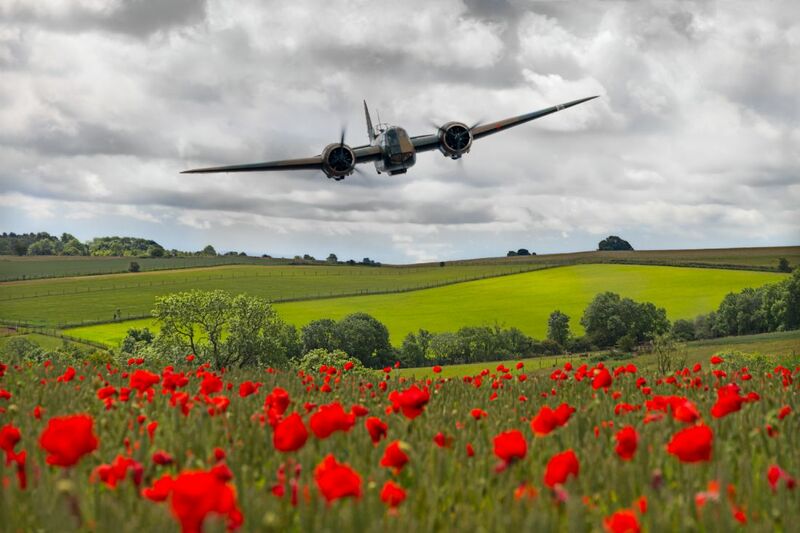 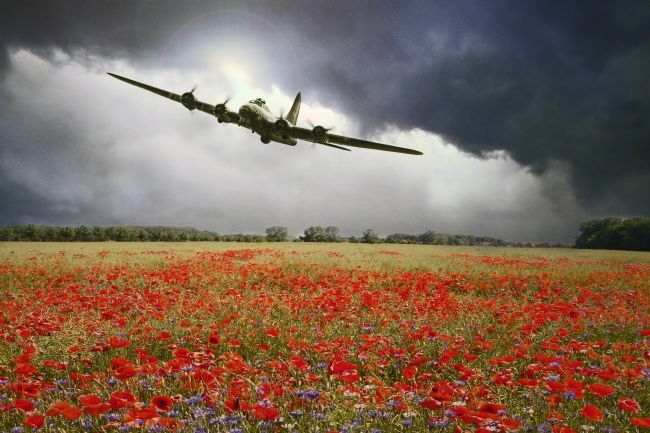 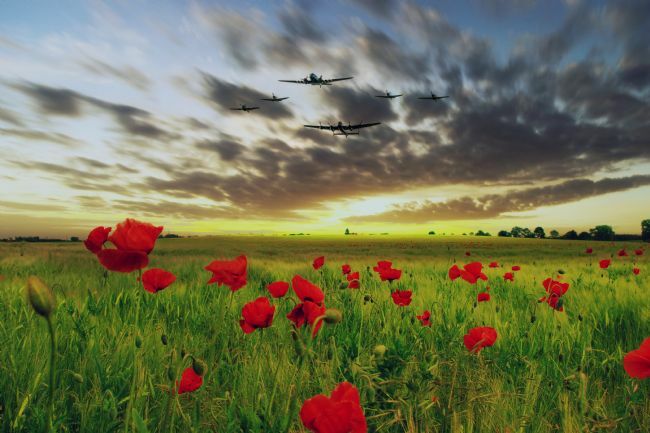 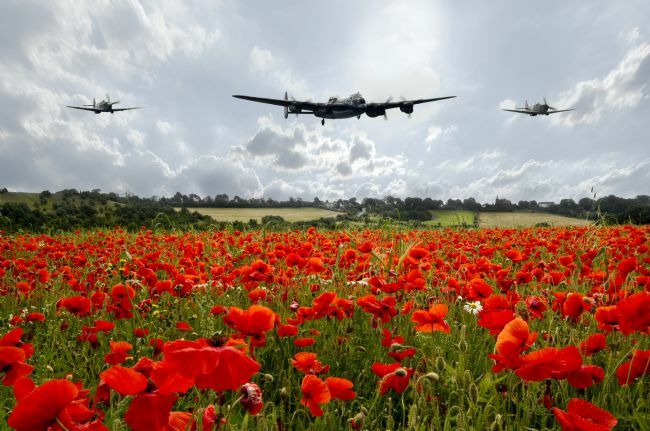 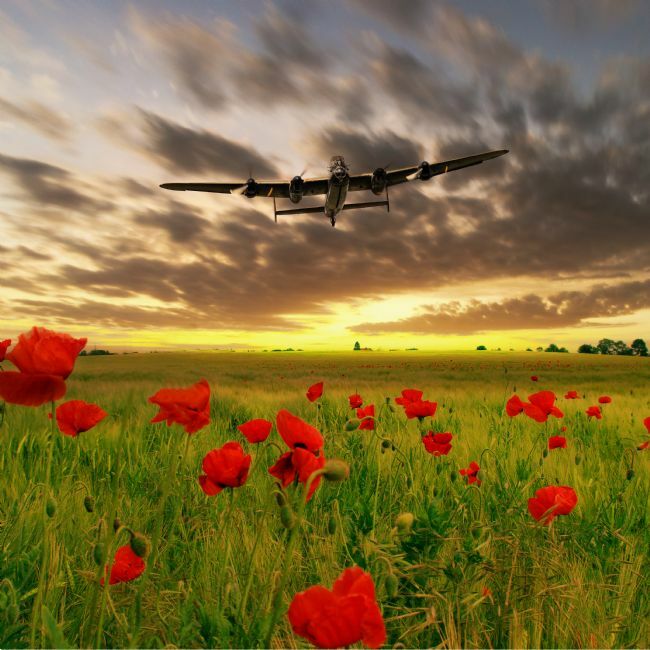 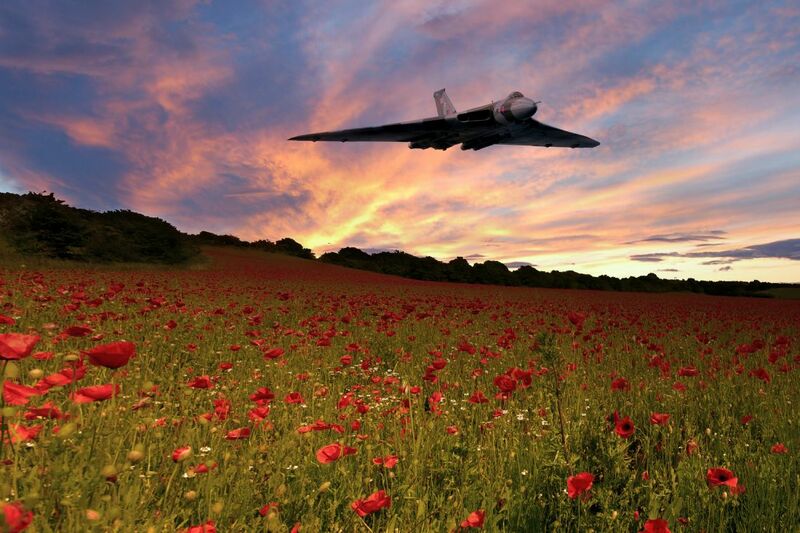 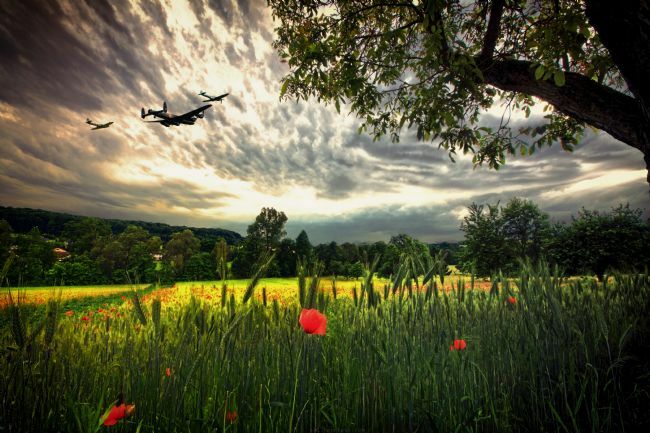 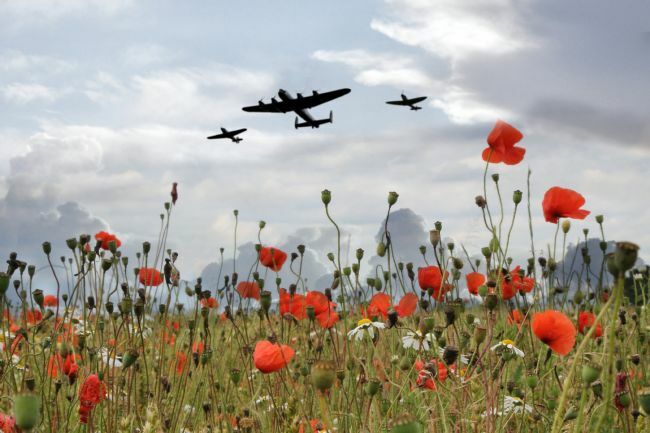 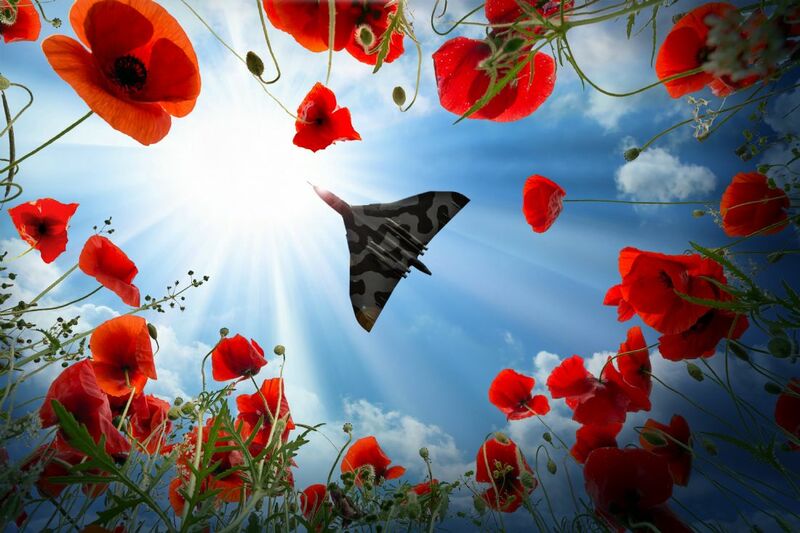 A Vulcan Bomber passes over a field of poppies. 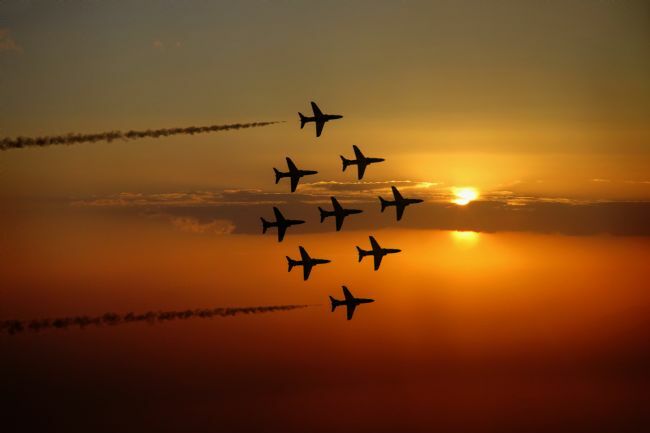 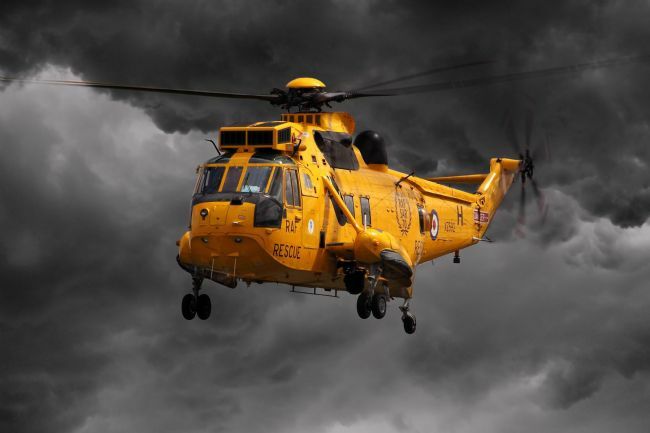 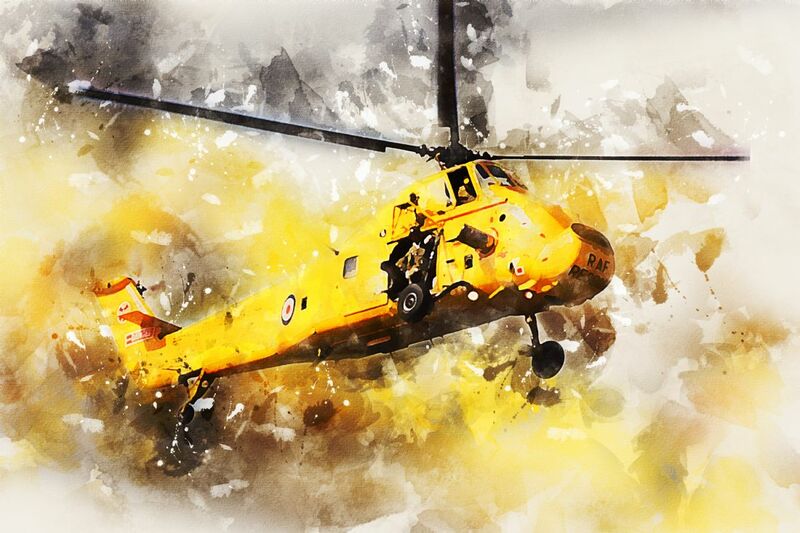 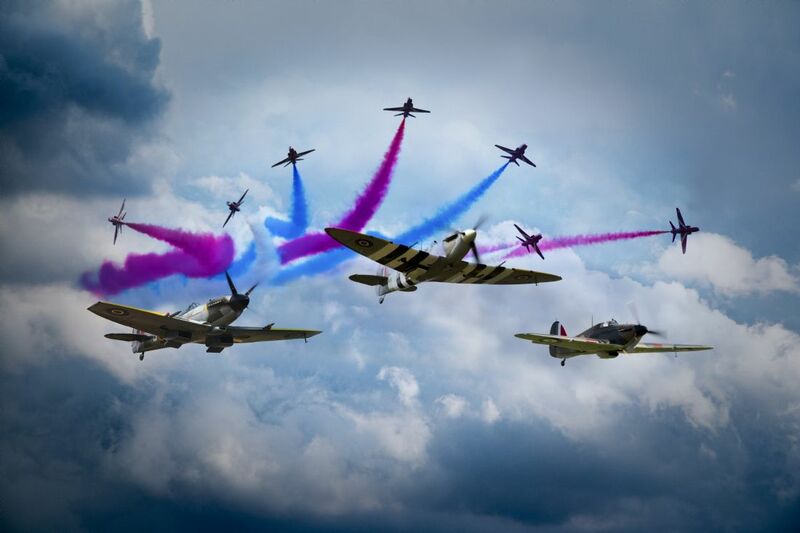 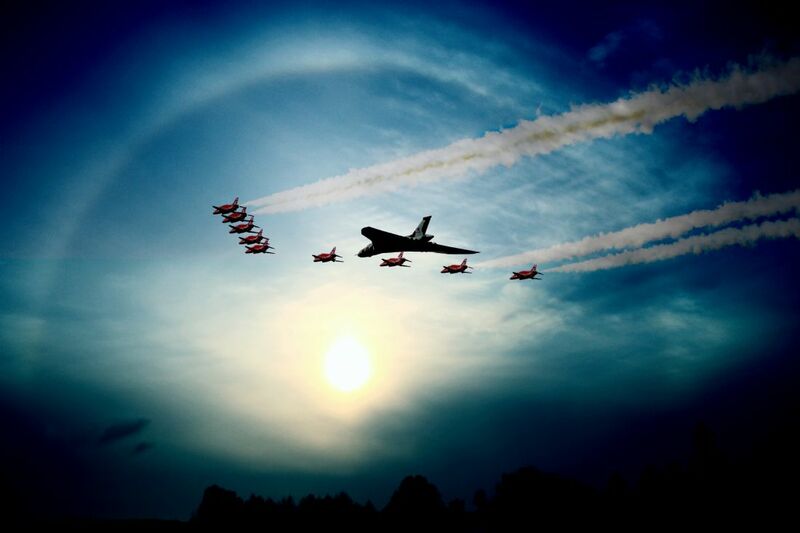 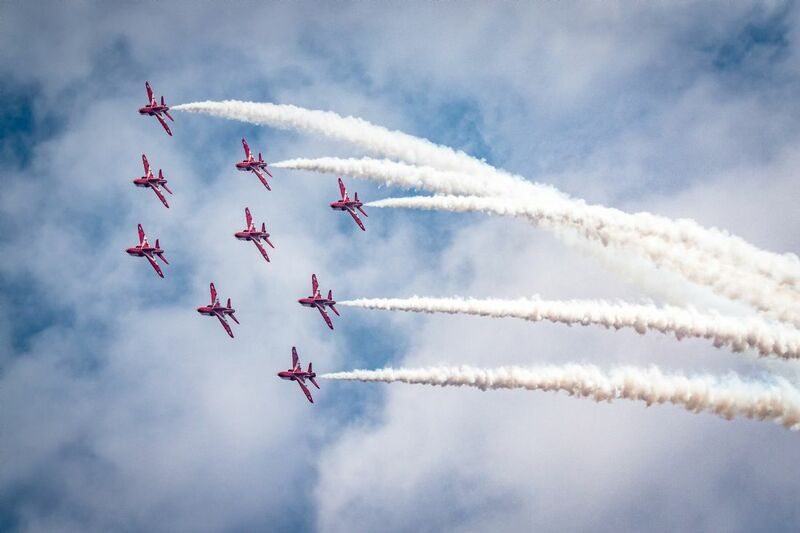 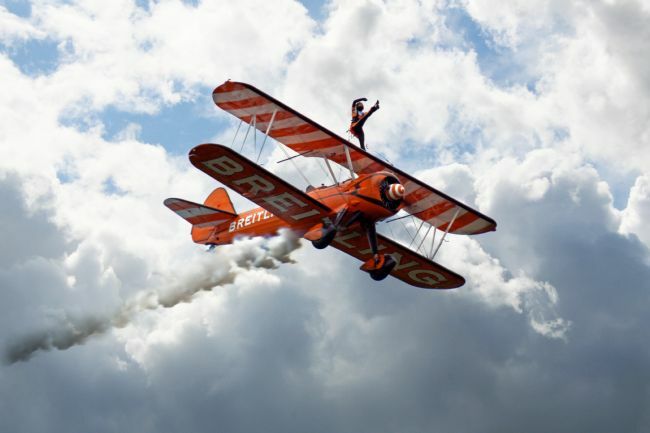 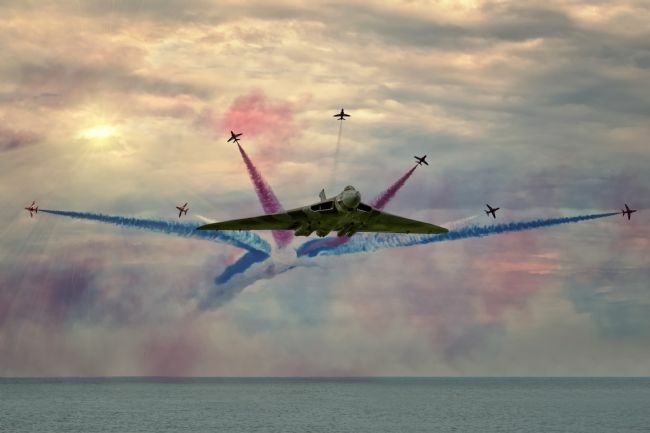 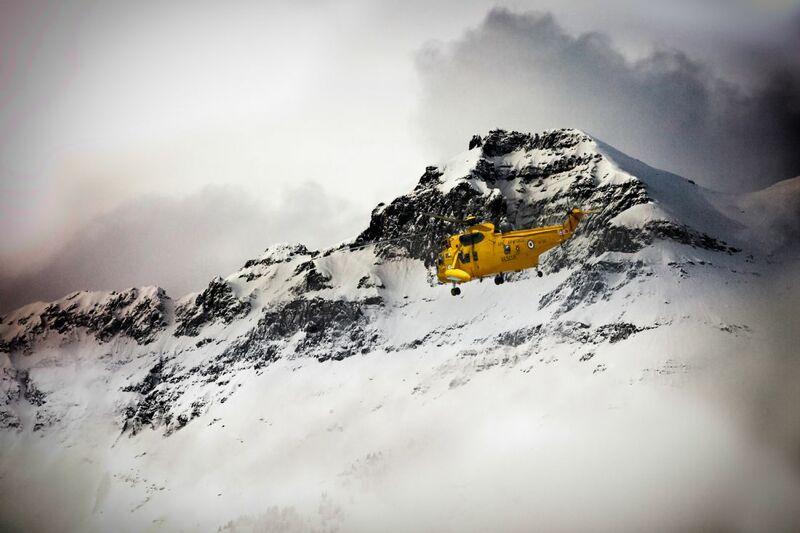 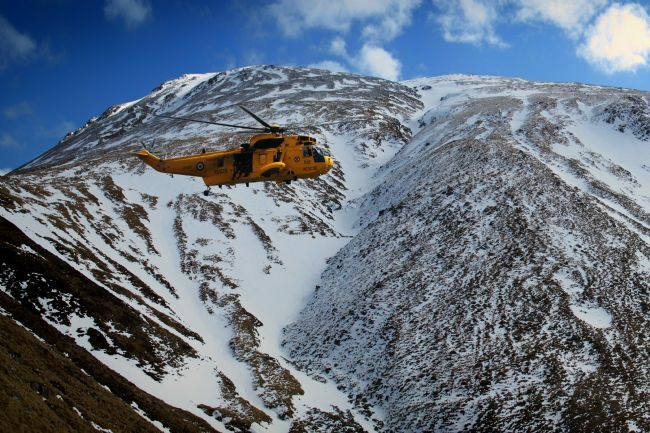 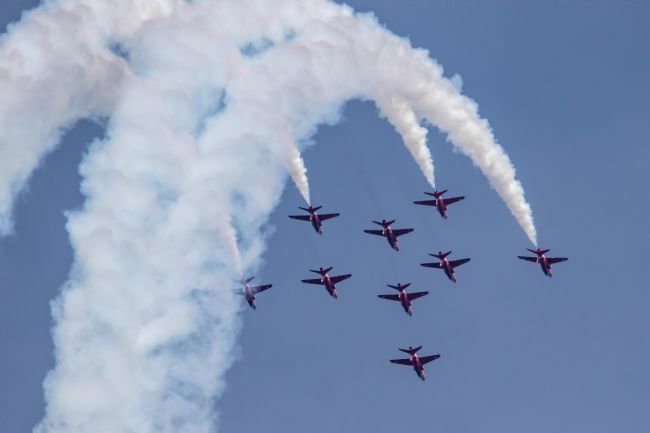 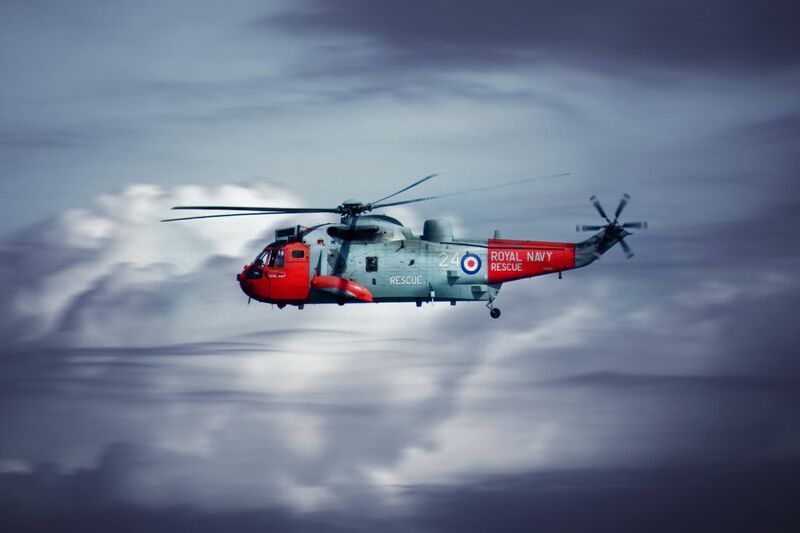 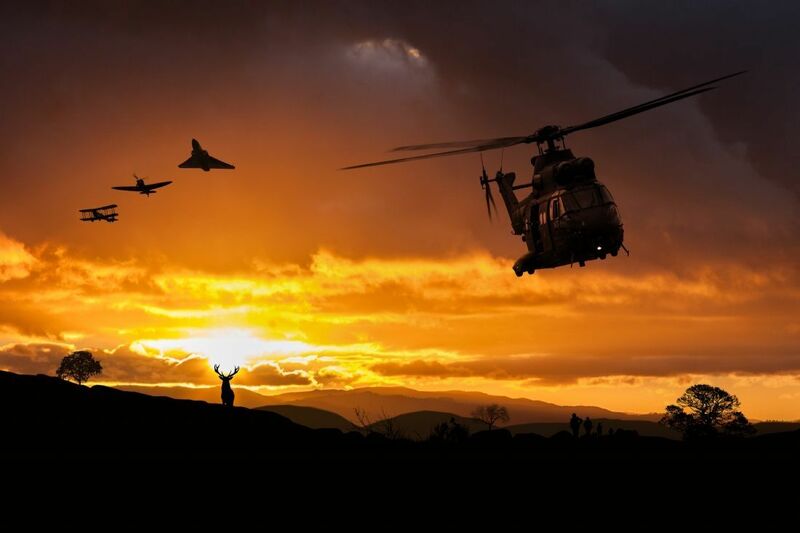 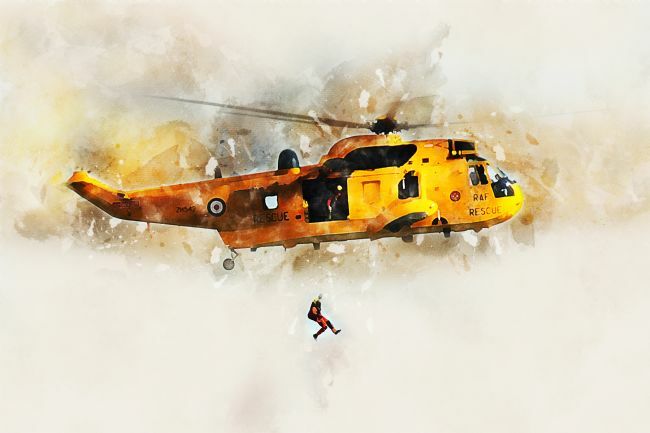 A tribute to the RAF crews. During the Second World War 6 Squadron flew the Mk IV Hurricane in ground-attack missions in the European theatre until the early days of 1944. In 1944, the squadron moved to Italy and flew the remainder of the war over the Balkans, equipped with rocket-firing Hurricane Mk. IVs.